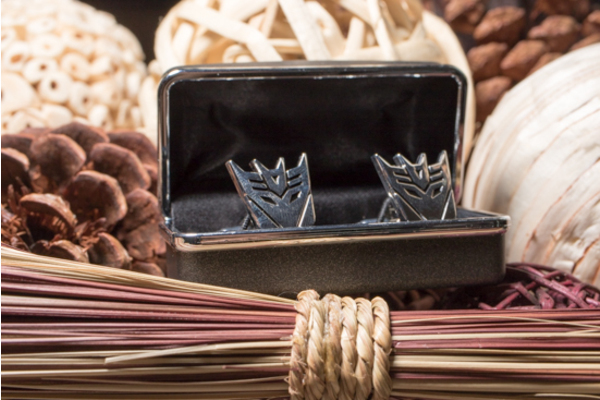 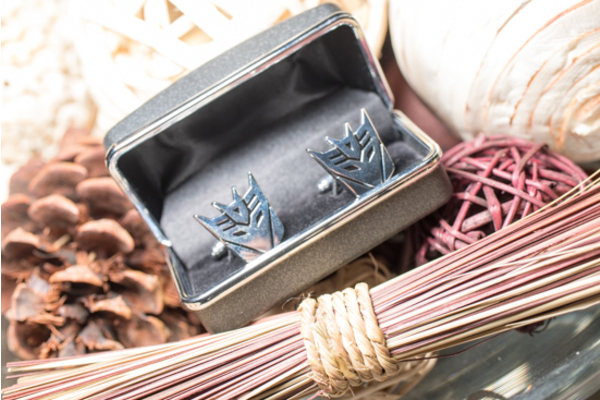 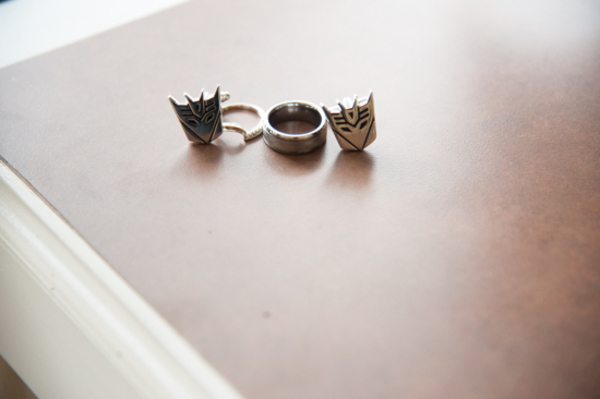 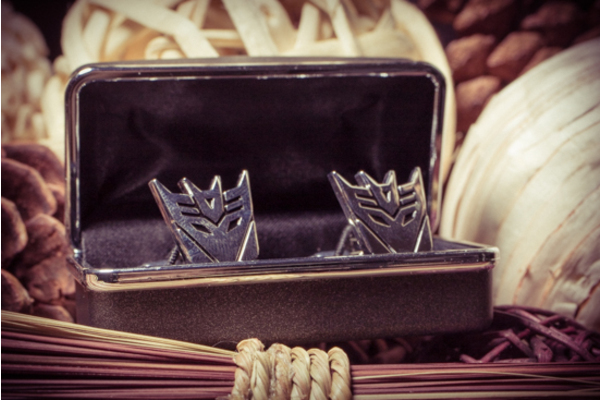 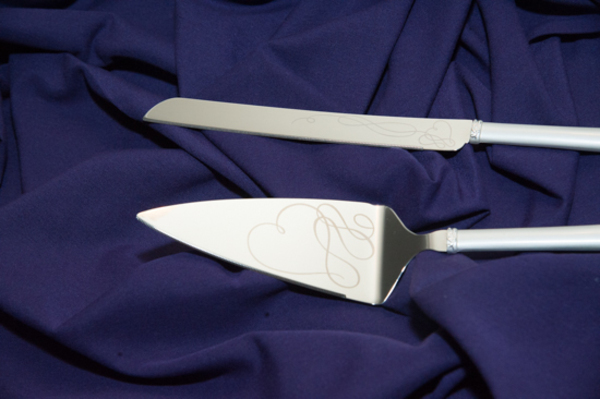 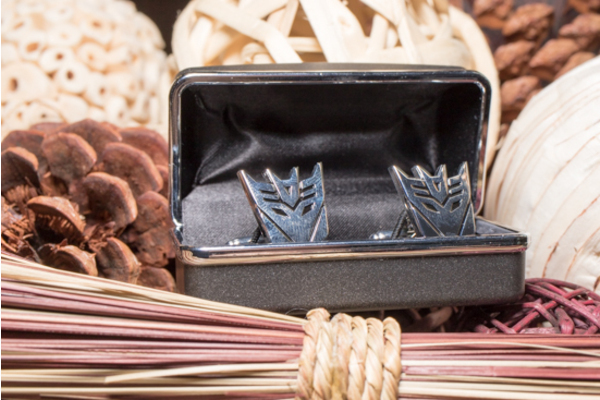 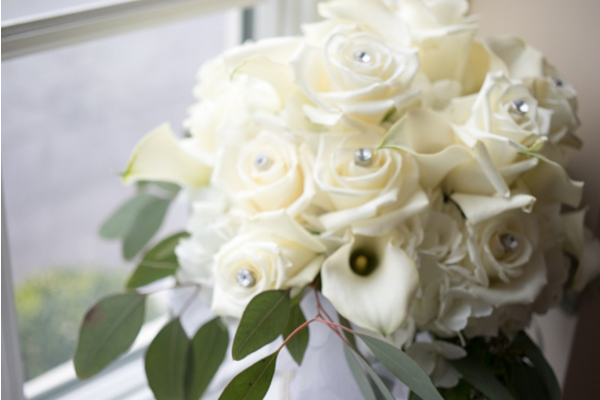 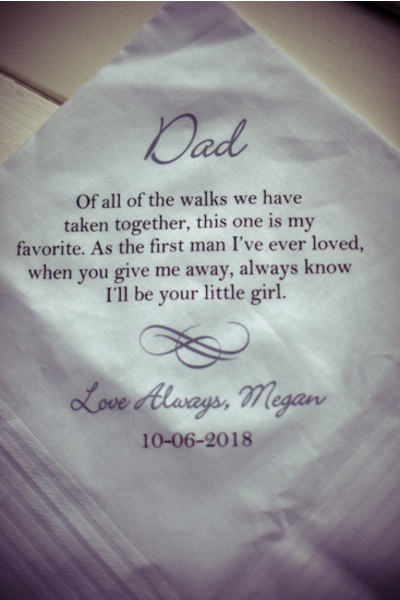 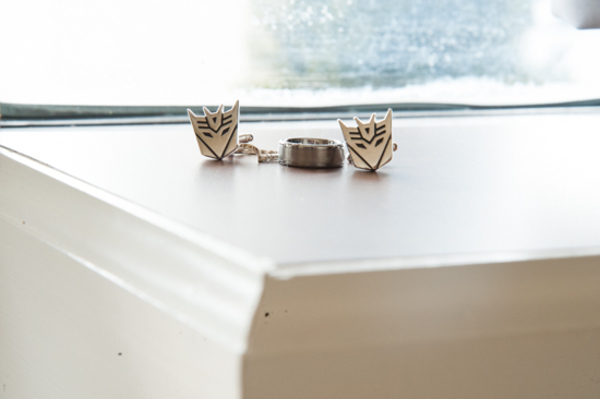 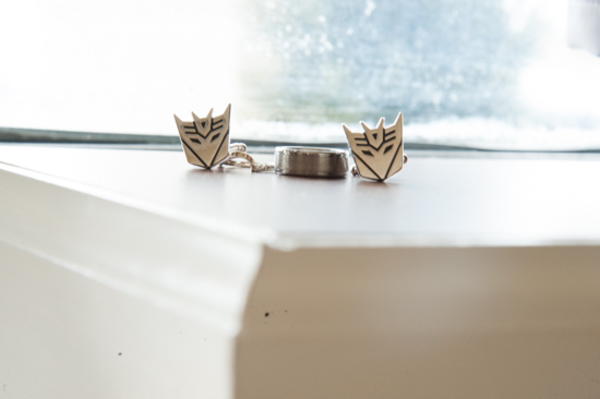 Congratulations to Megan and David on their marriage! 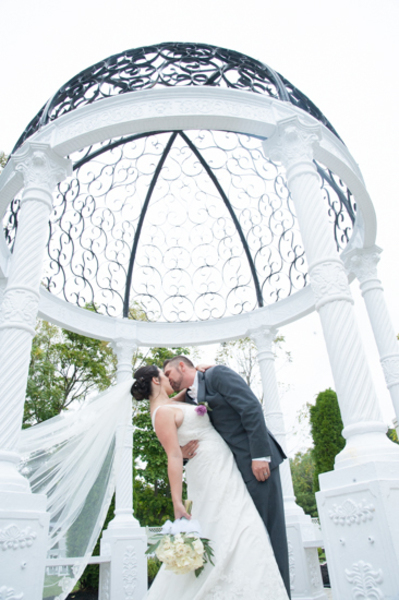 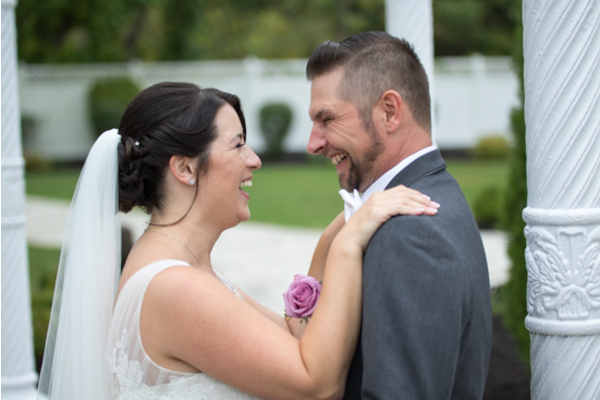 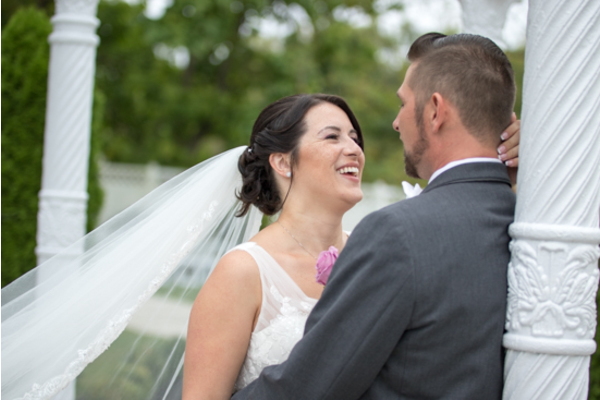 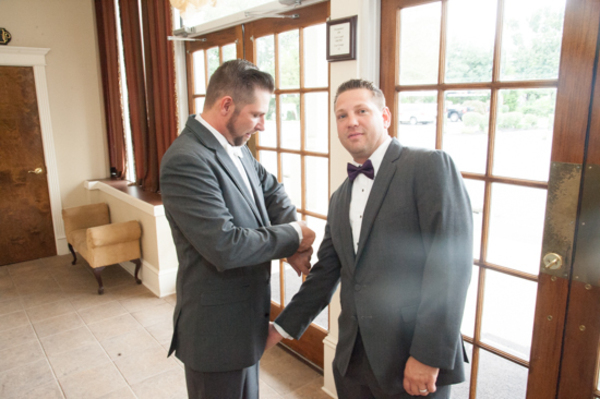 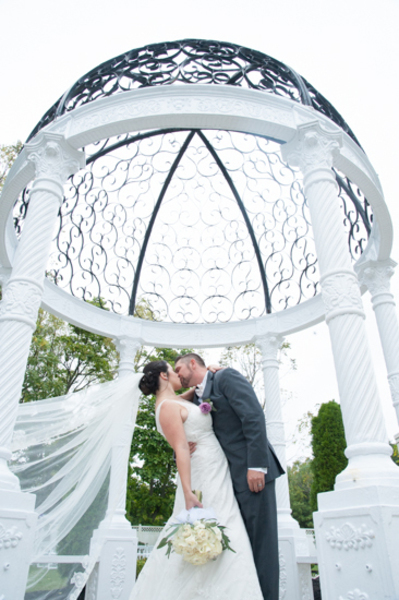 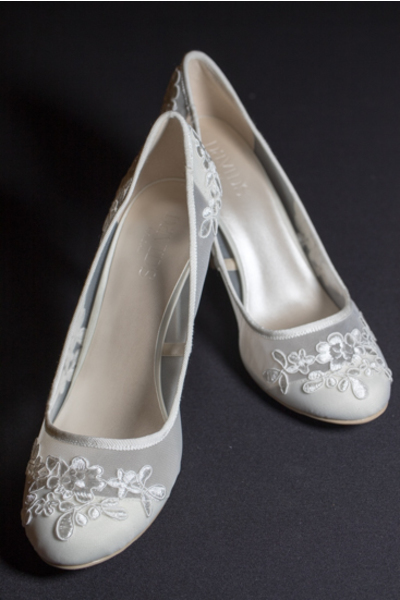 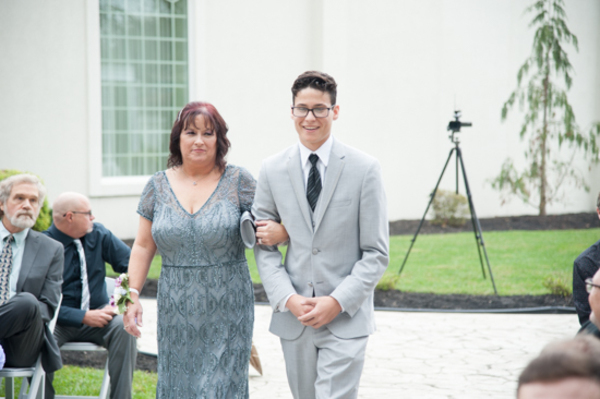 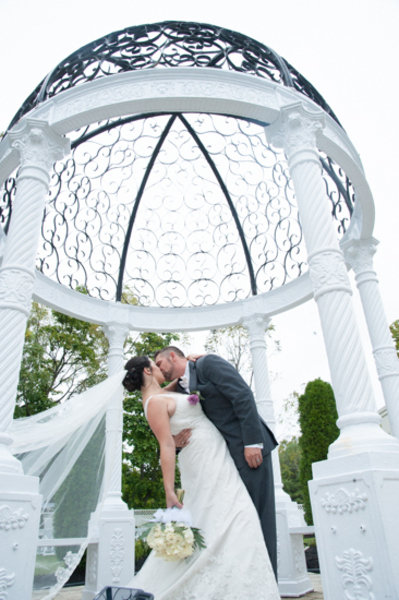 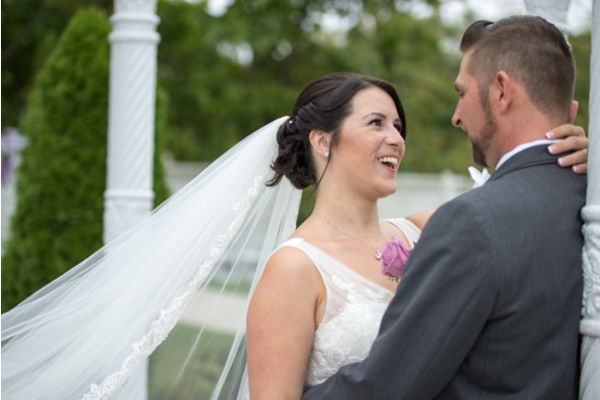 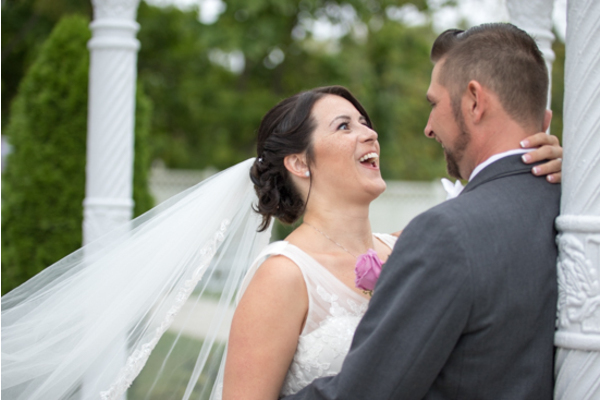 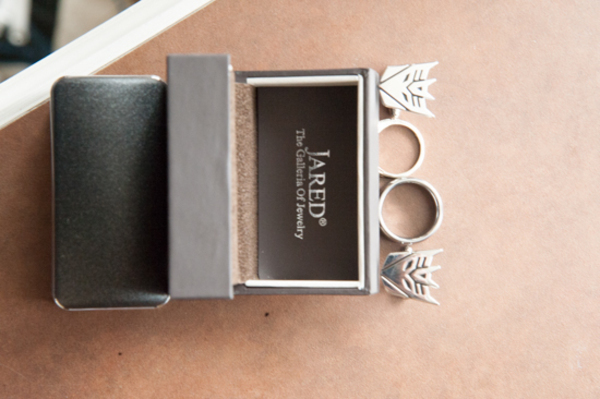 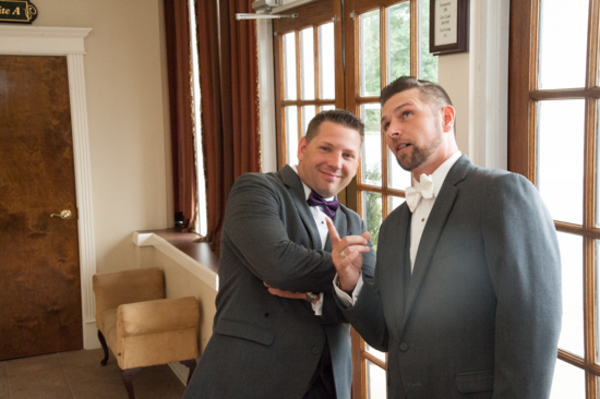 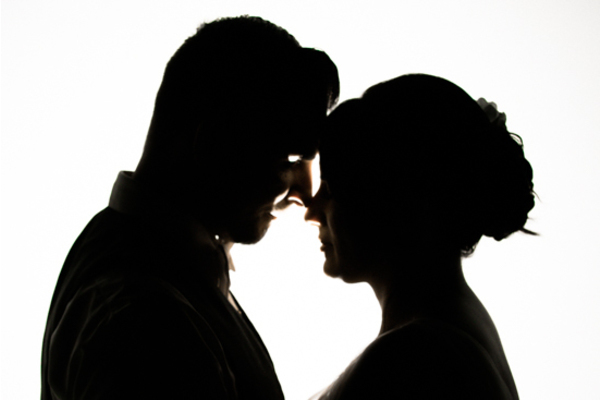 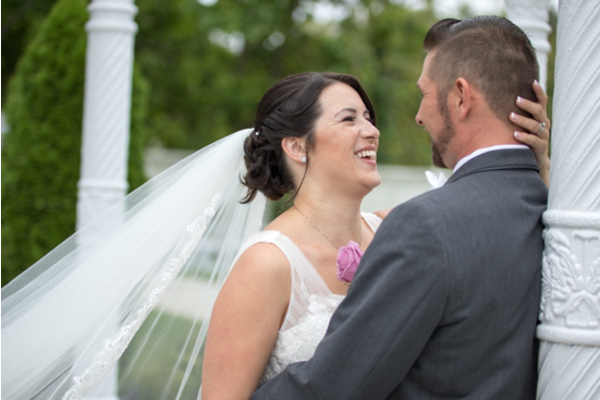 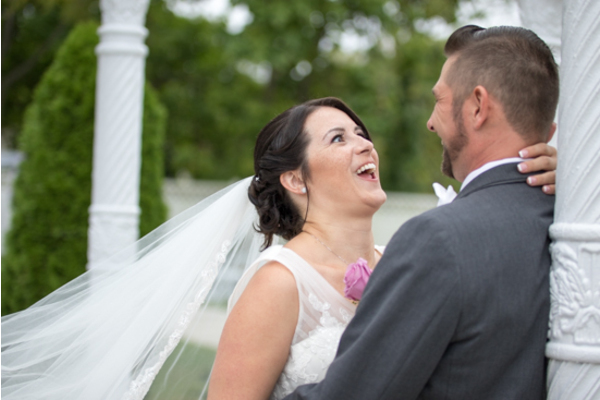 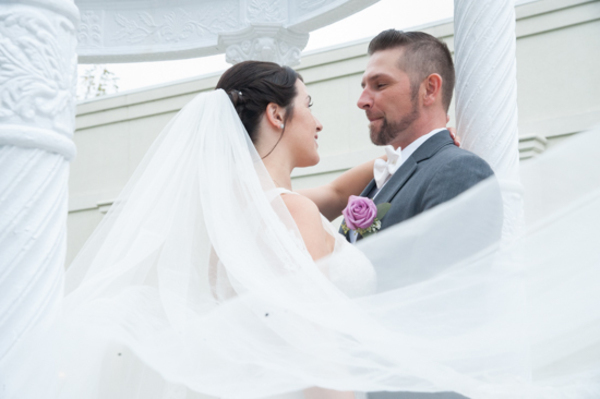 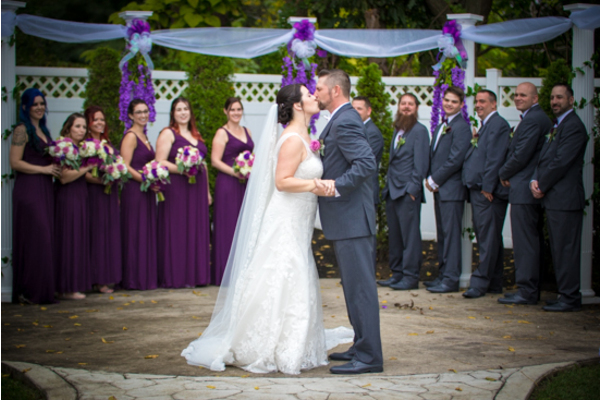 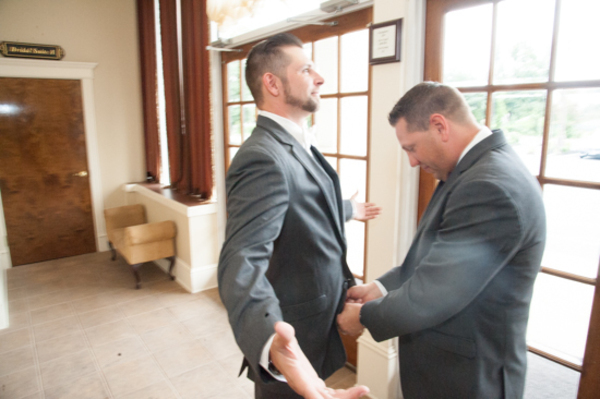 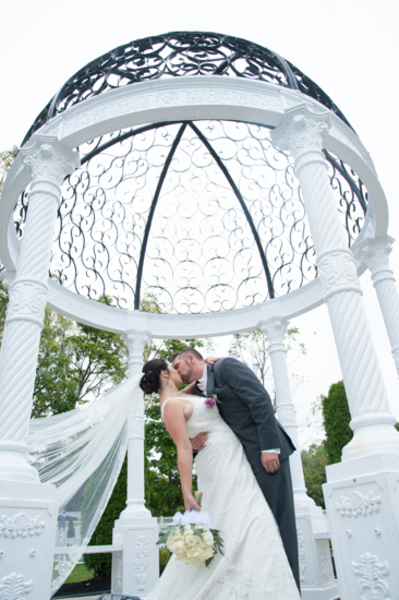 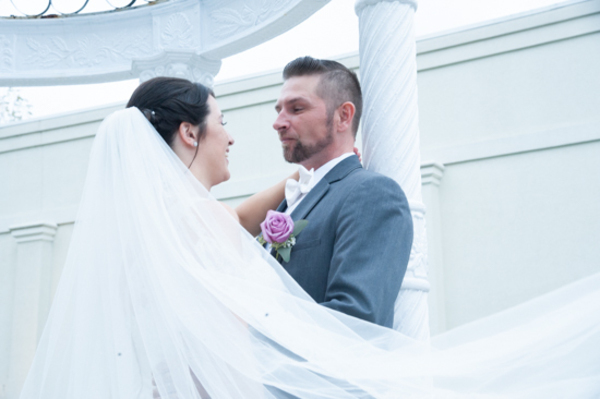 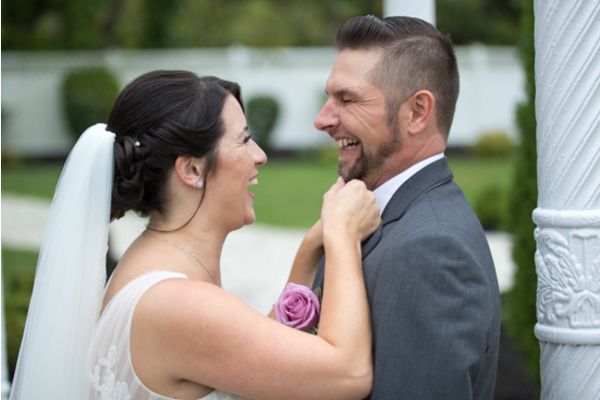 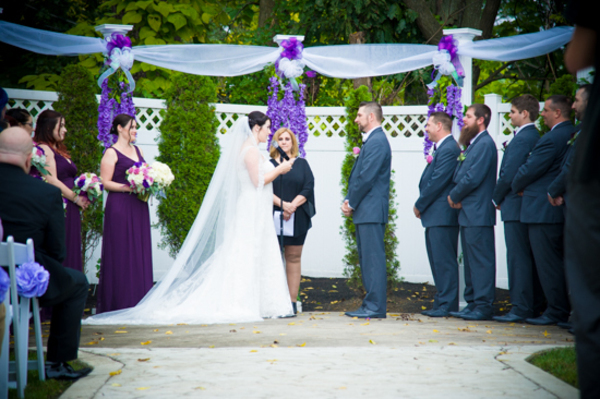 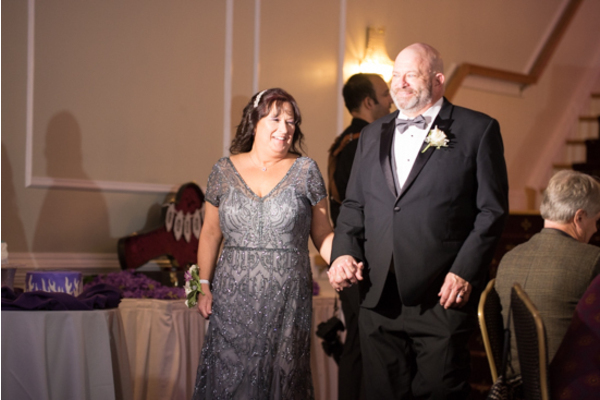 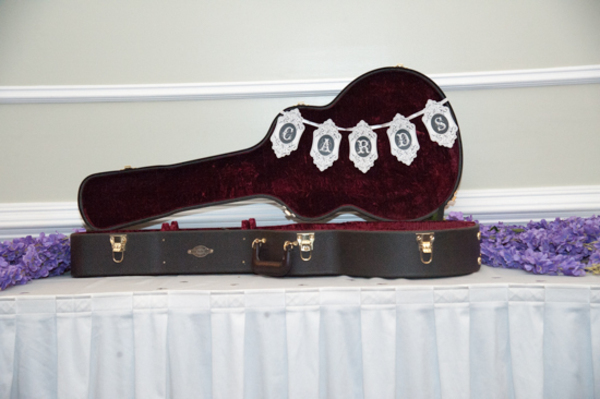 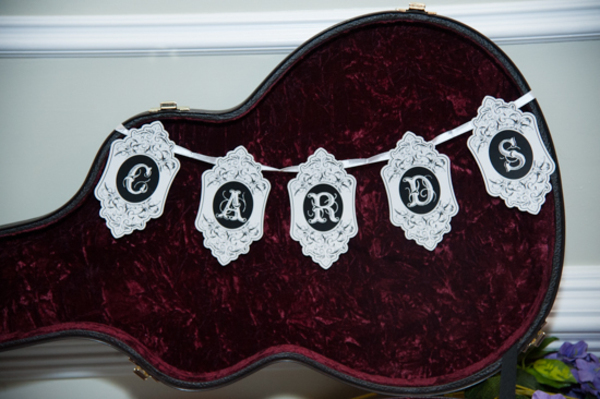 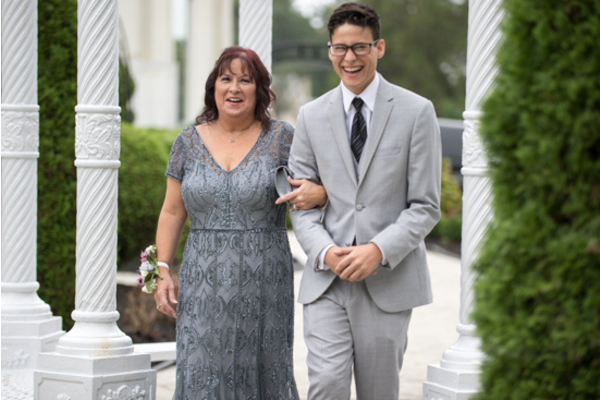 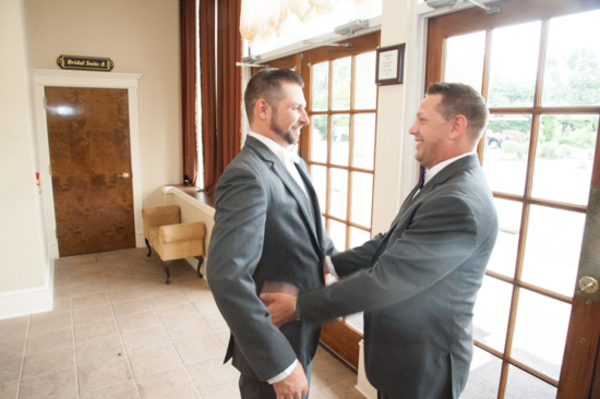 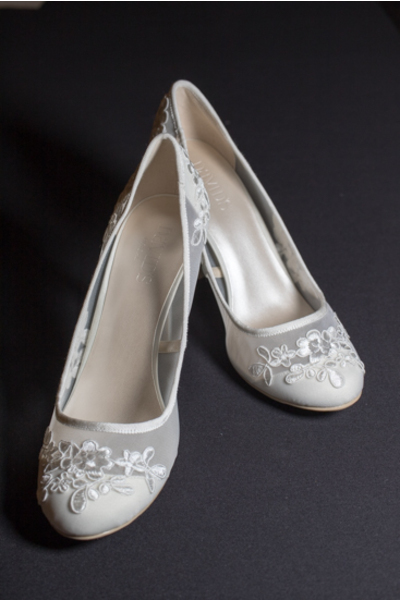 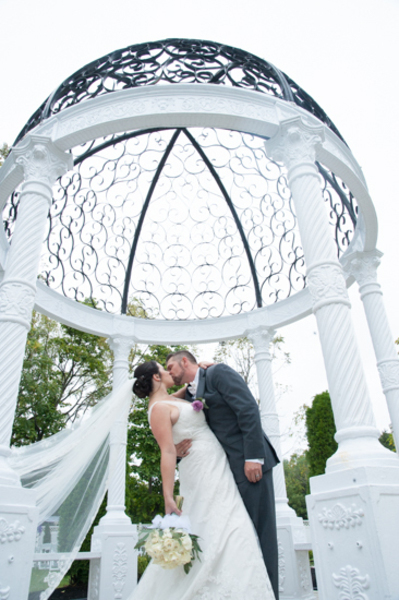 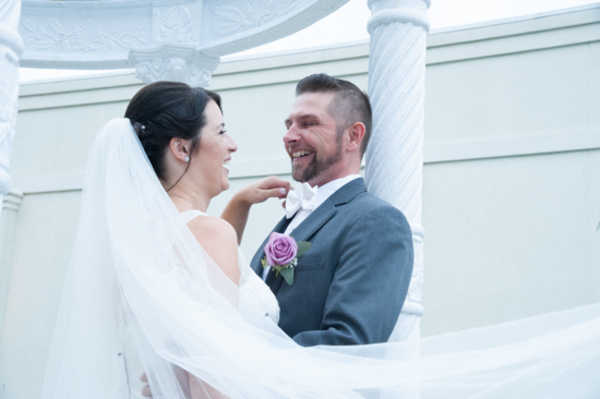 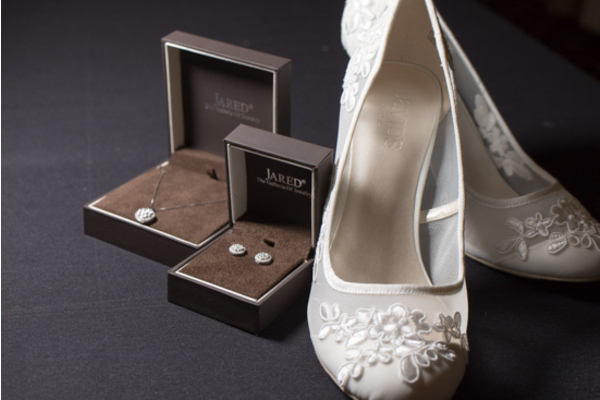 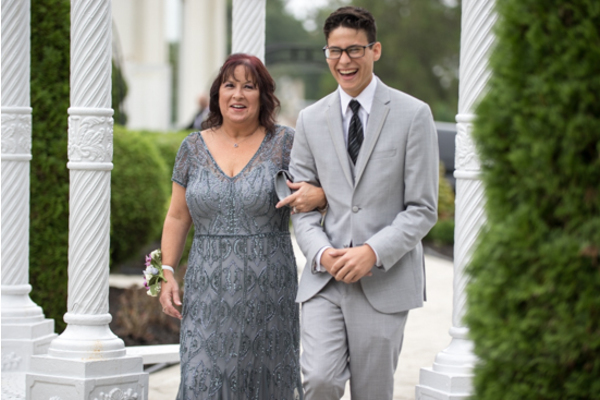 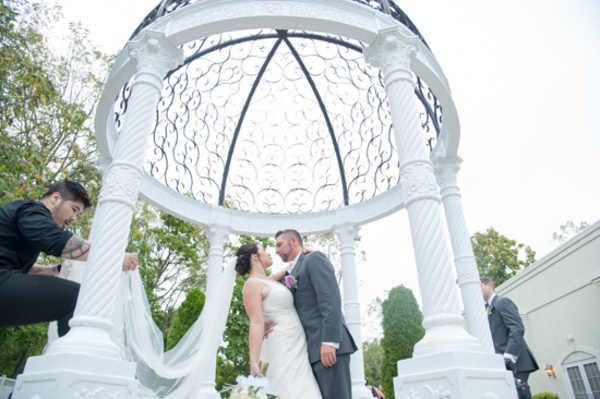 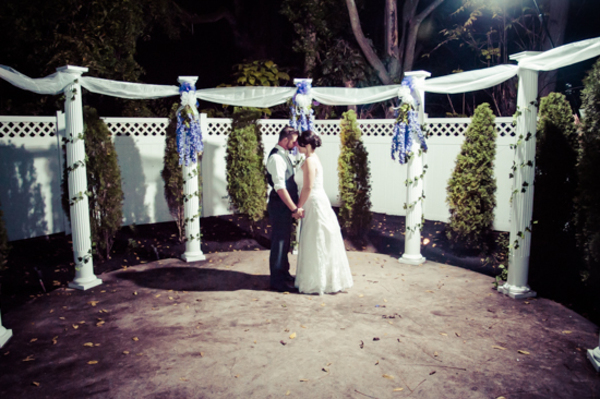 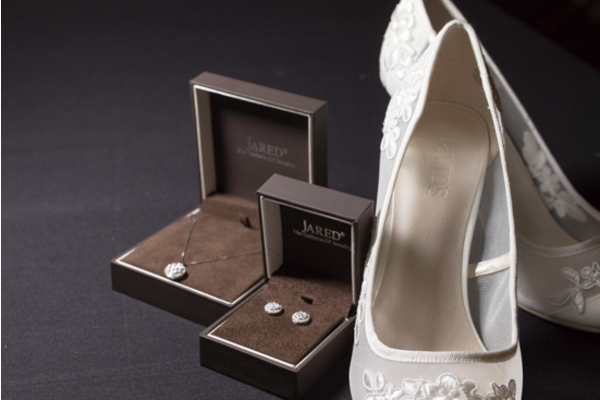 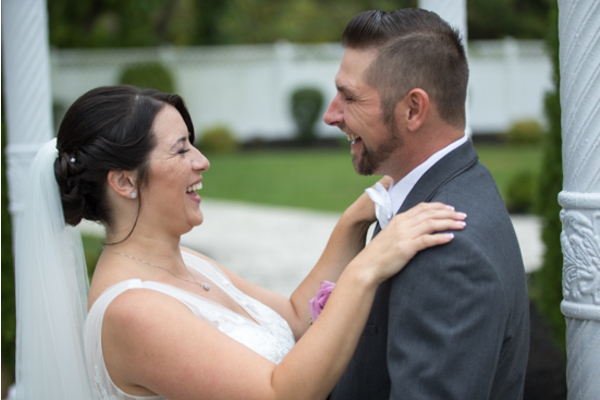 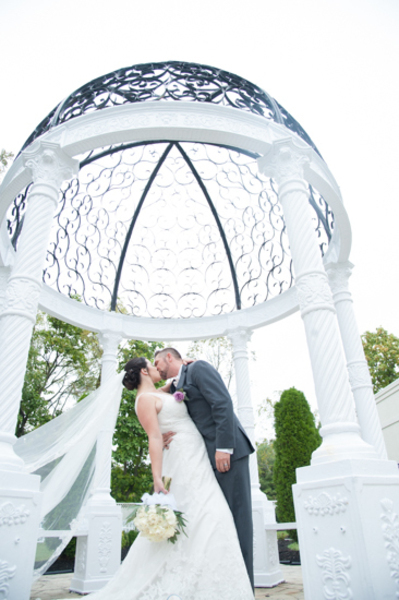 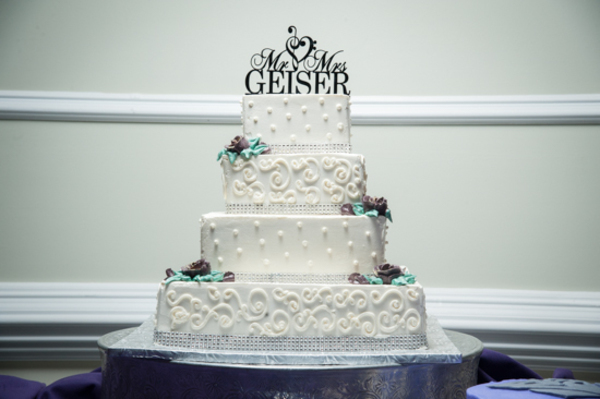 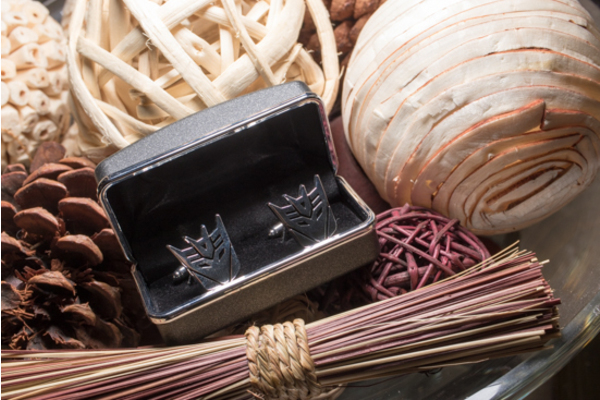 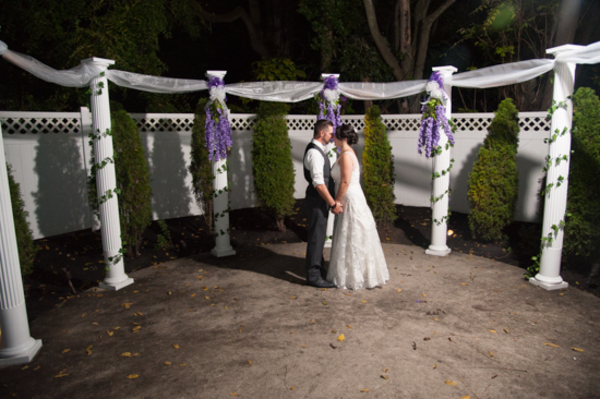 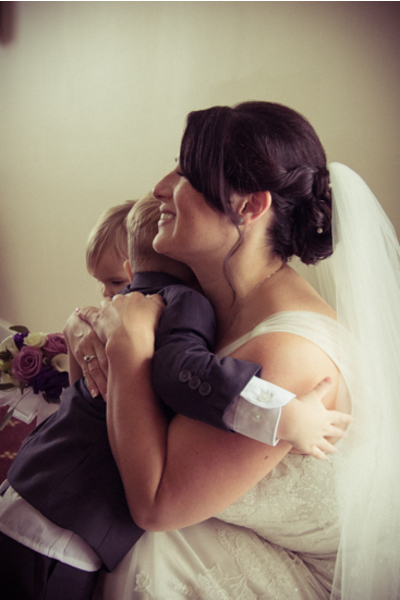 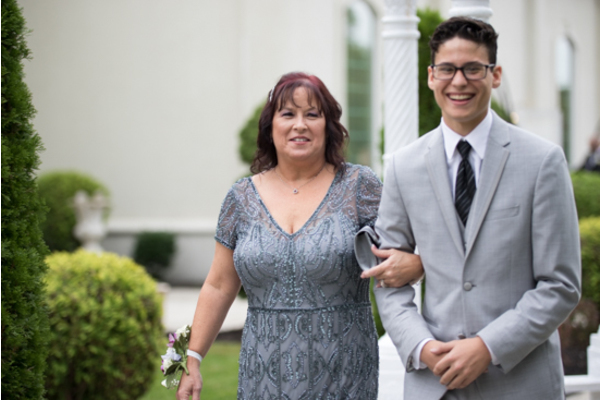 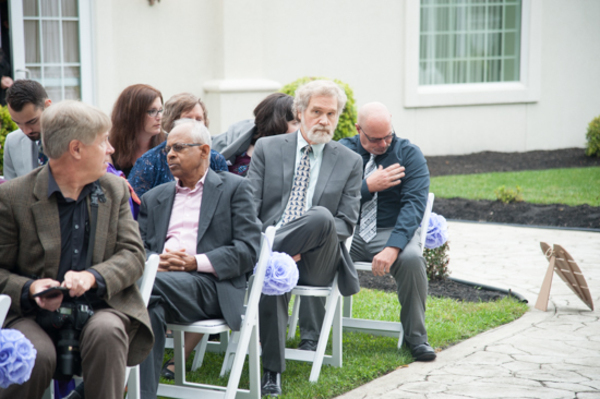 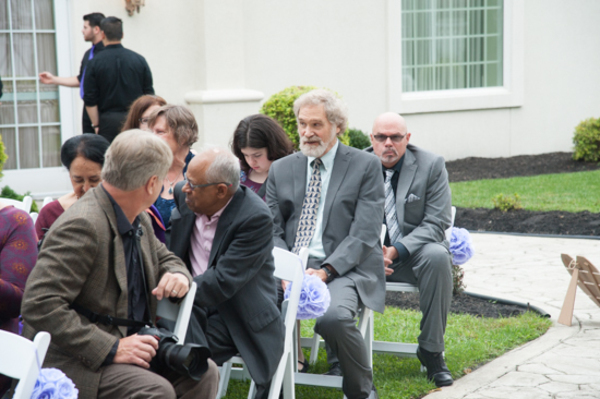 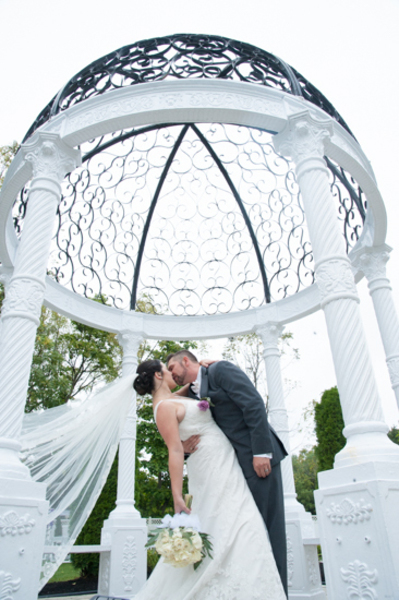 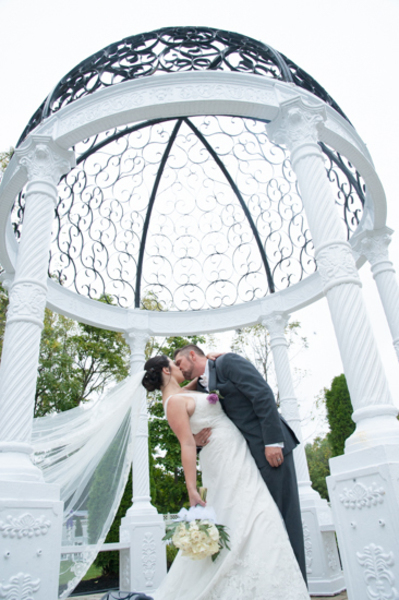 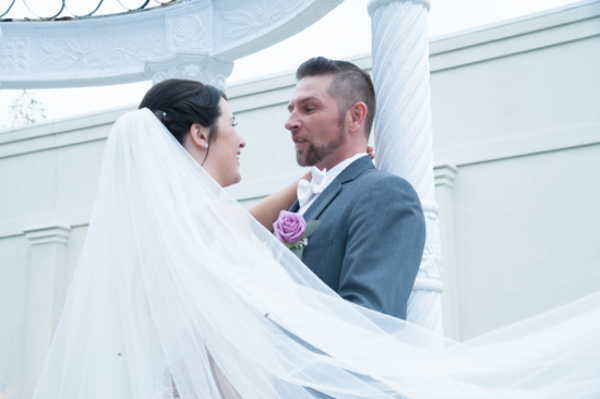 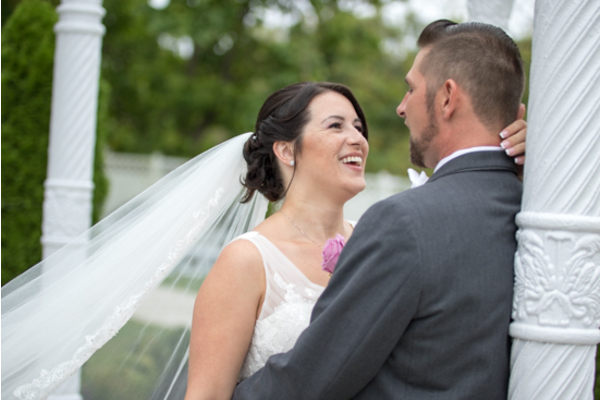 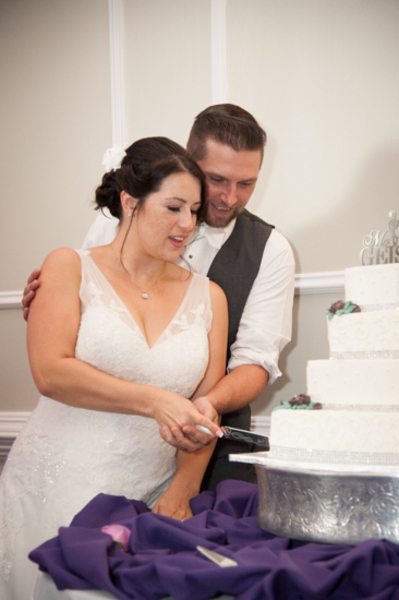 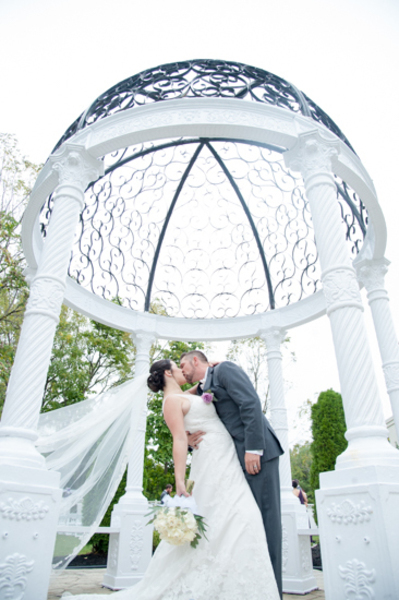 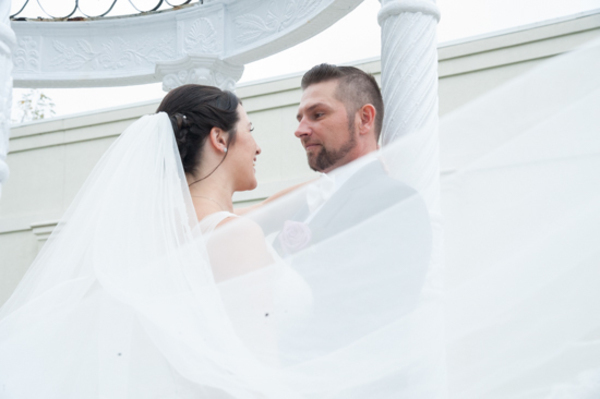 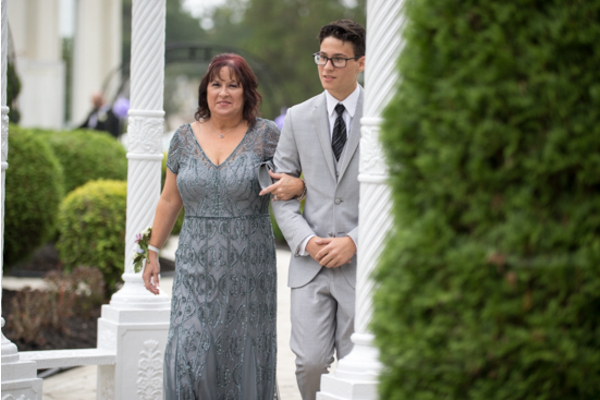 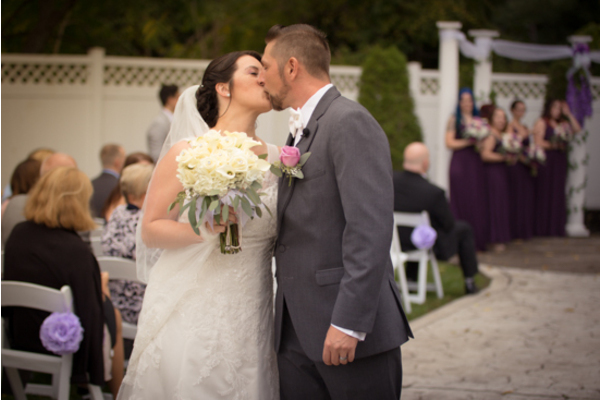 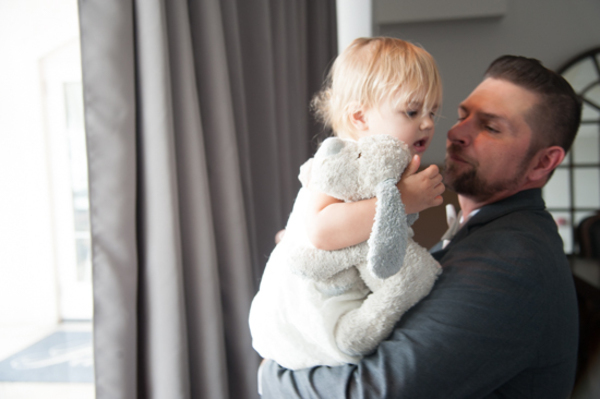 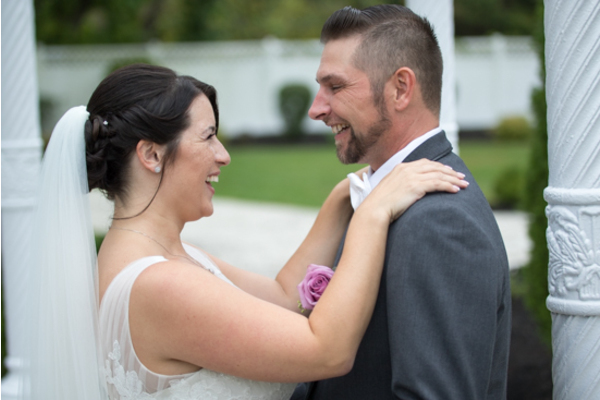 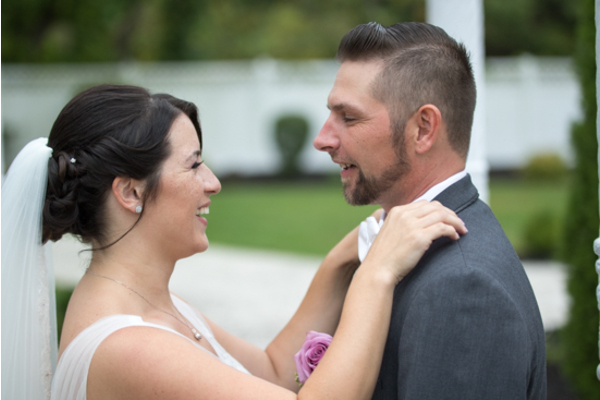 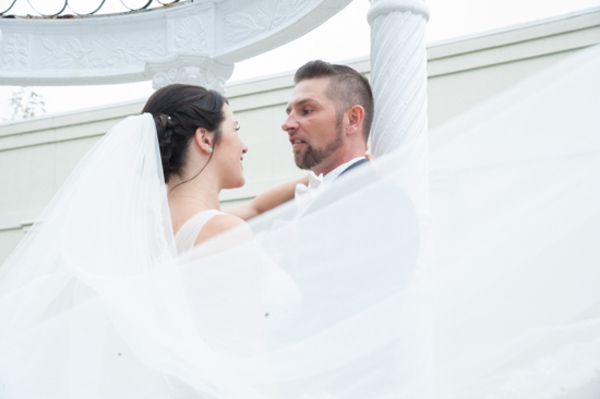 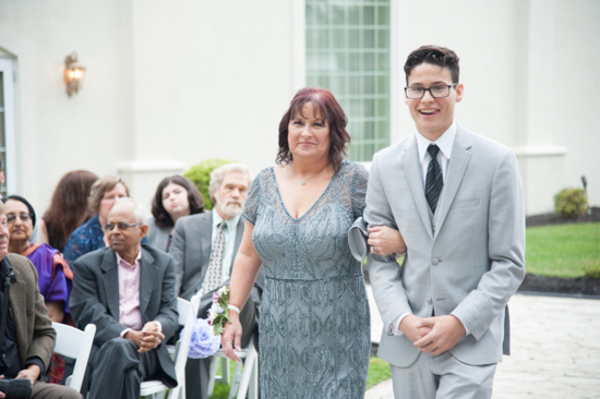 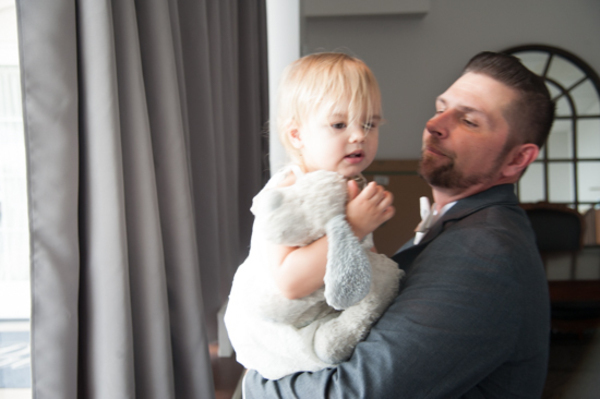 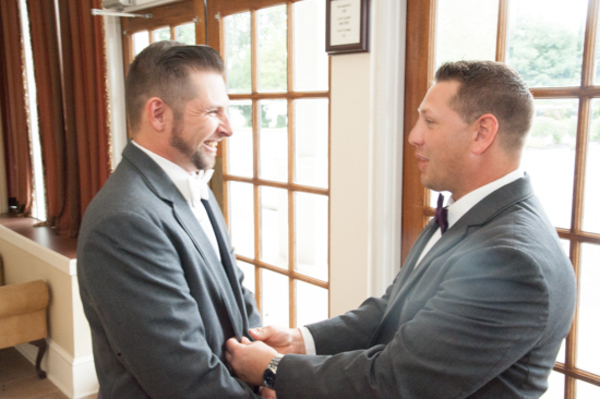 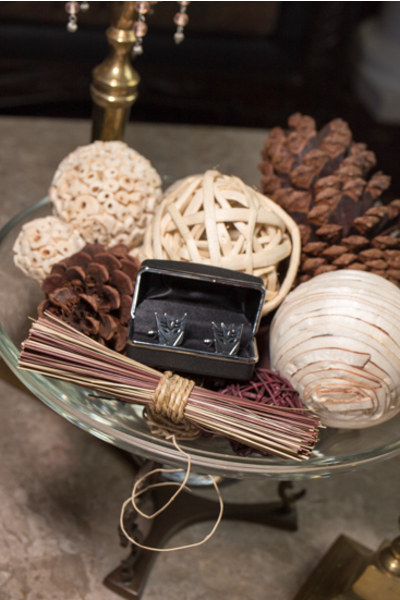 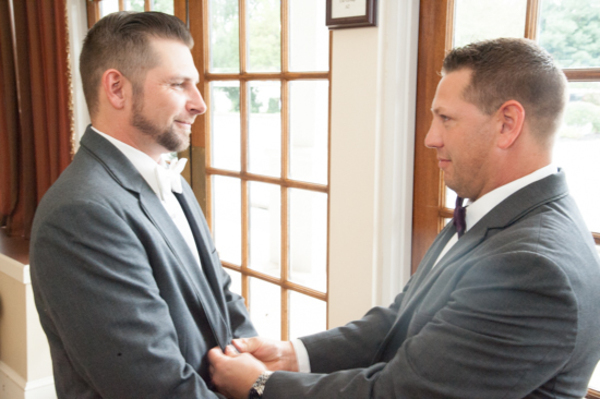 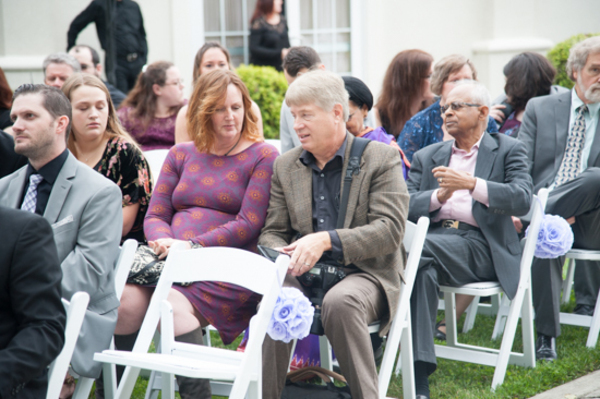 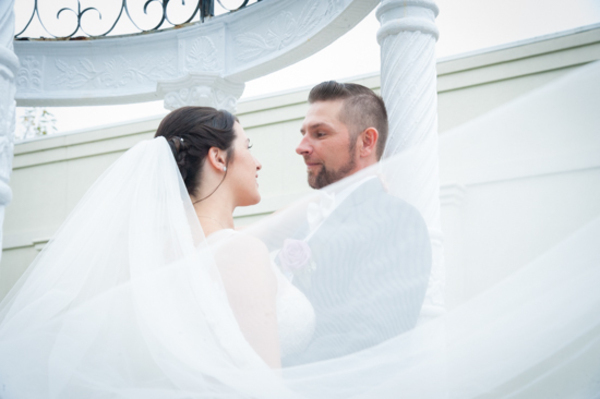 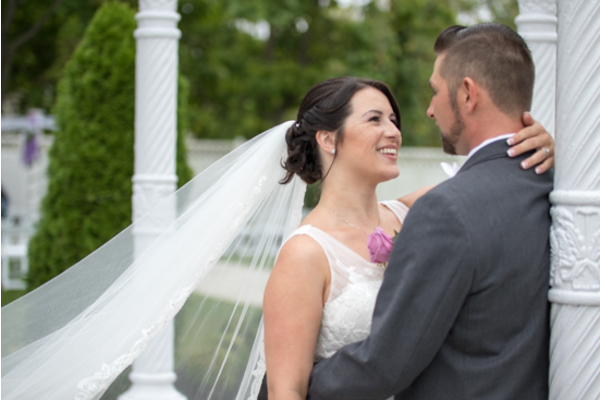 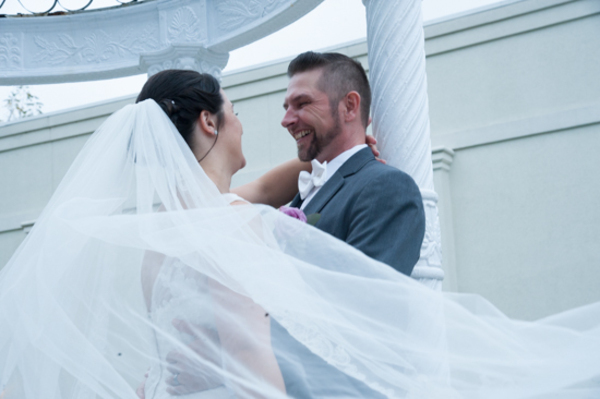 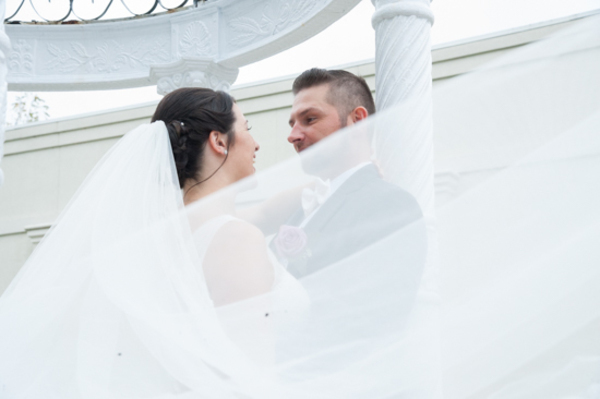 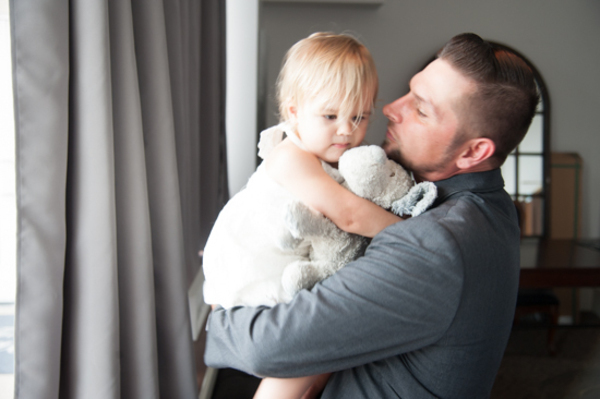 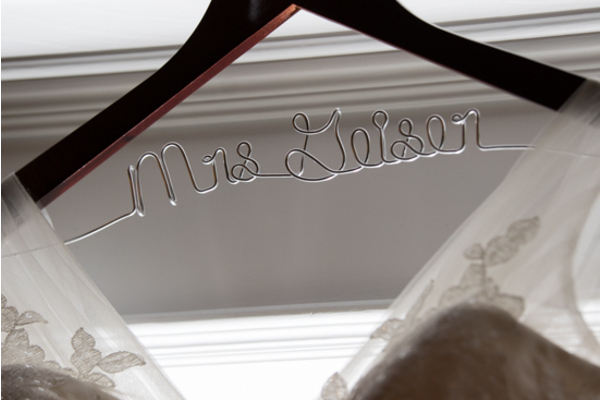 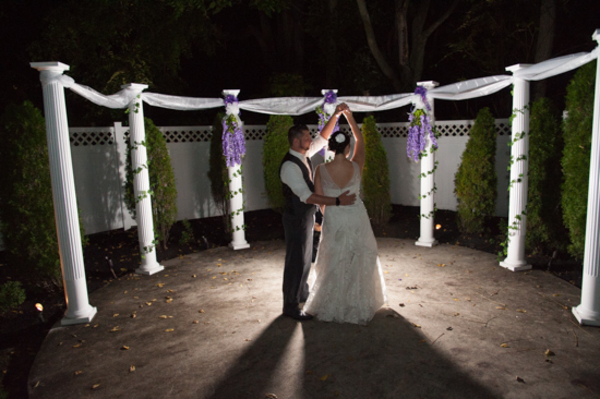 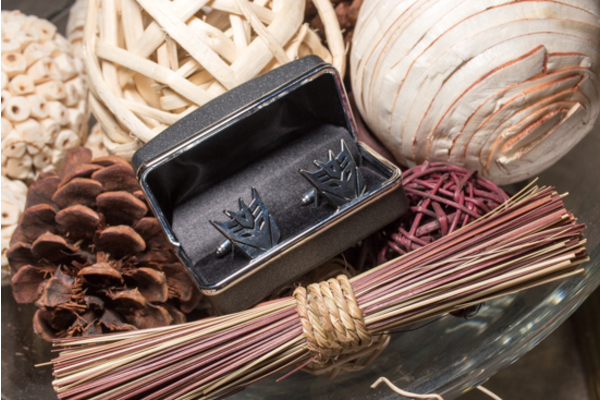 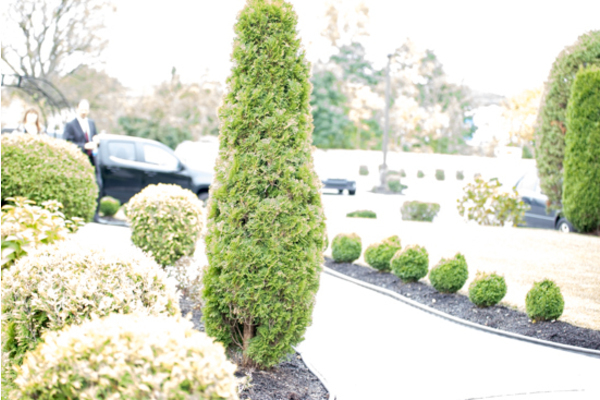 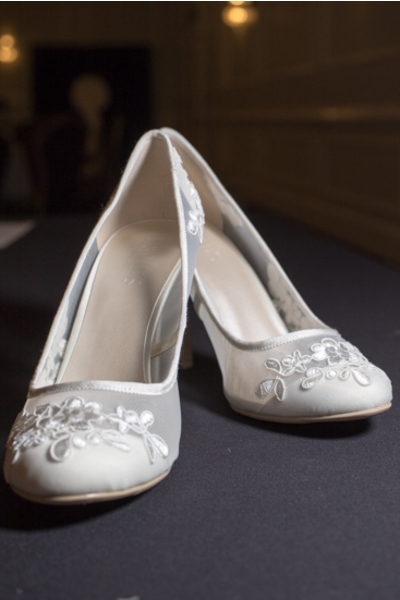 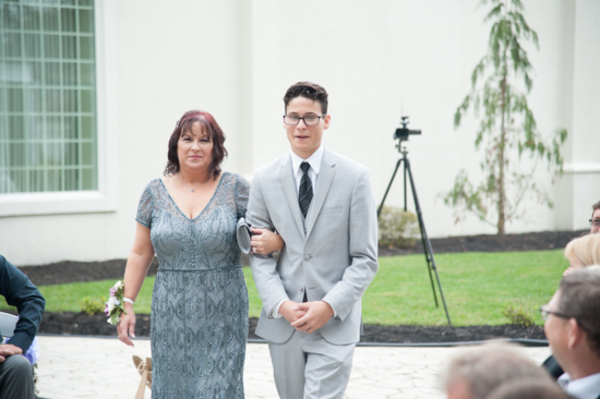 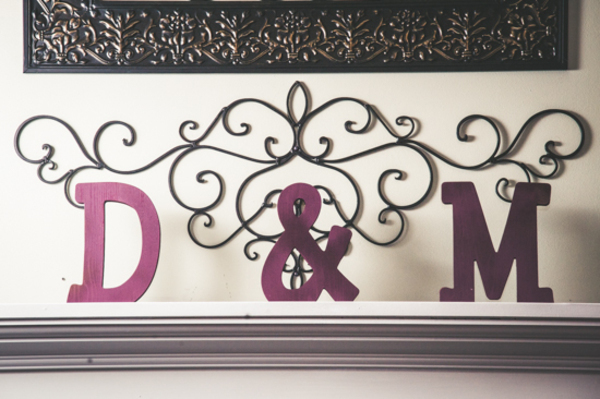 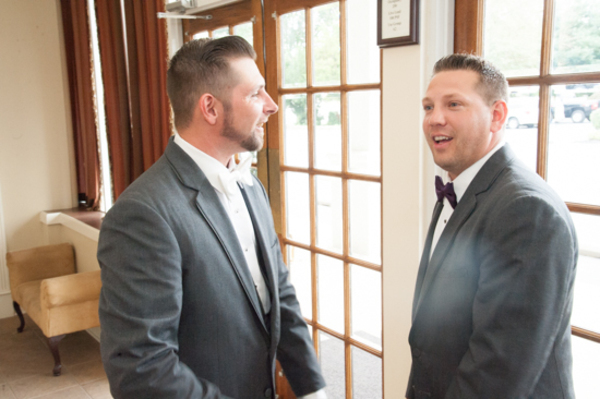 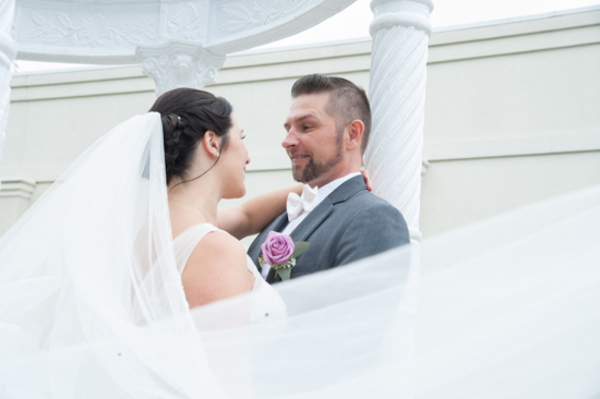 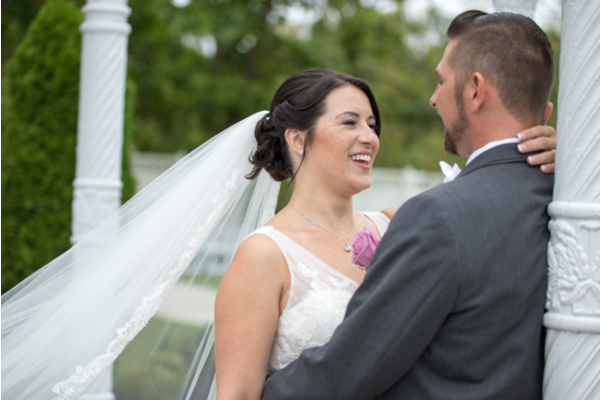 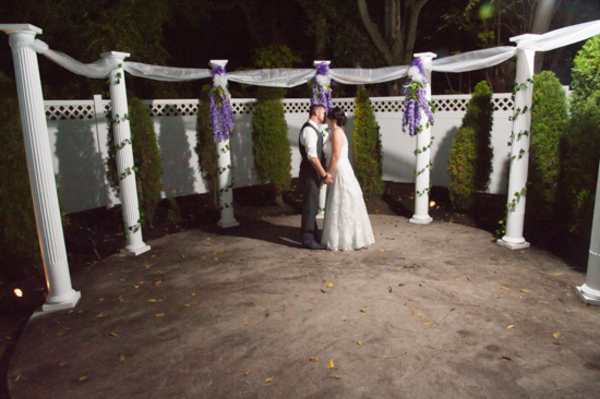 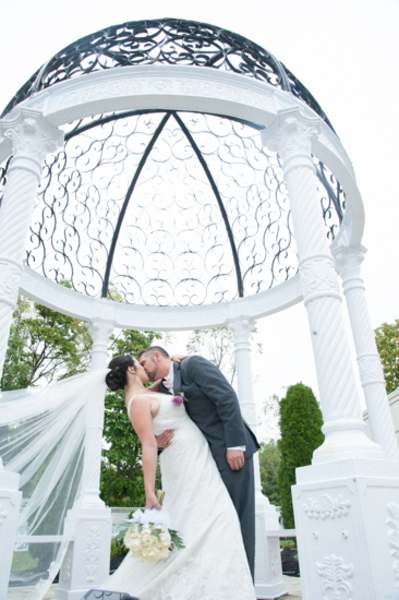 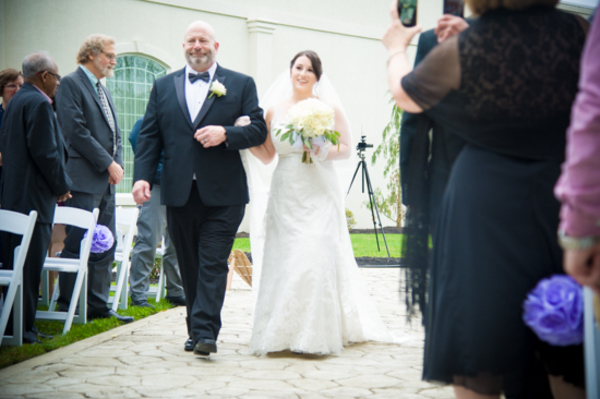 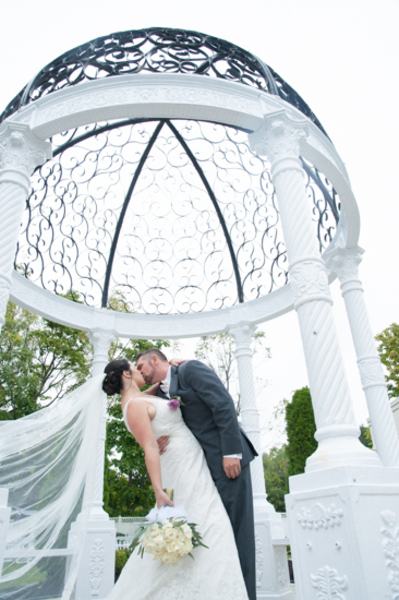 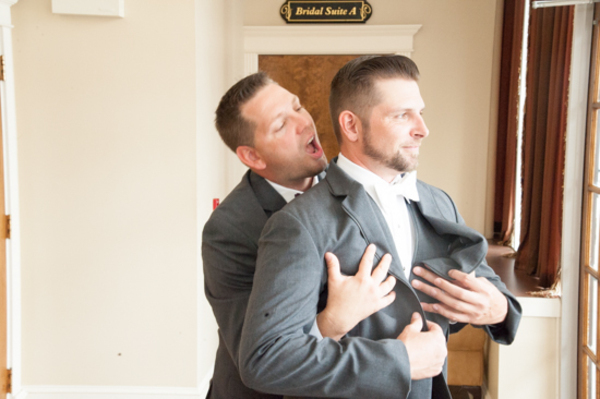 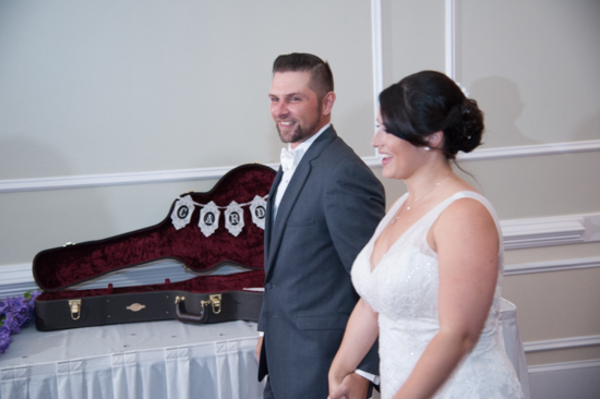 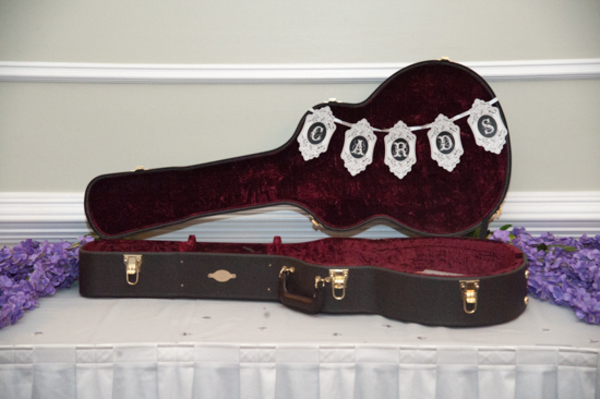 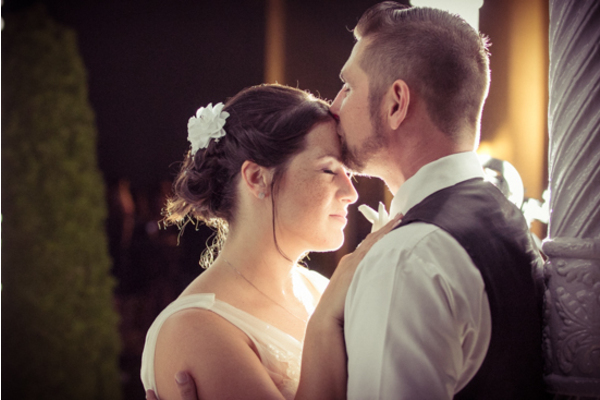 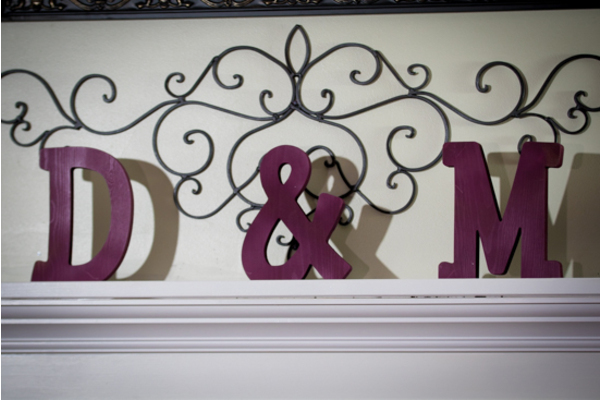 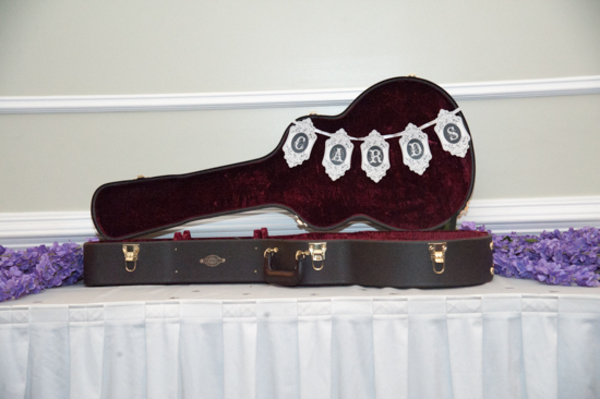 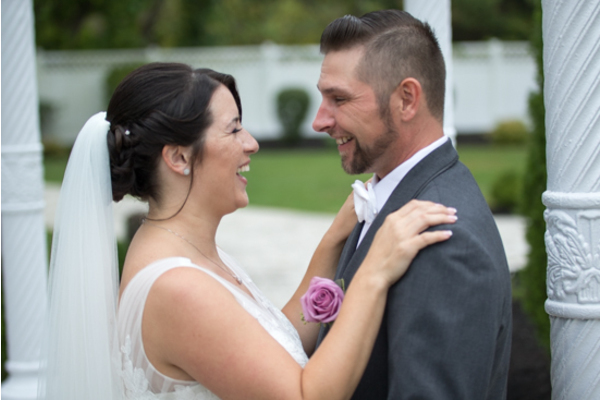 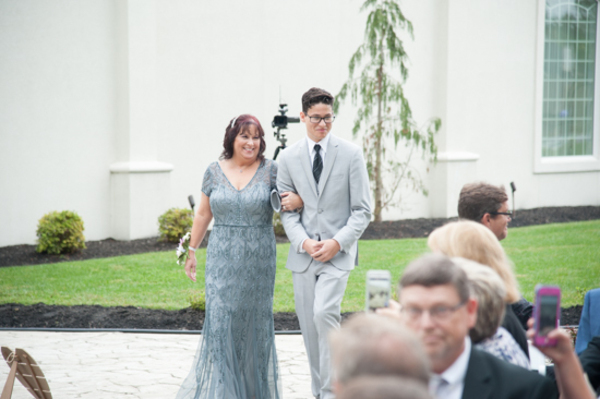 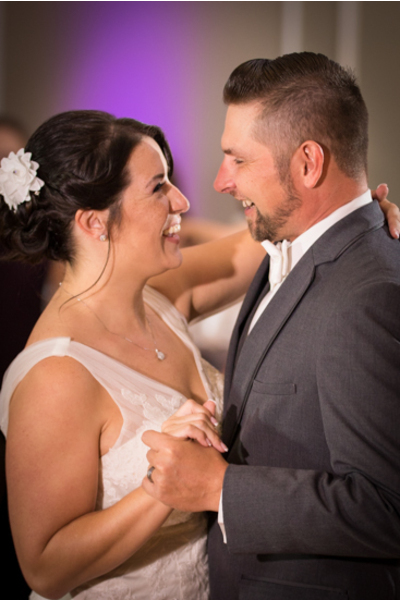 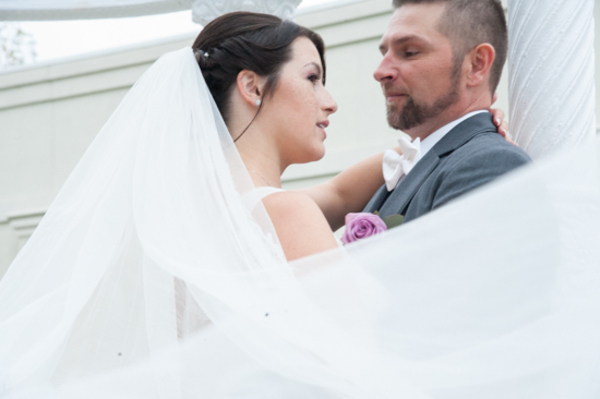 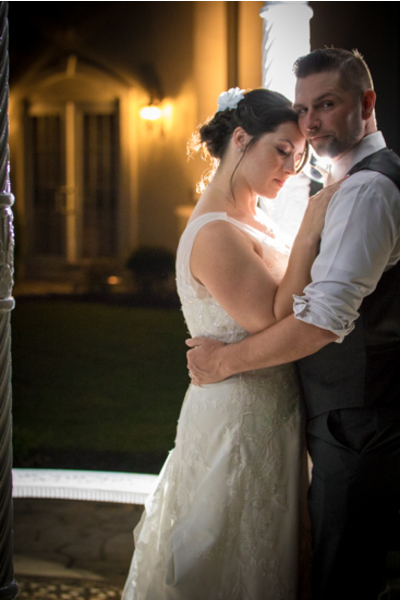 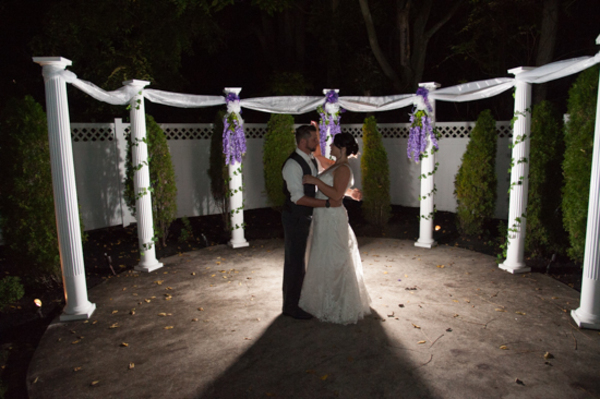 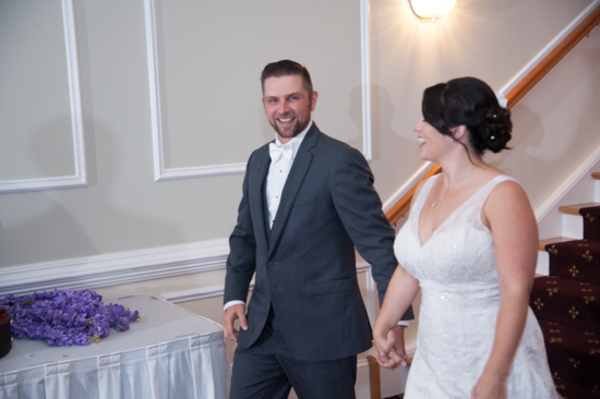 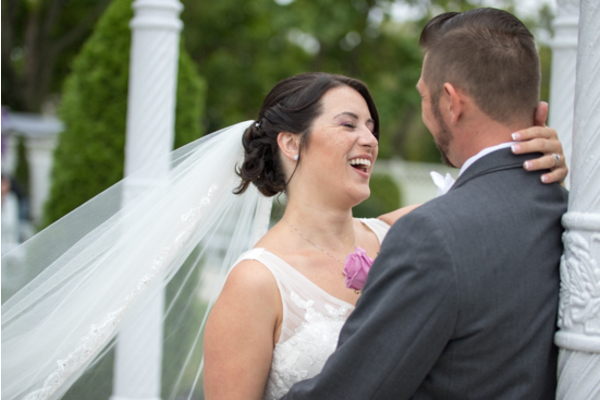 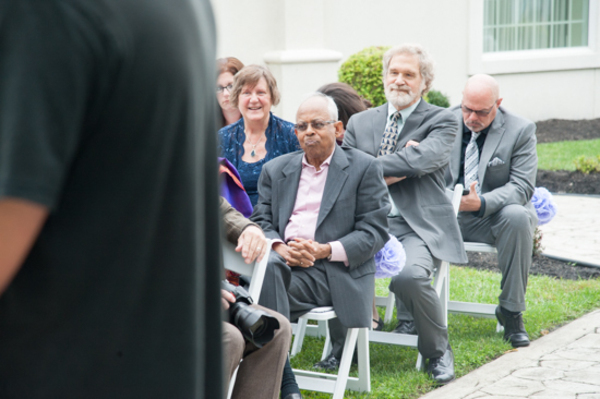 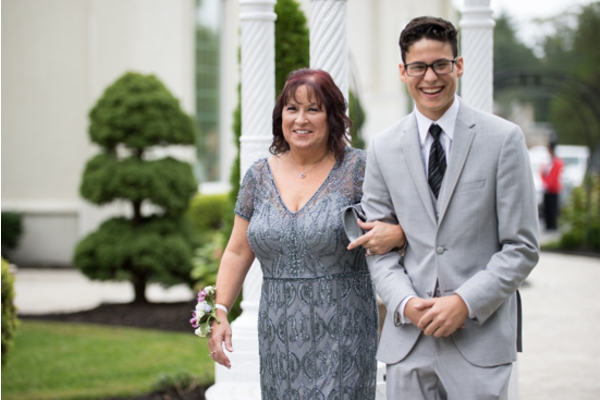 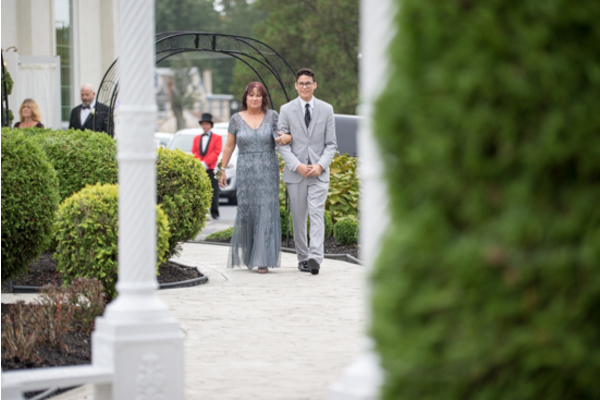 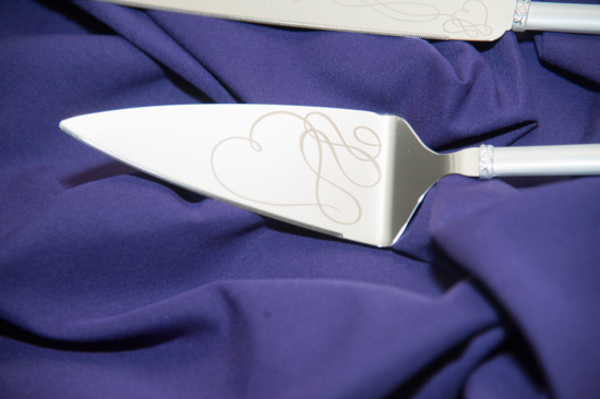 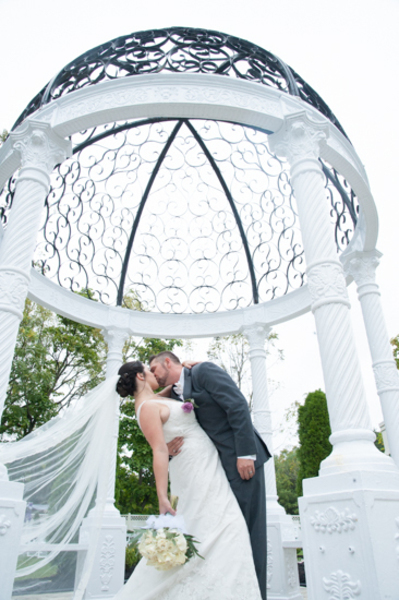 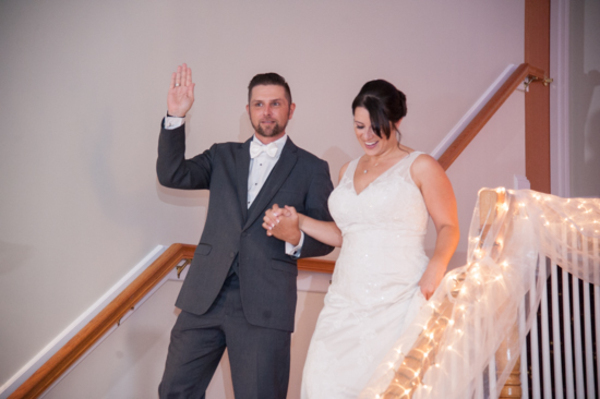 This cute couple celebrated their October wedding day at the Palace at Blackwood. 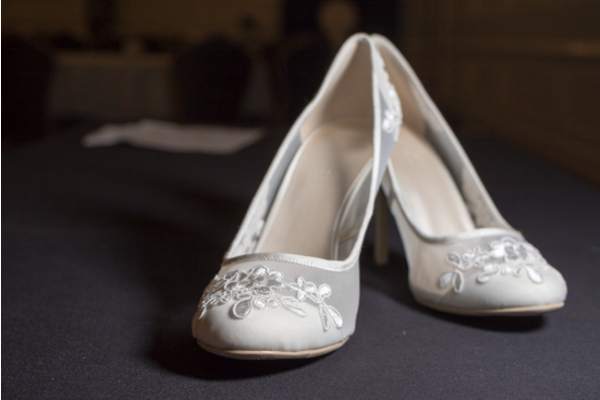 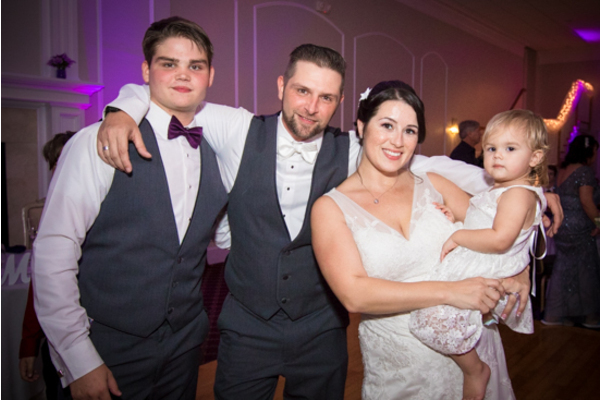 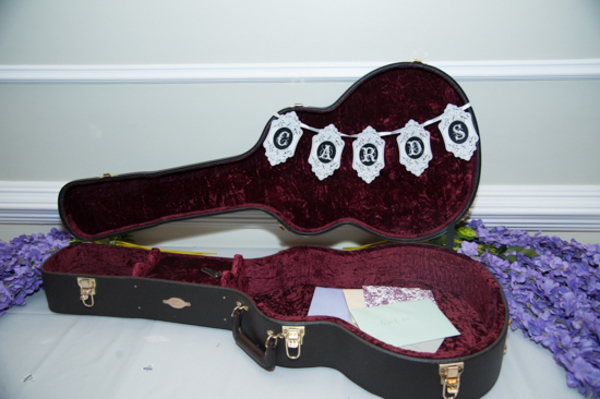 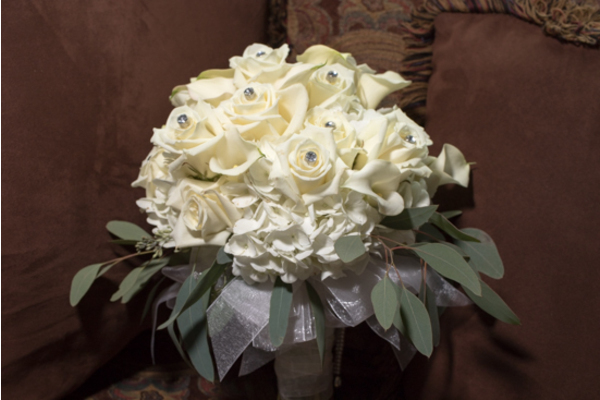 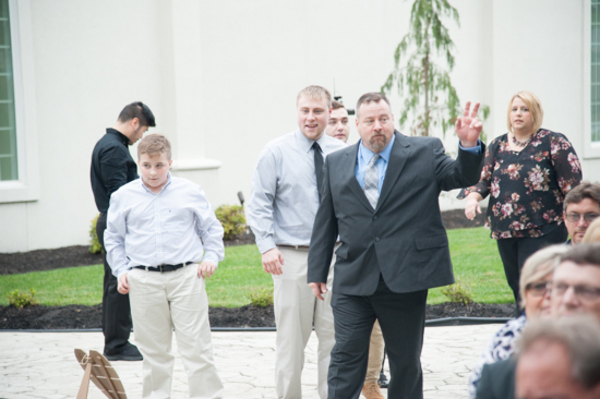 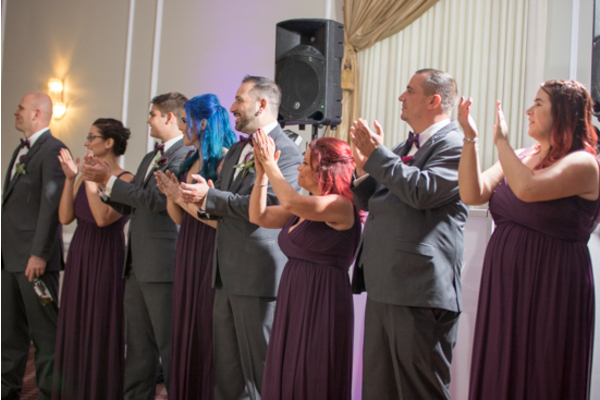 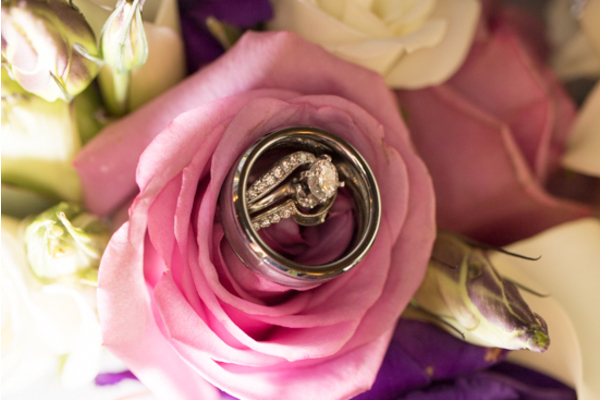 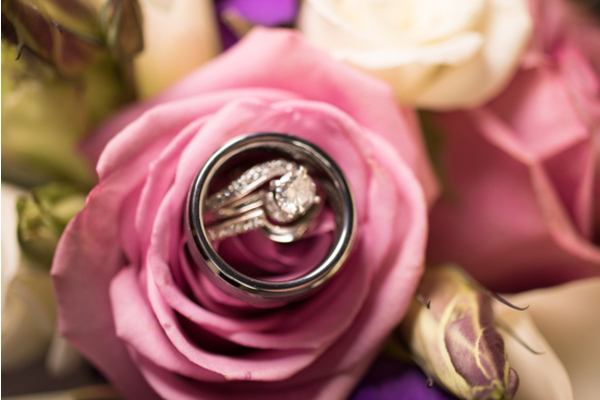 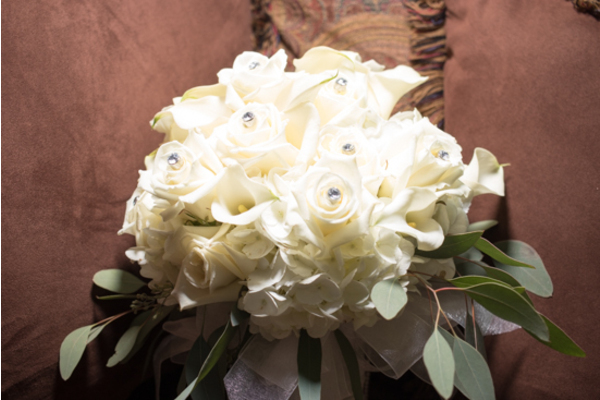 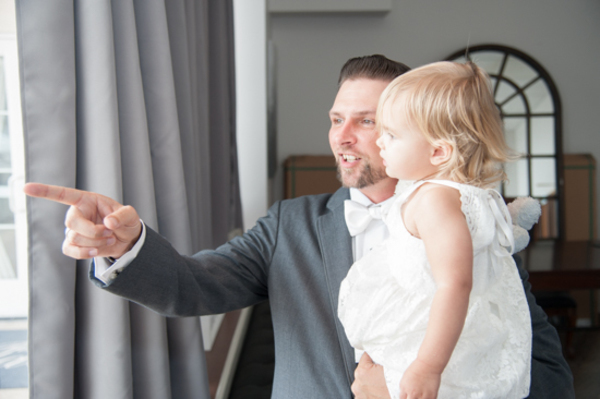 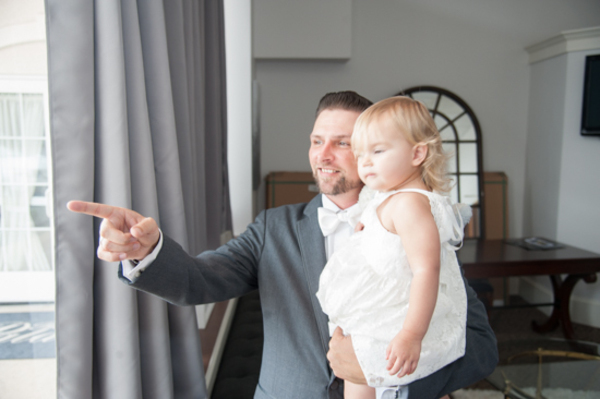 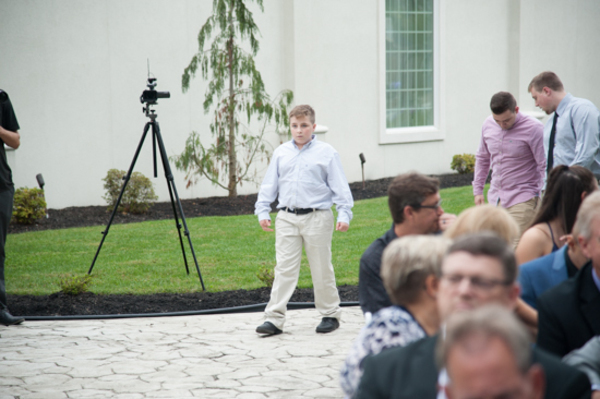 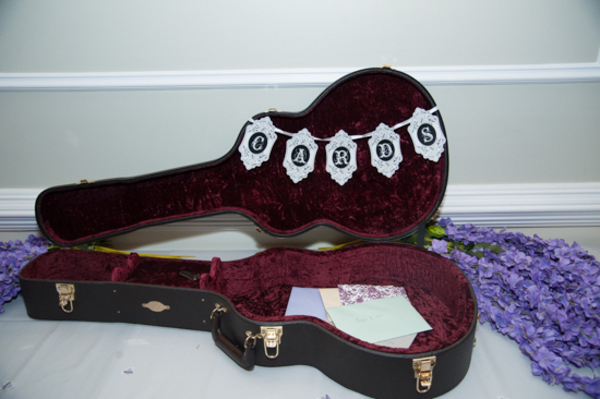 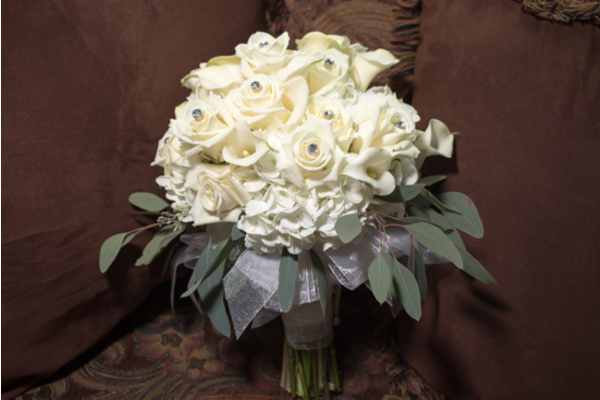 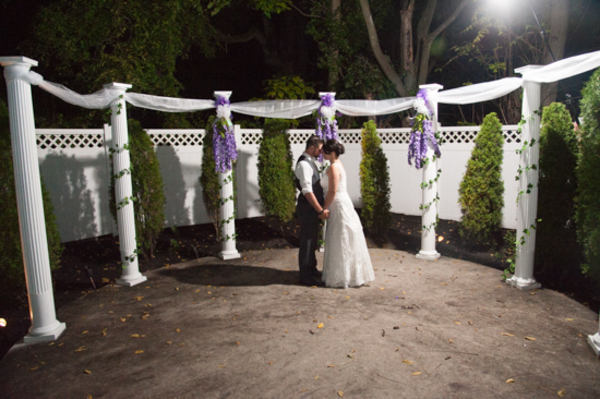 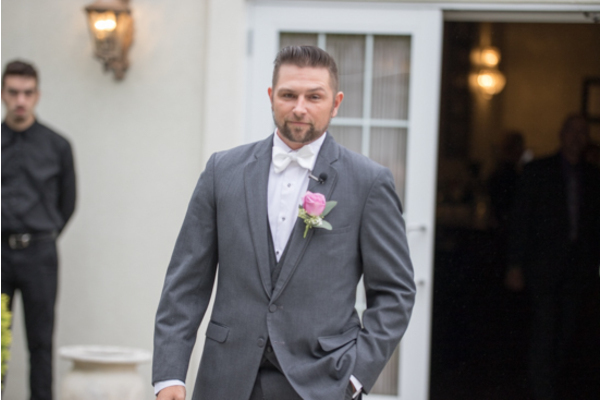 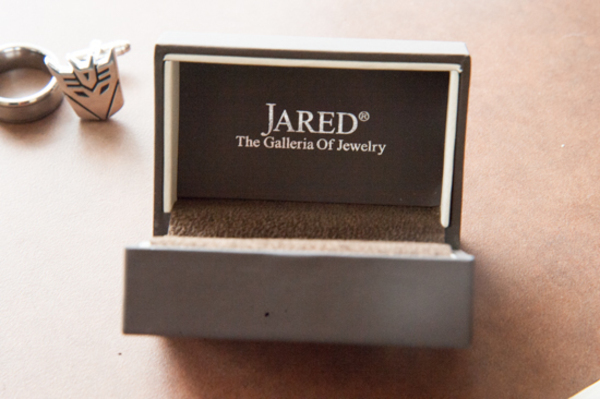 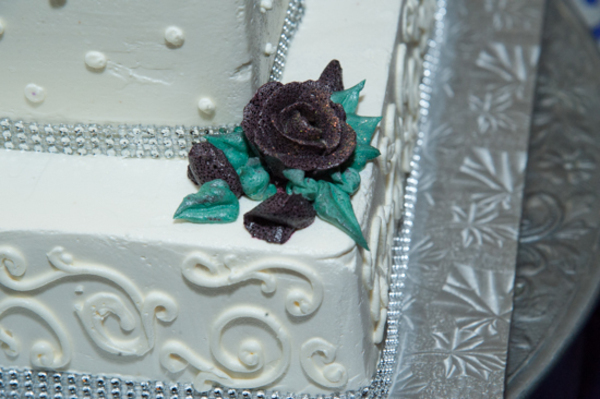 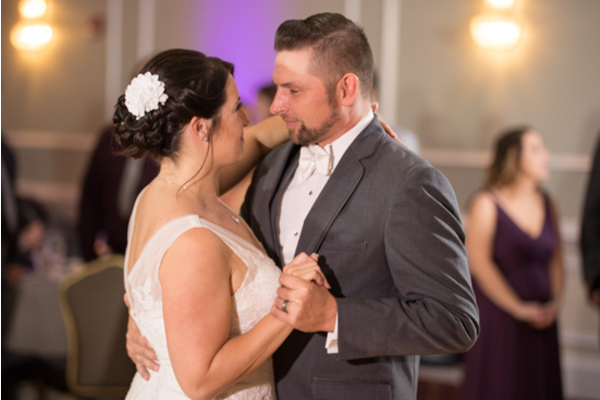 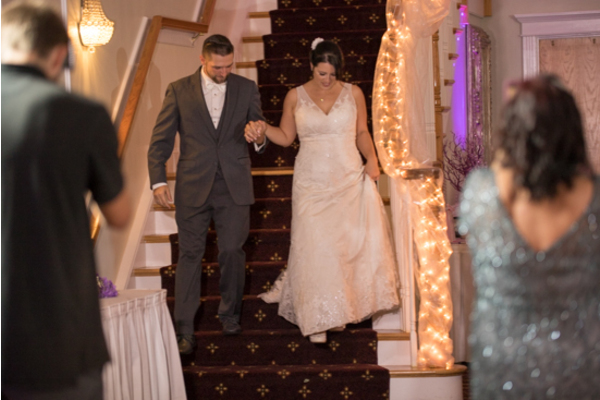 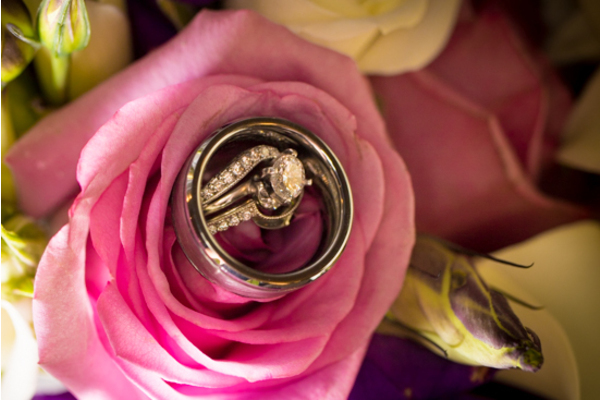 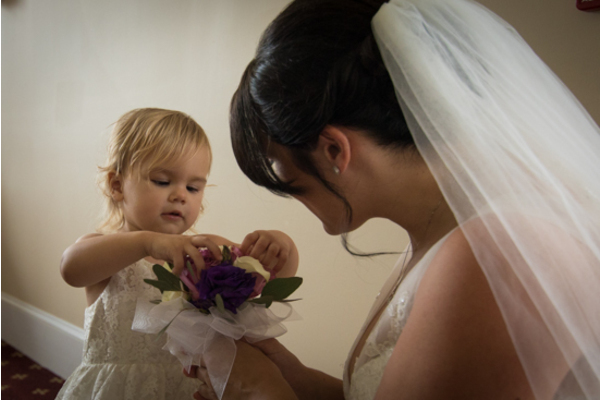 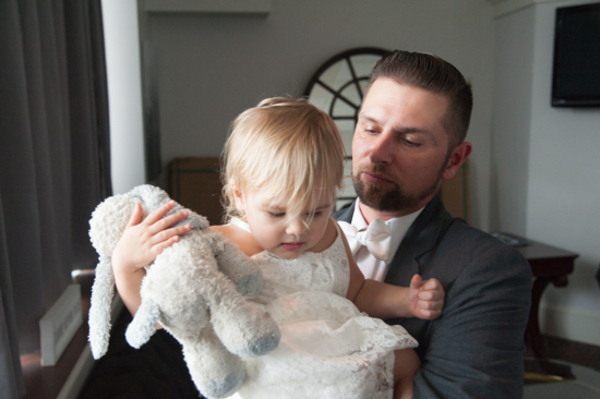 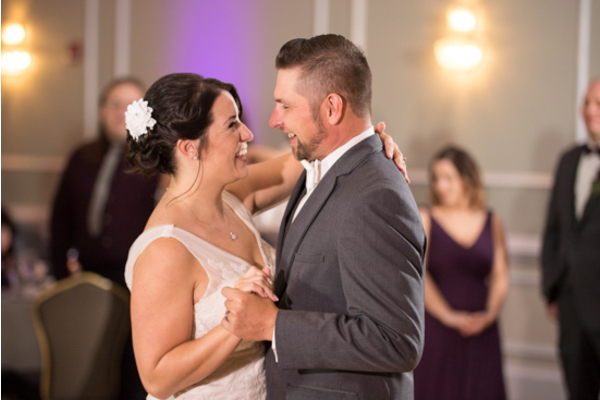 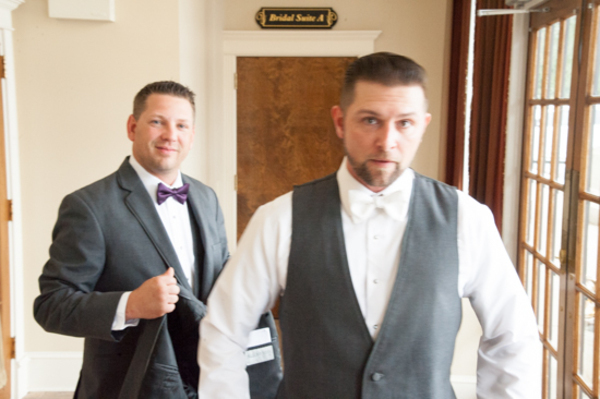 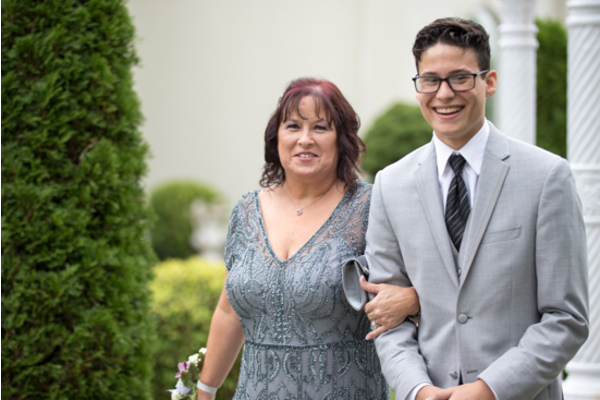 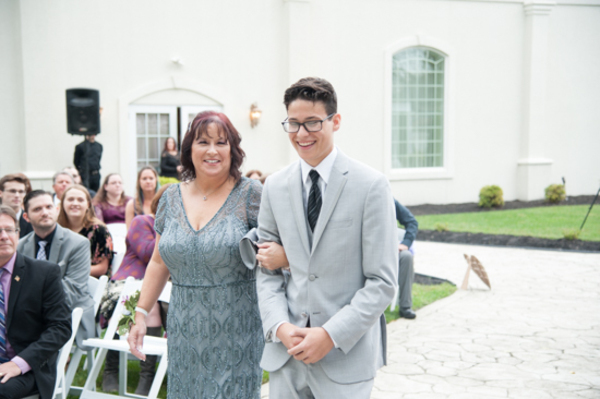 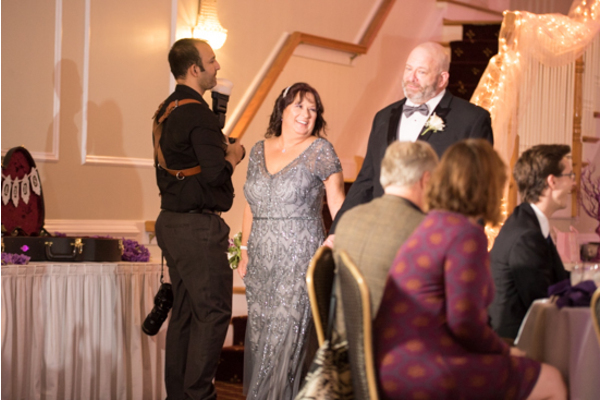 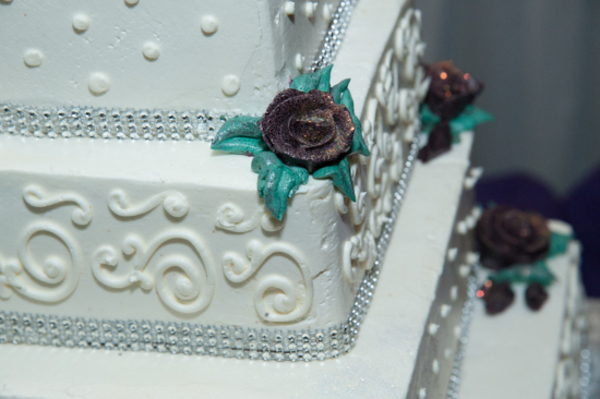 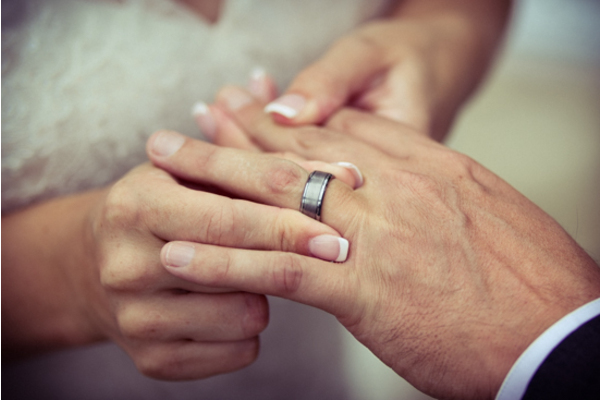 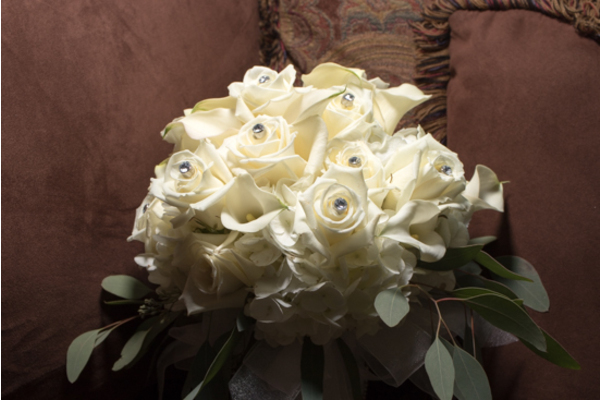 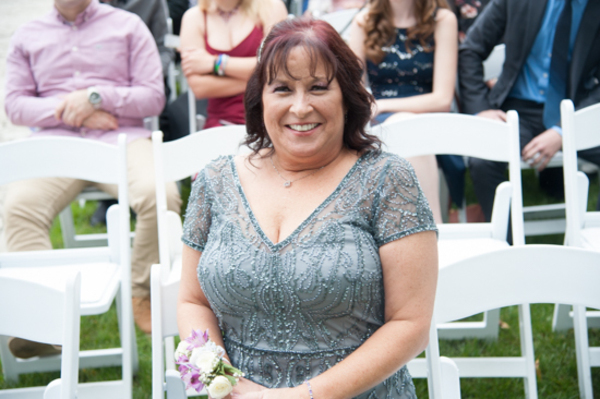 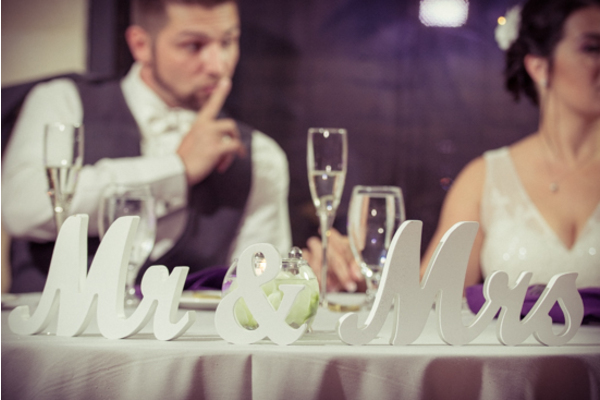 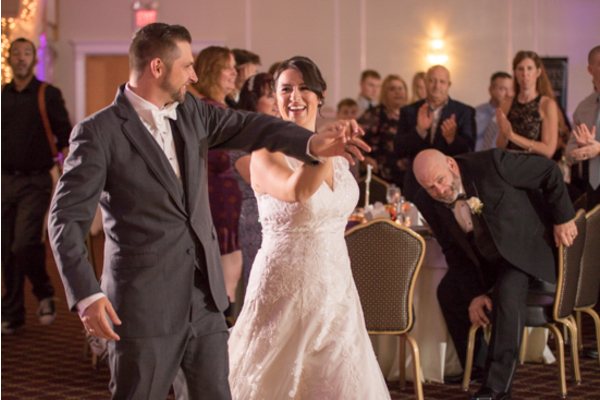 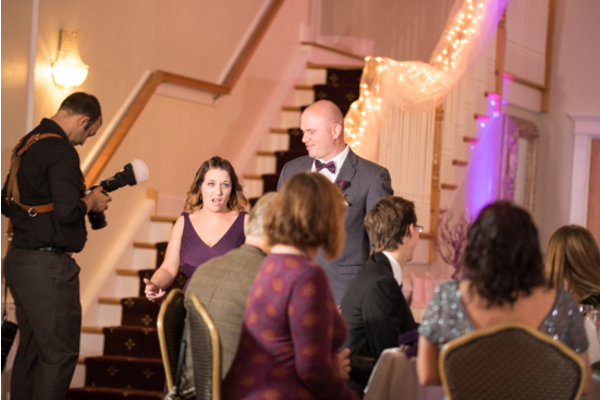 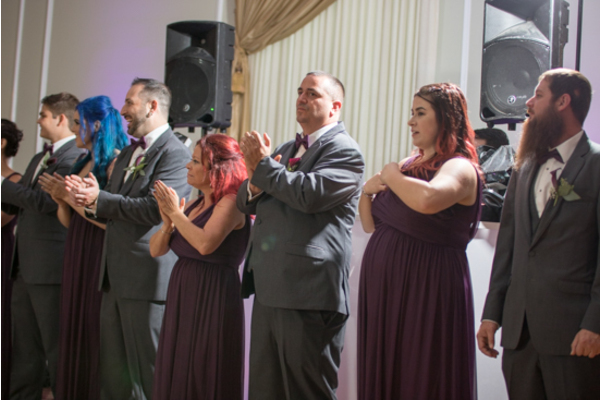 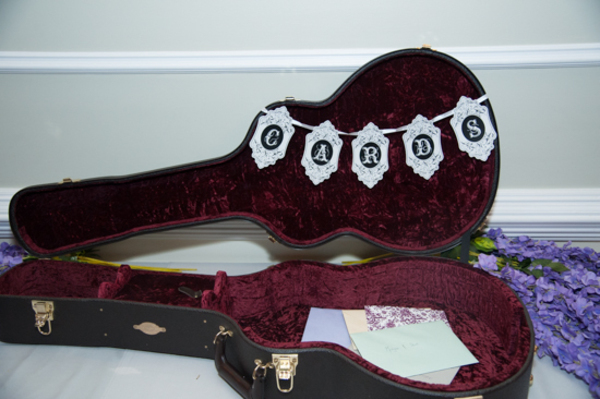 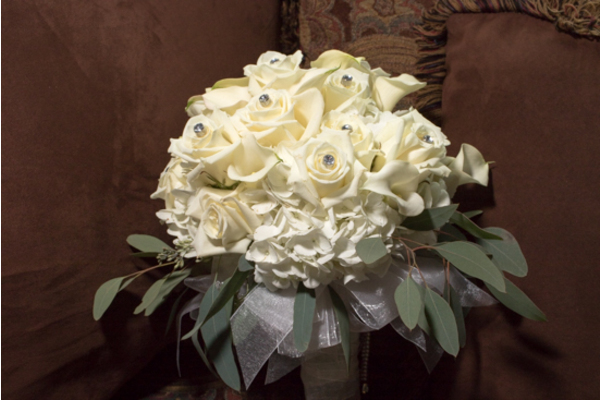 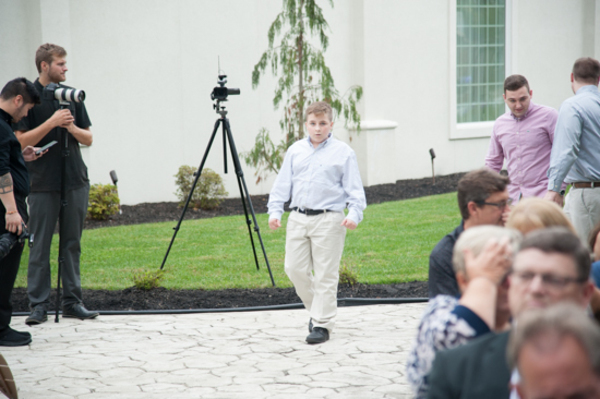 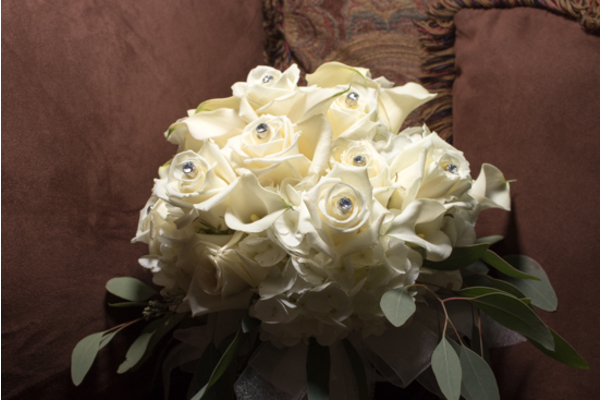 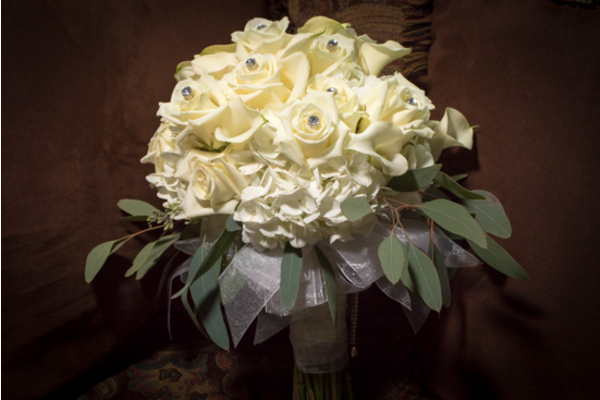 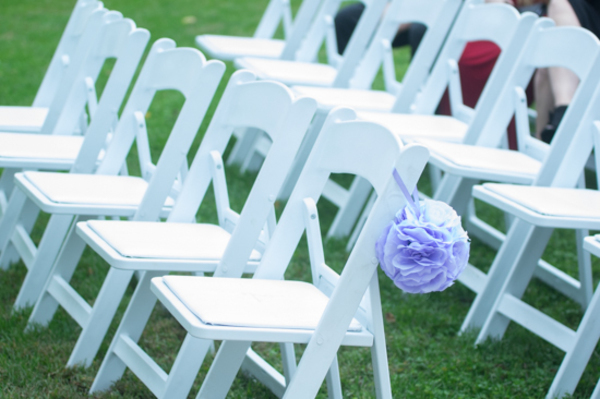 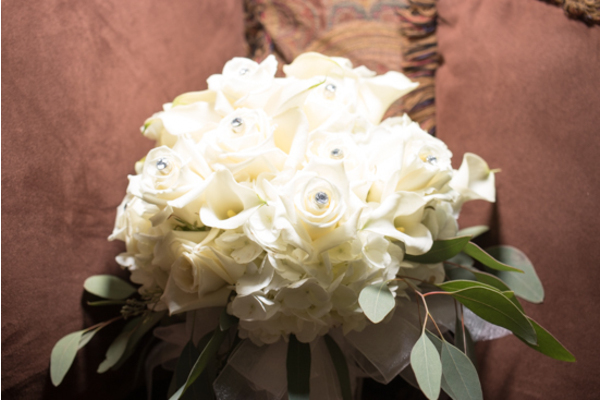 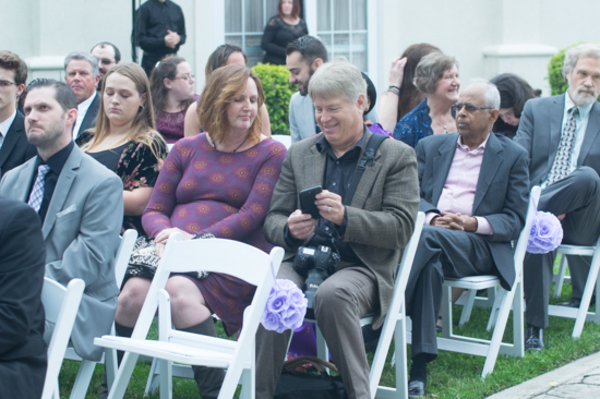 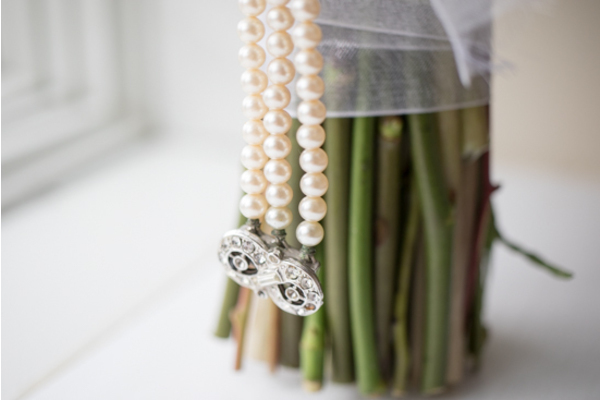 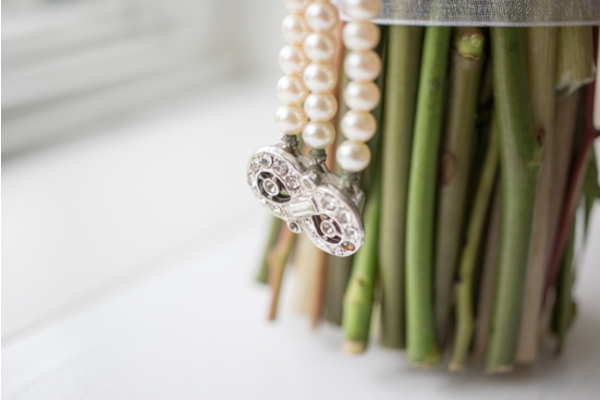 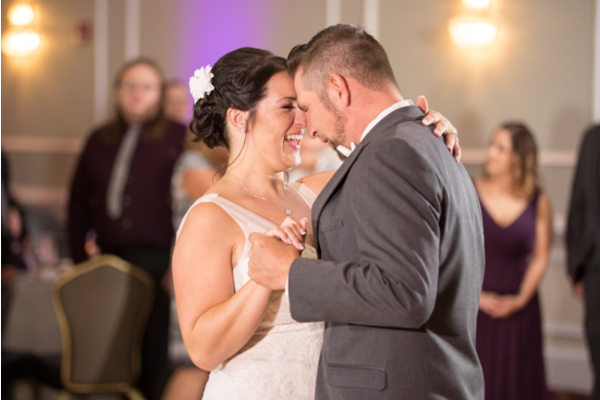 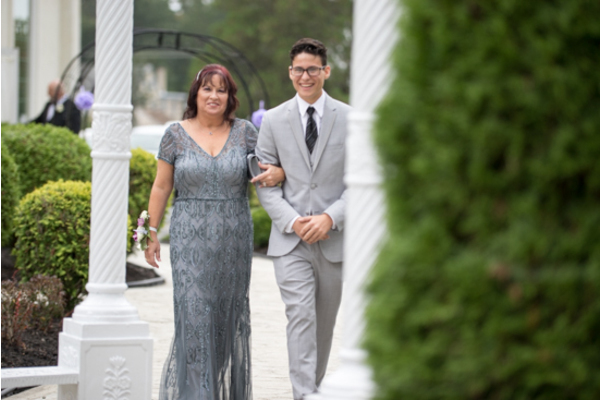 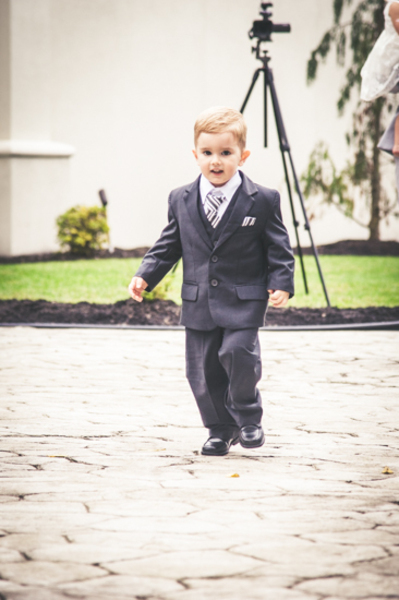 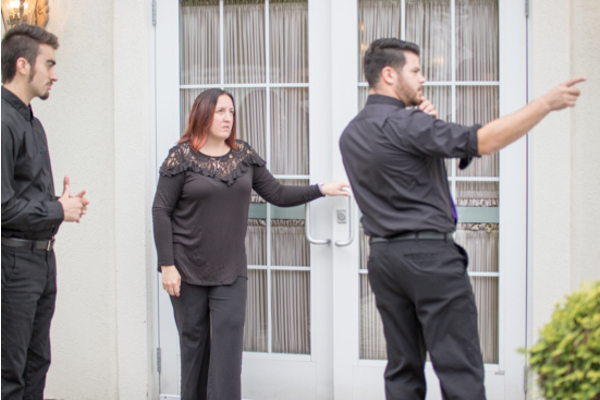 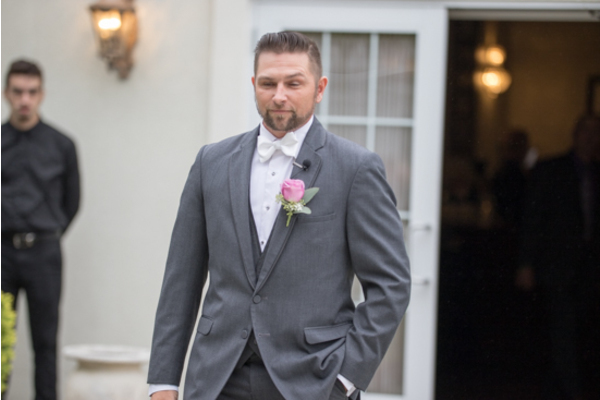 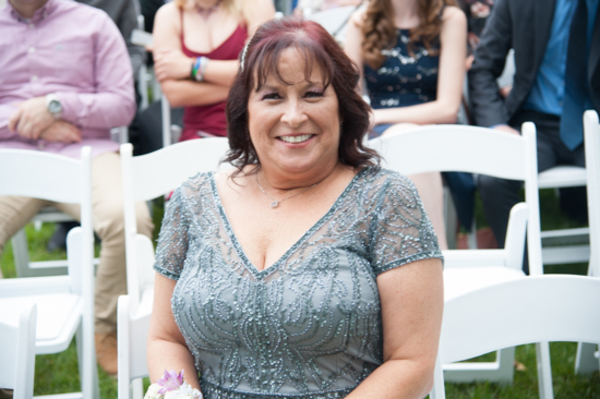 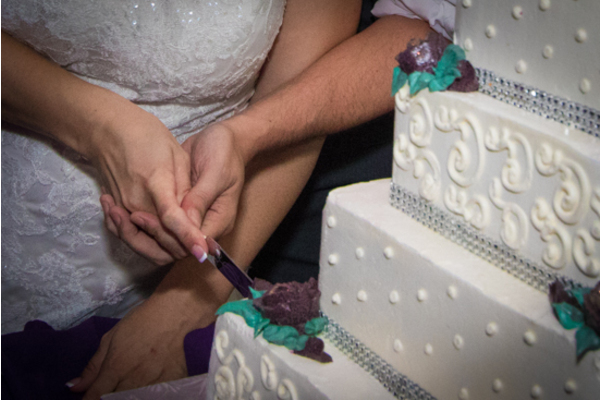 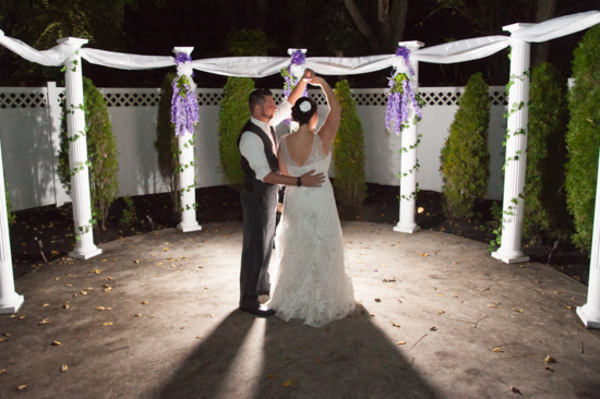 They took full advantage of using our services here at Enchanted Celebrations, including photography, videography, and DJ! 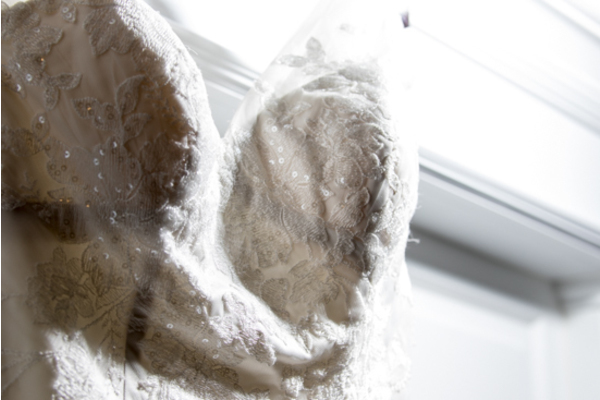 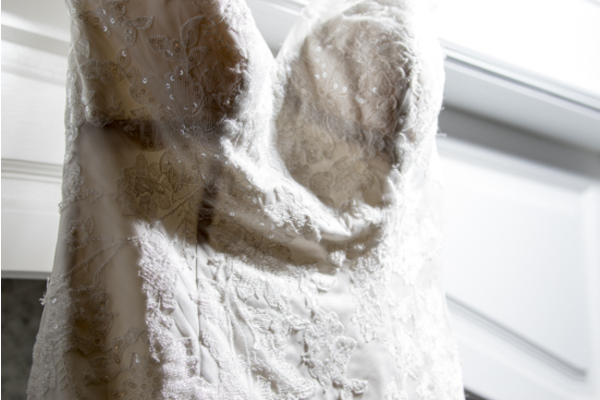 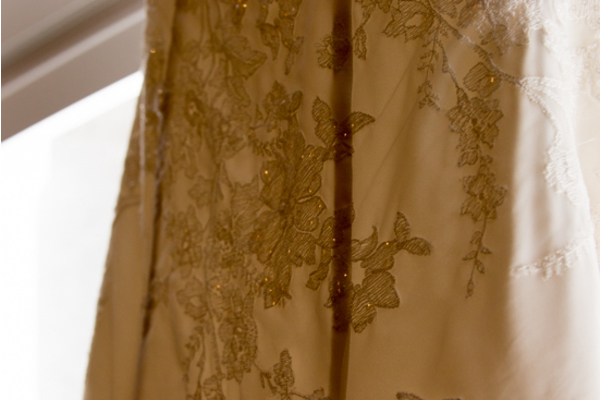 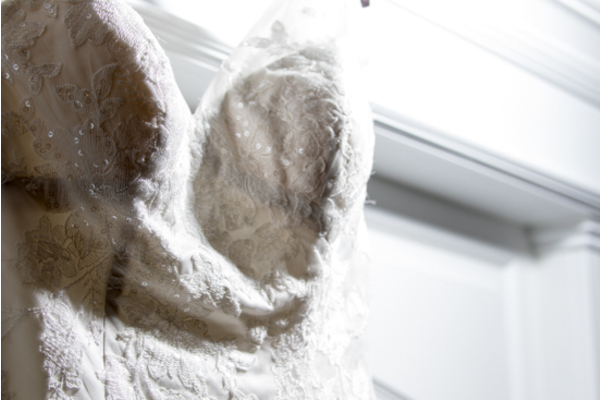 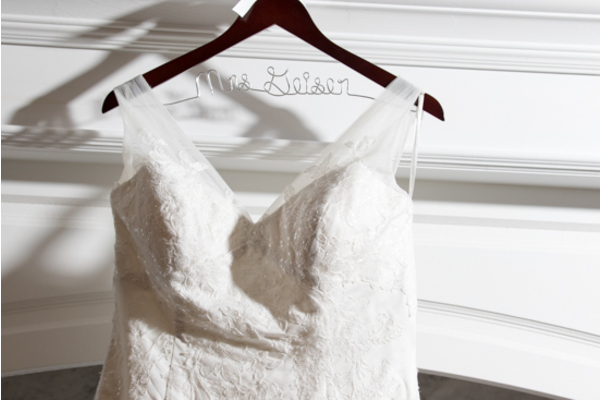 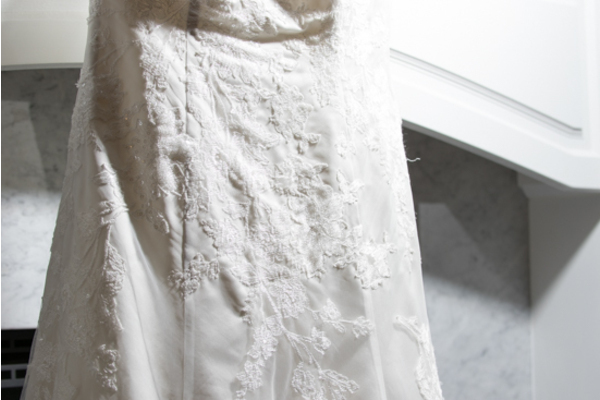 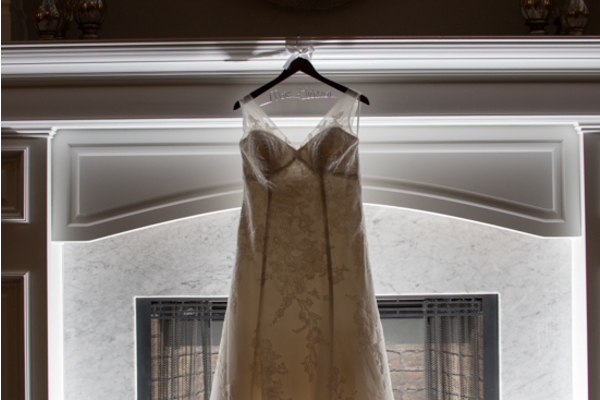 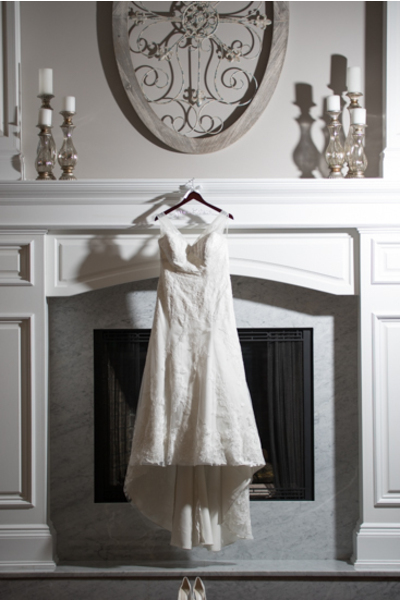 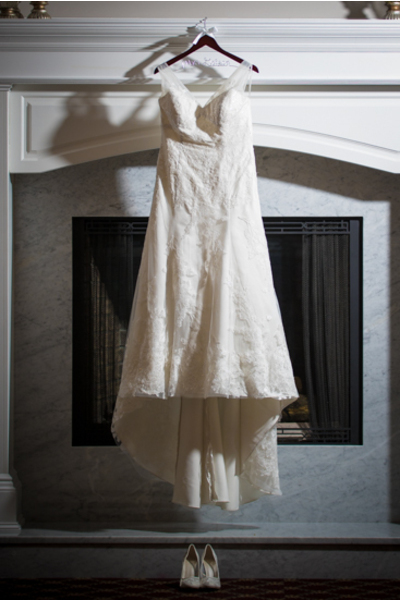 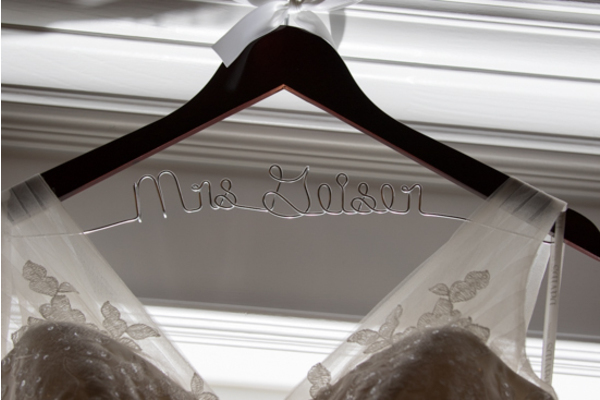 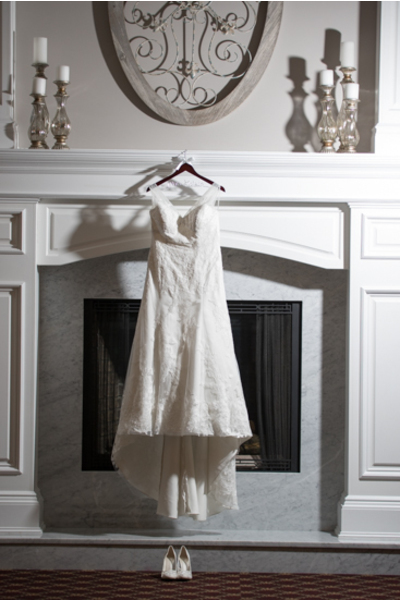 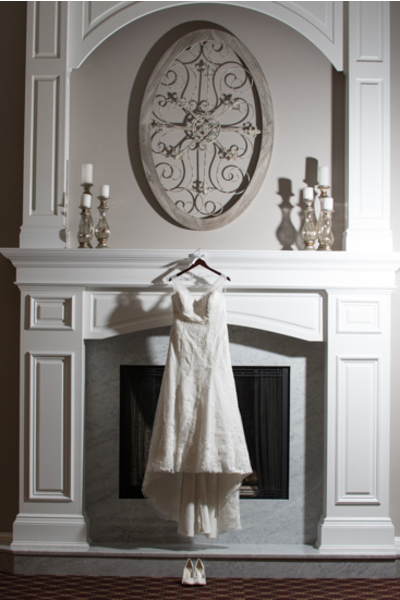 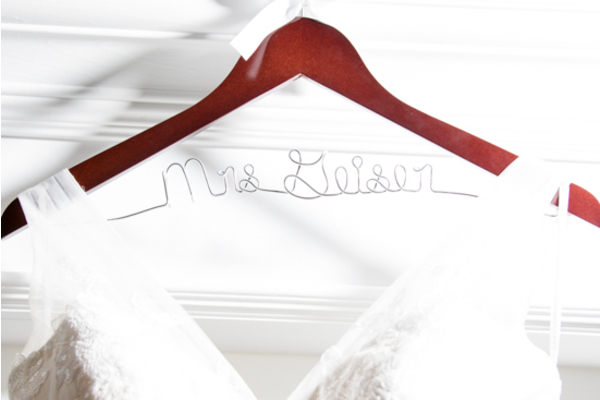 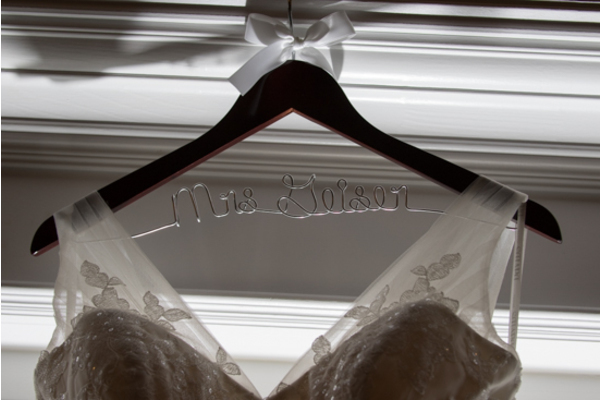 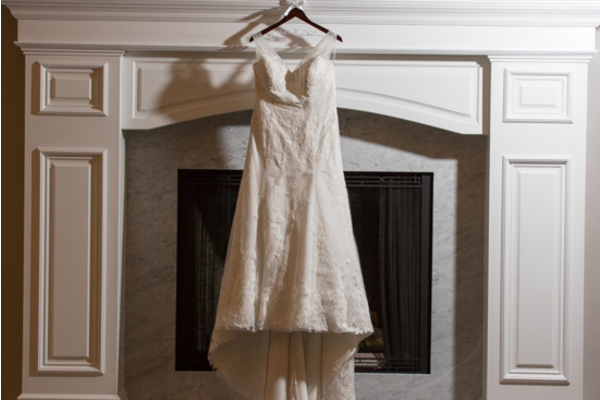 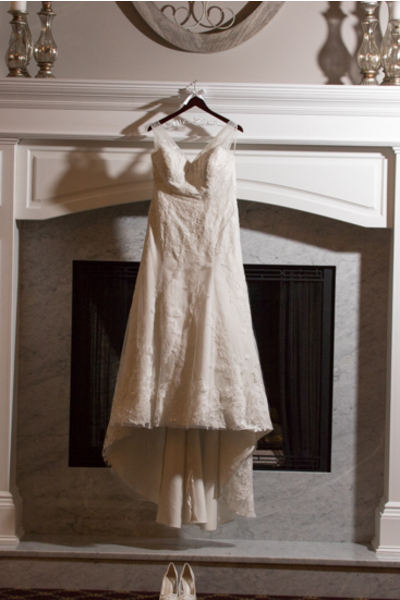 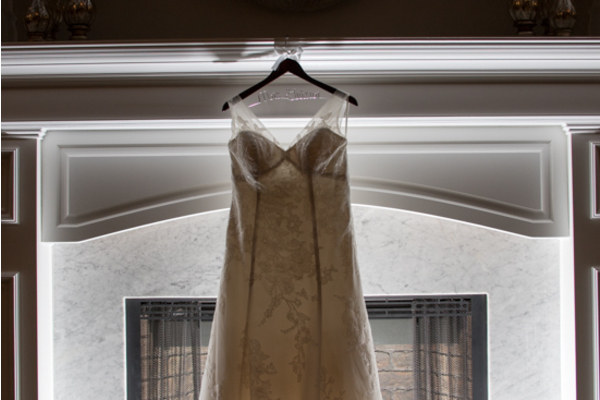 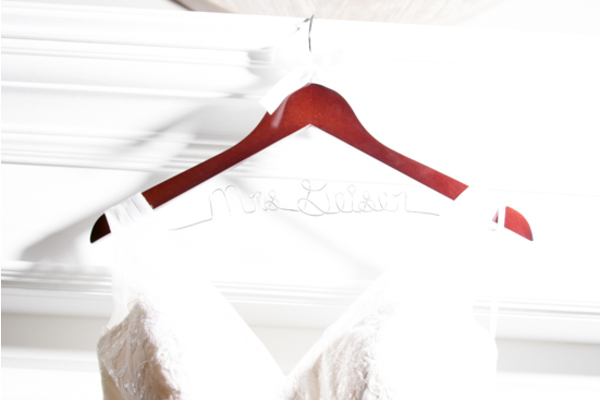 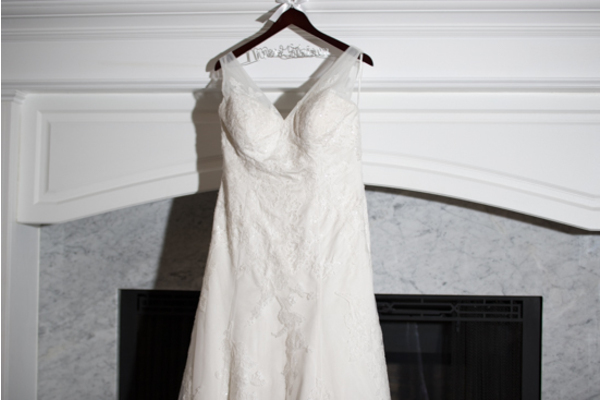 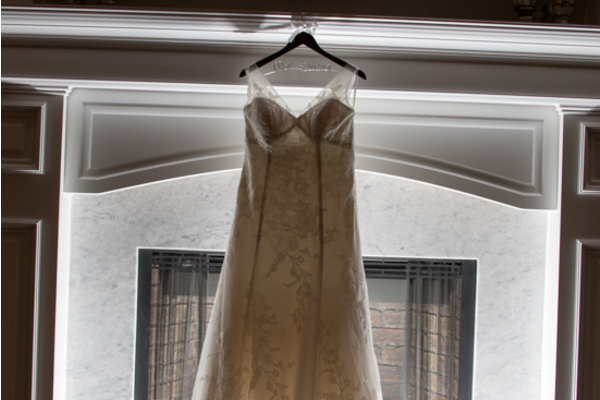 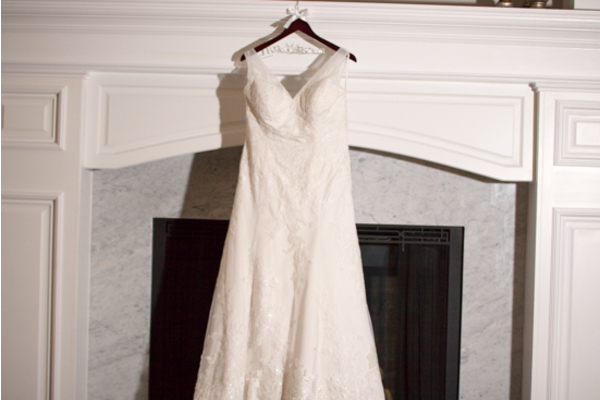 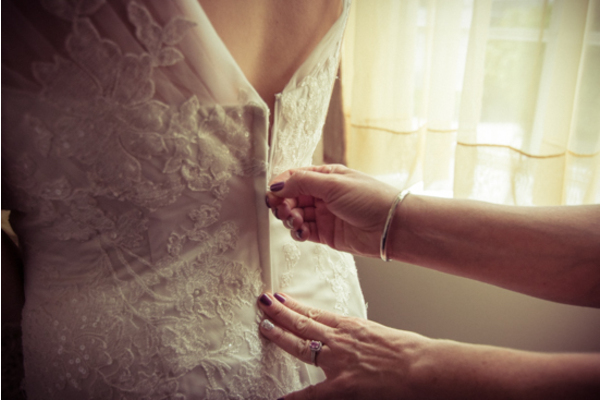 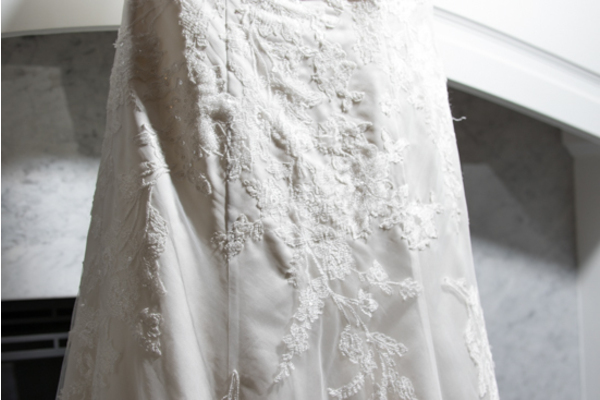 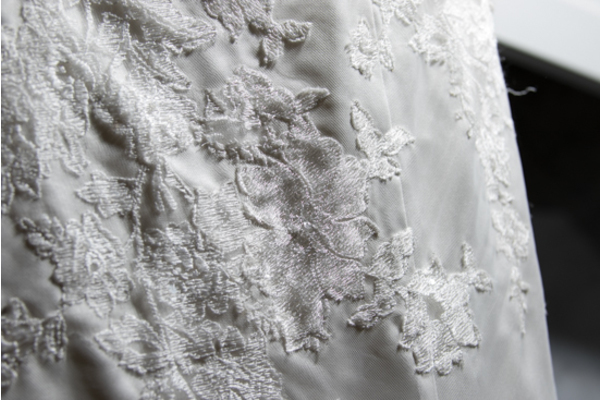 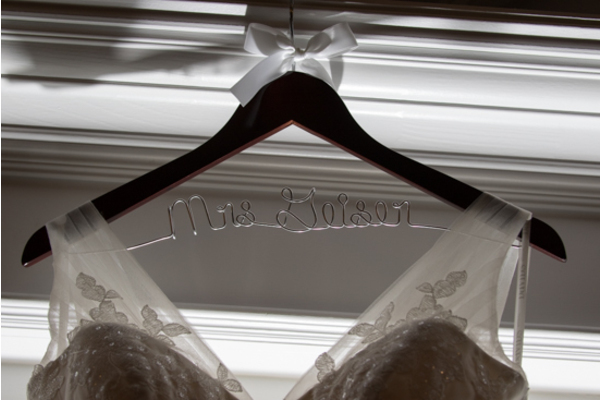 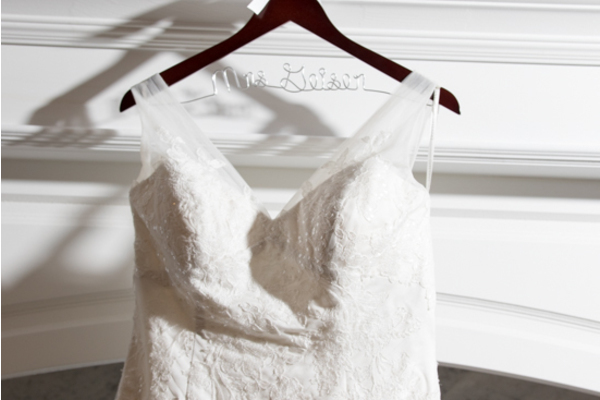 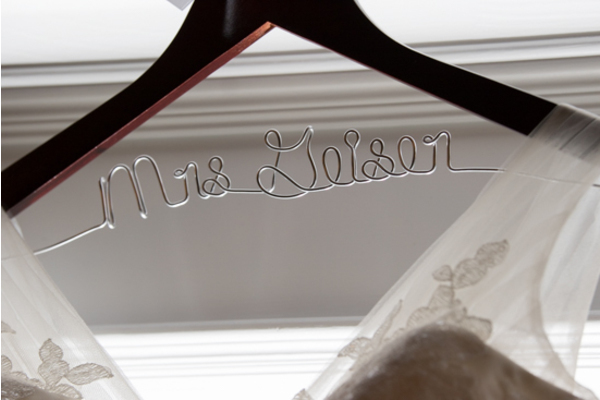 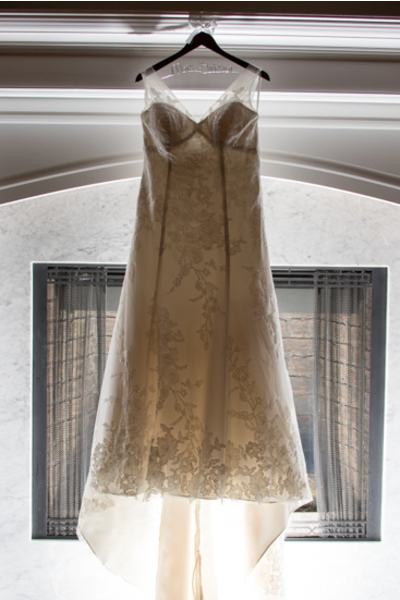 To begin, Megan admired her stunning floral lace gown hanging on the fireplace. 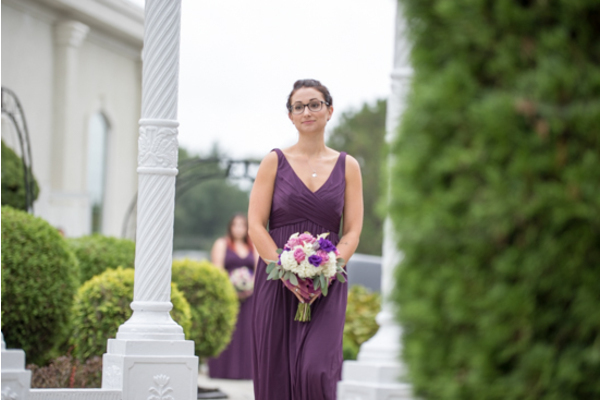 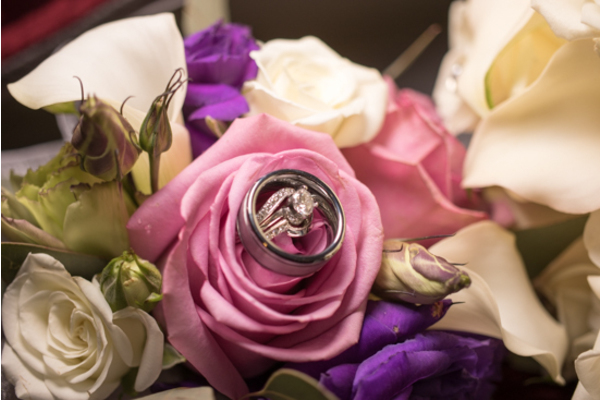 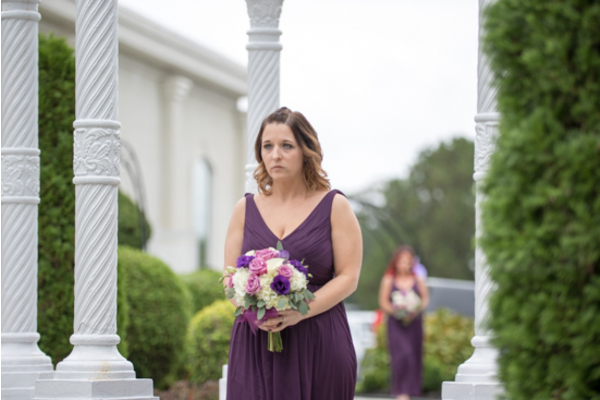 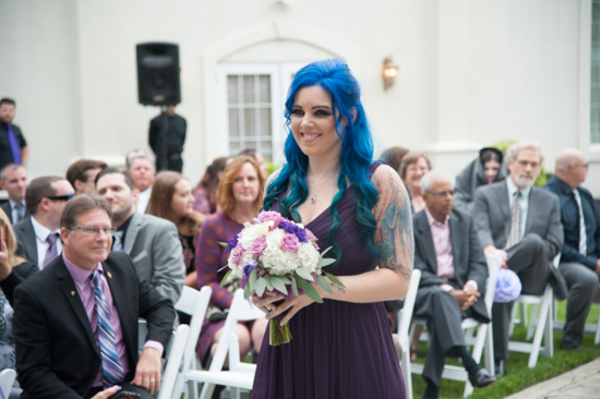 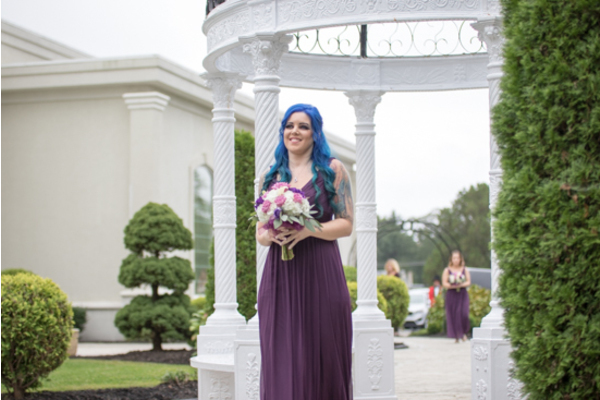 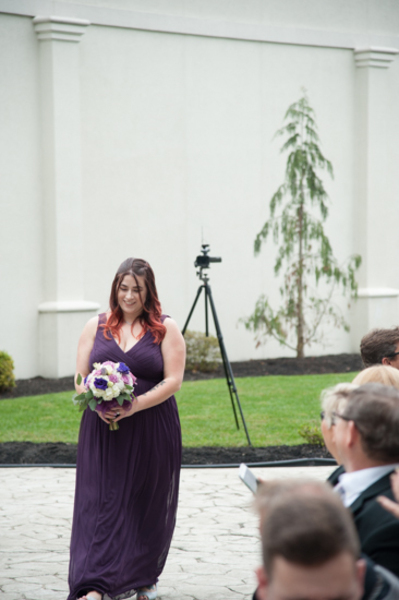 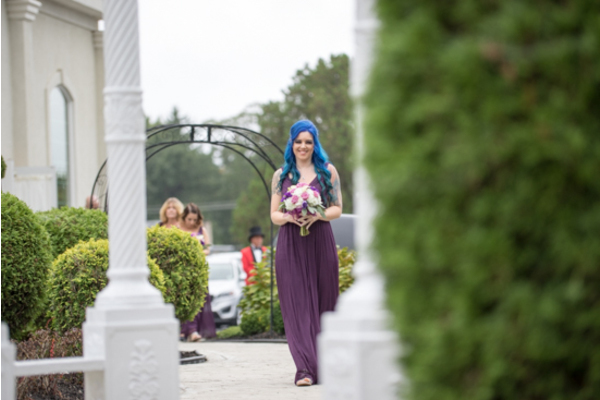 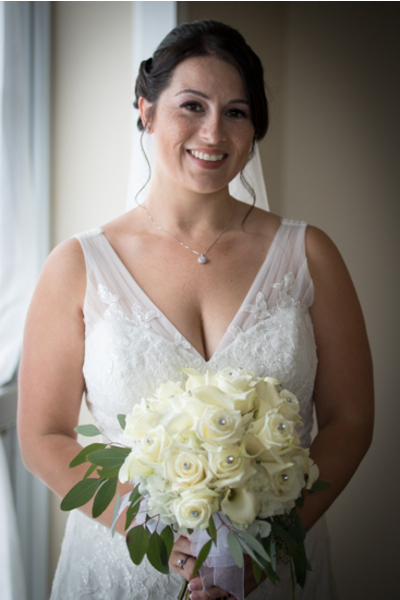 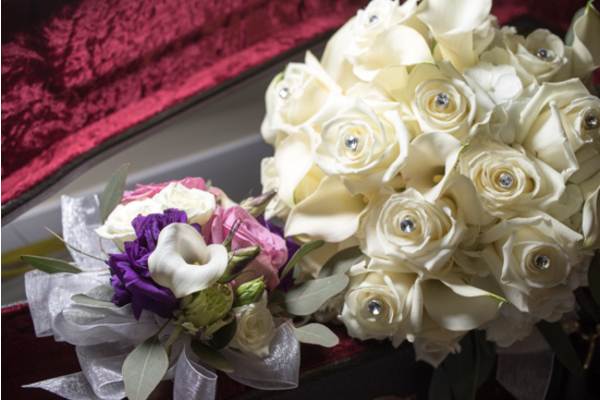 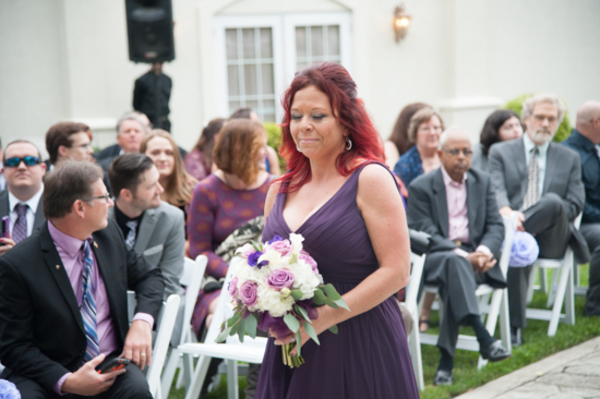 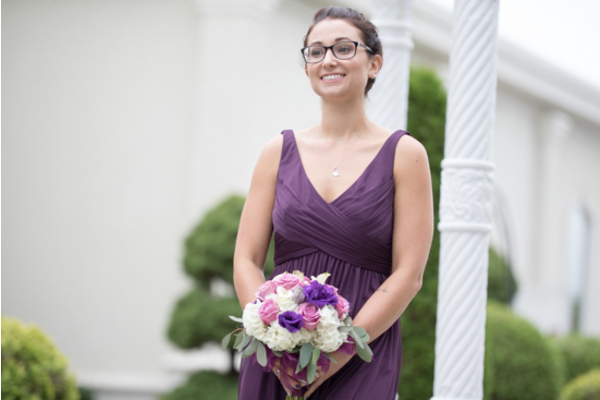 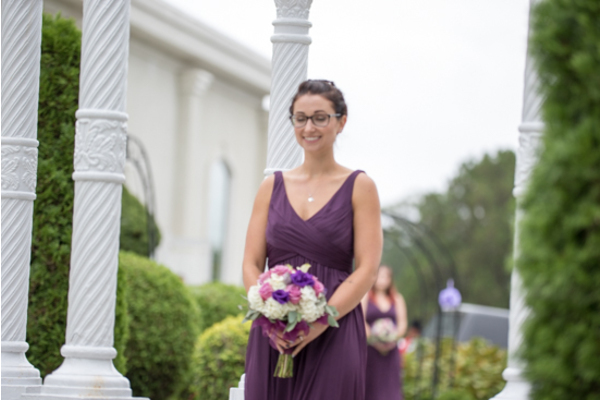 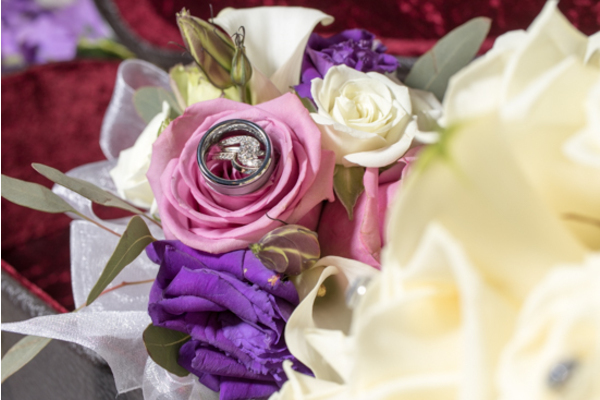 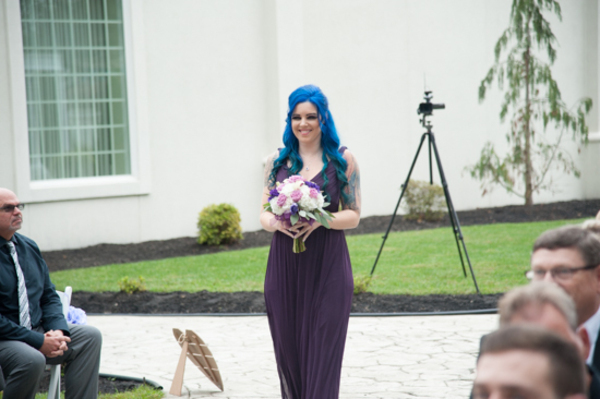 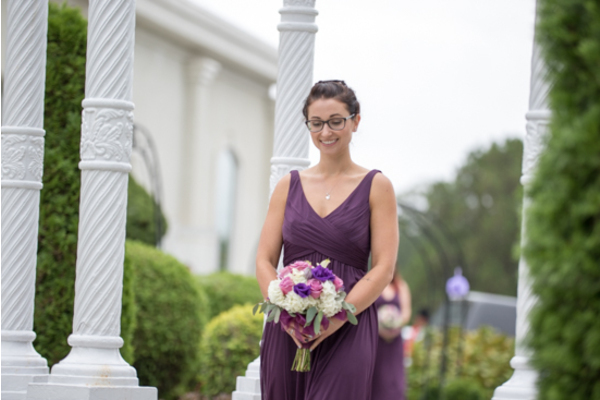 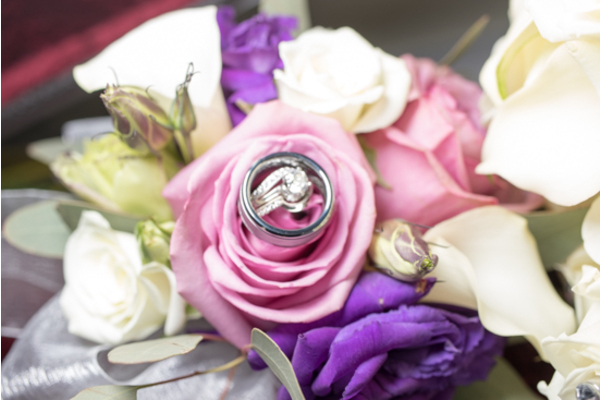 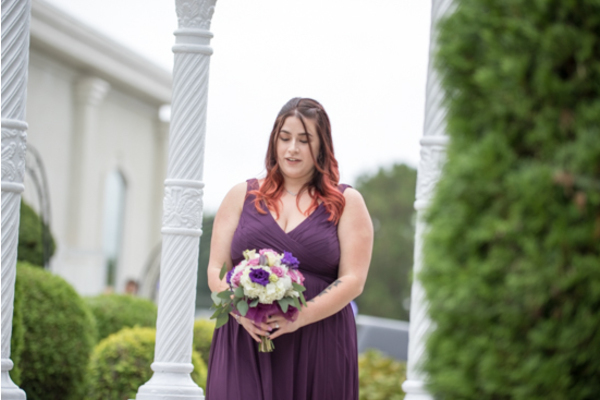 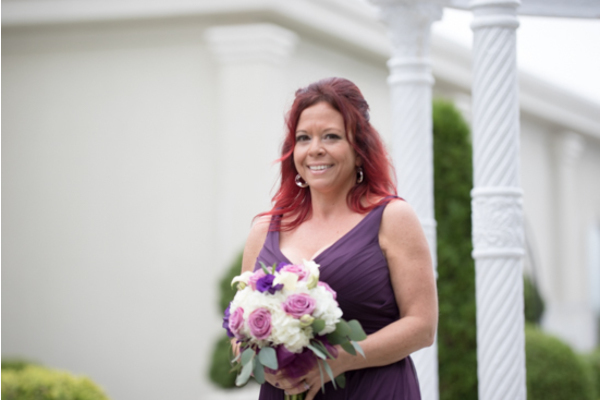 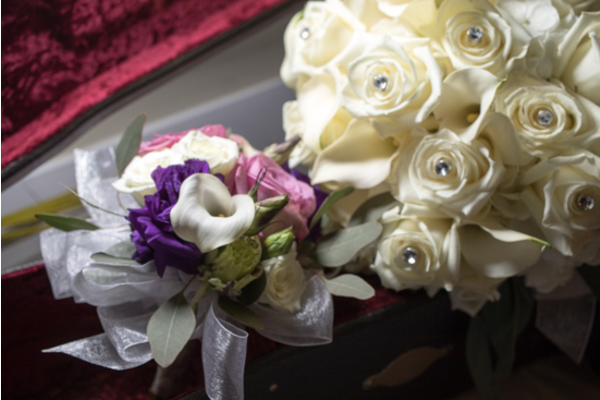 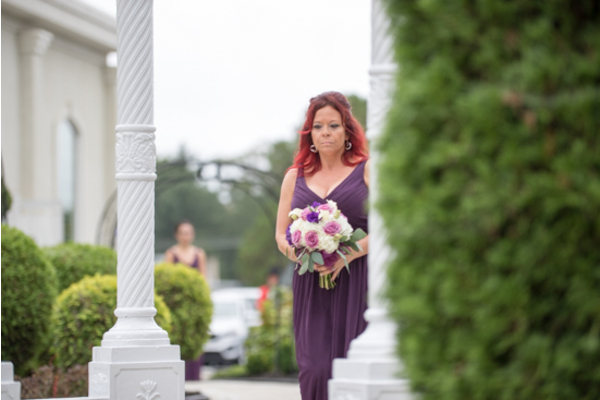 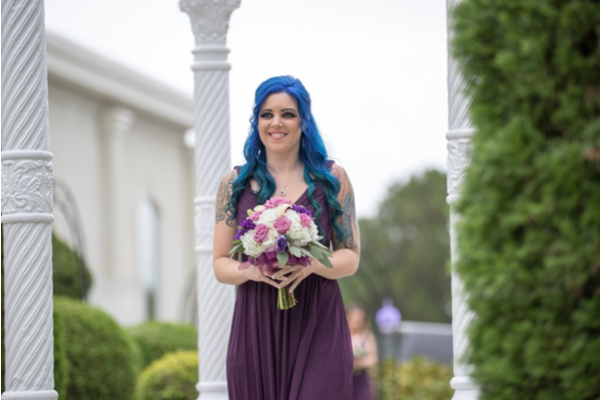 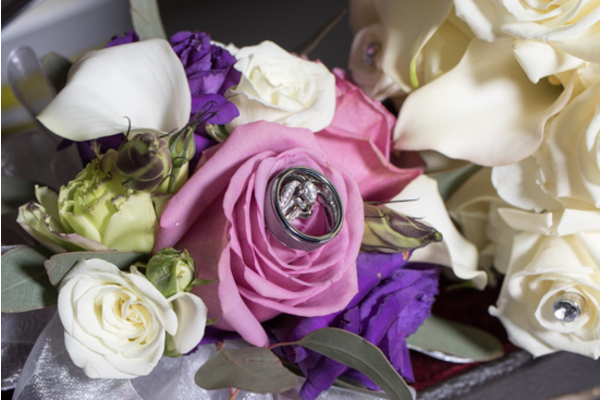 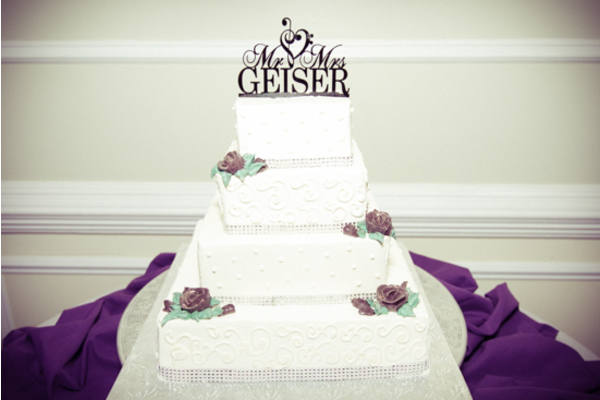 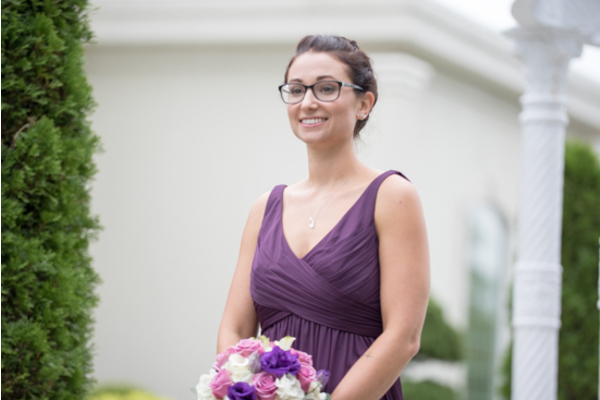 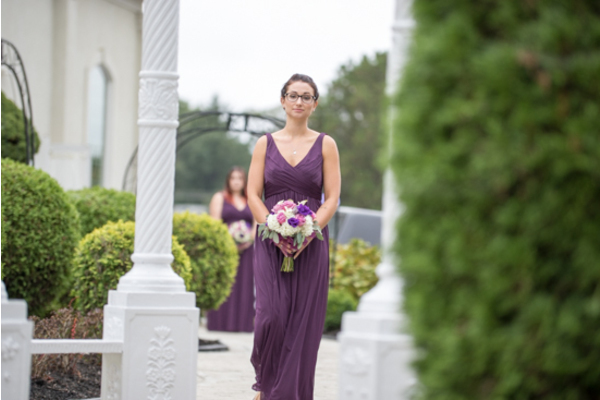 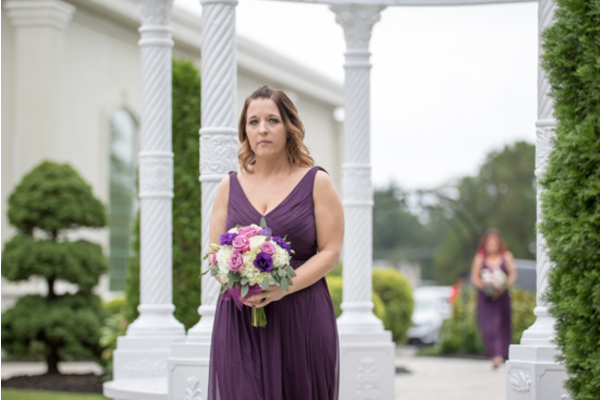 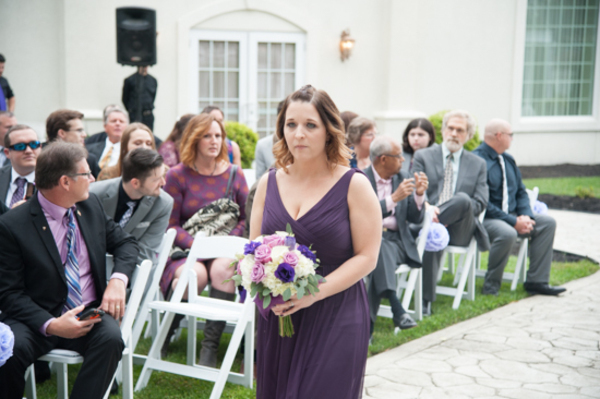 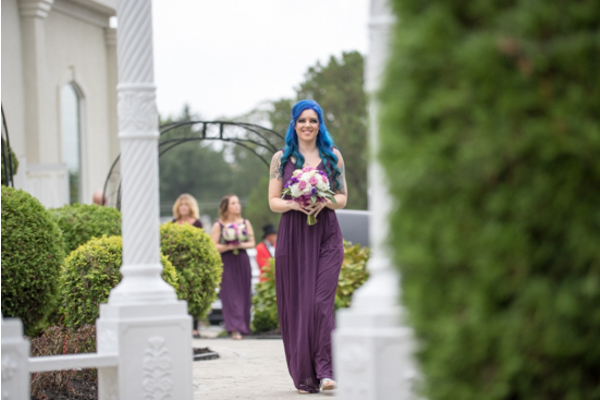 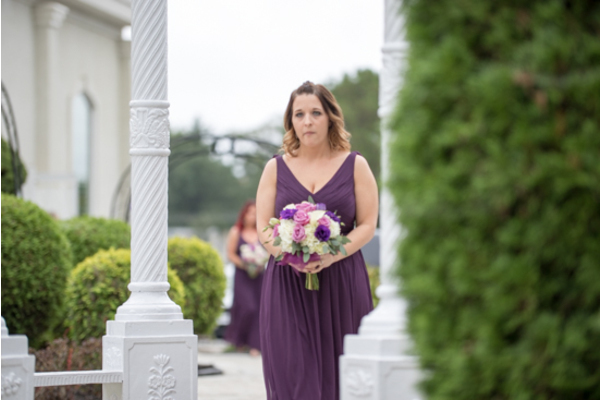 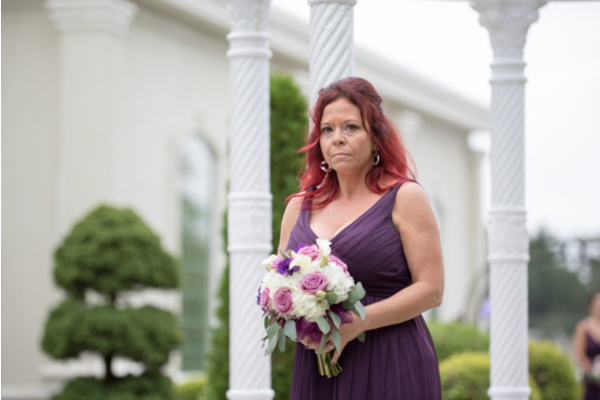 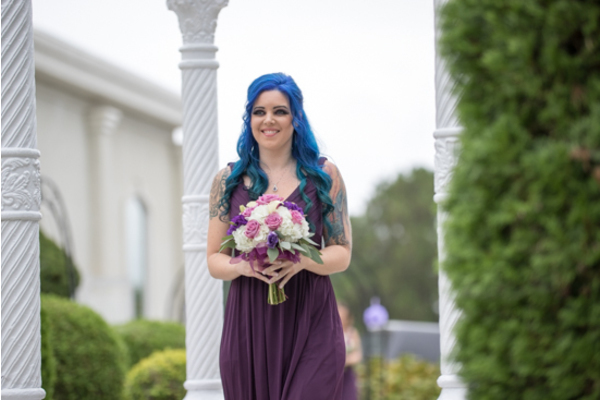 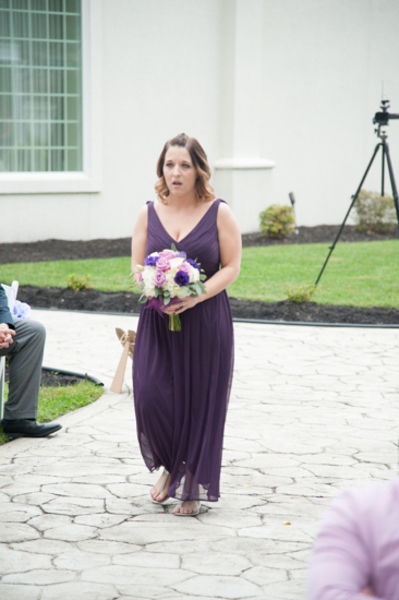 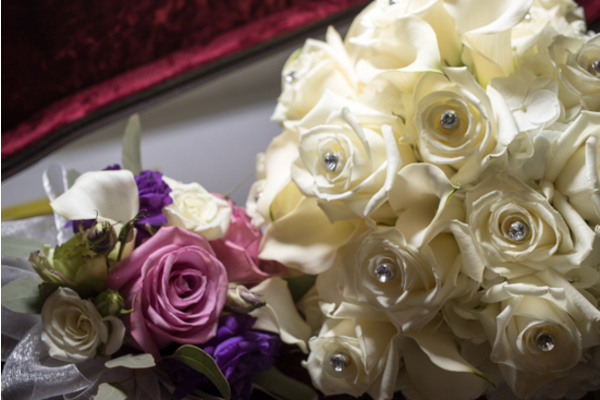 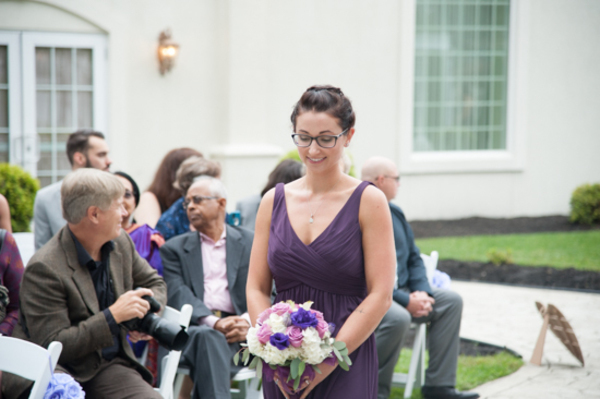 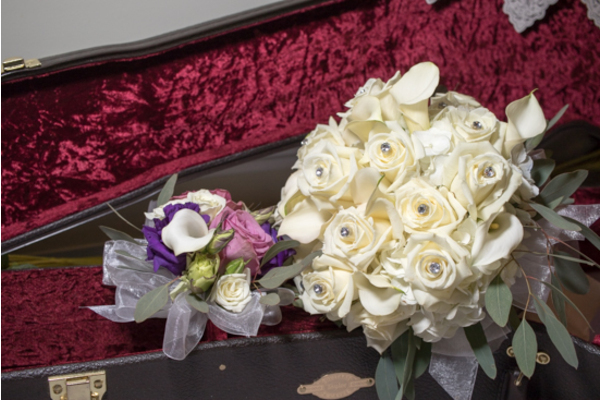 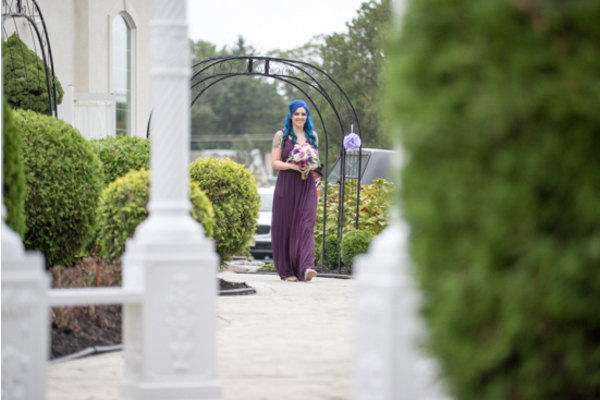 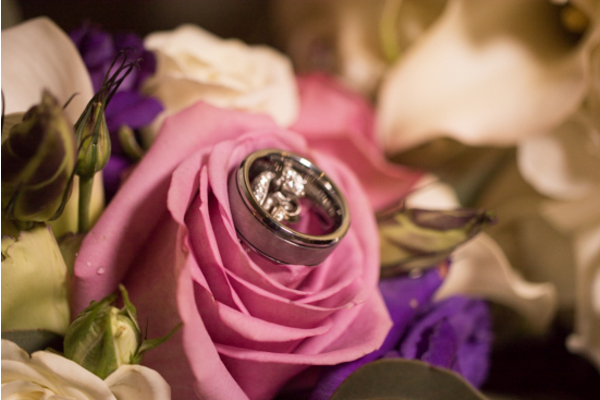 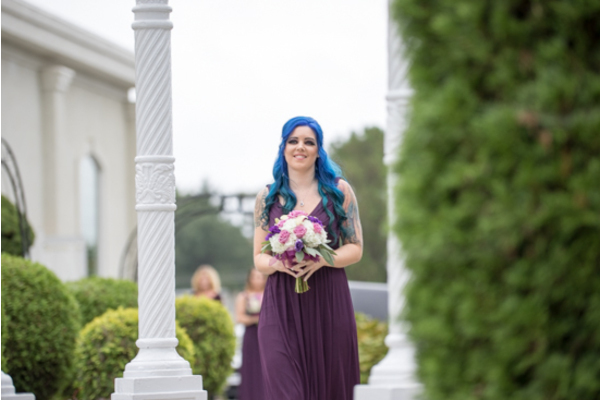 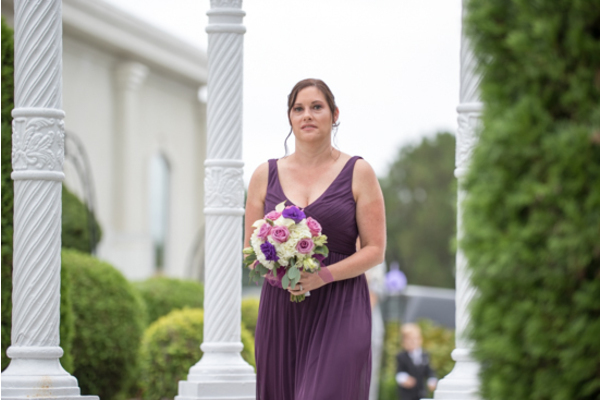 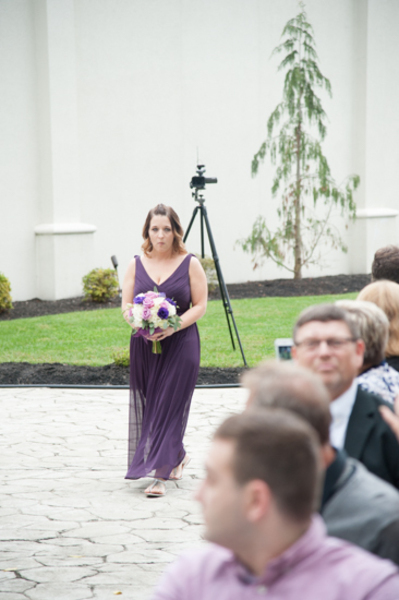 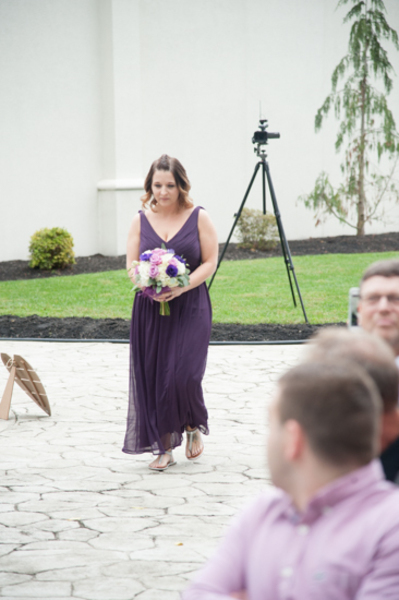 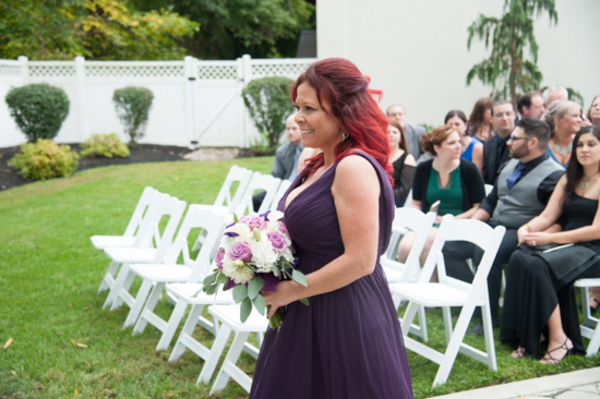 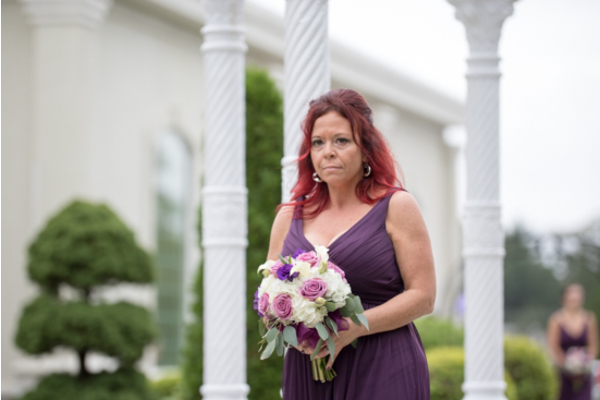 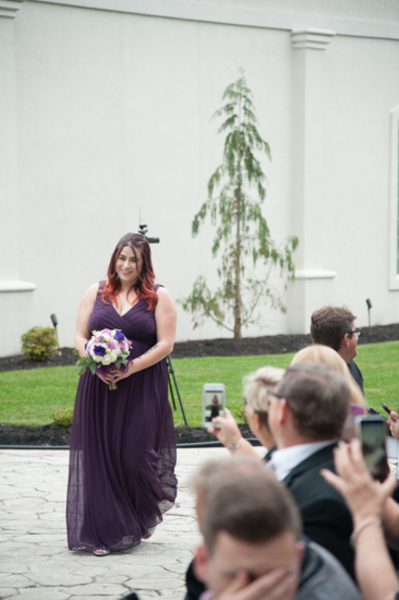 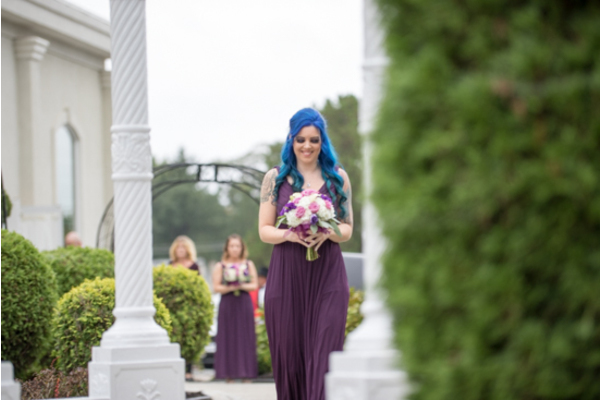 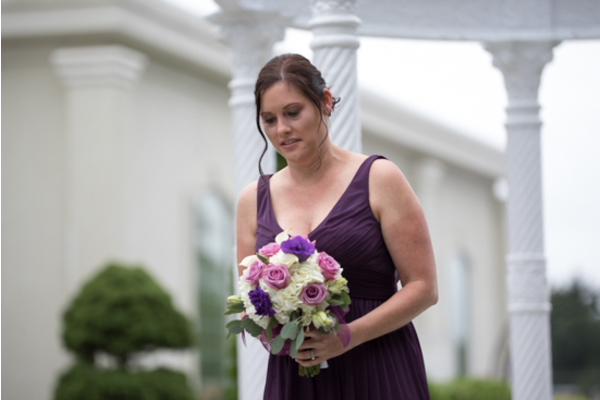 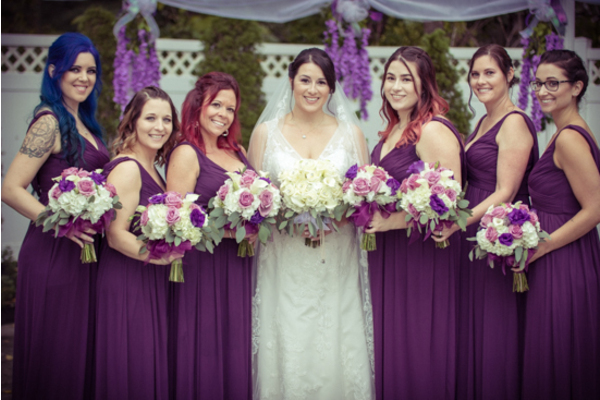 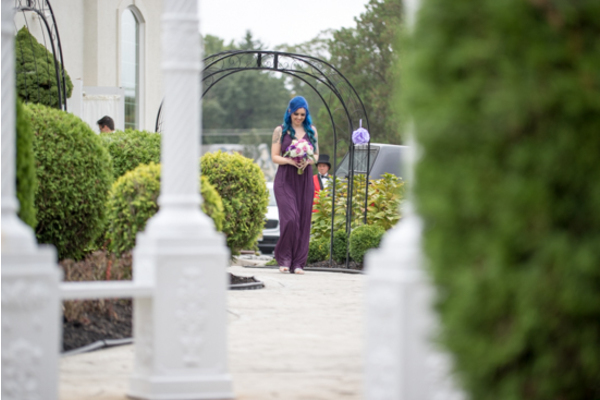 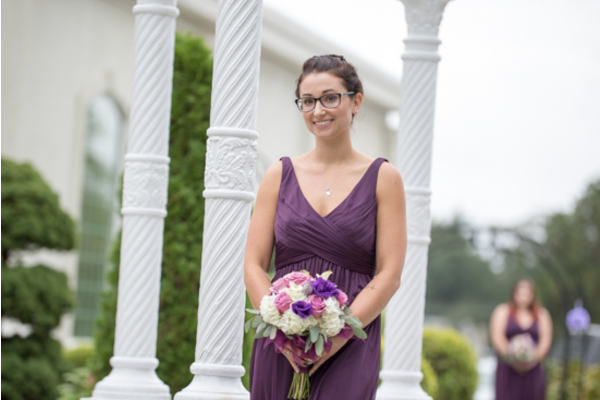 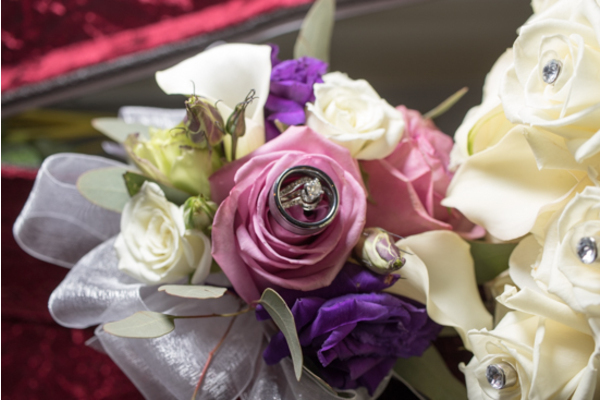 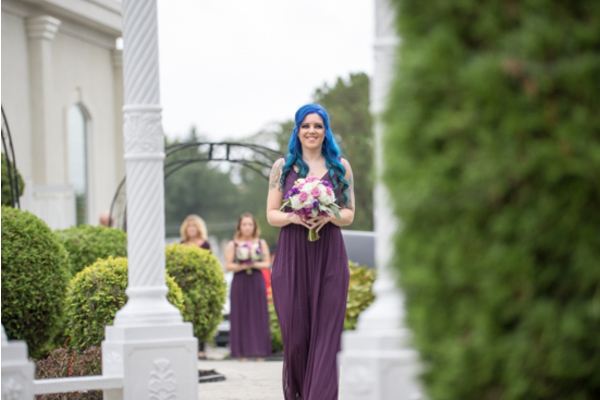 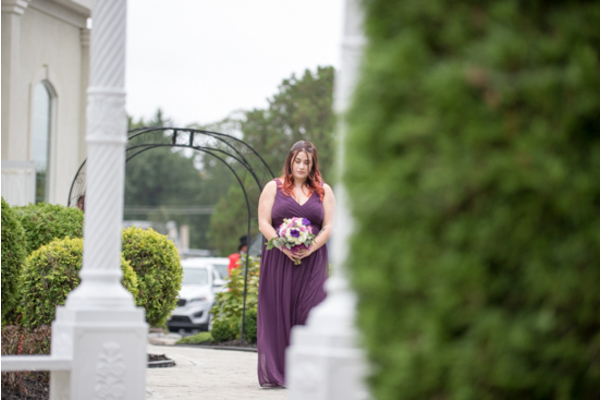 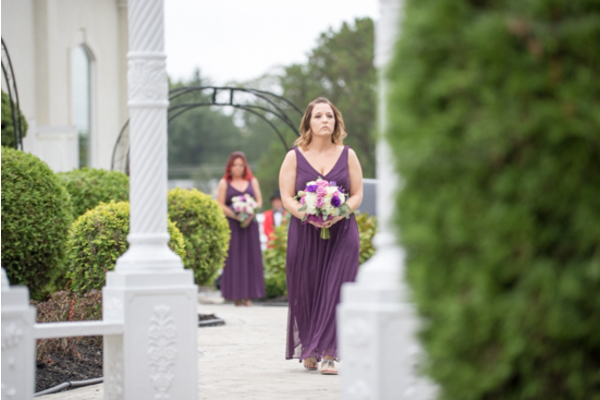 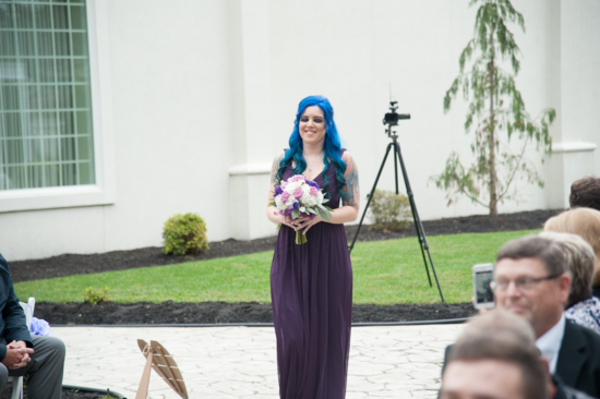 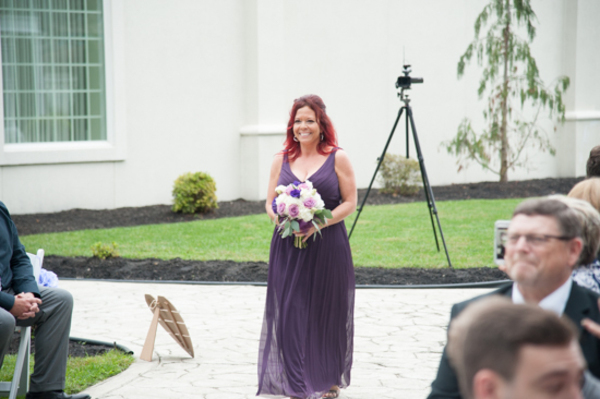 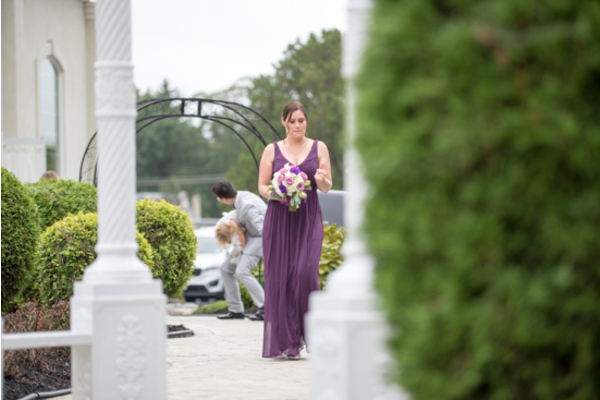 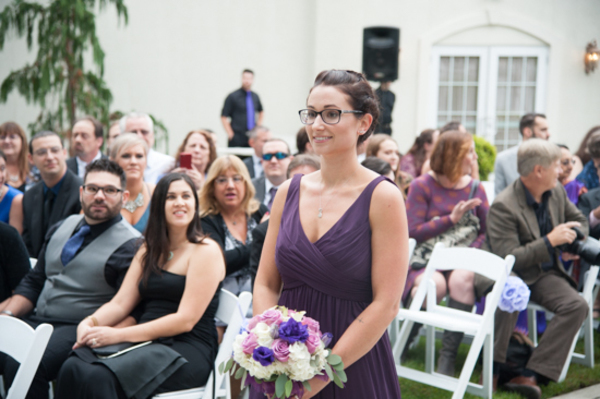 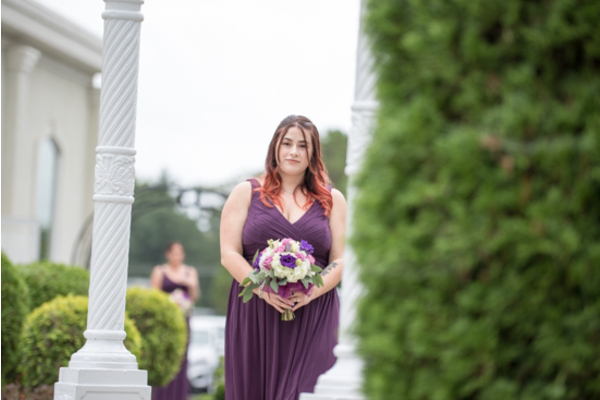 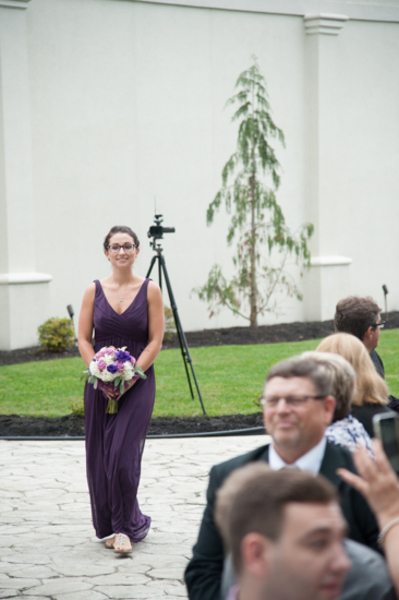 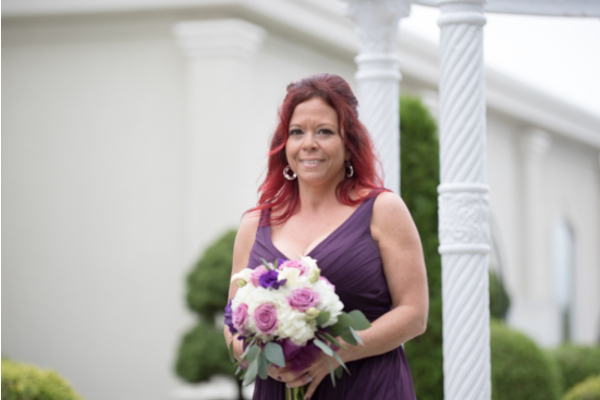 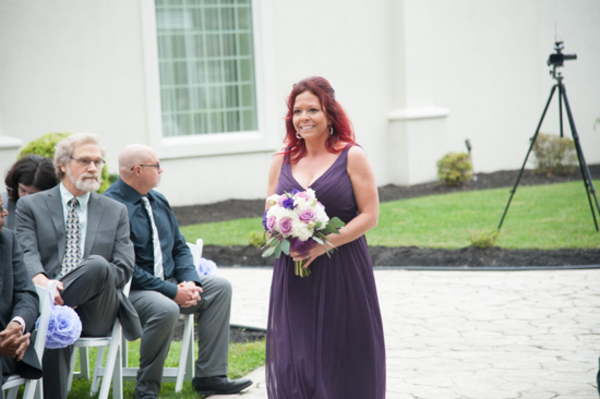 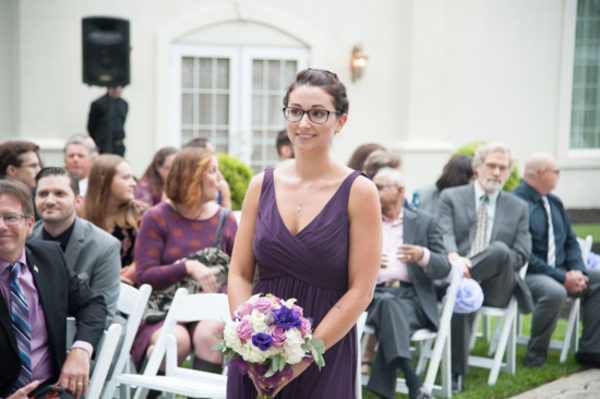 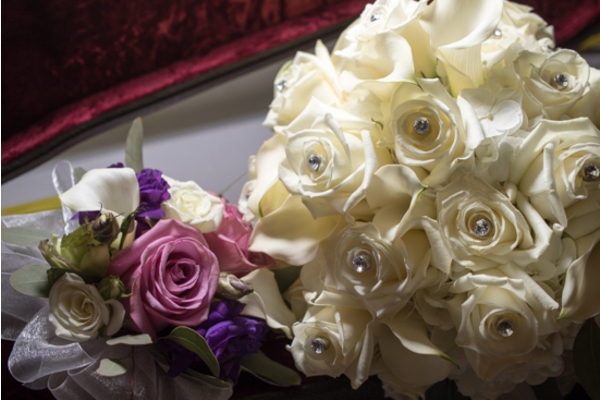 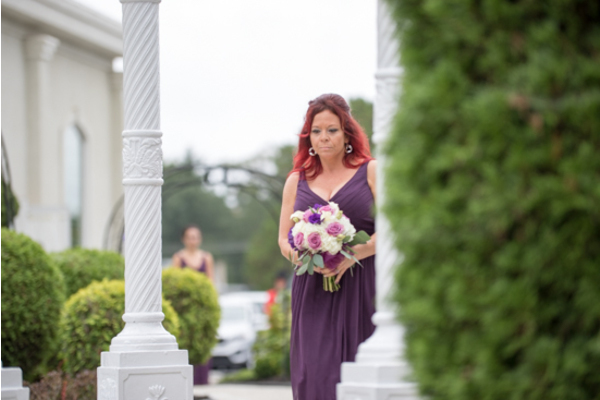 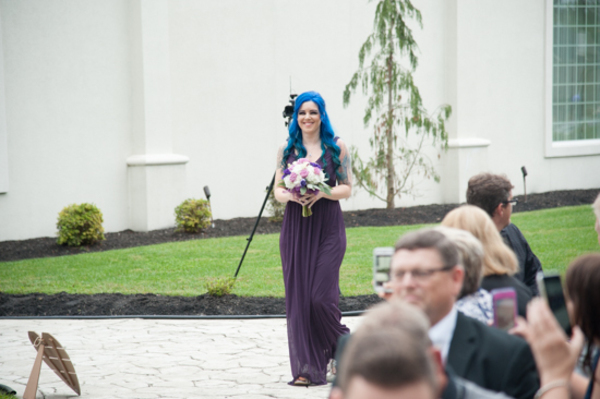 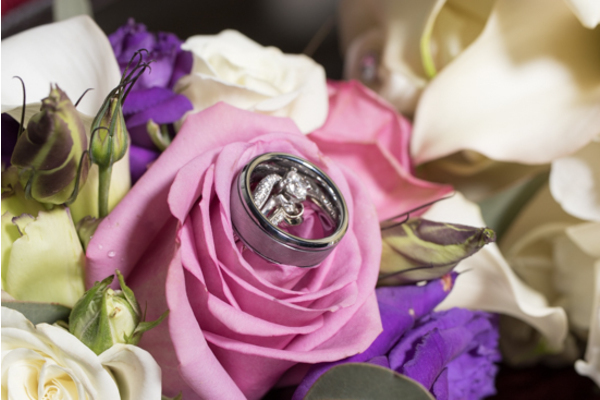 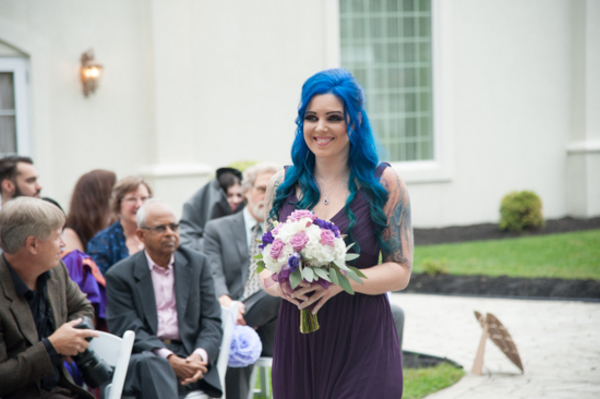 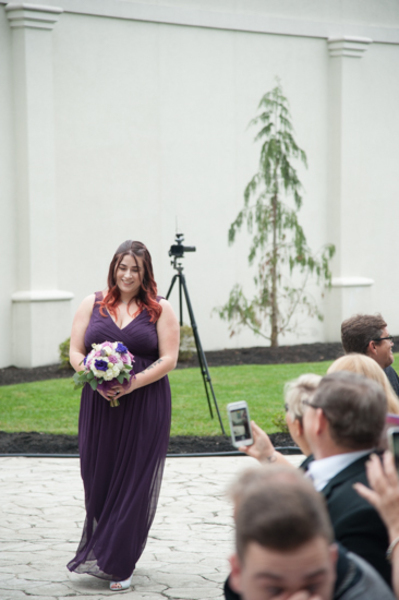 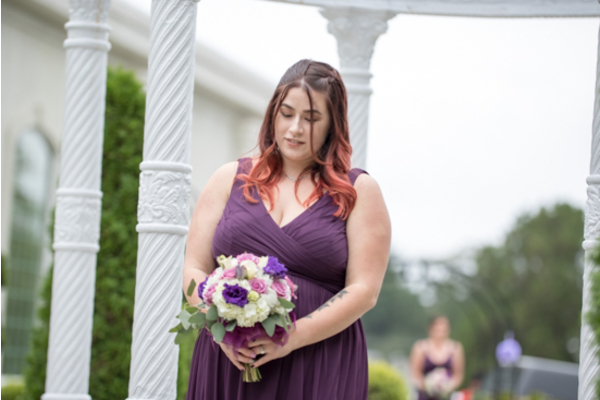 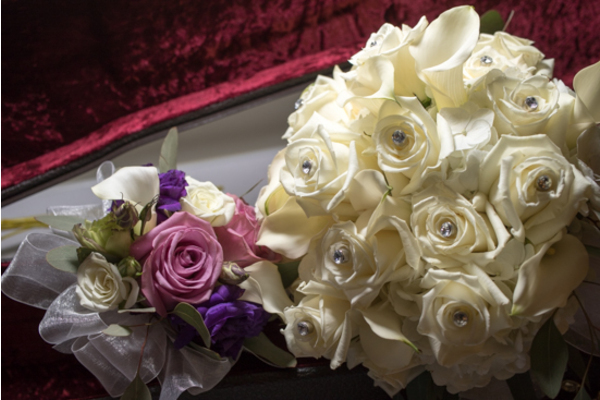 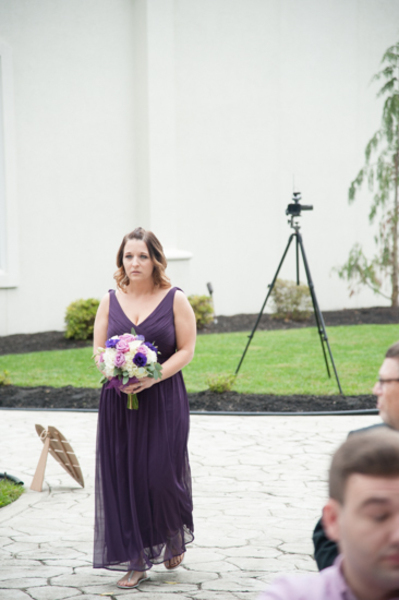 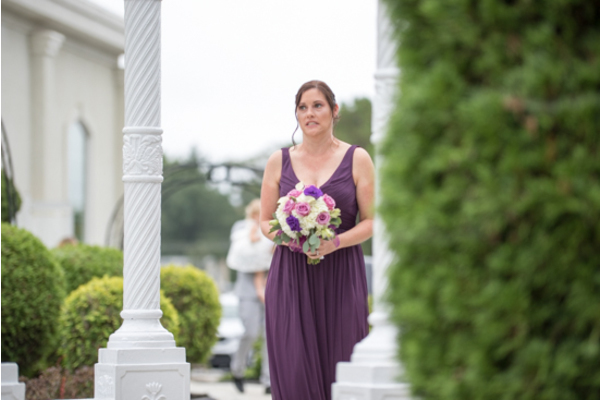 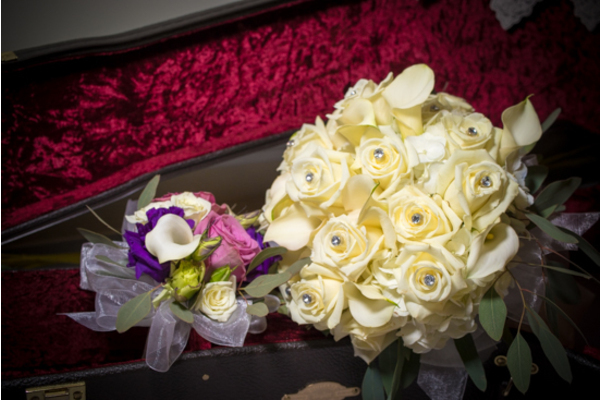 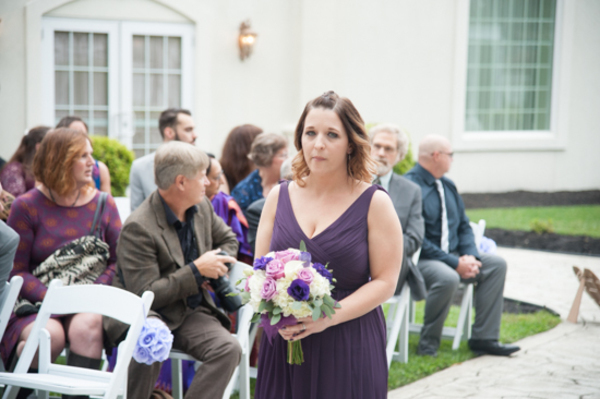 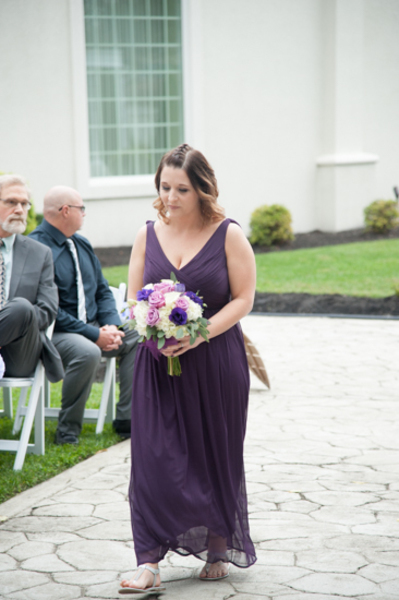 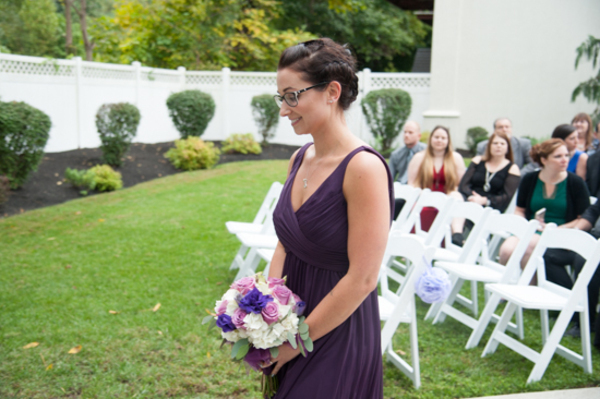 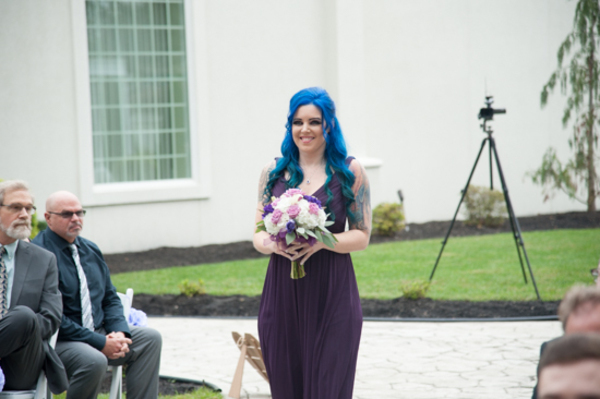 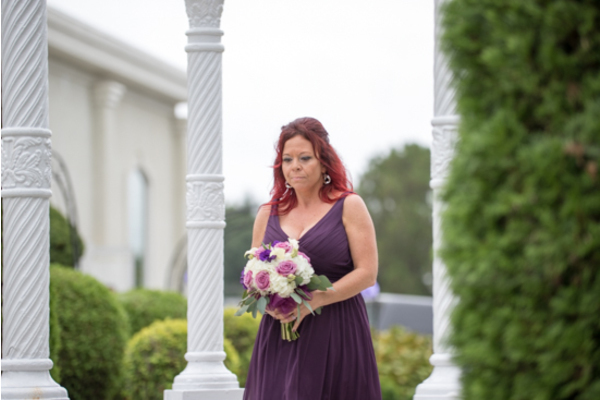 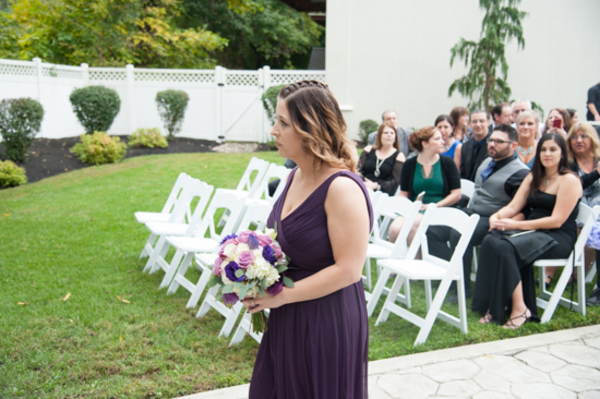 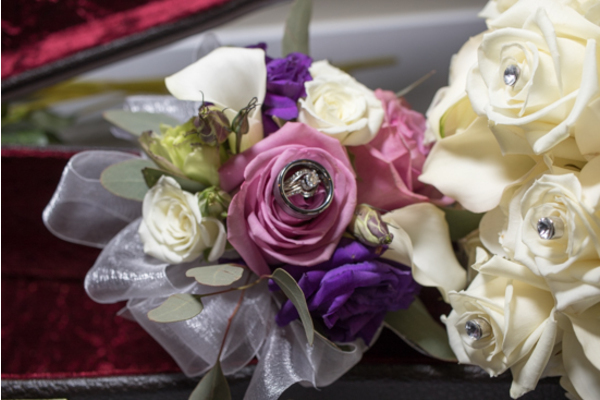 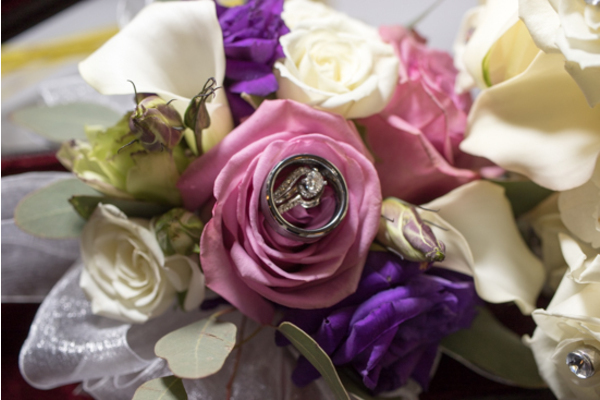 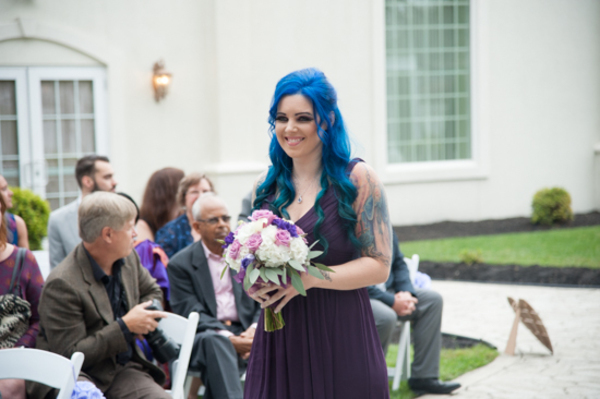 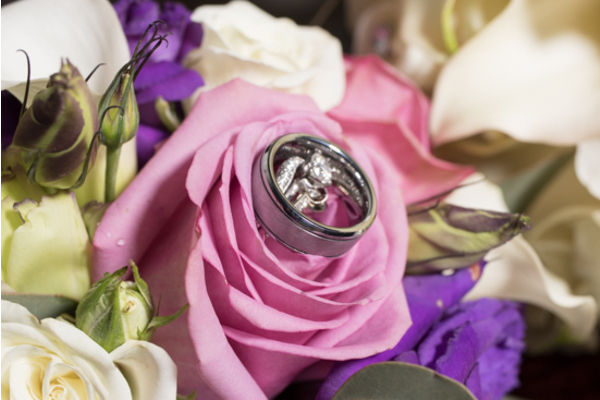 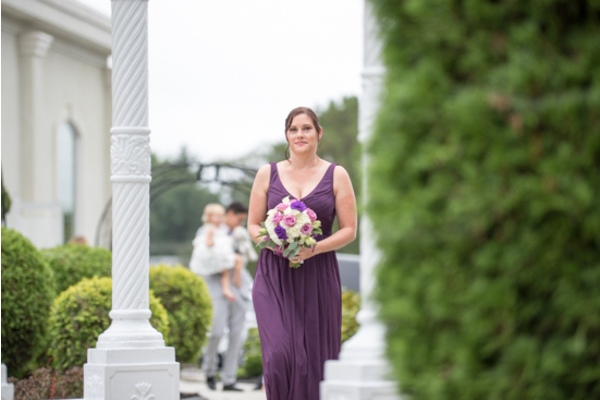 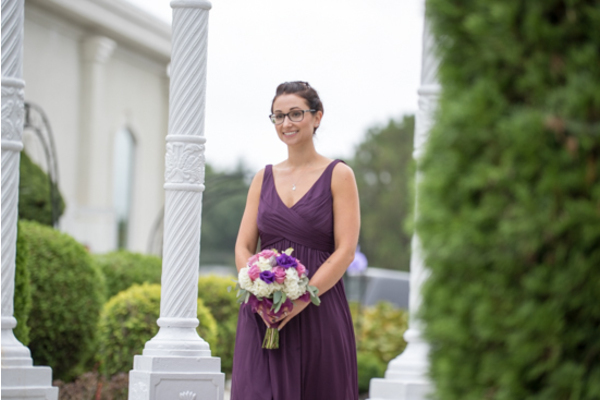 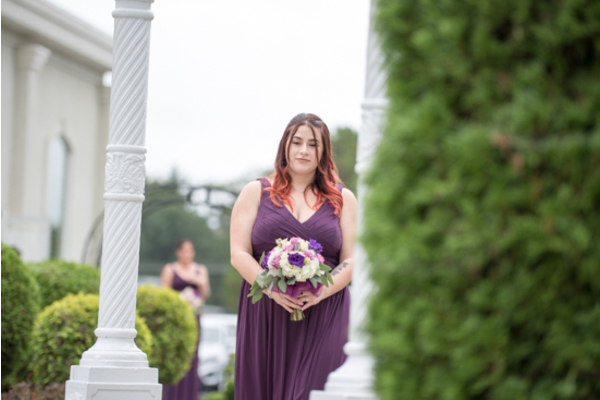 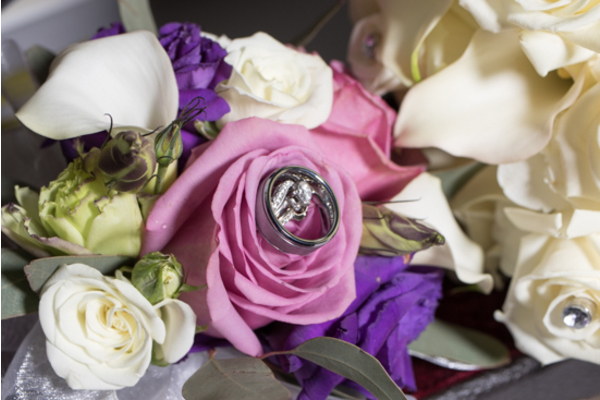 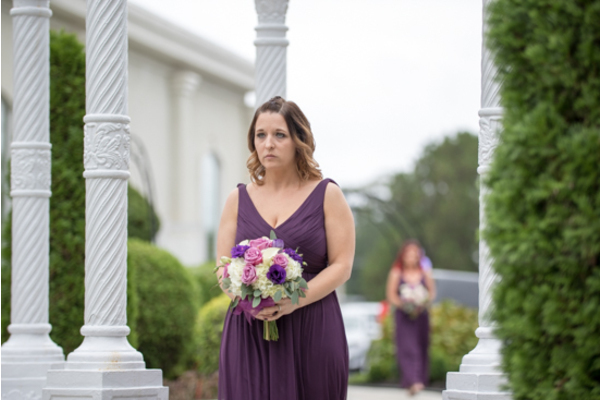 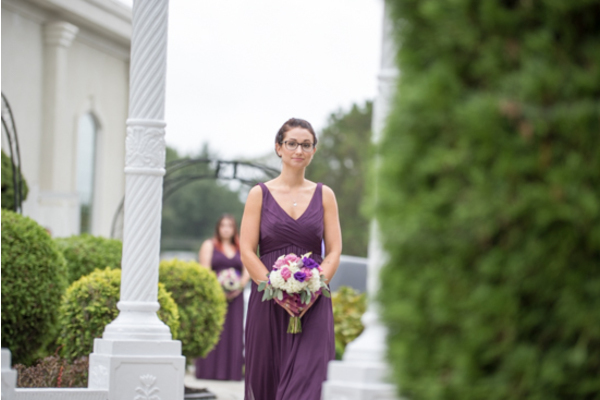 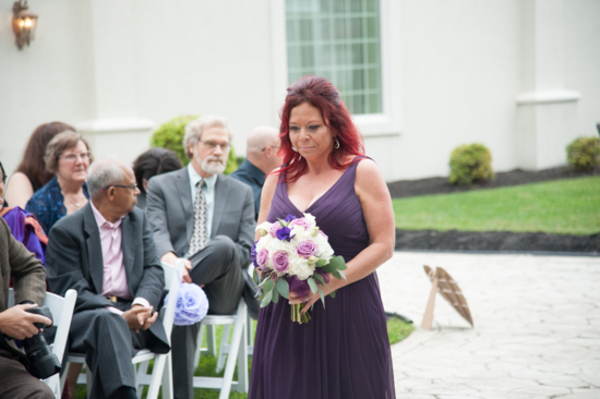 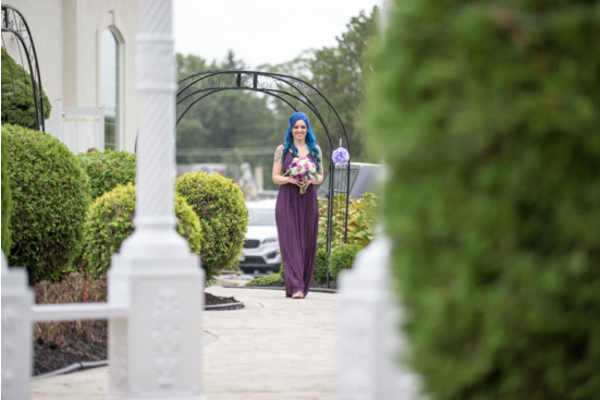 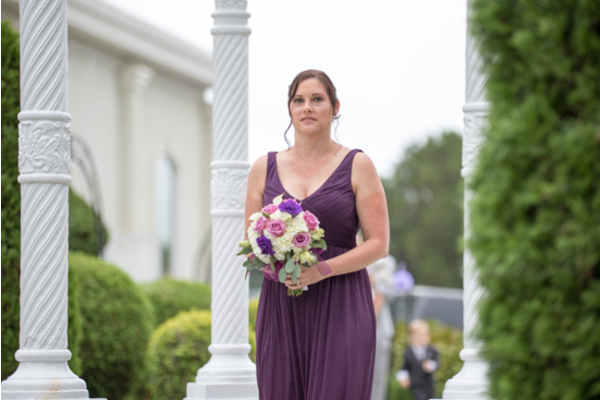 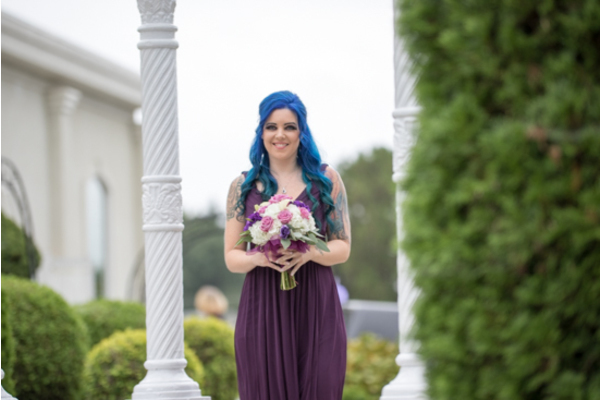 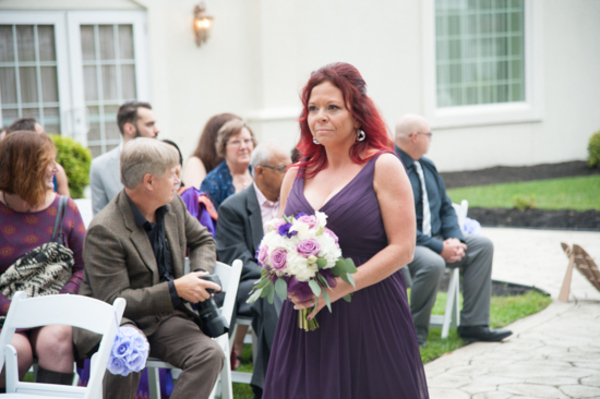 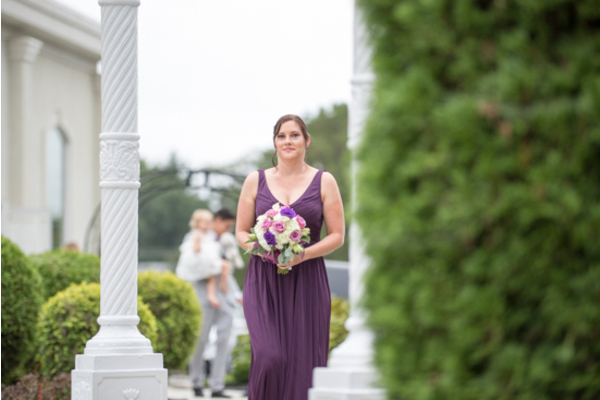 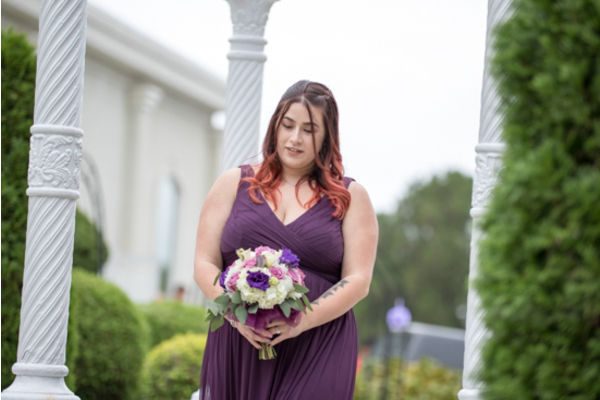 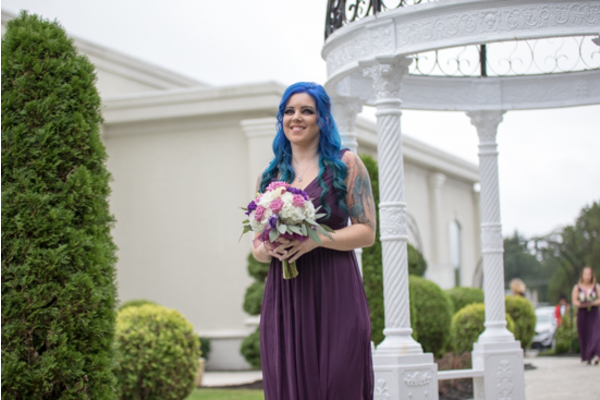 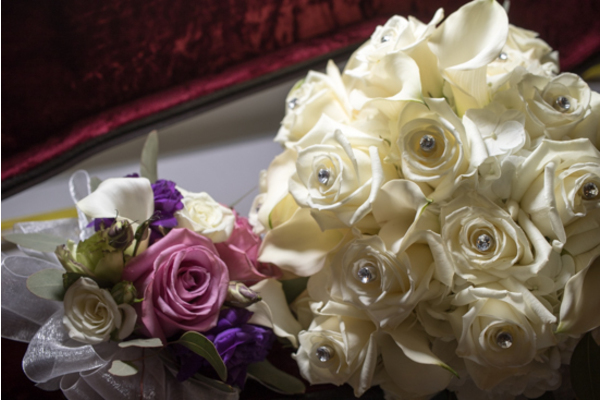 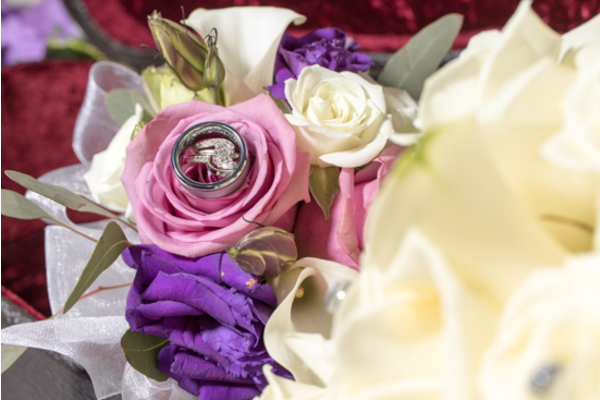 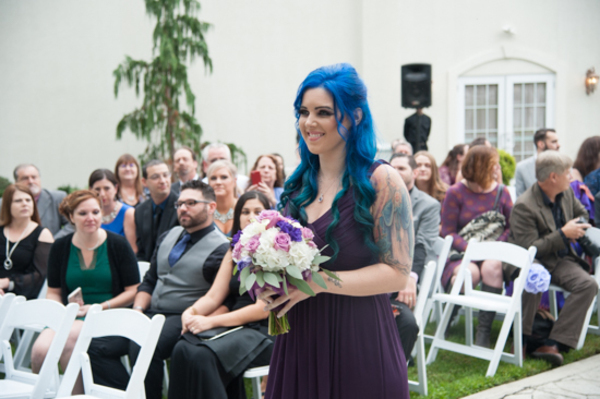 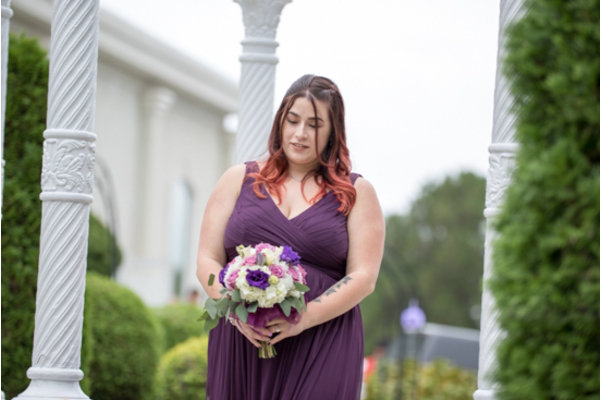 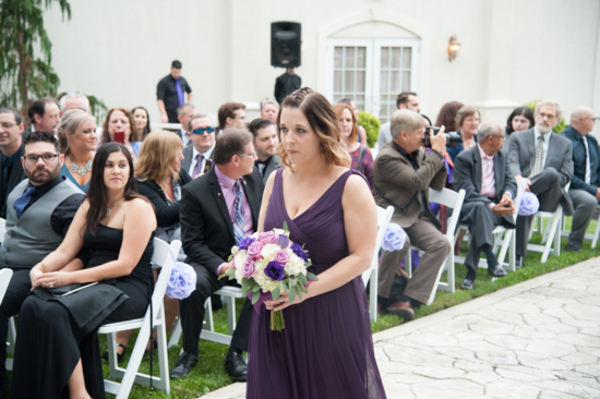 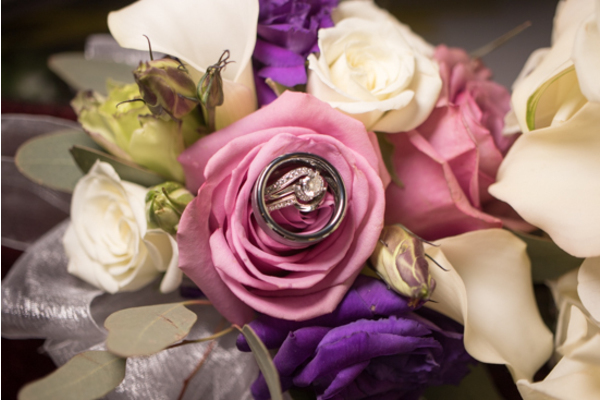 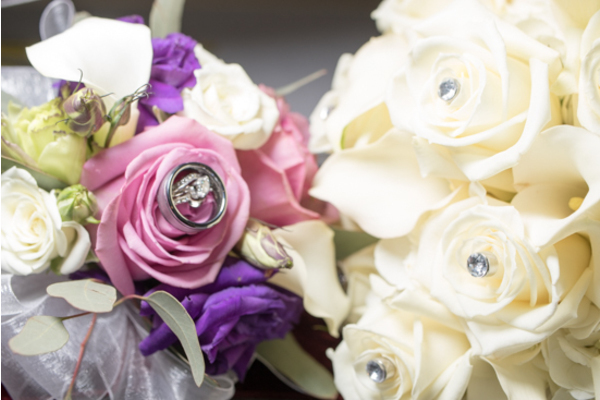 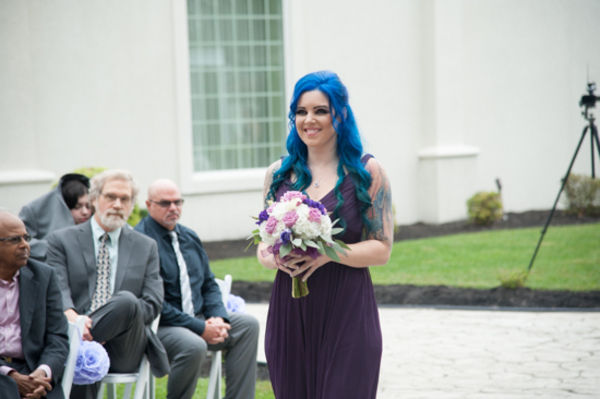 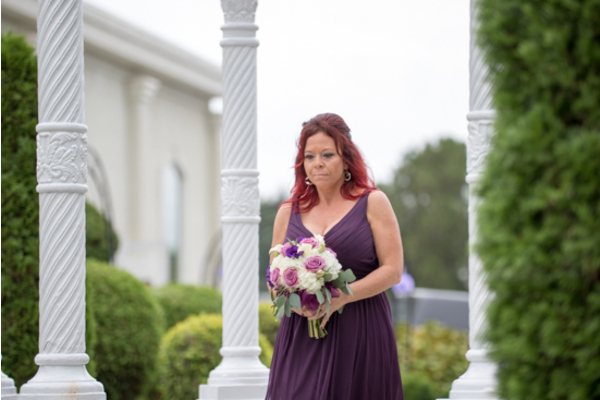 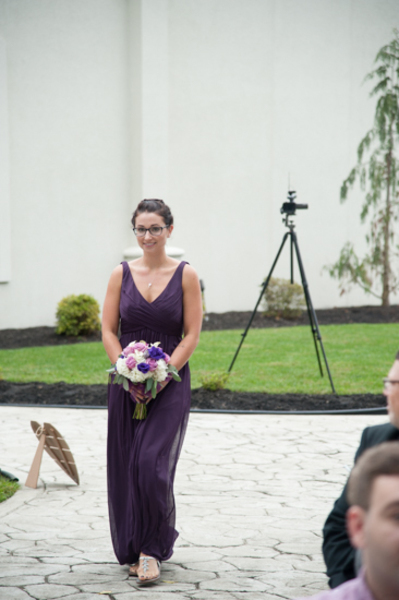 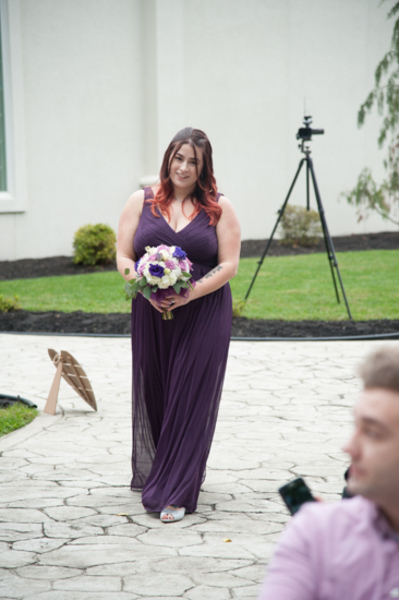 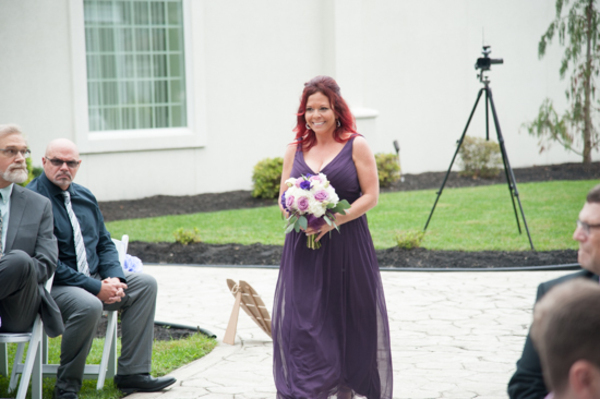 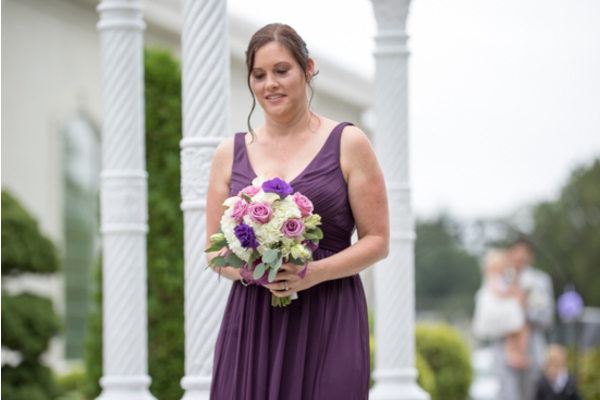 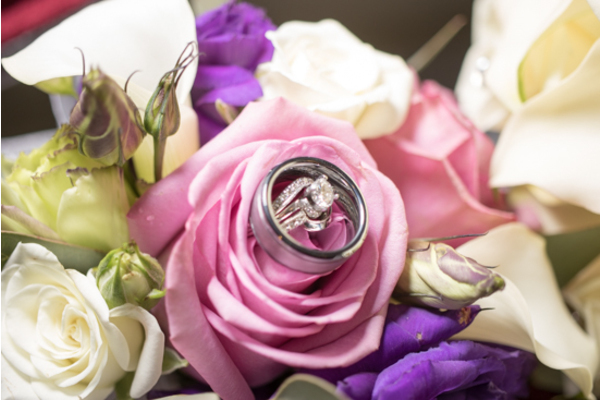 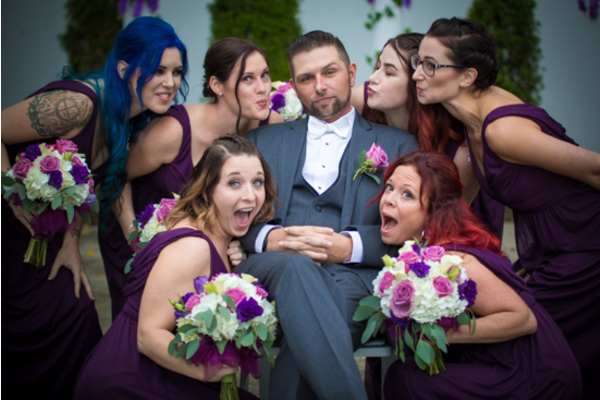 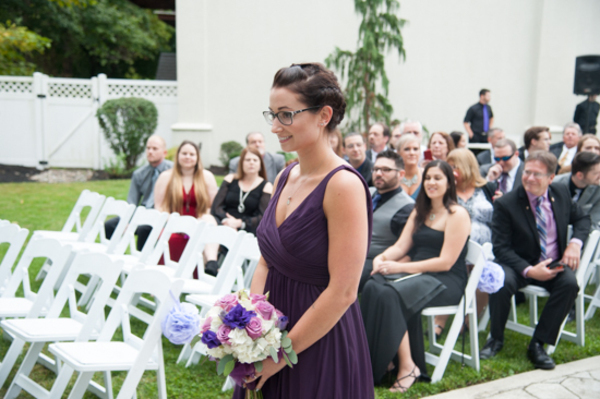 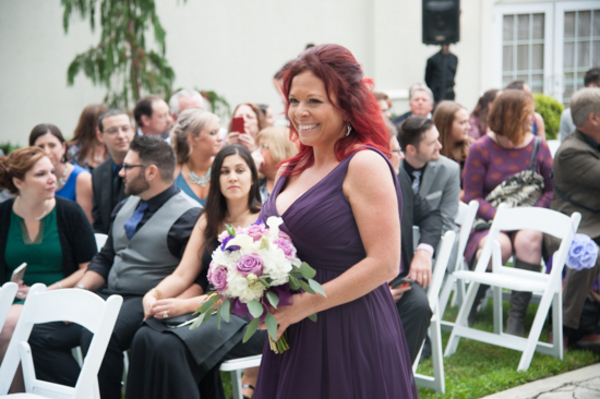 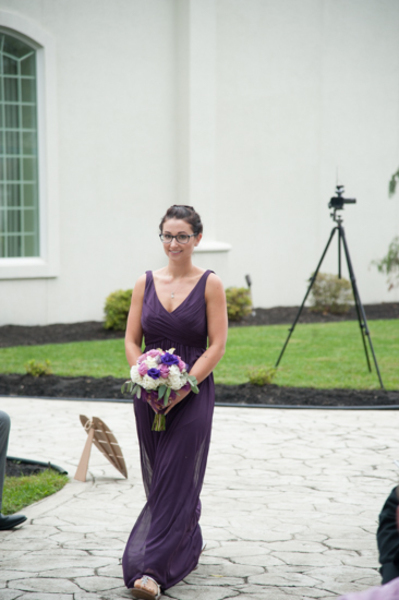 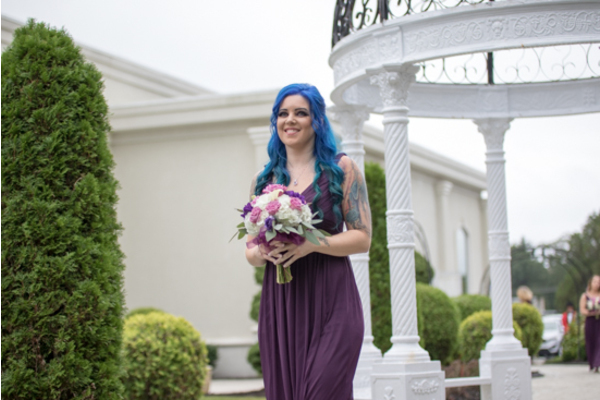 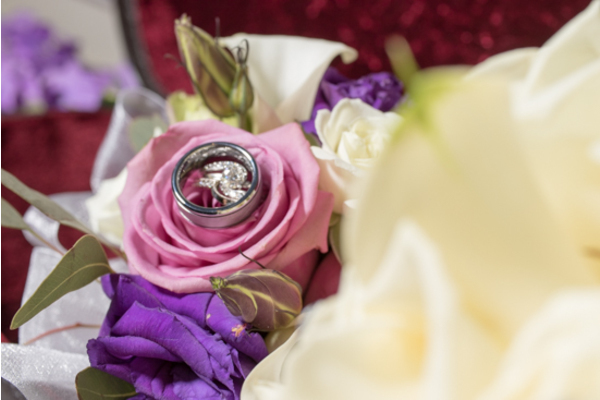 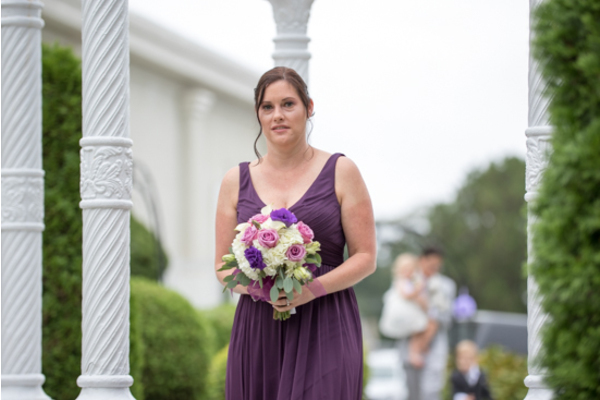 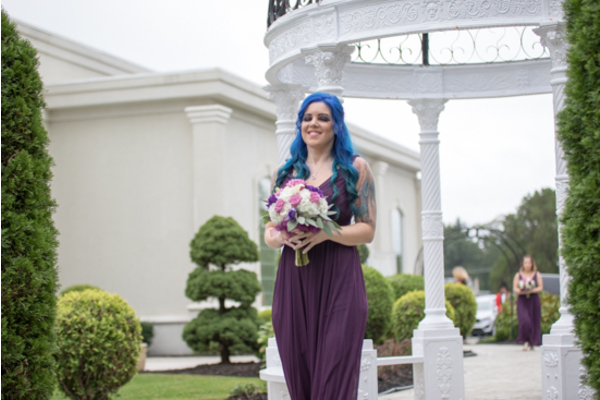 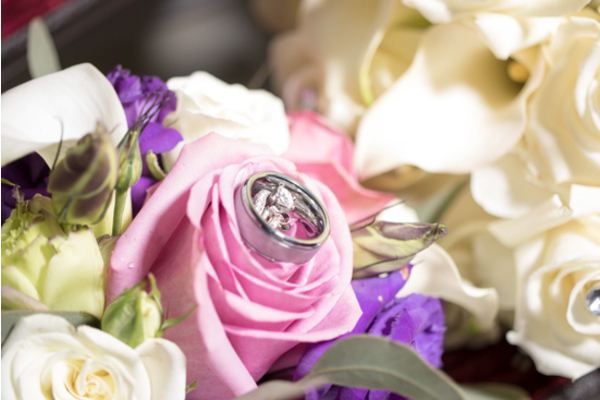 The gown paired perfectly with the shades of purple in her bouquet! 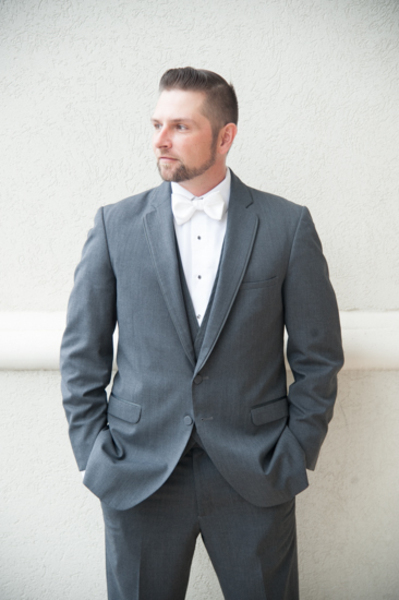 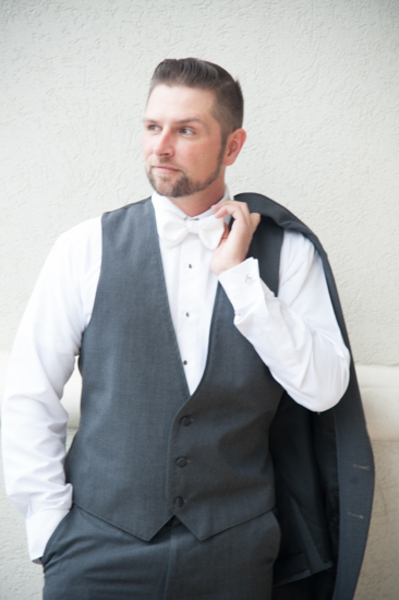 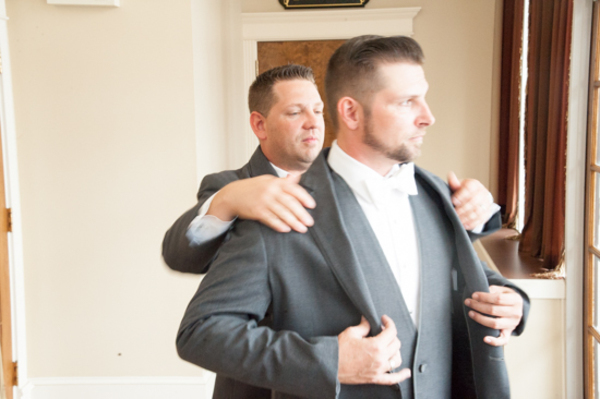 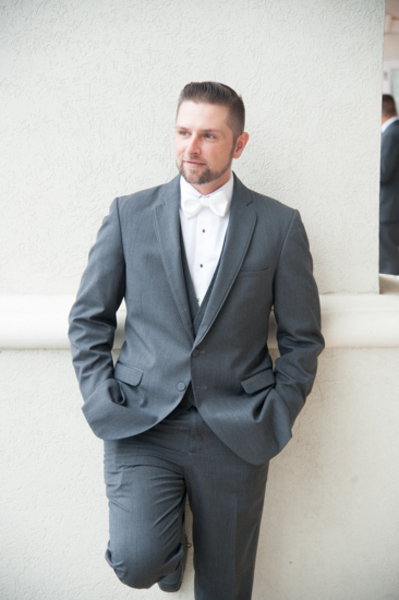 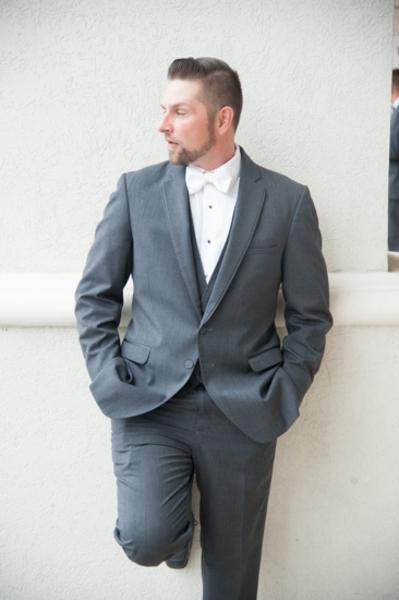 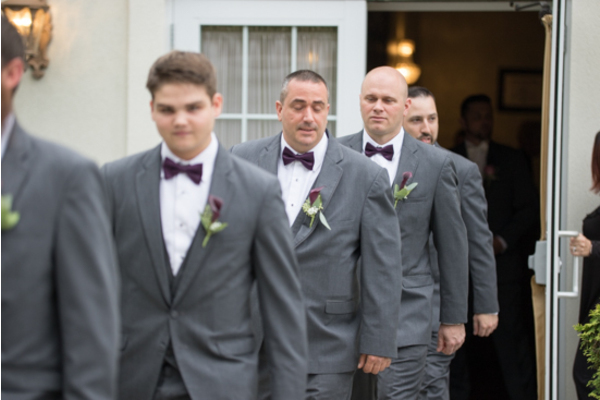 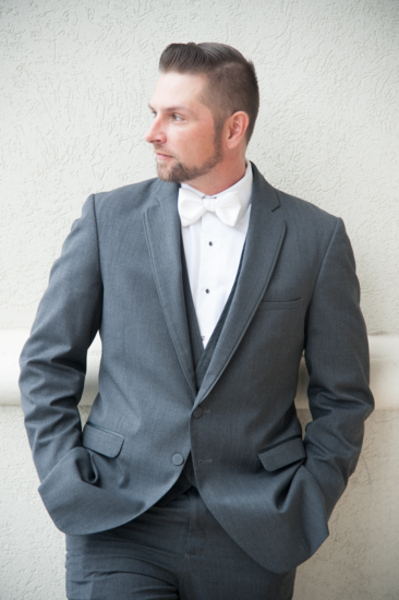 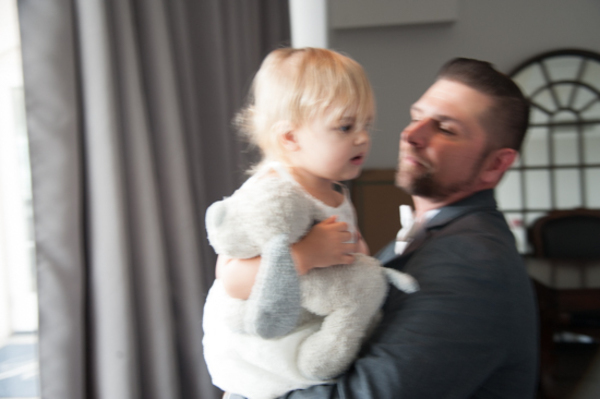 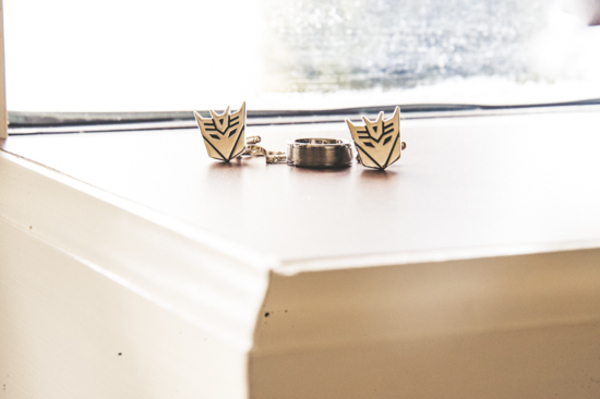 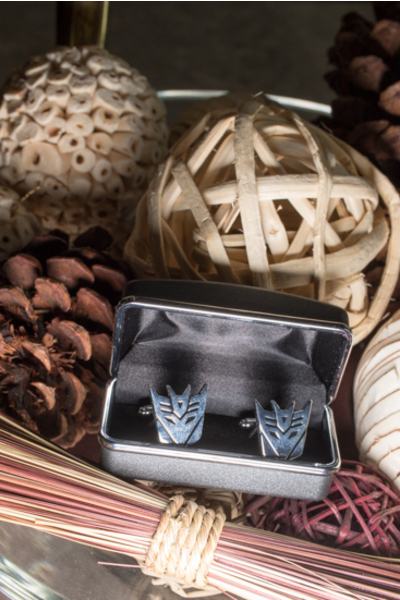 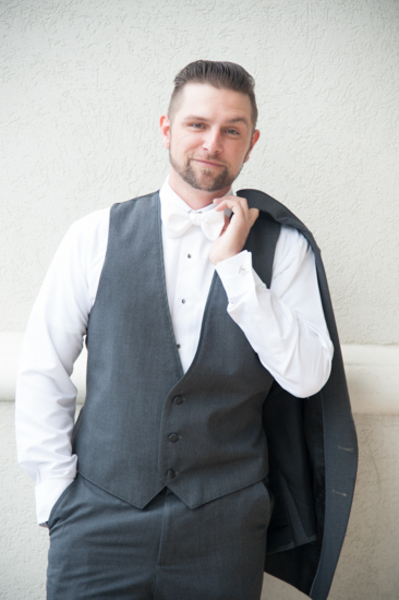 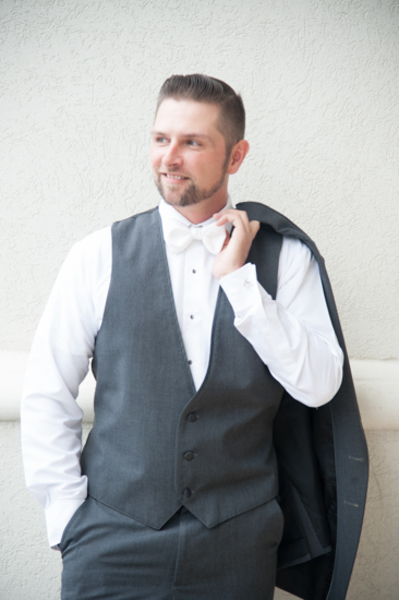 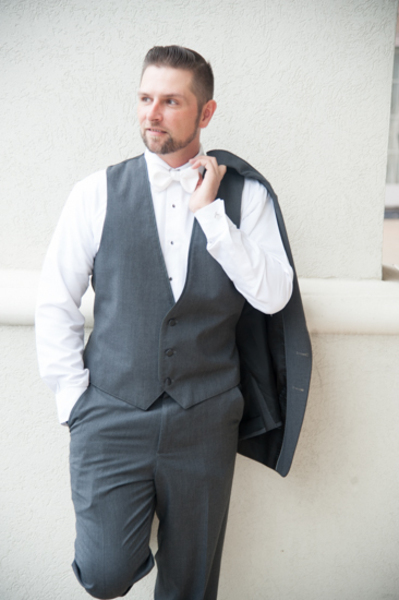 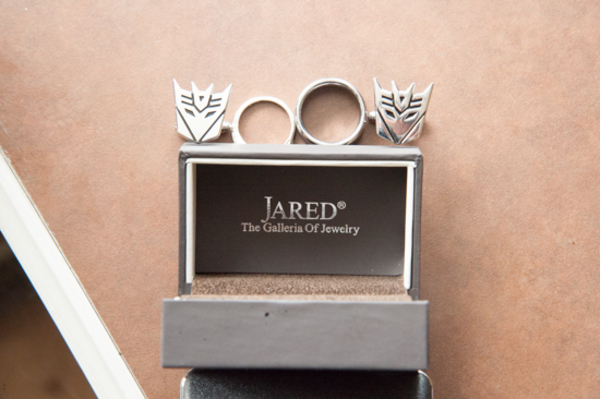 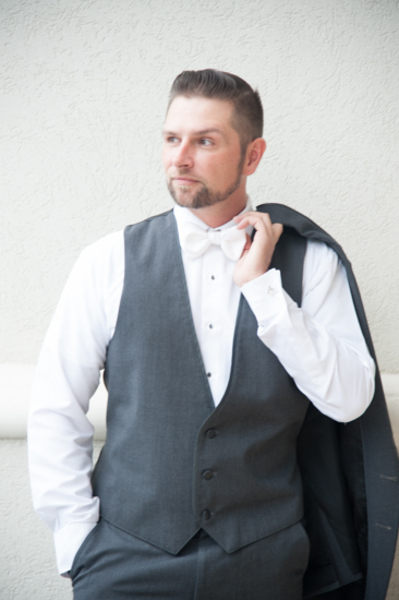 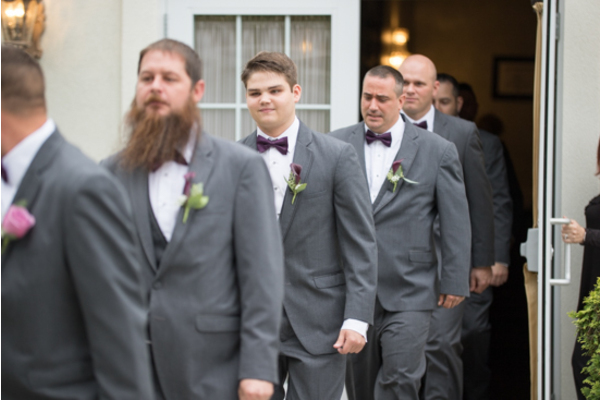 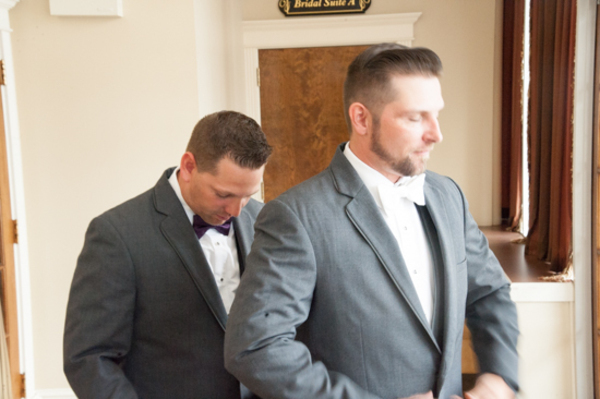 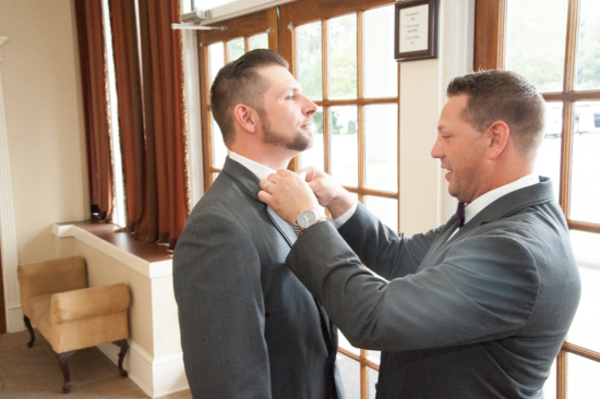 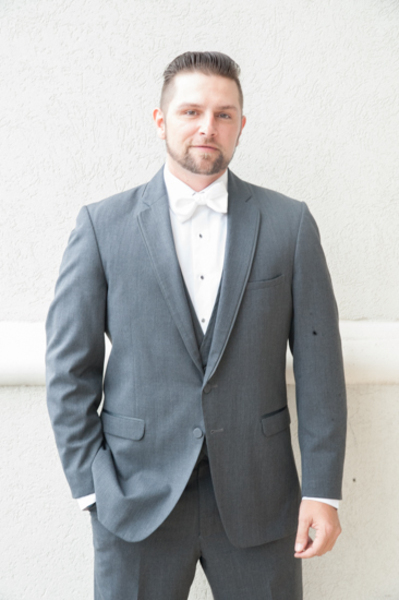 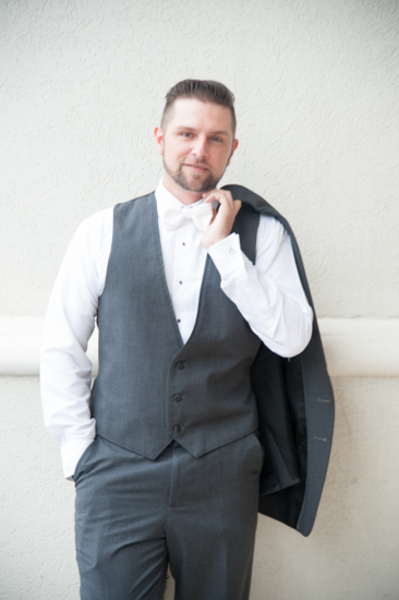 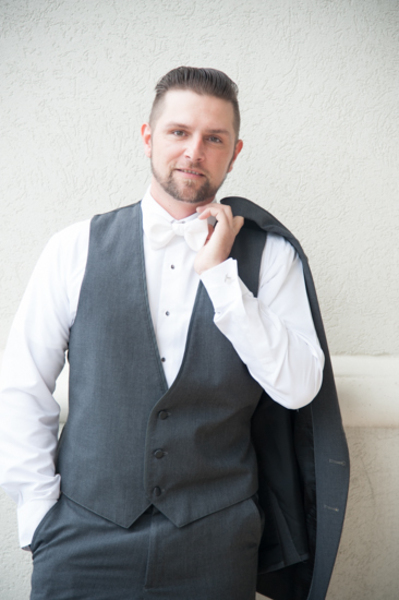 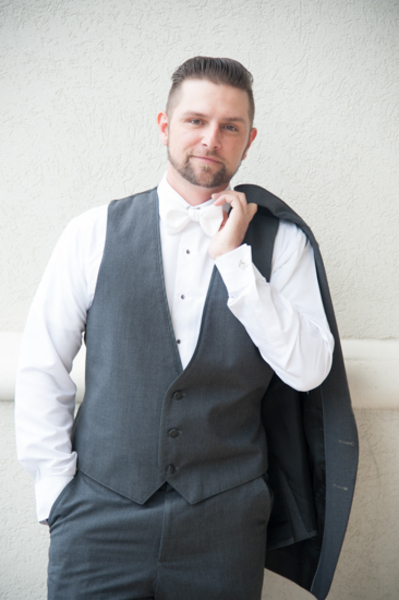 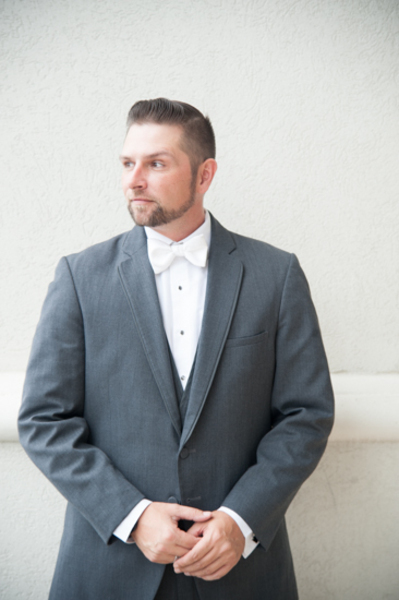 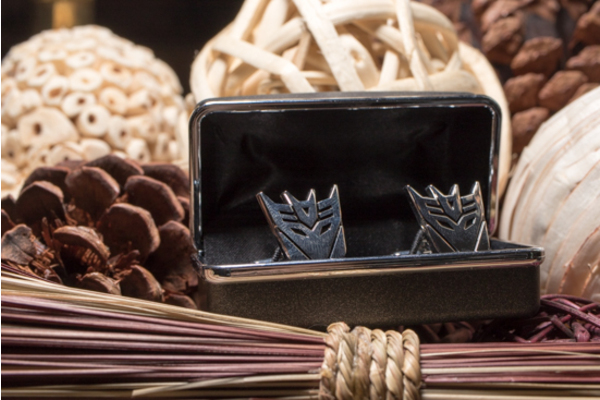 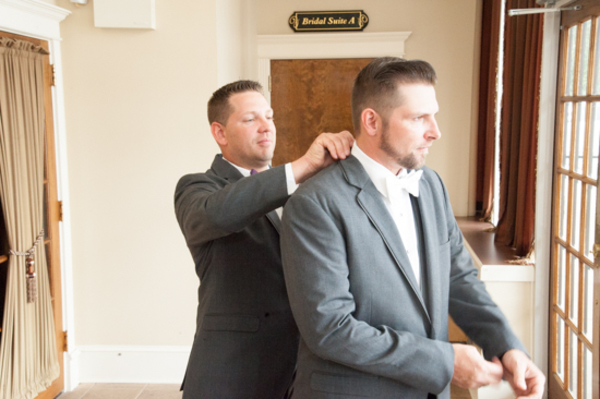 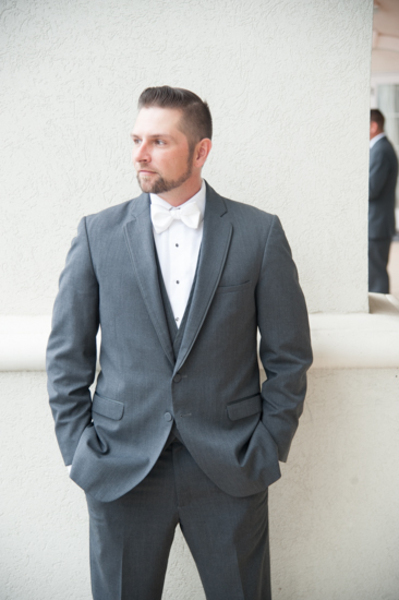 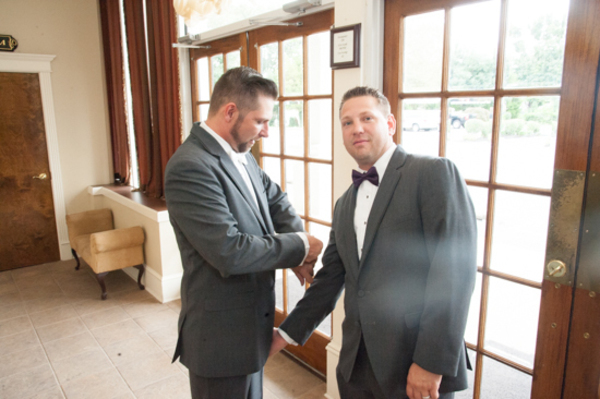 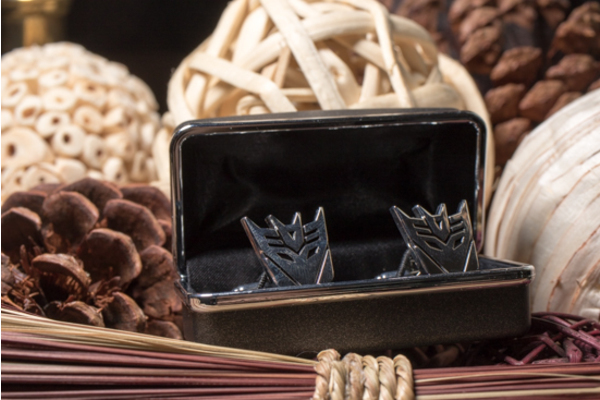 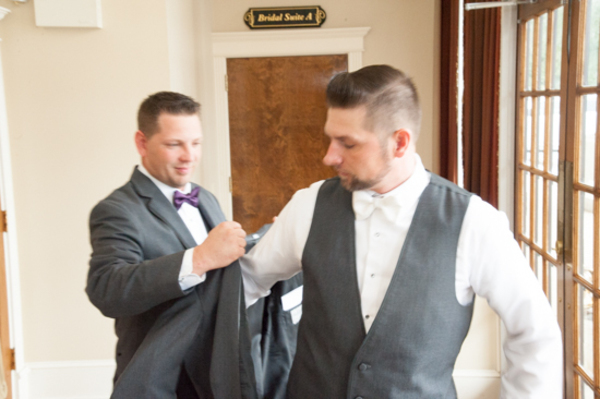 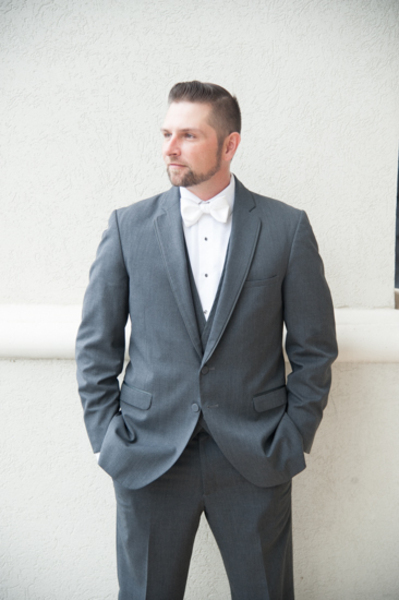 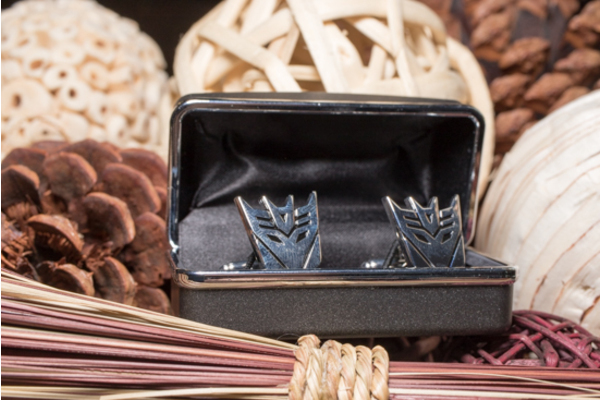 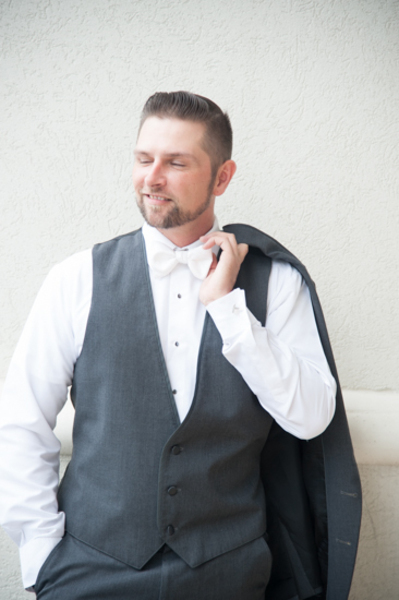 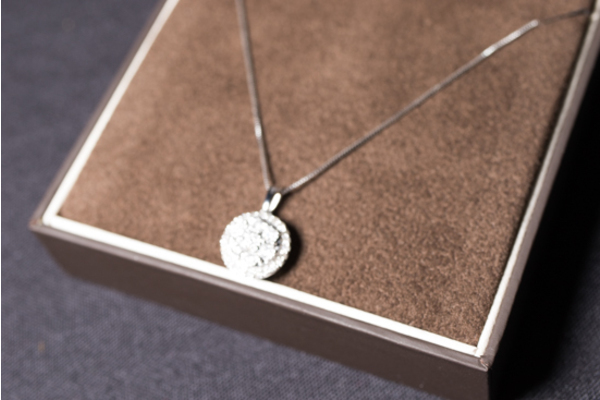 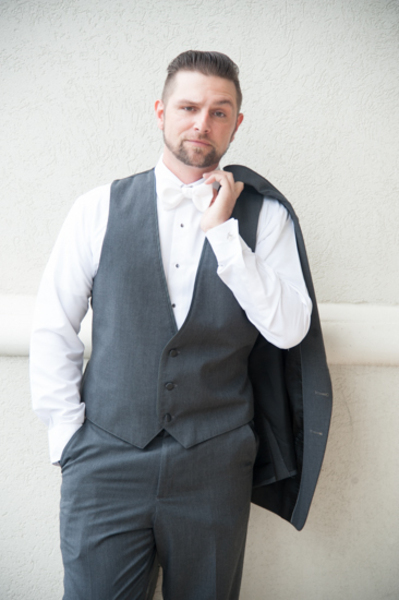 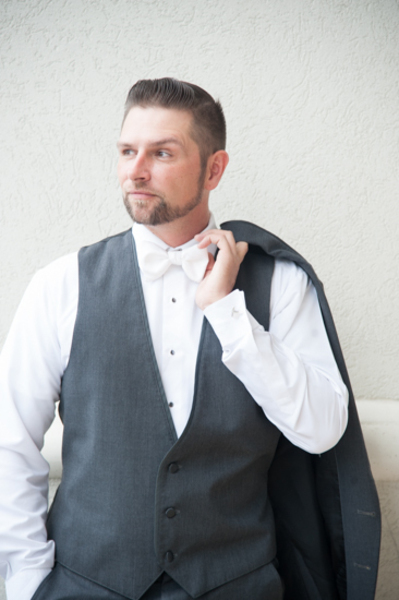 In the meantime, David put on his bow tie and gray suit in preparation for his big day ahead of him. 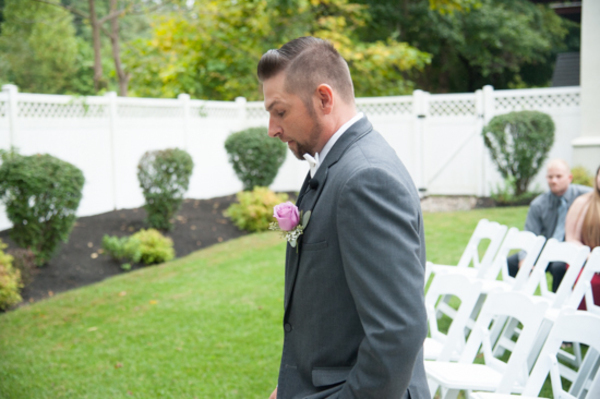 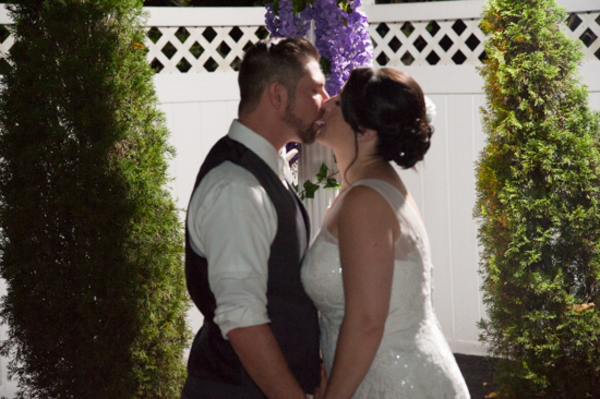 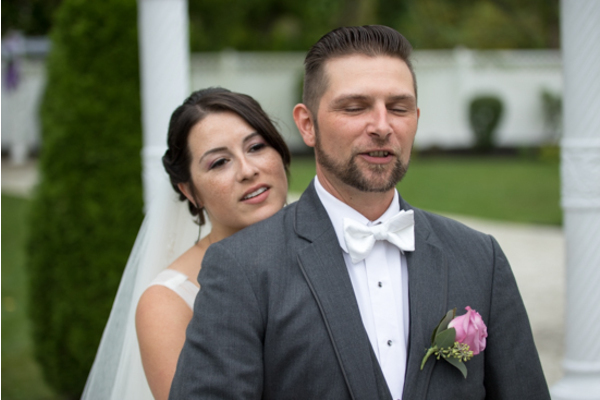 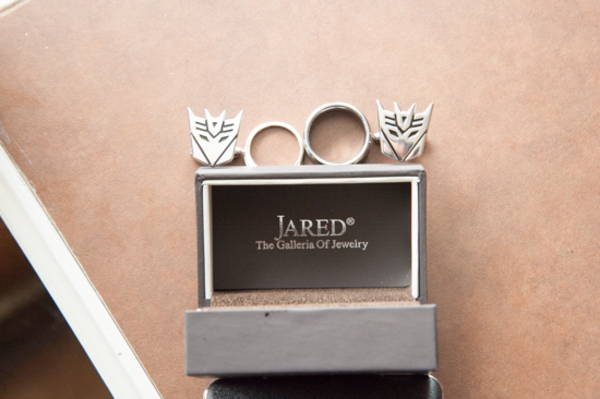 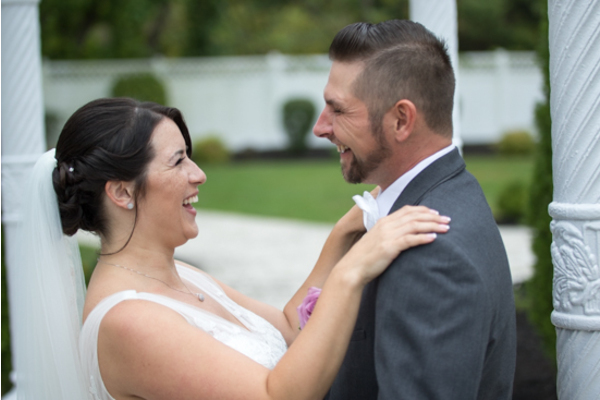 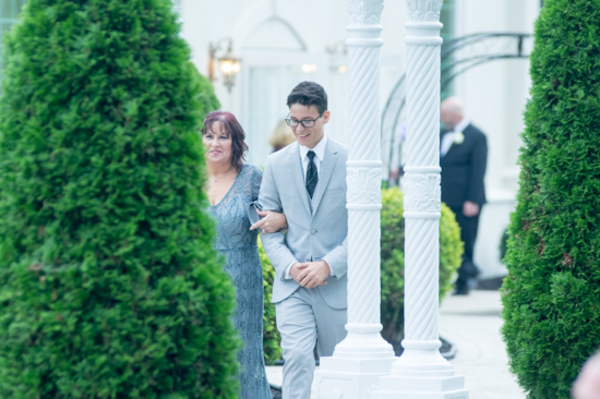 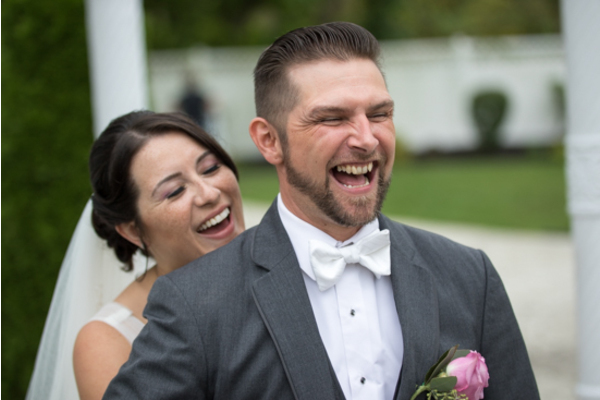 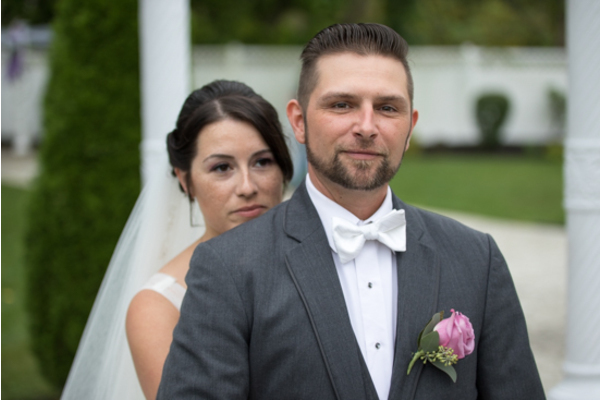 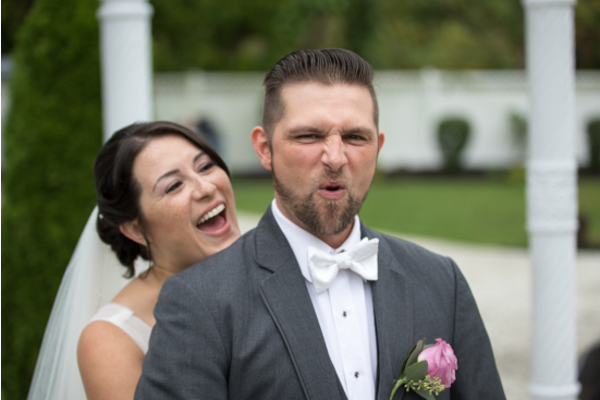 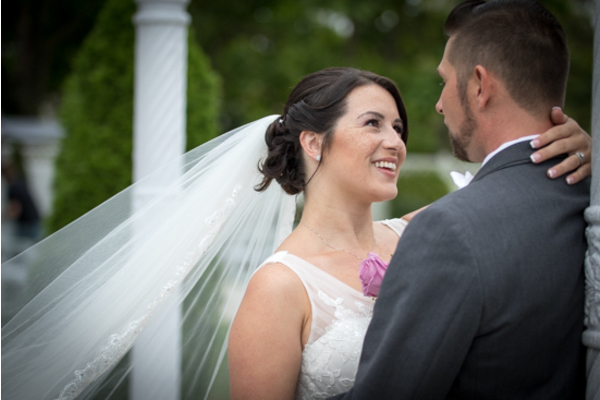 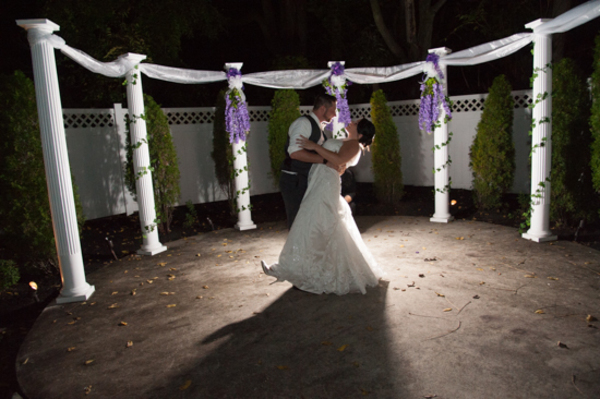 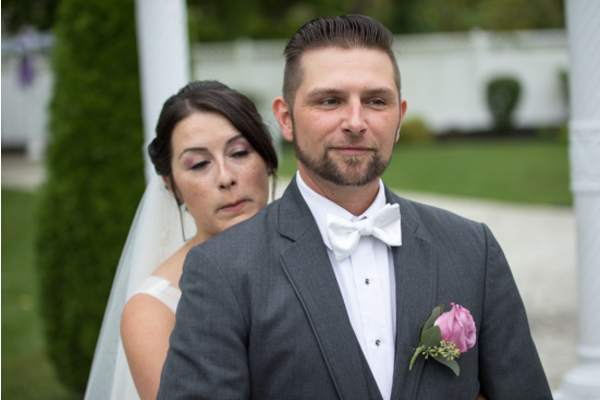 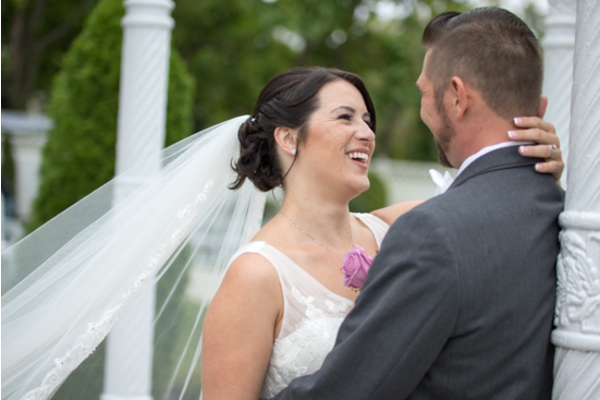 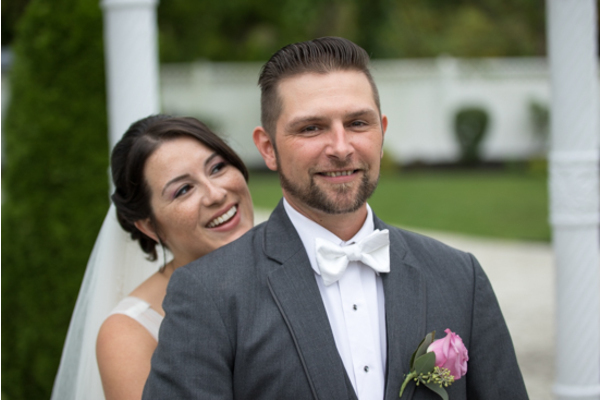 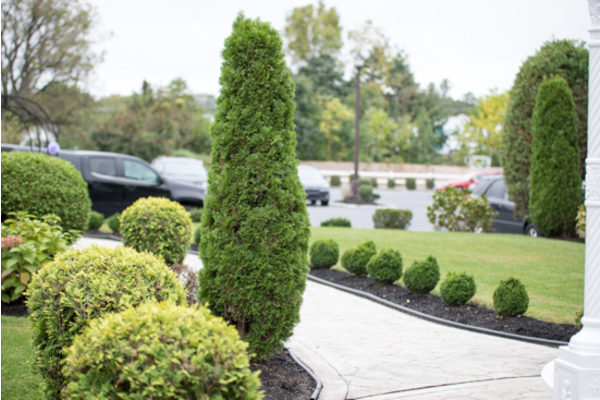 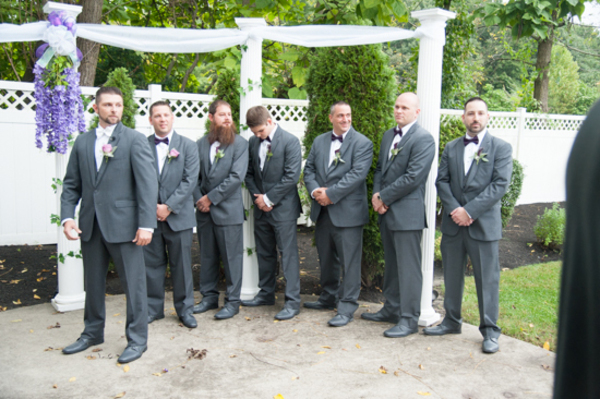 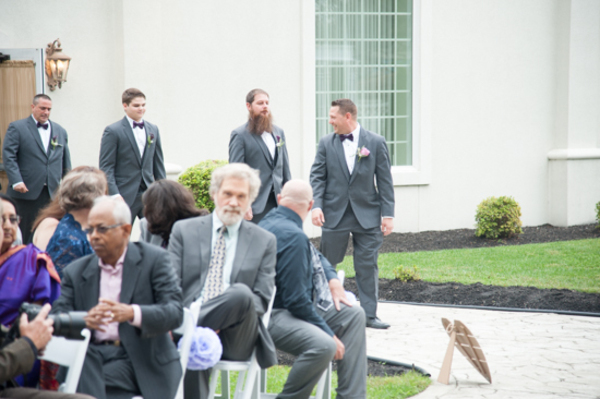 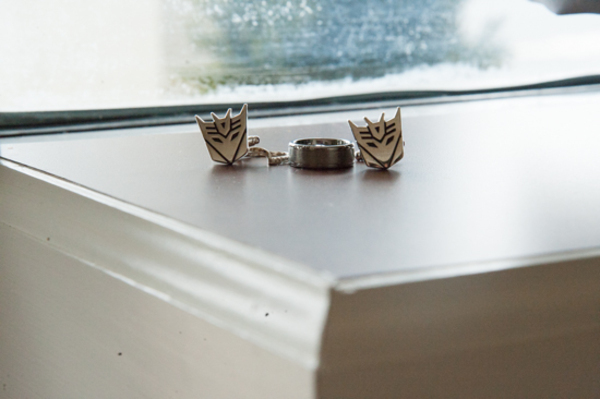 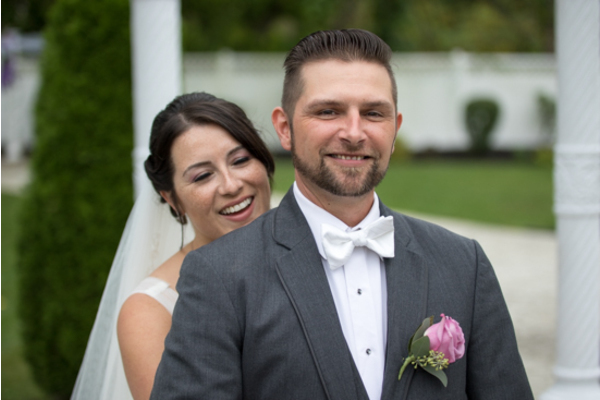 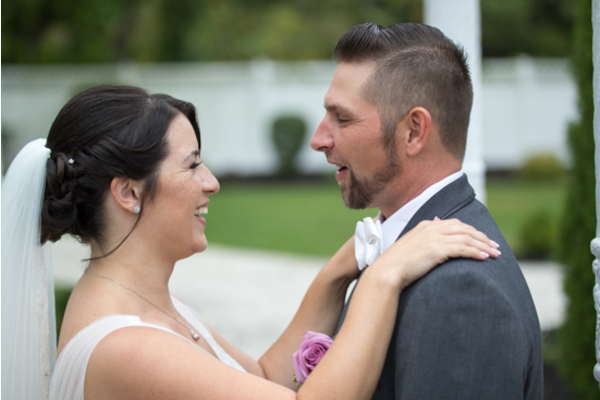 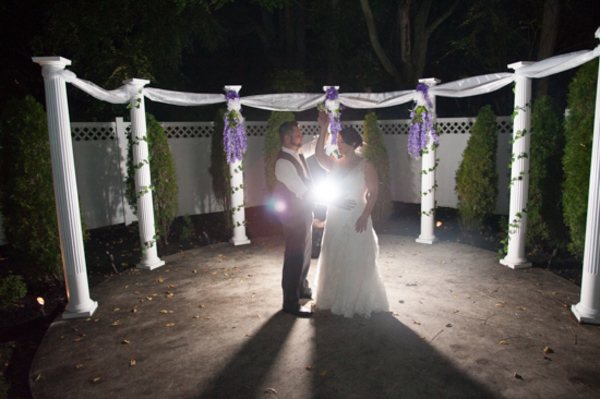 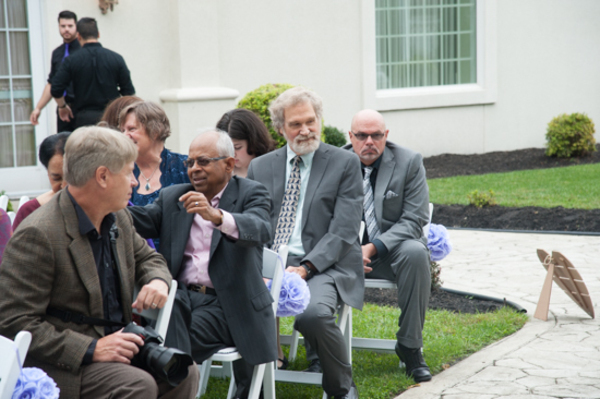 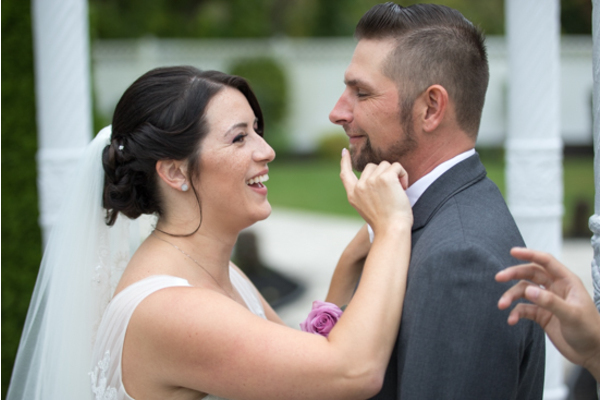 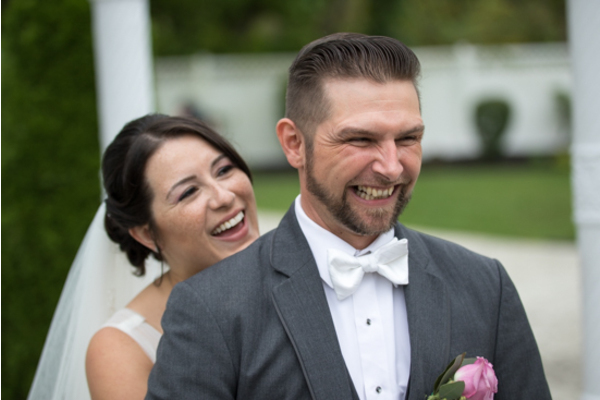 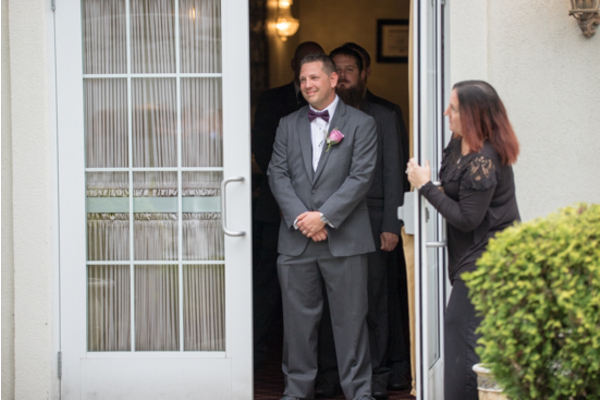 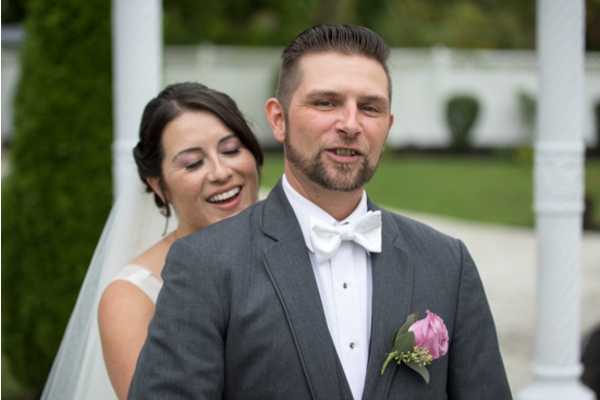 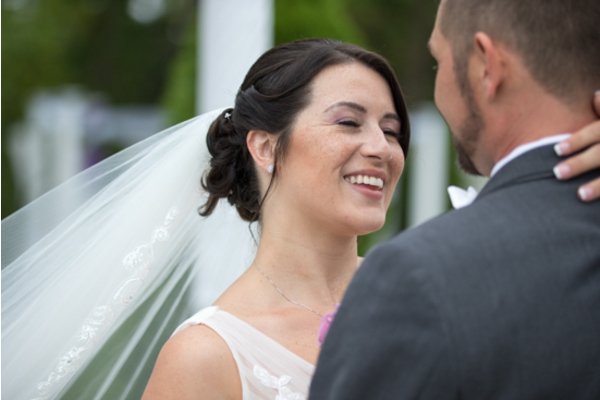 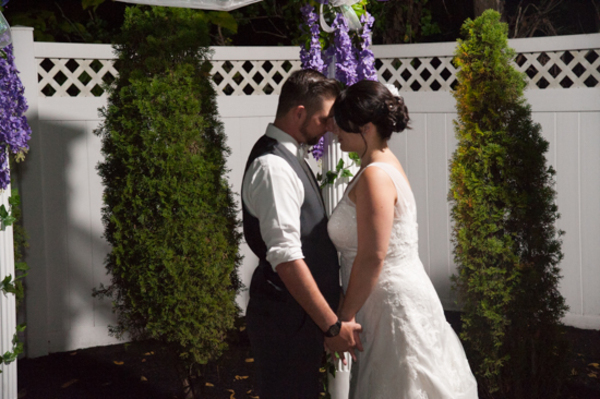 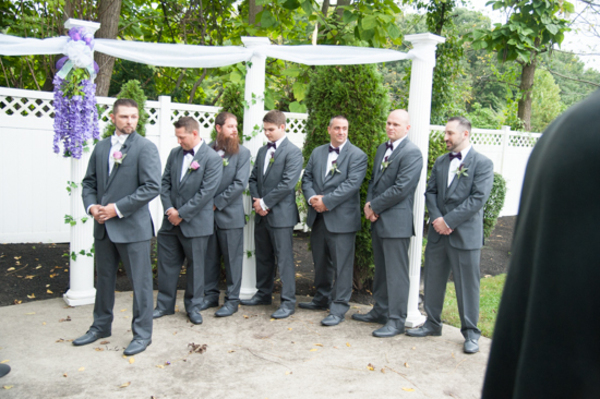 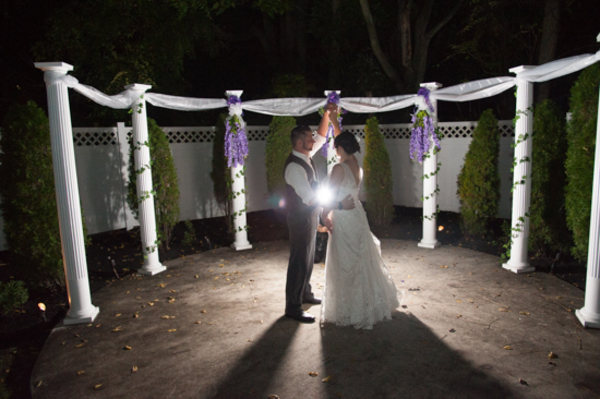 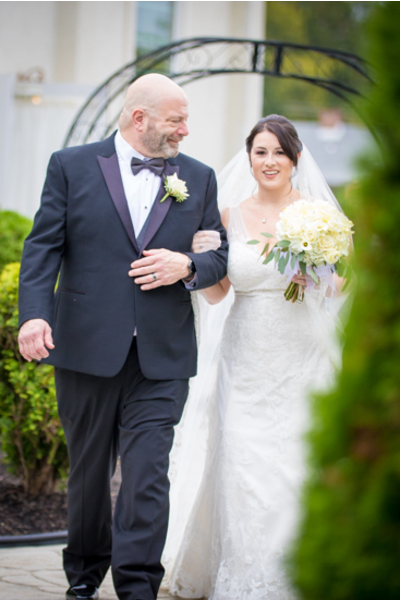 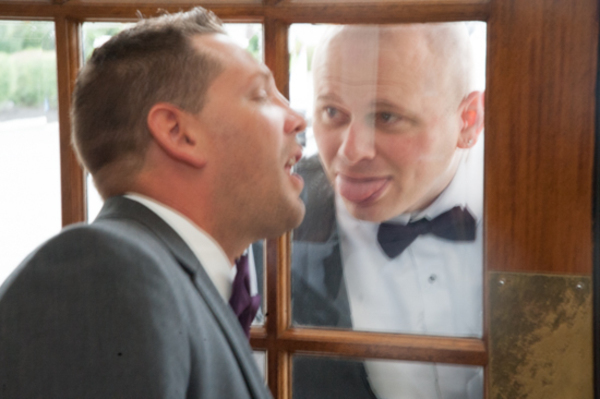 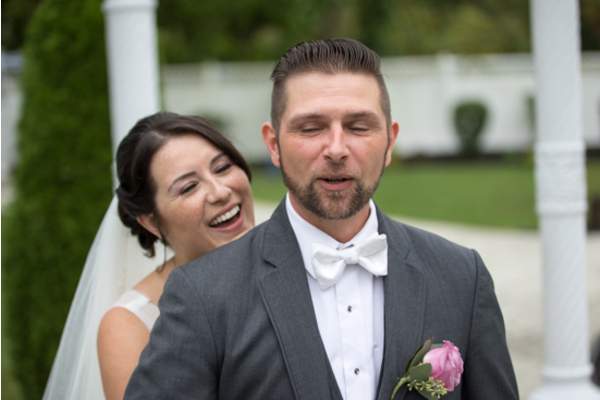 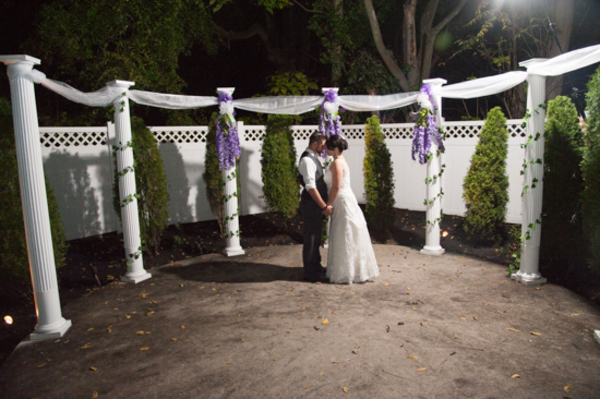 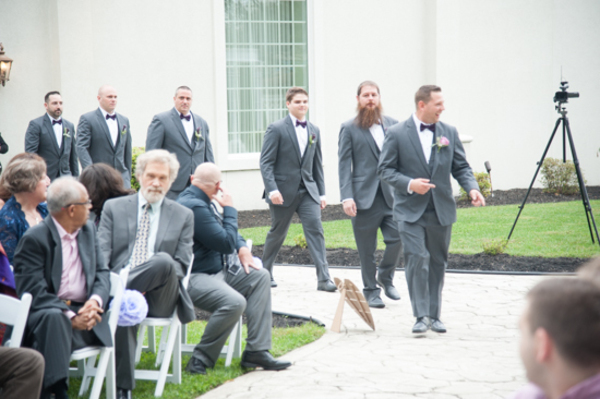 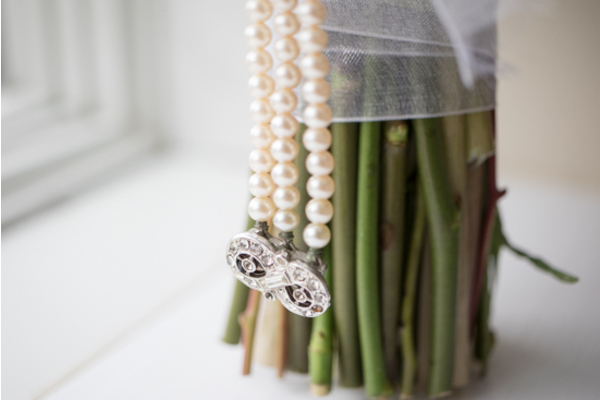 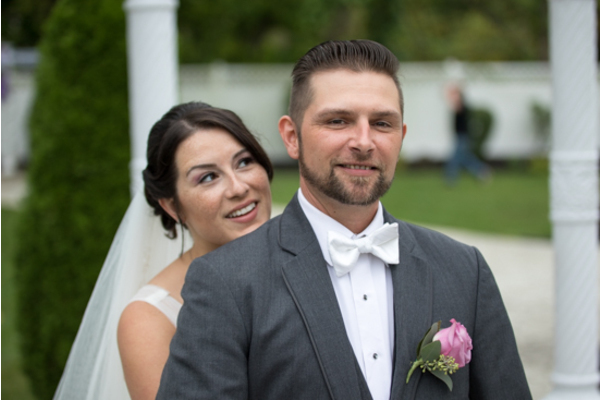 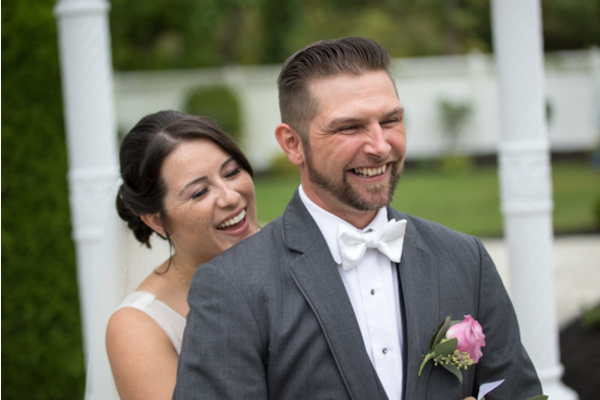 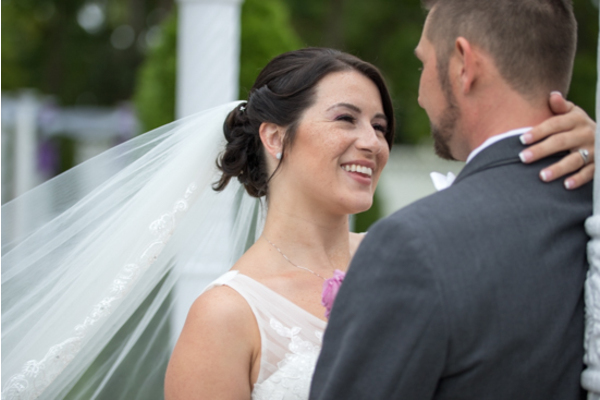 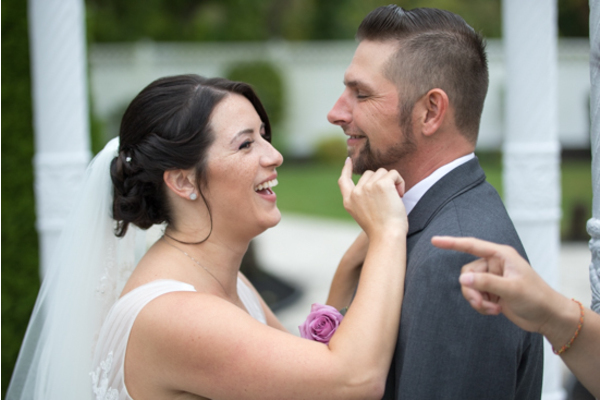 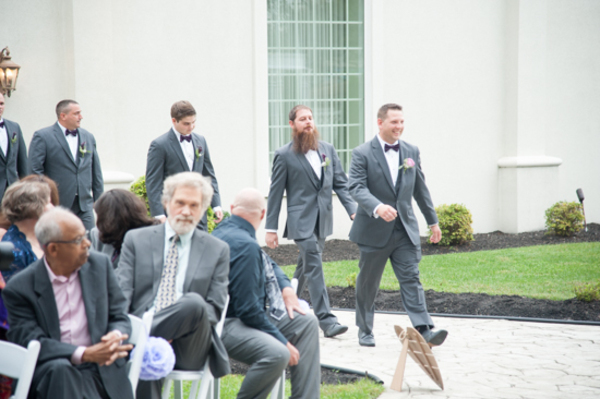 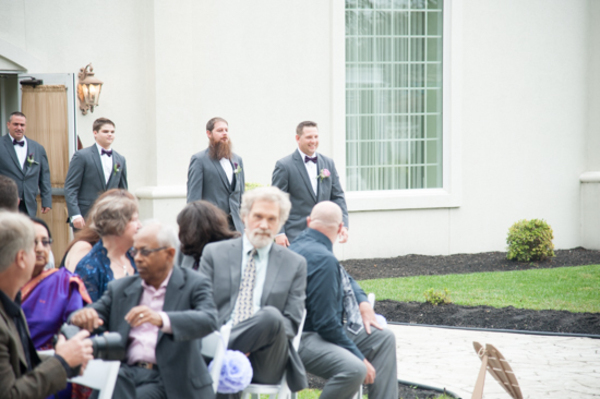 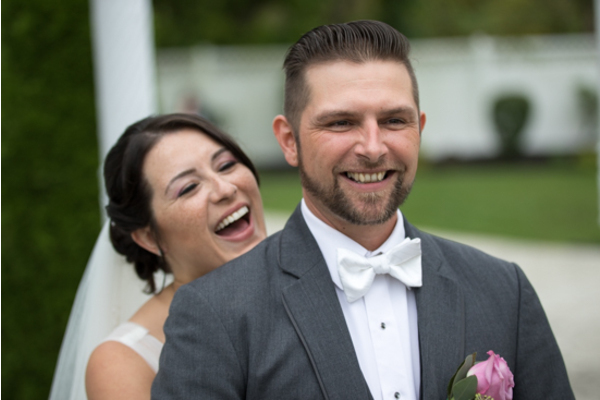 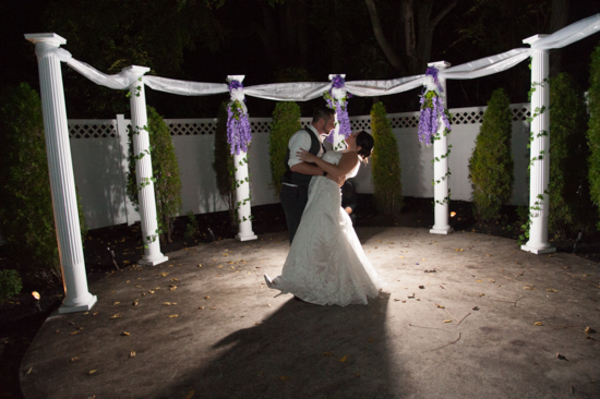 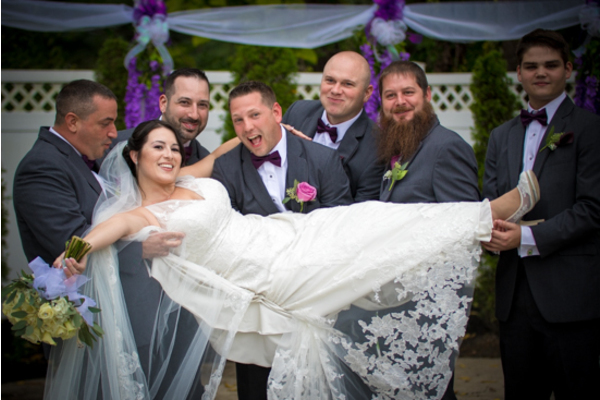 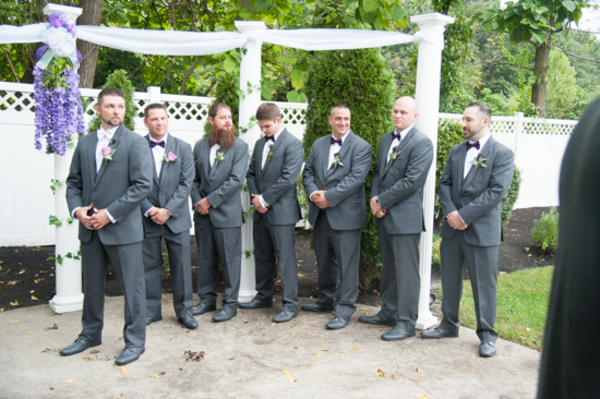 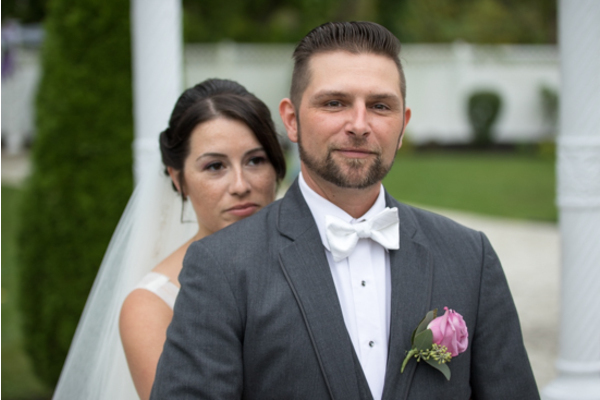 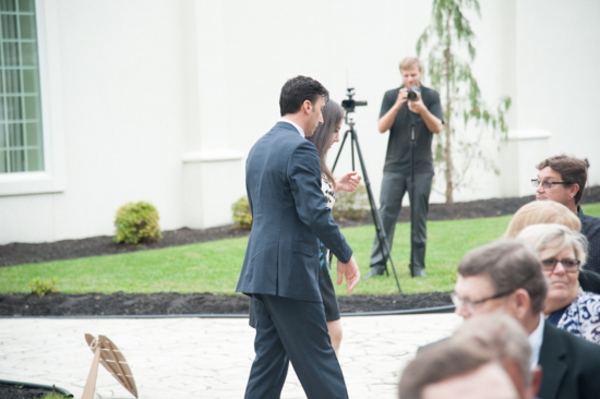 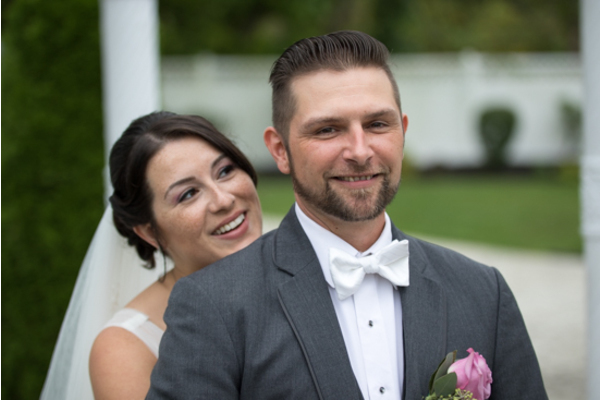 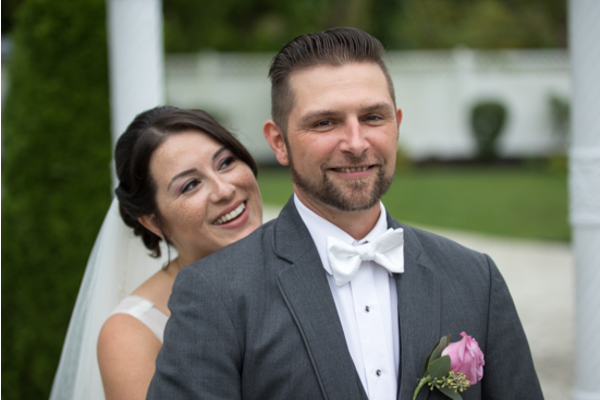 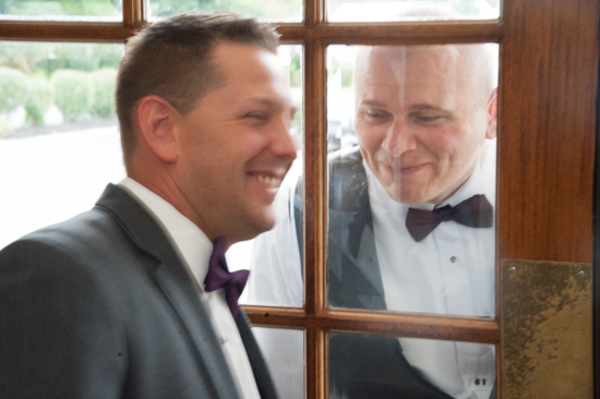 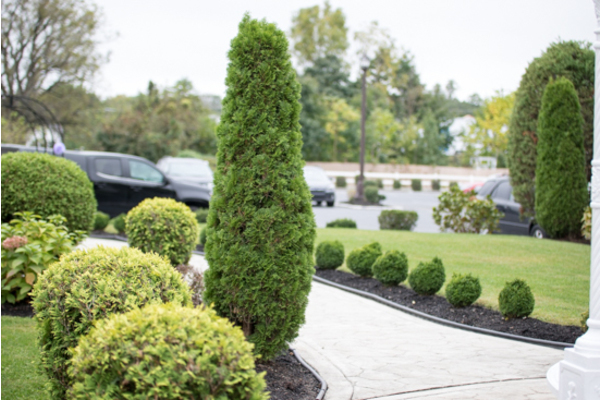 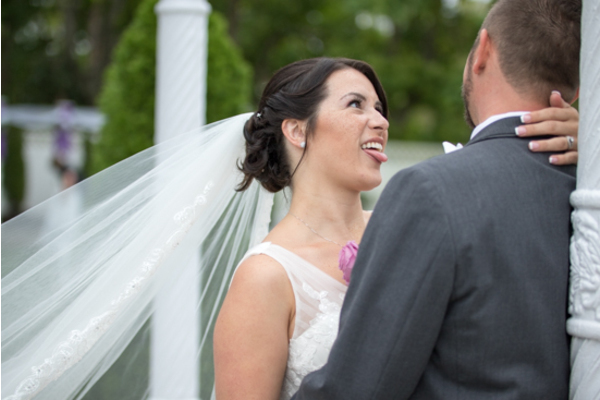 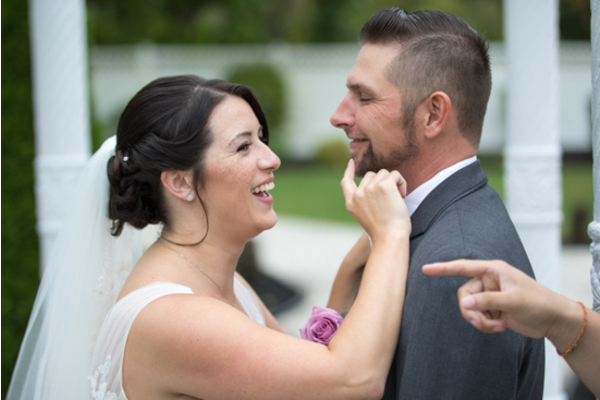 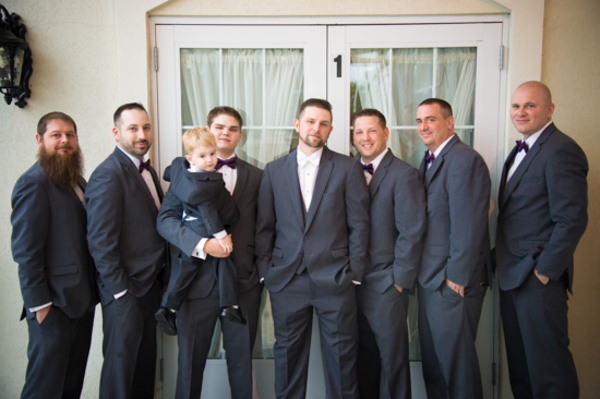 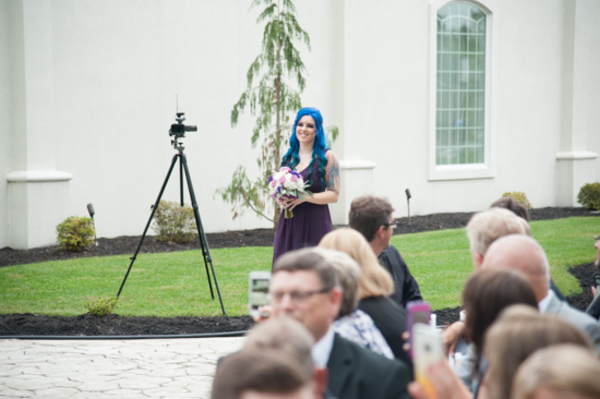 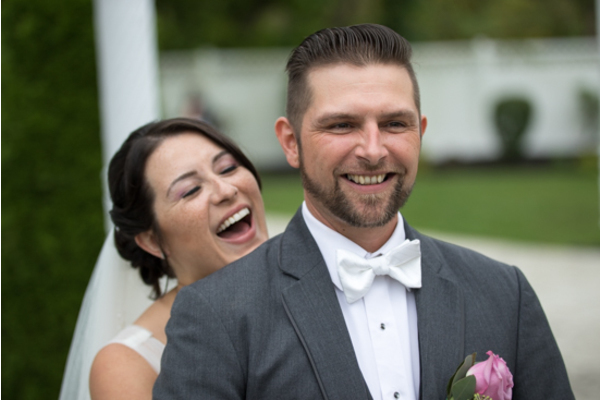 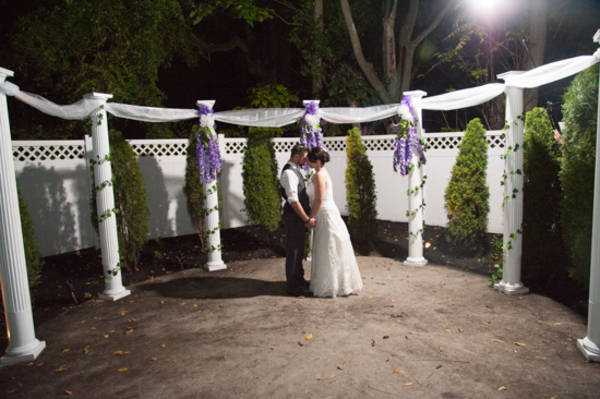 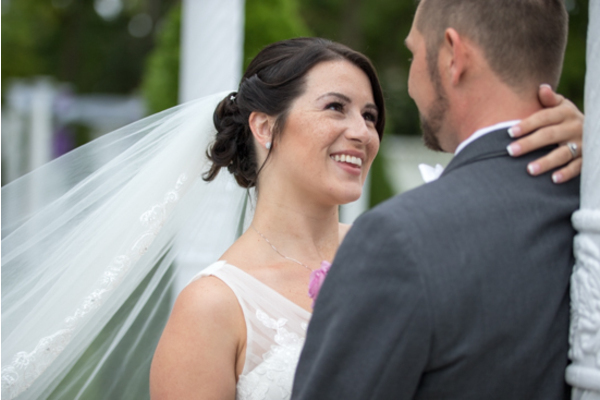 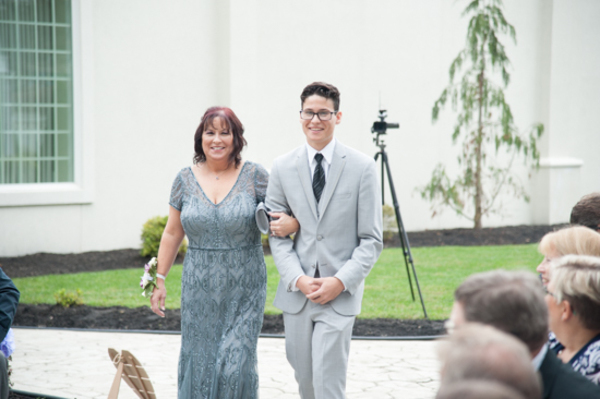 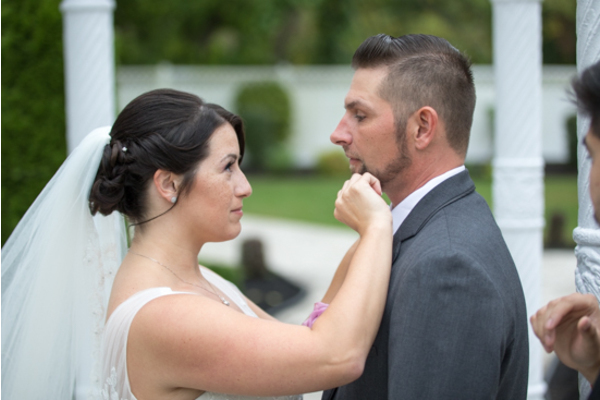 At last, he met up with his lovely bride outside with our NJ Wedding Photographer! 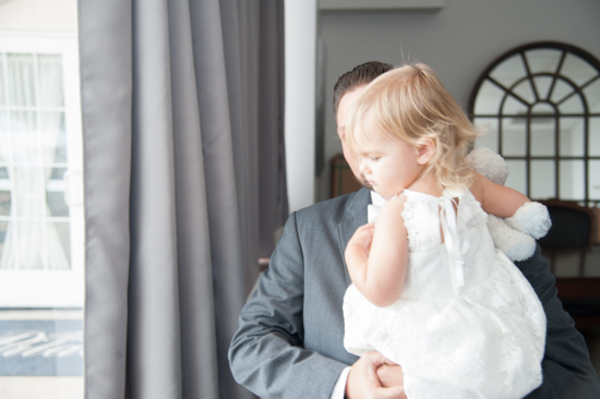 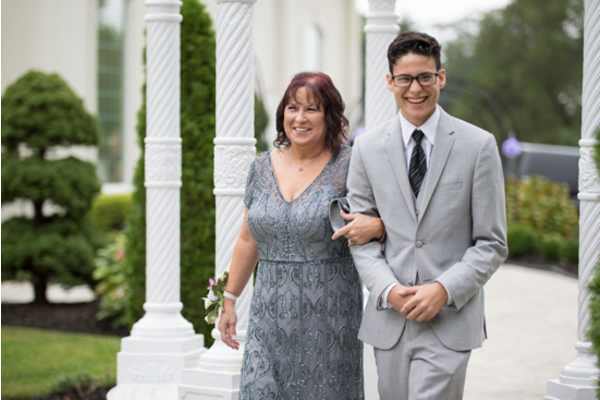 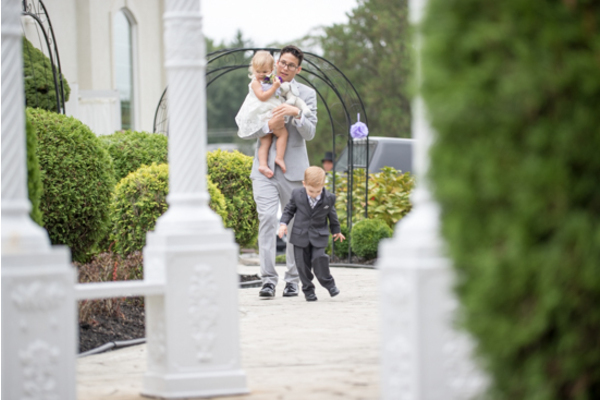 Prior to the ceremony, these cuties took the cutest portraits ever surrounded by the venue’s beautiful landscaping and greenery. 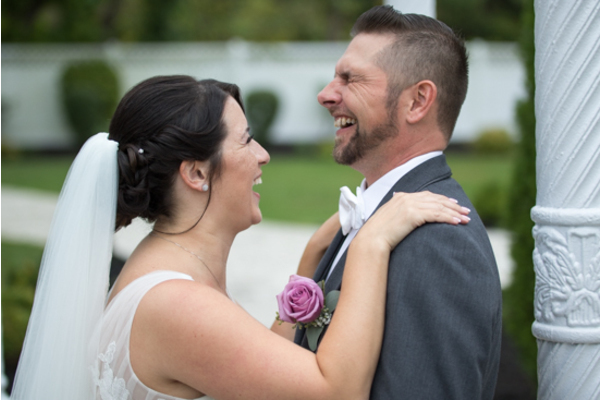 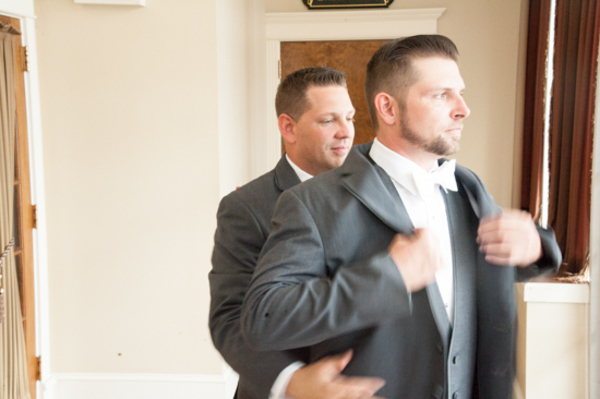 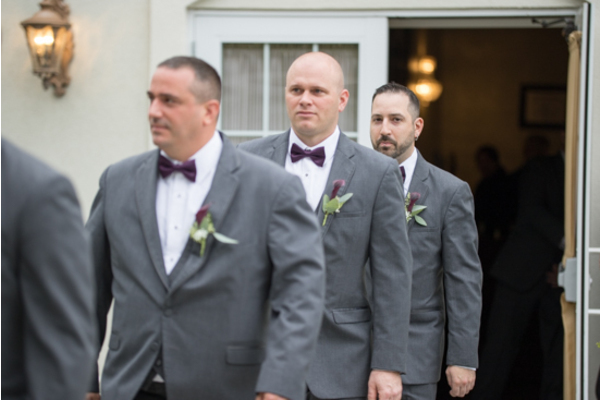 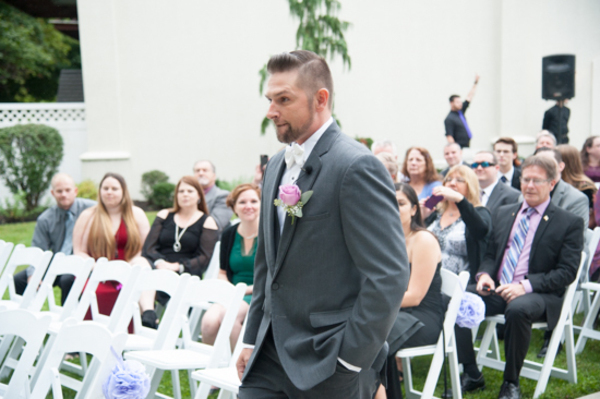 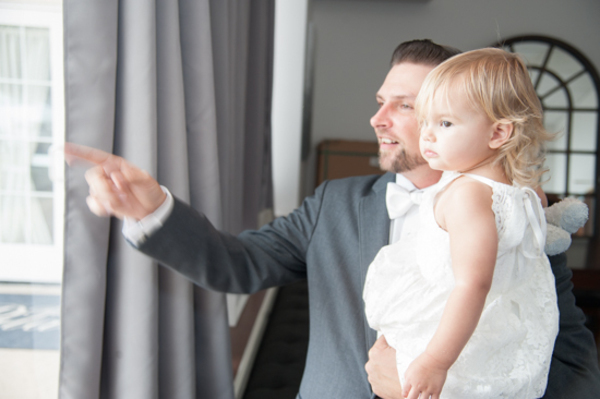 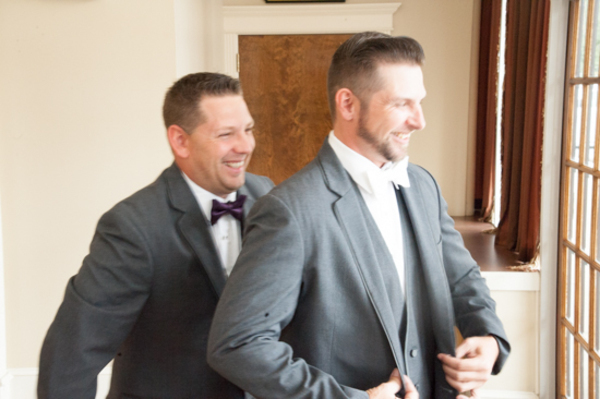 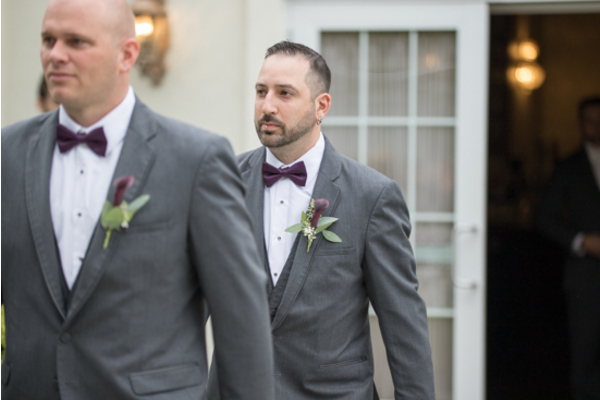 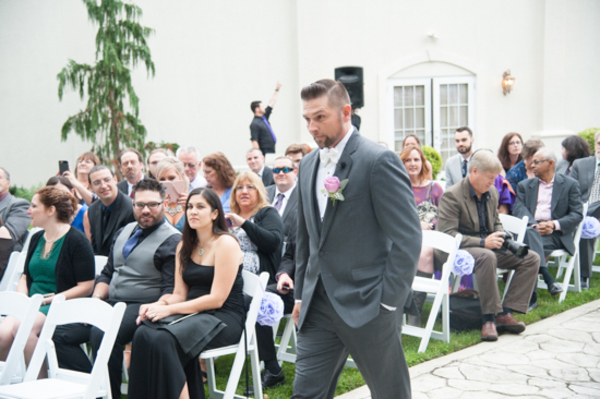 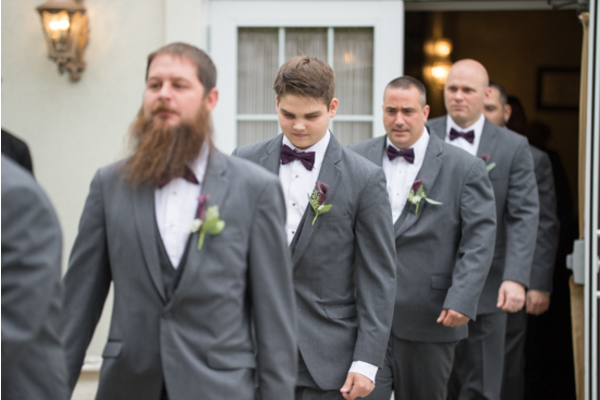 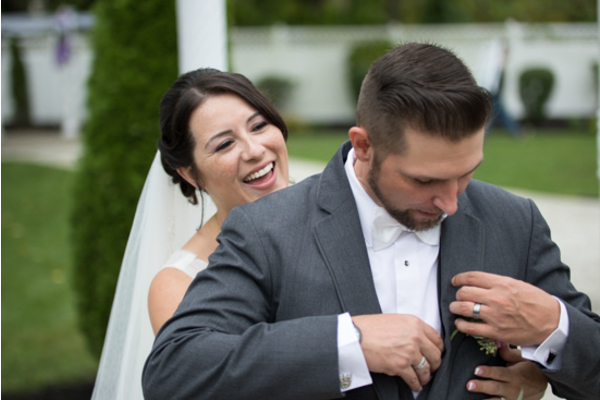 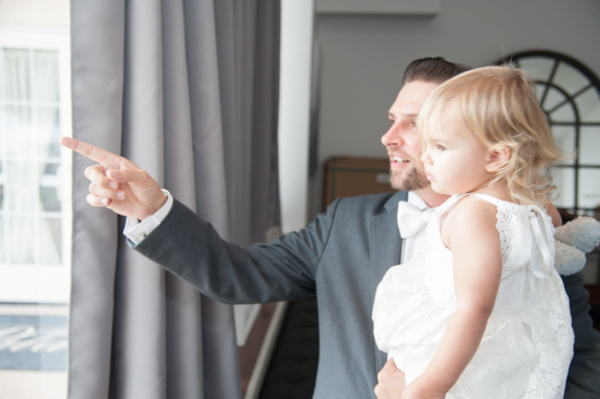 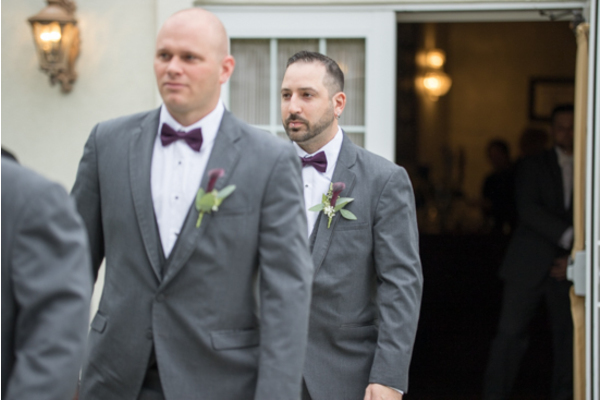 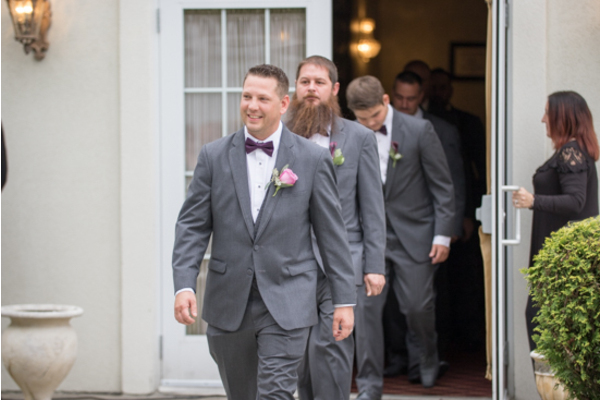 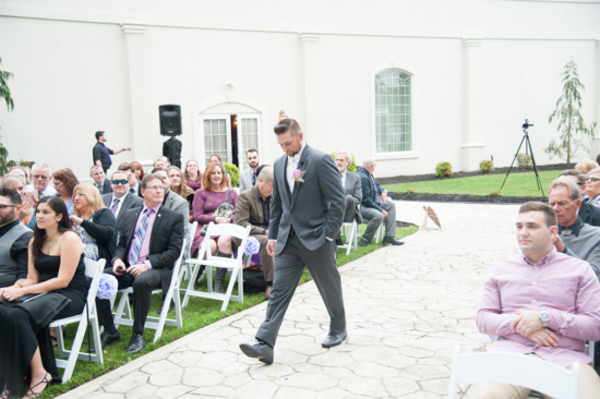 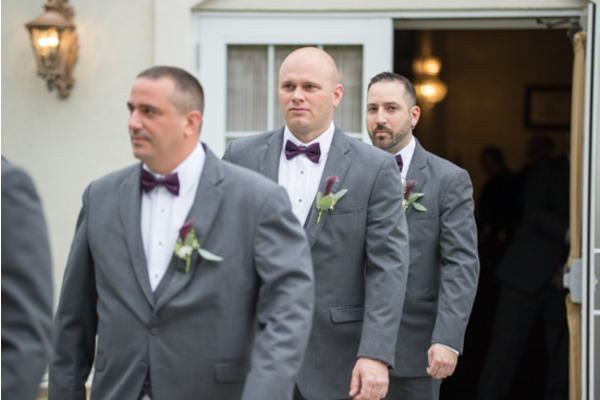 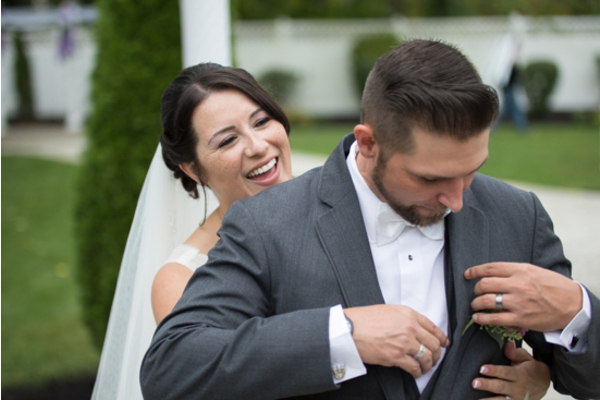 There were even some fun candid shots captured that this couple would get to look back on forever! 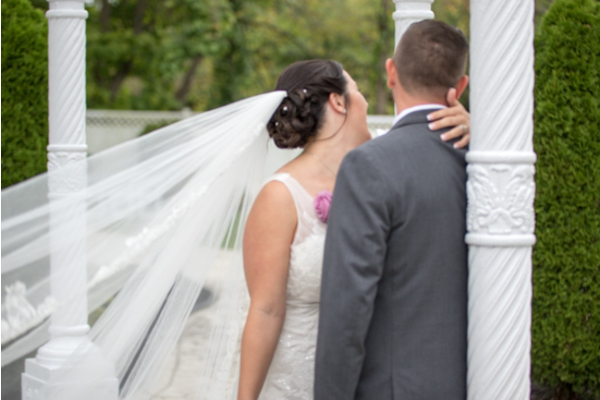 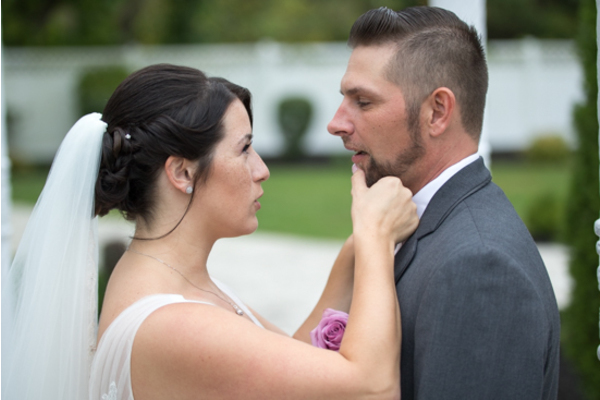 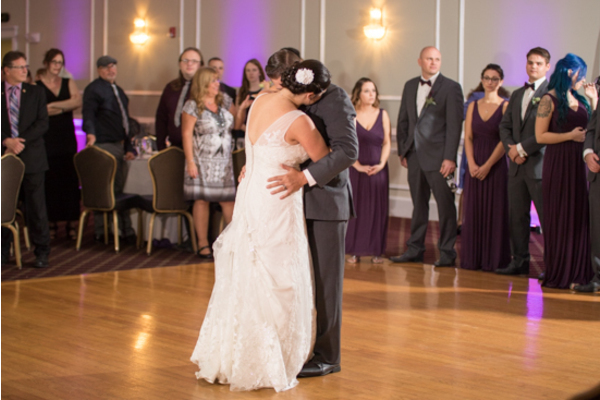 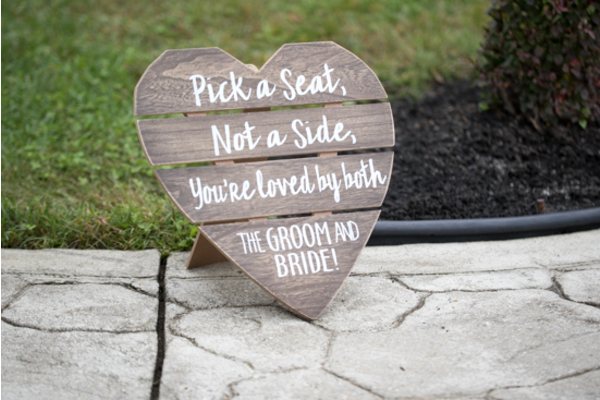 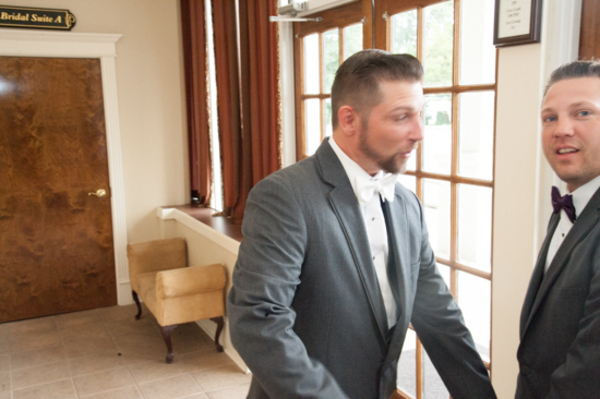 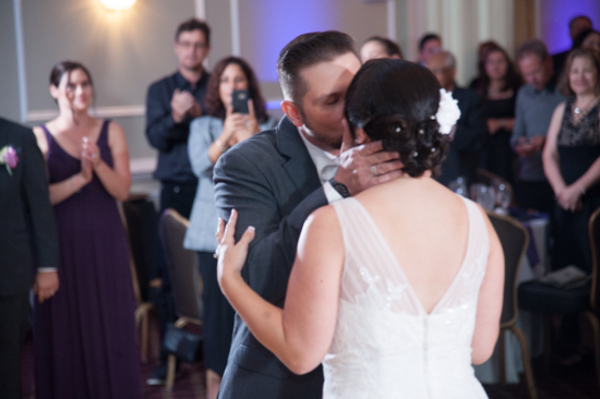 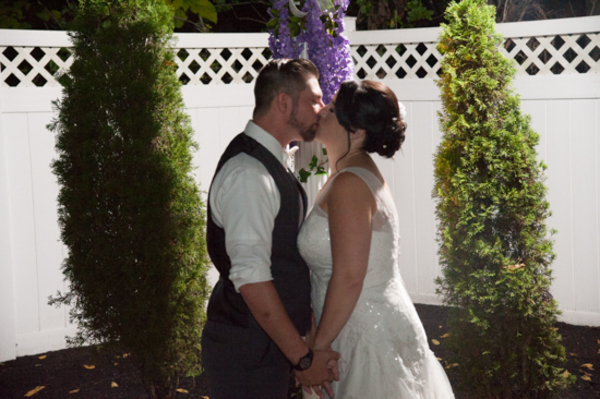 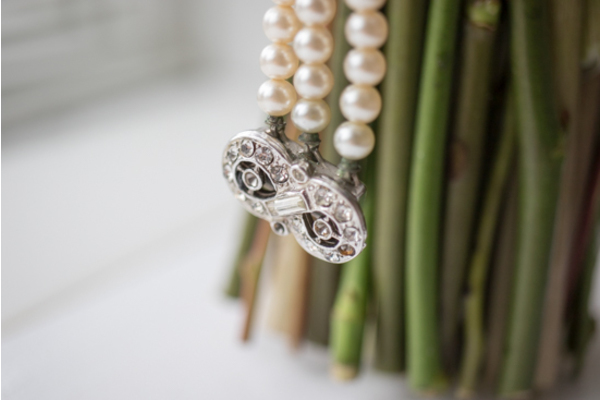 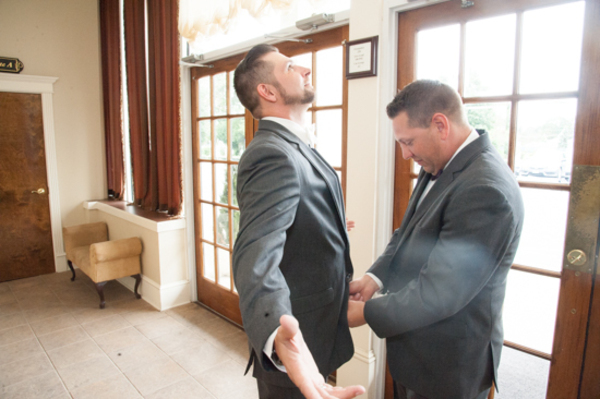 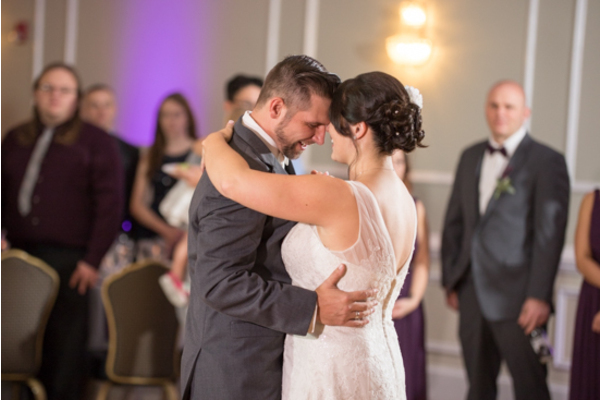 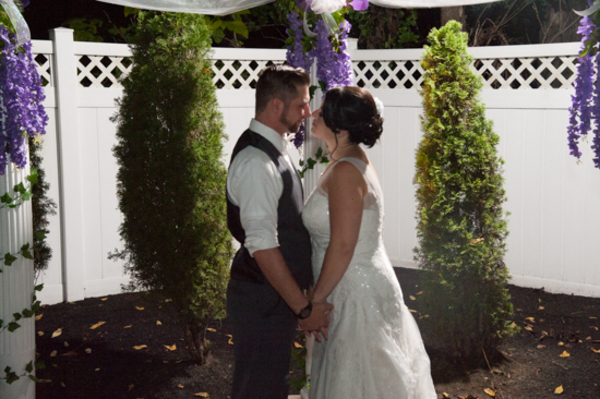 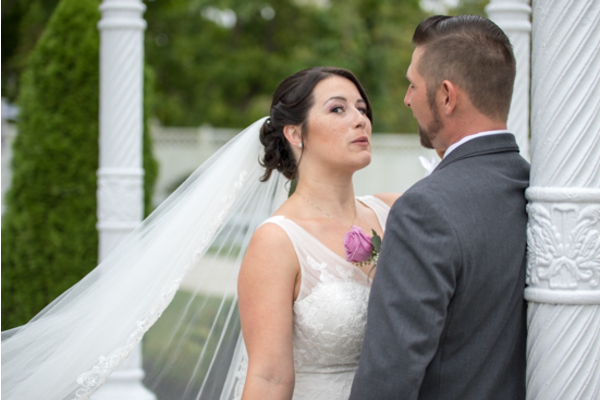 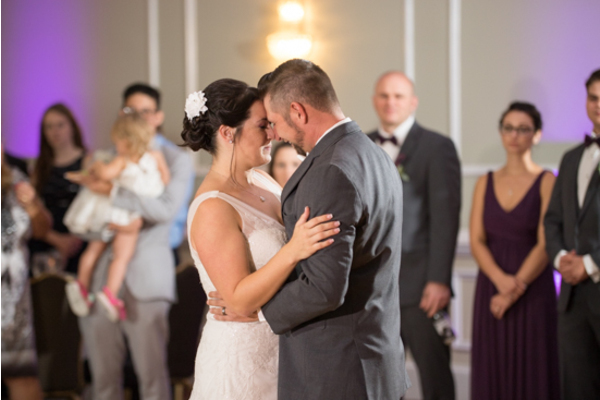 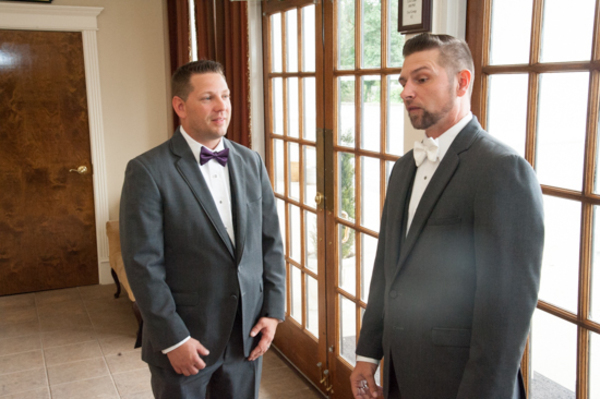 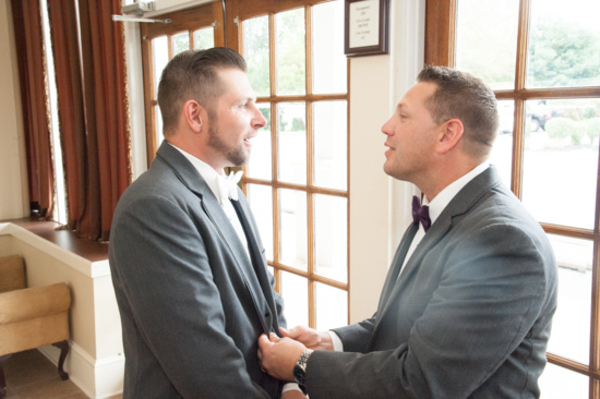 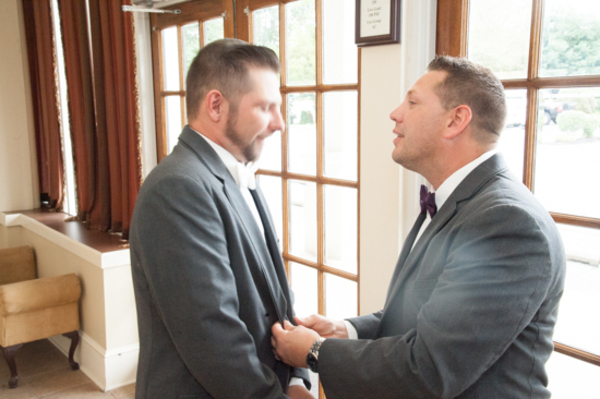 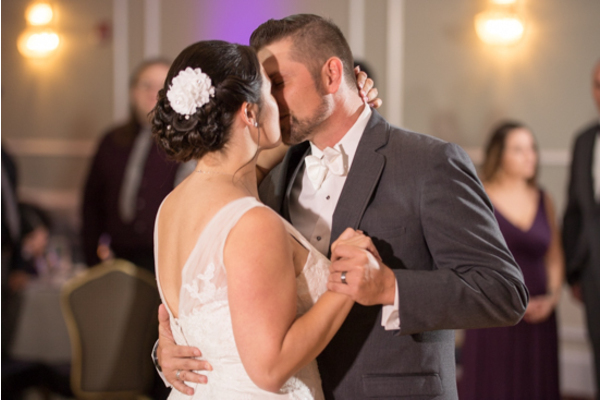 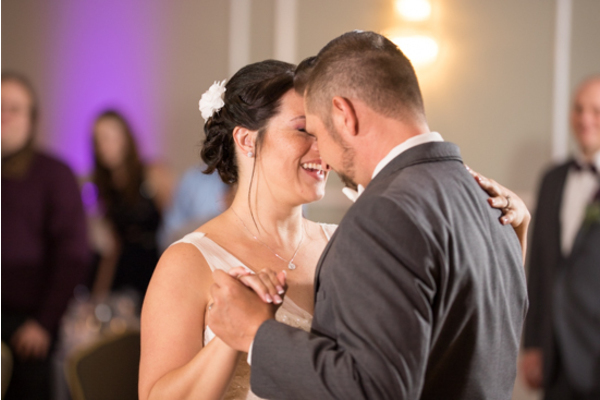 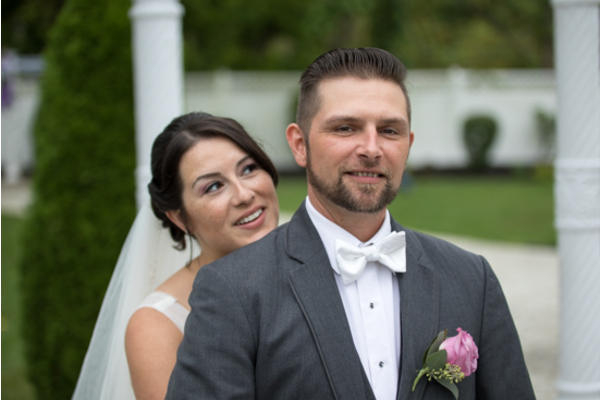 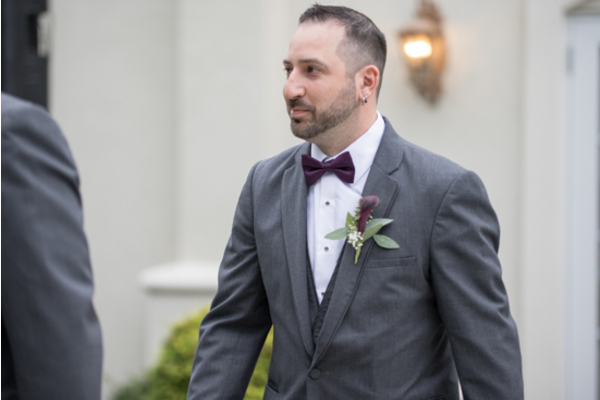 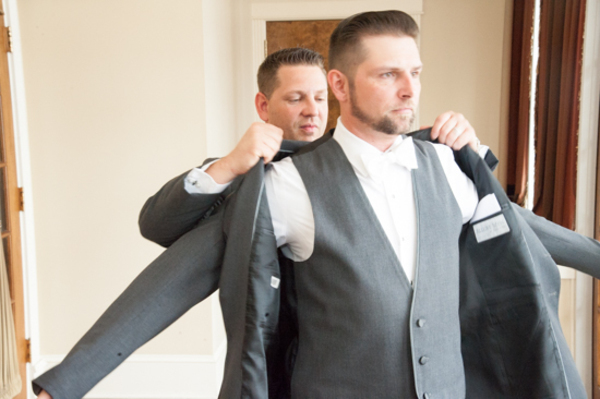 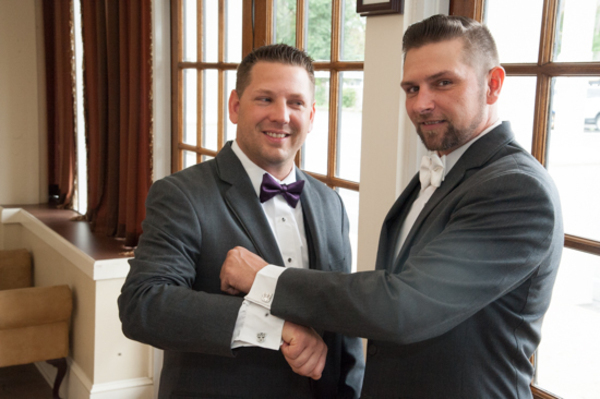 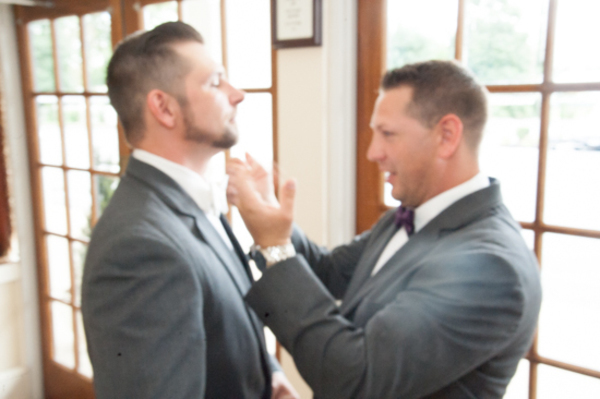 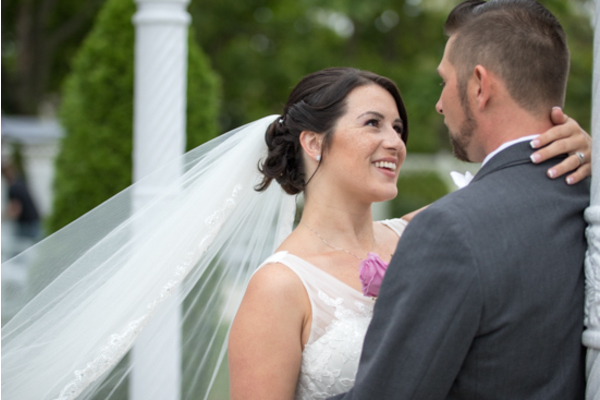 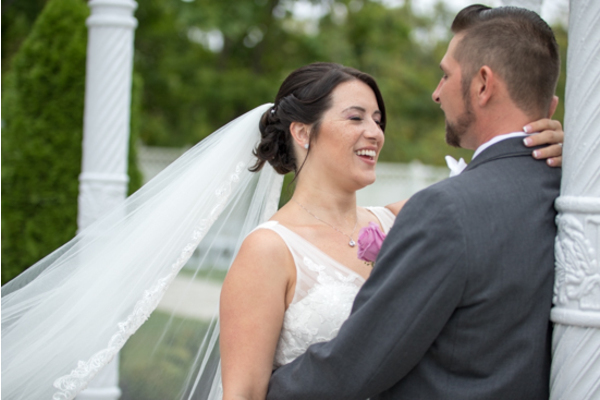 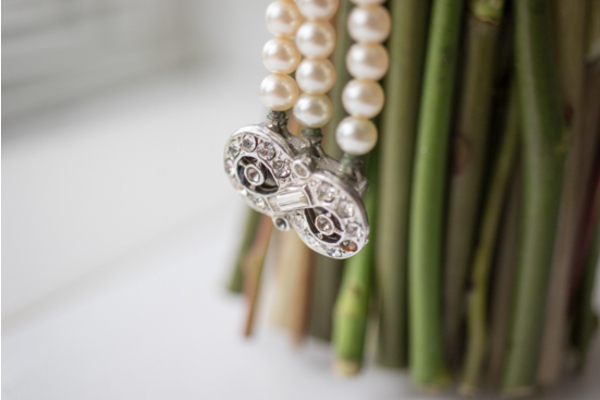 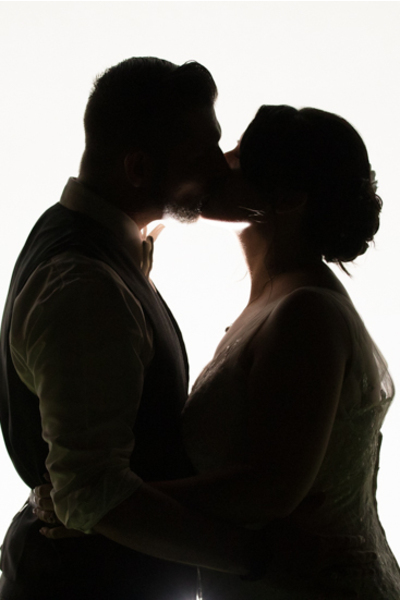 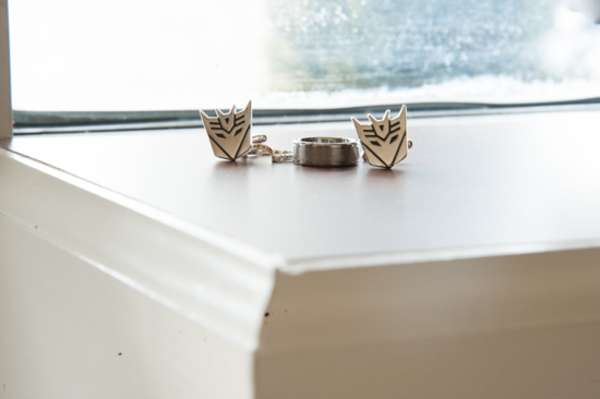 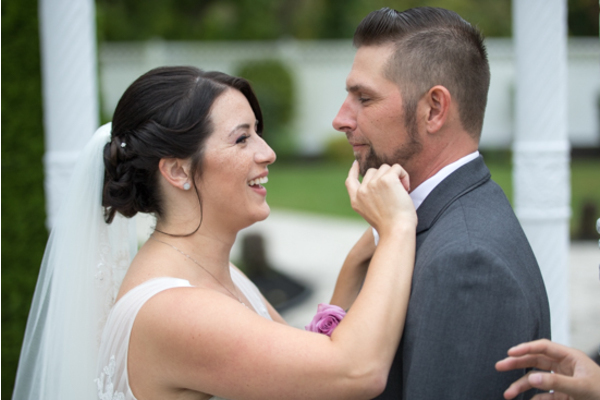 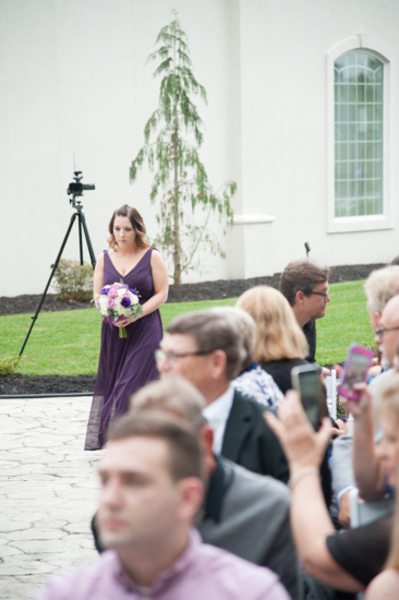 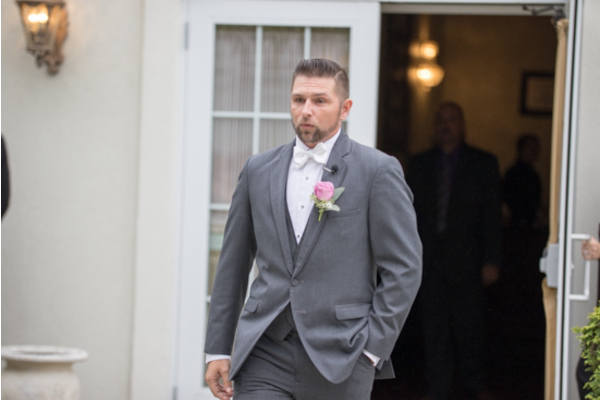 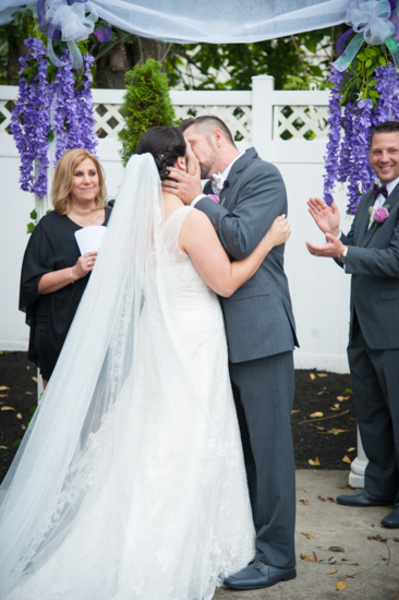 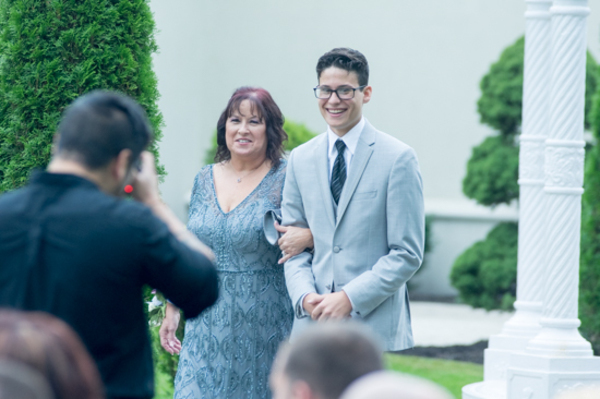 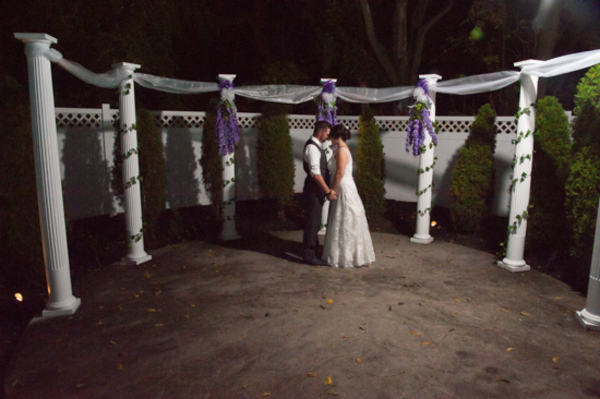 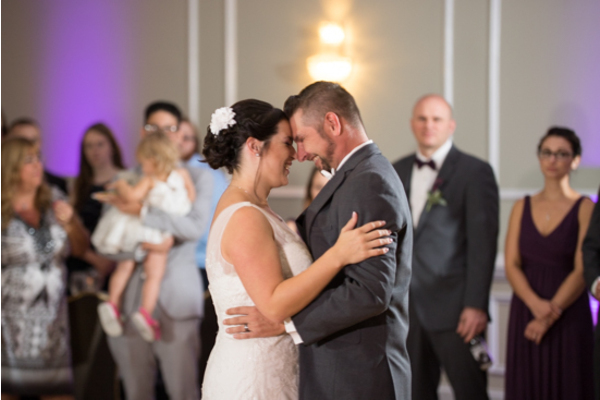 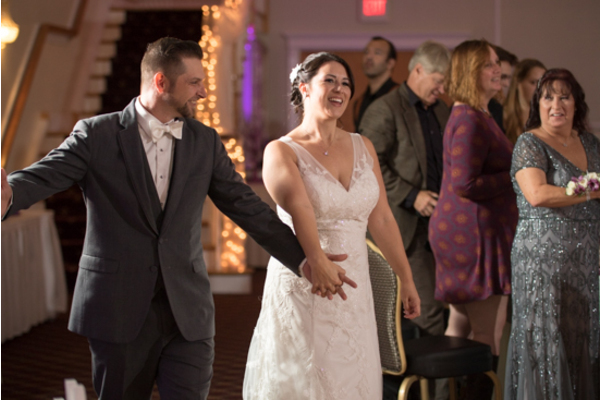 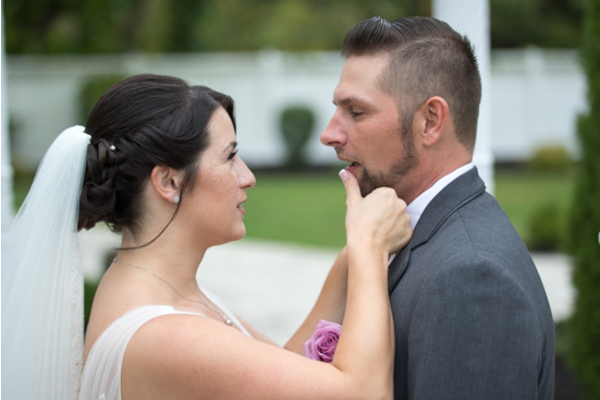 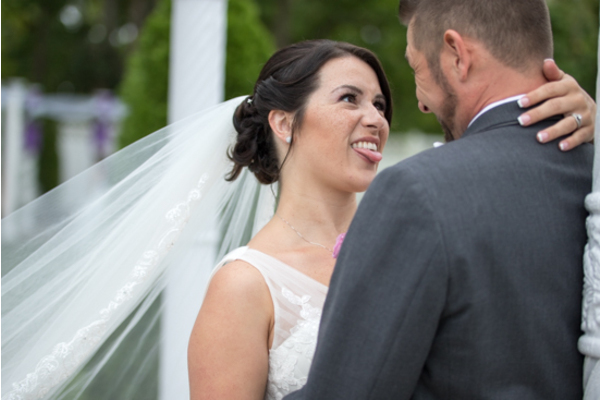 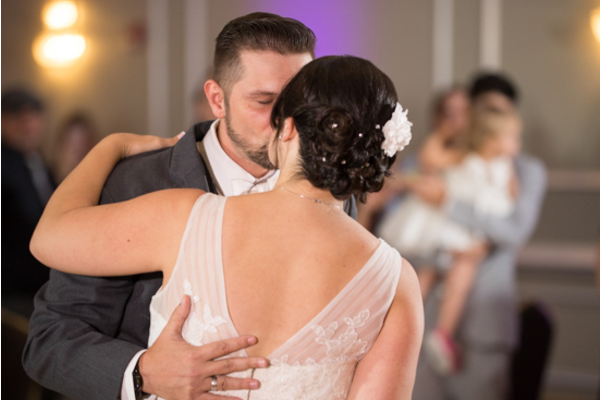 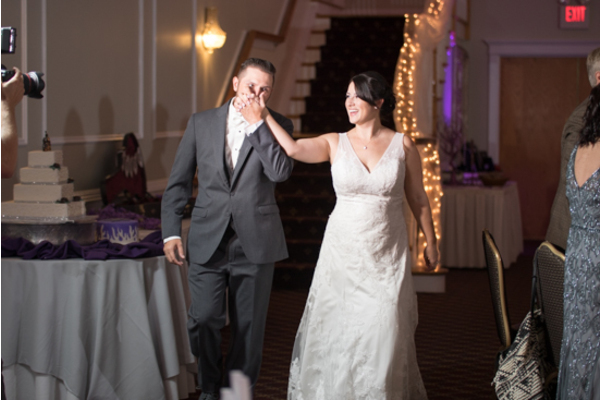 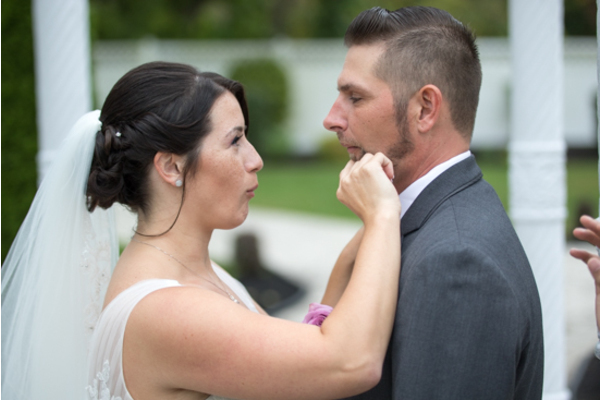 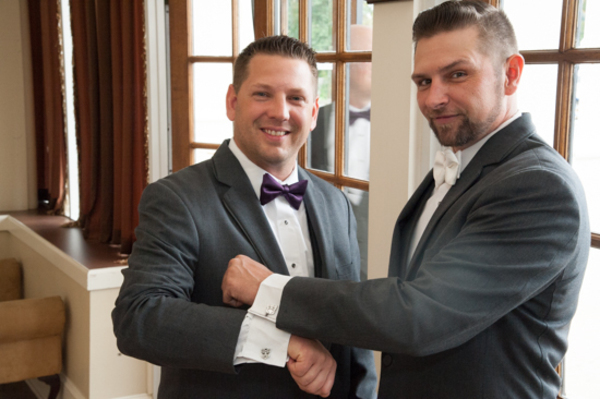 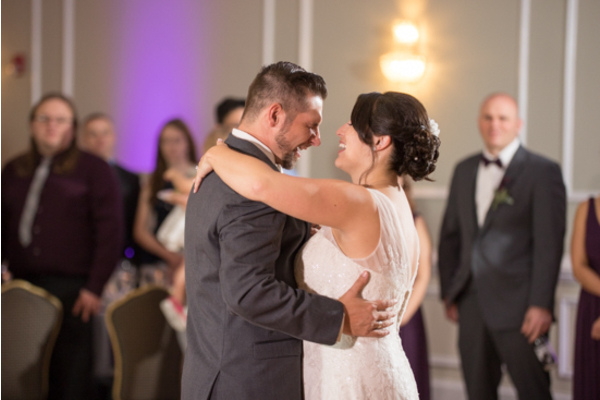 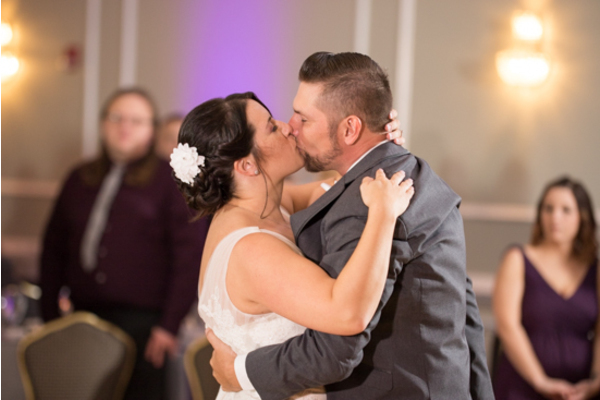 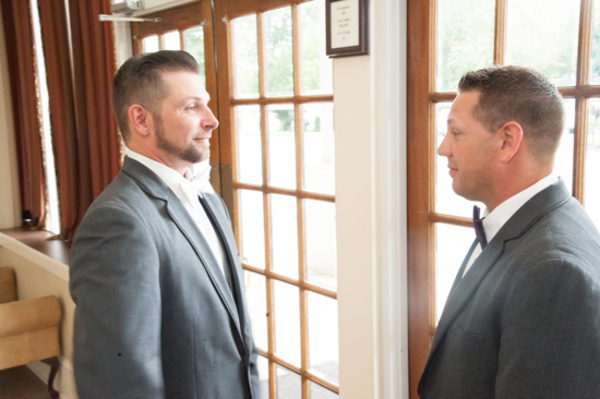 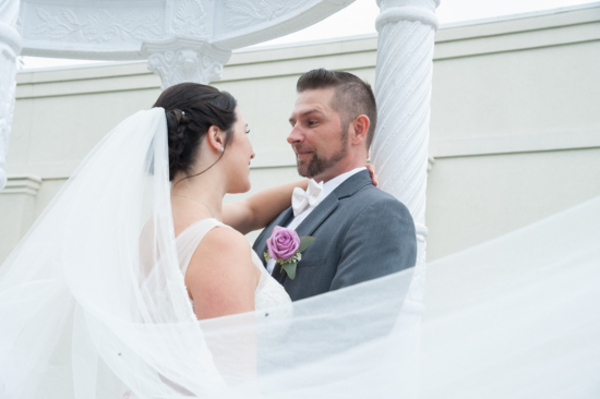 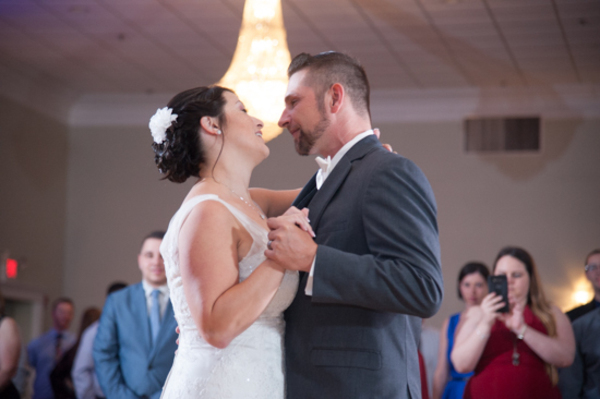 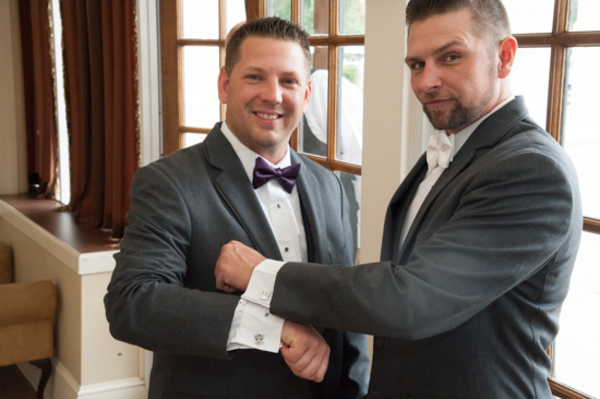 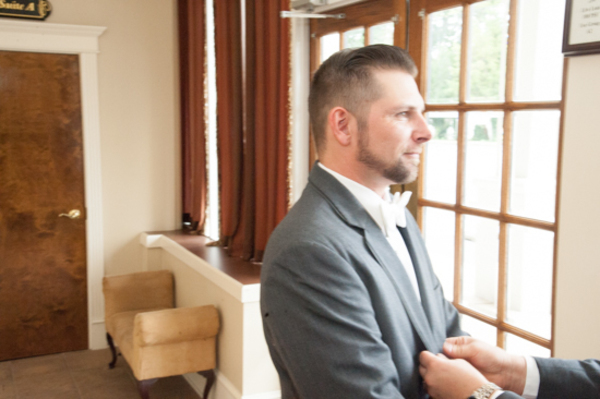 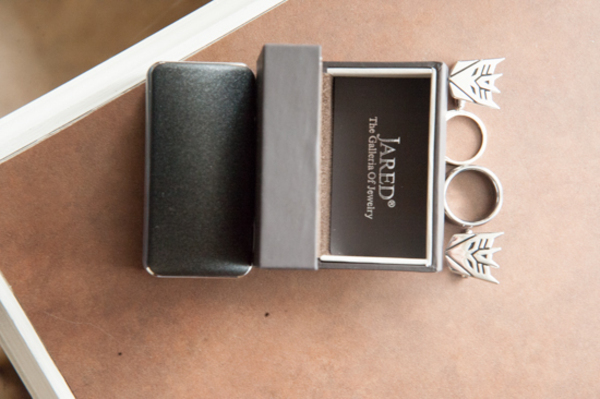 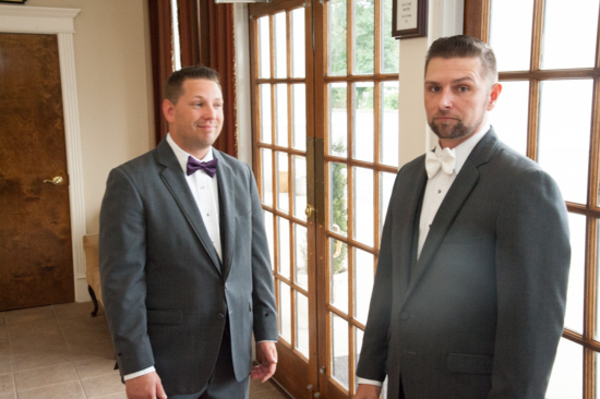 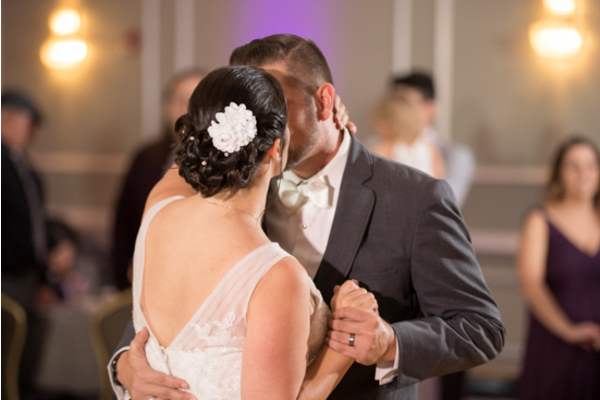 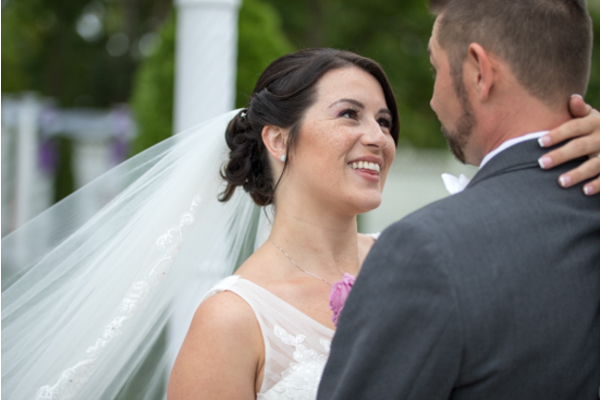 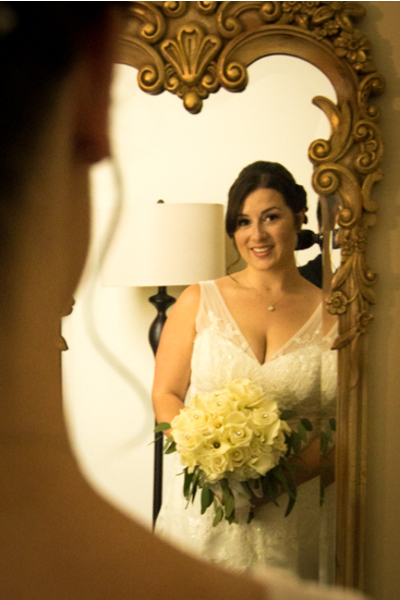 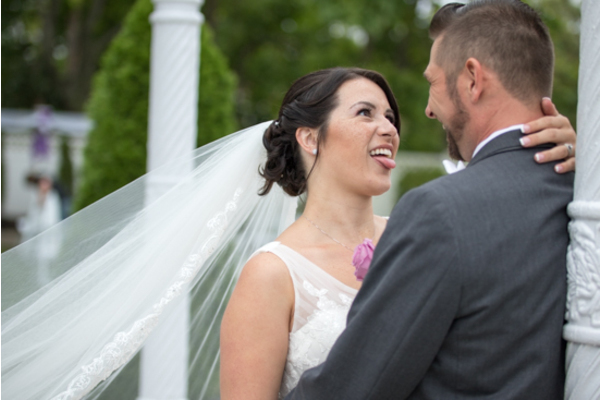 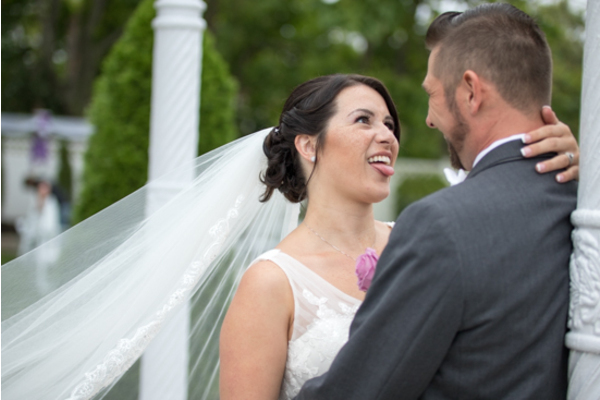 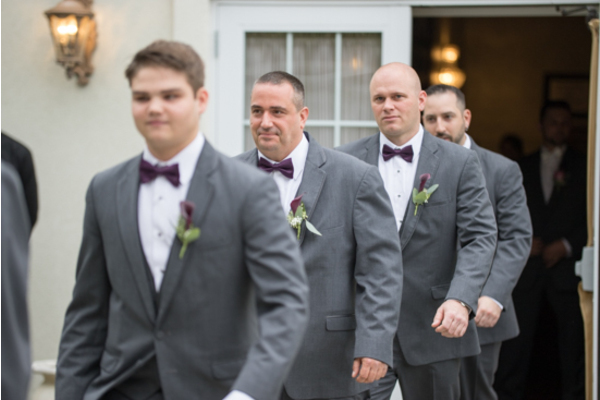 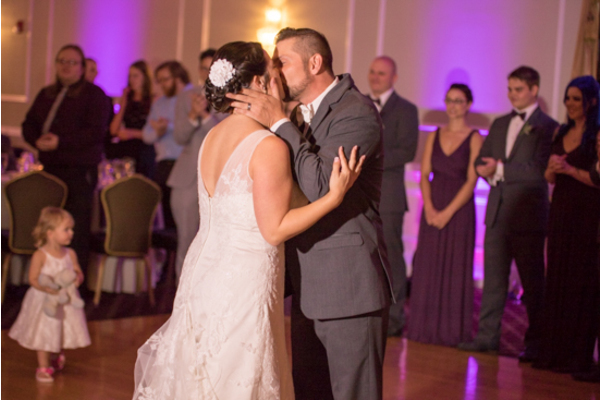 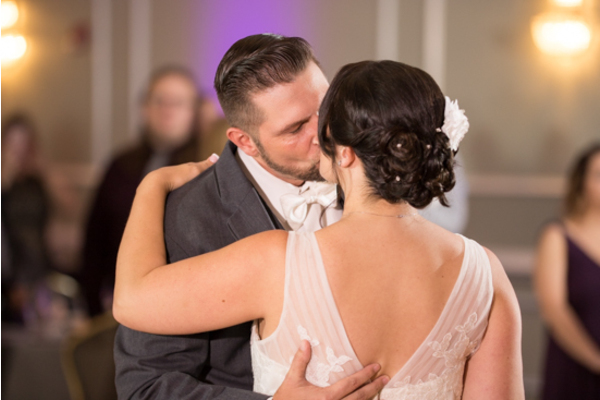 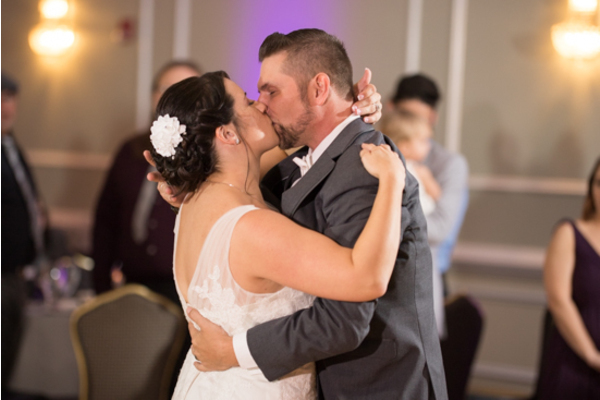 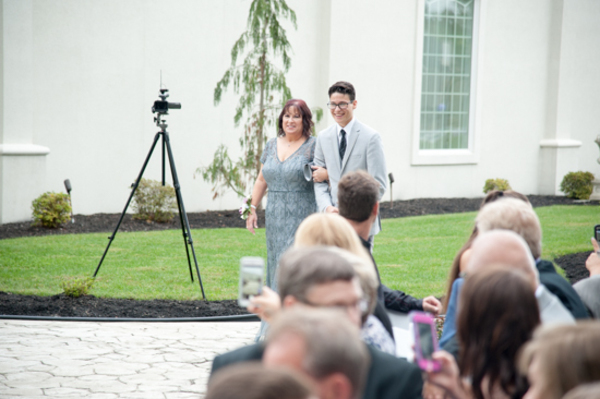 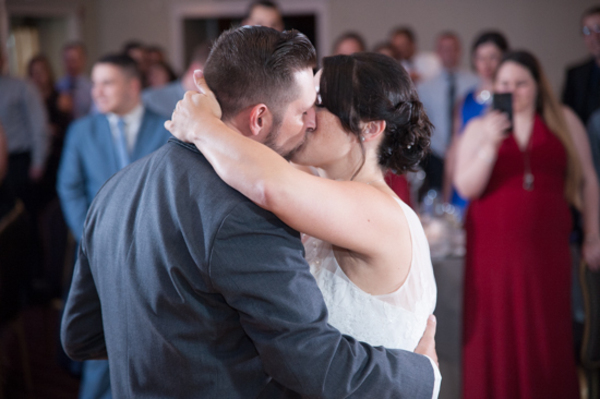 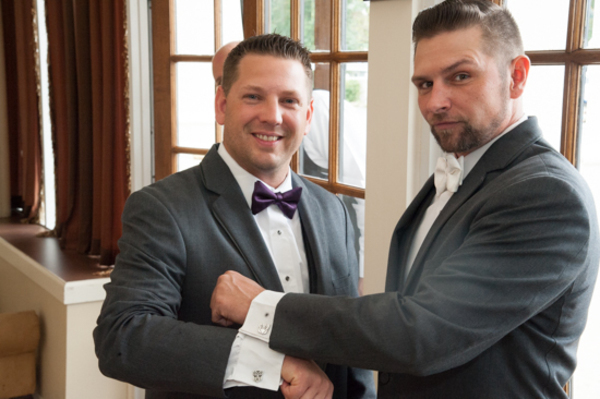 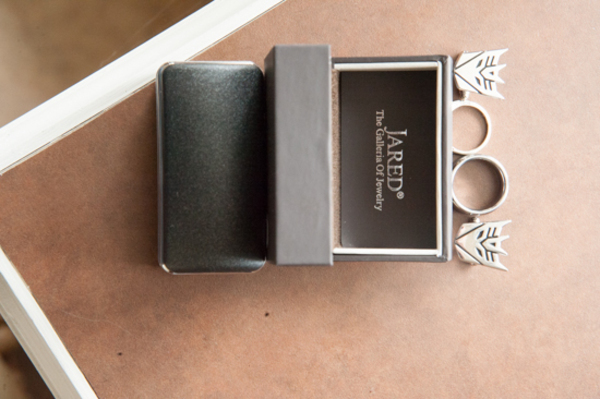 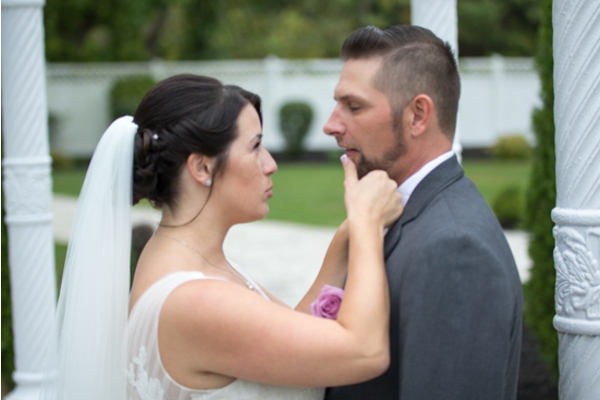 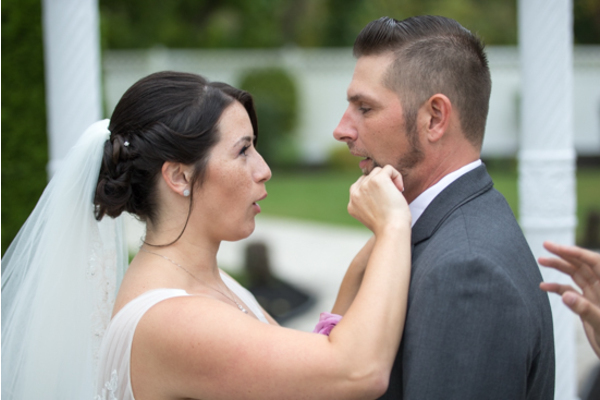 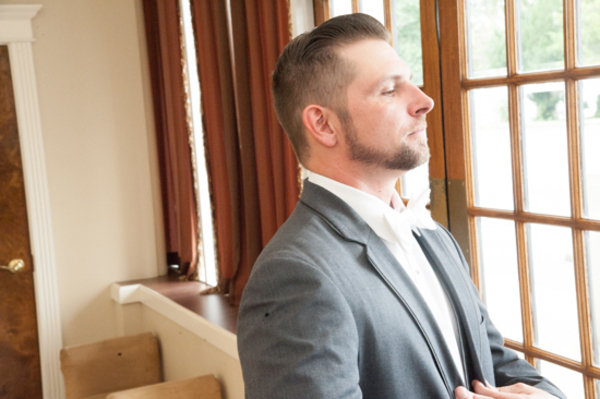 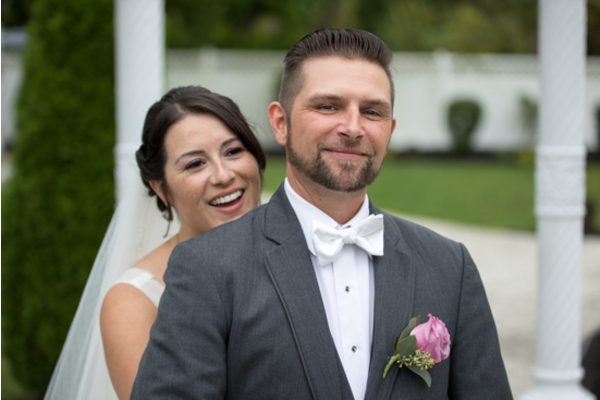 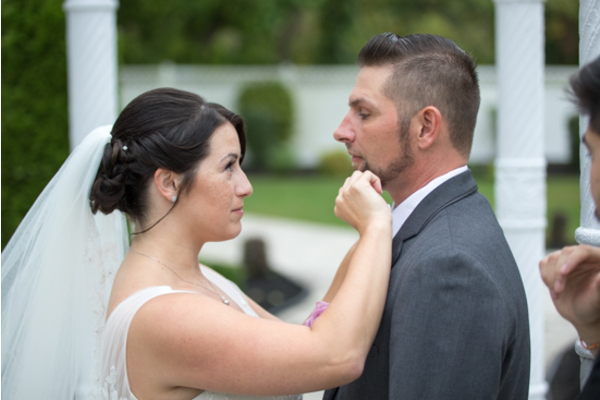 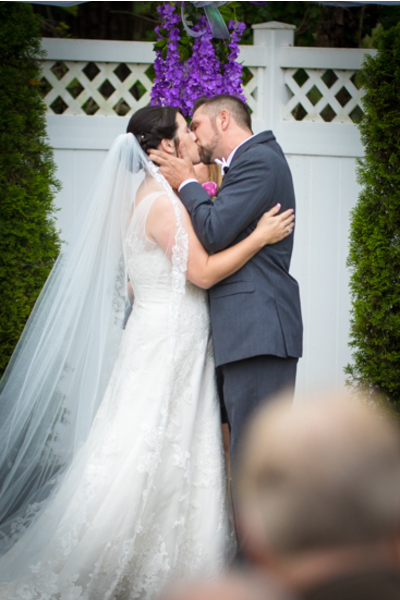 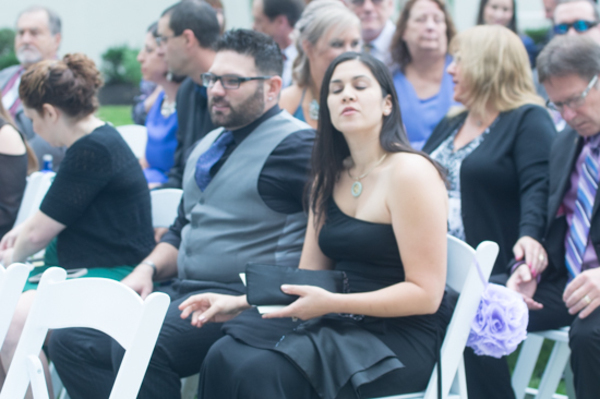 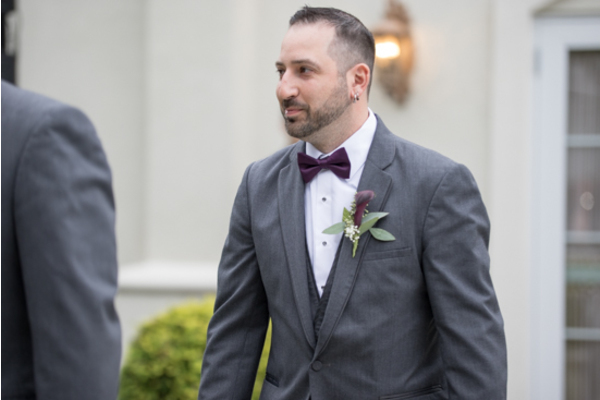 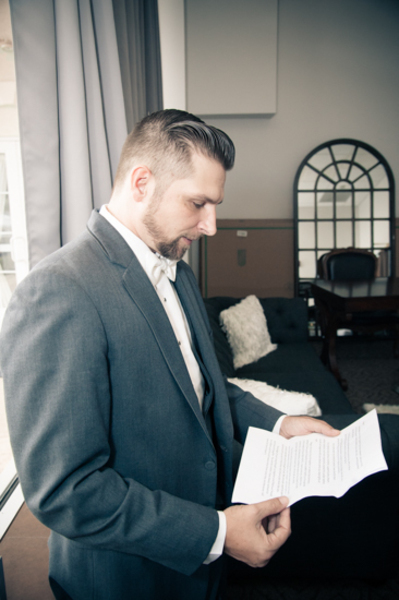 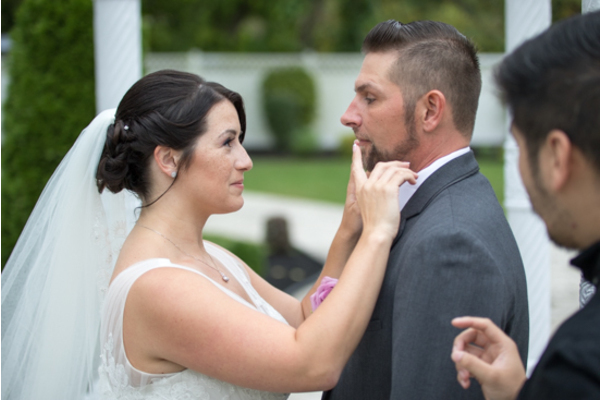 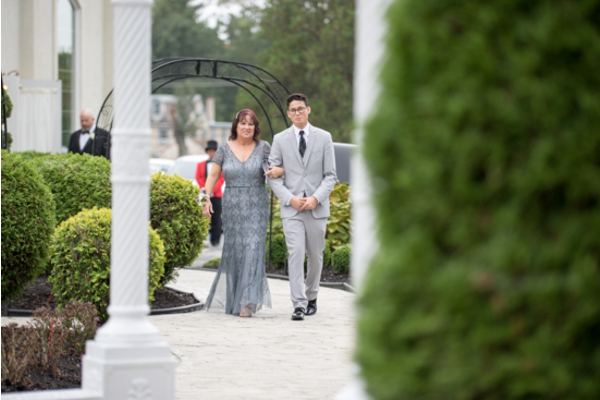 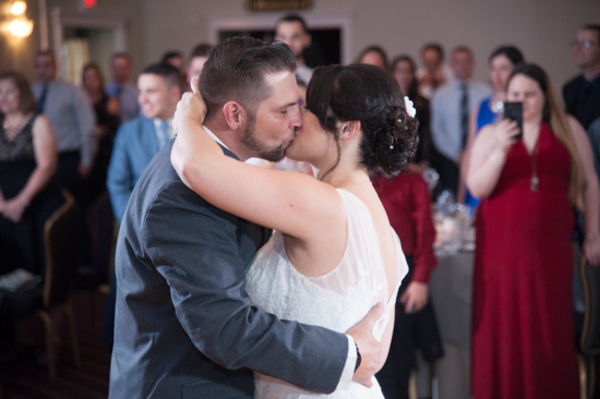 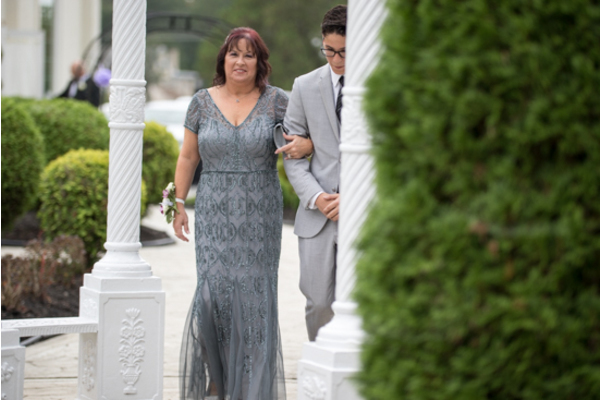 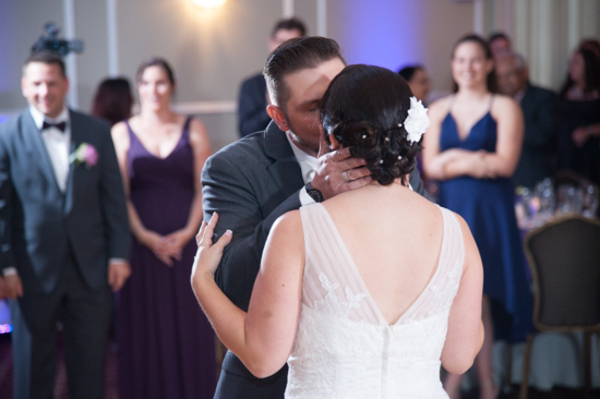 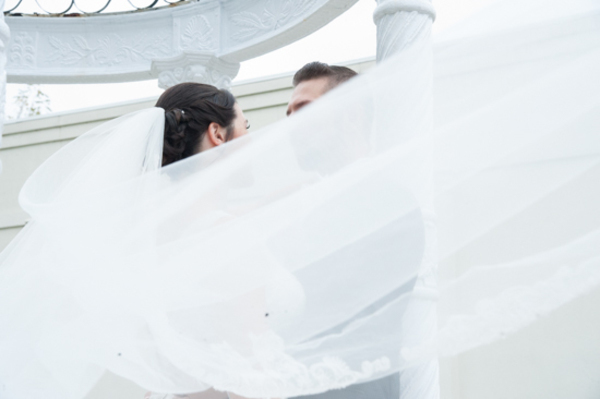 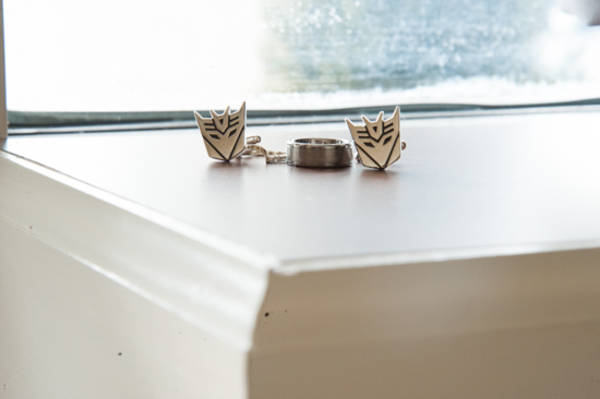 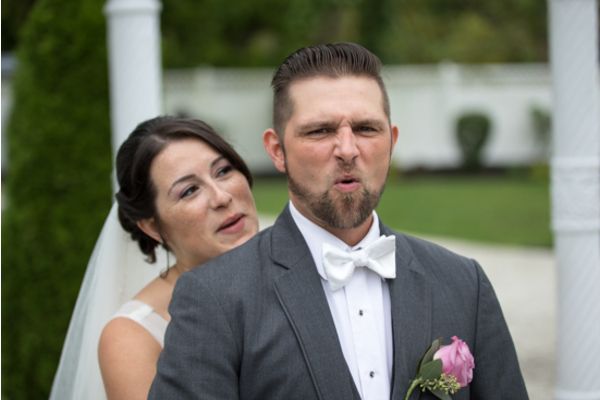 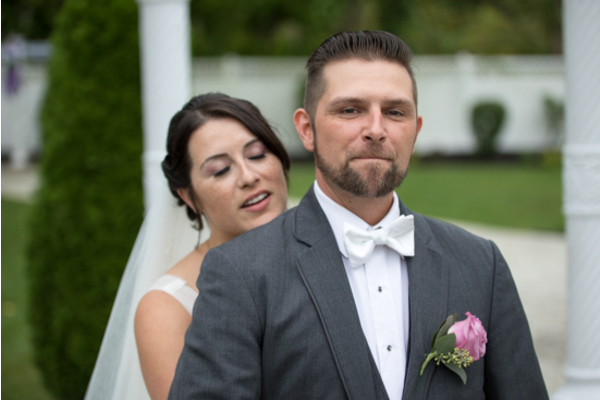 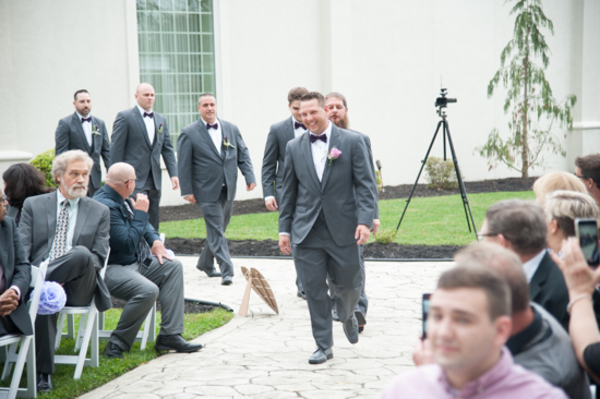 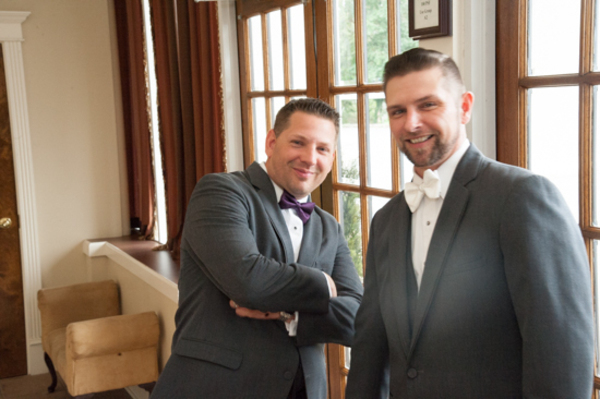 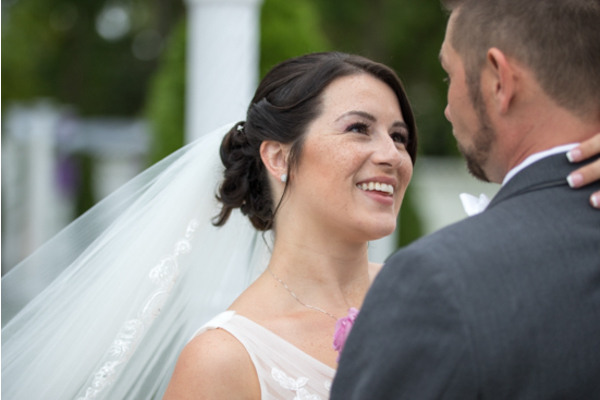 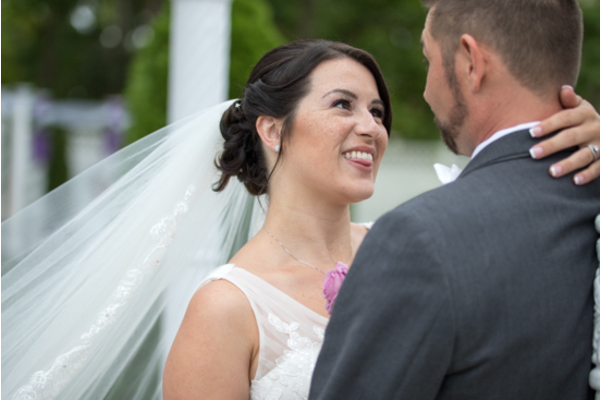 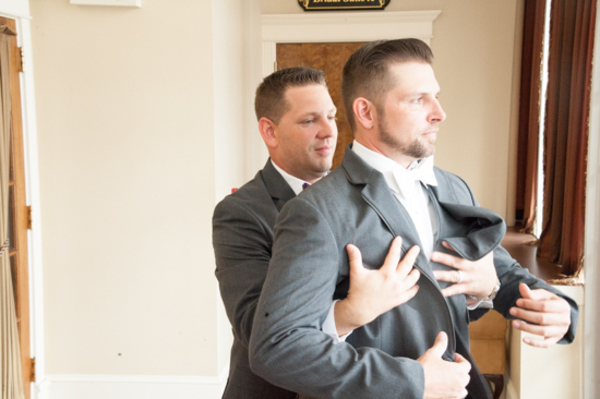 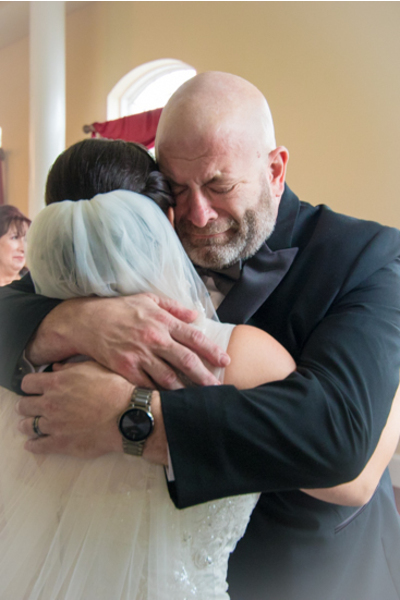 During the photo session, guests took their seats to await the official moment these two would wed. Our NJ Wedding Videographer perfectly recorded their vows and their kiss to seal the deal. 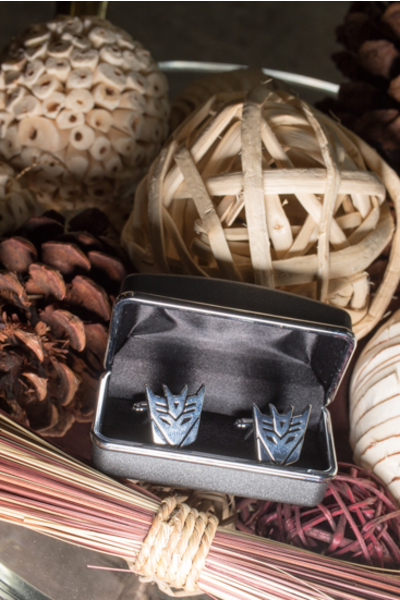 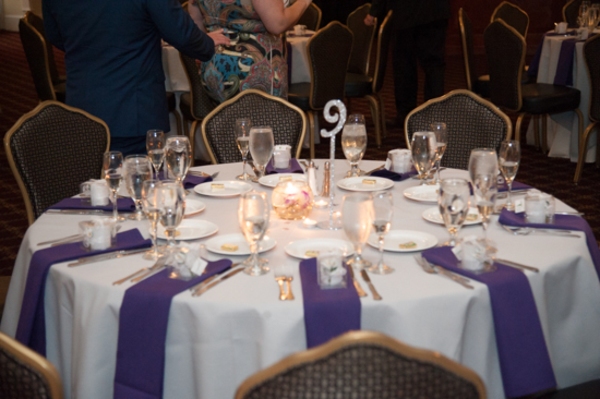 Of course, the party was only beginning now! 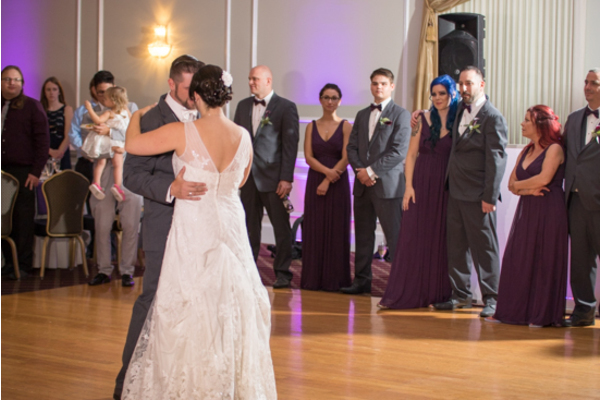 Following the touching ceremony, indoors at The Palace was a wide-open dance floor that guests would spend the night showing off their moves! 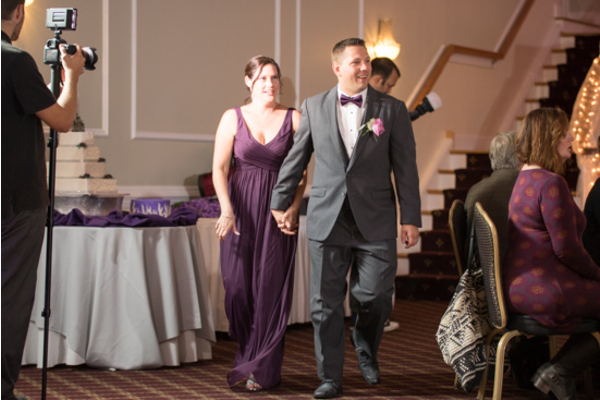 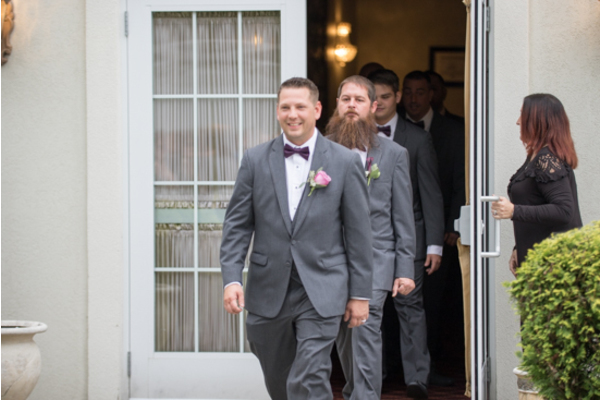 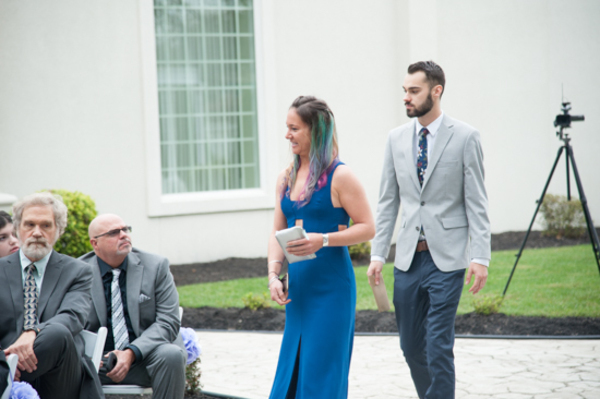 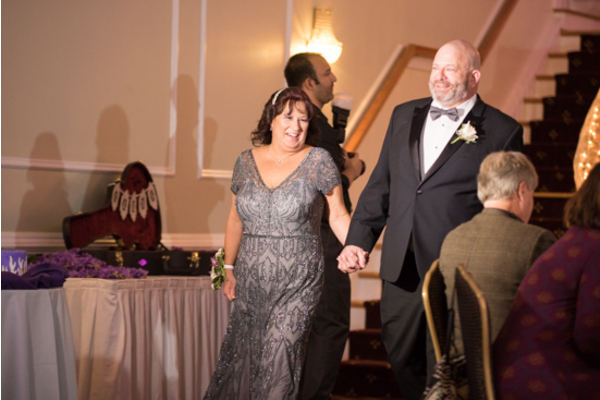 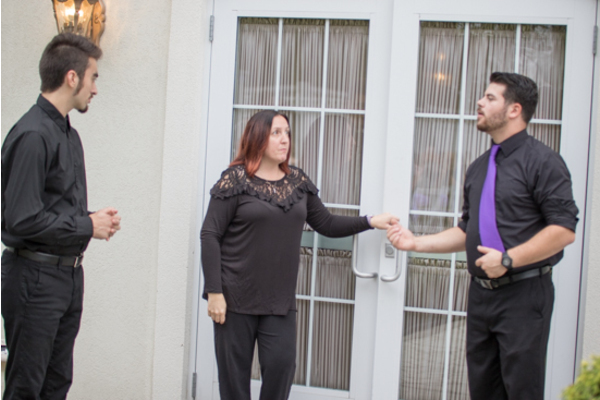 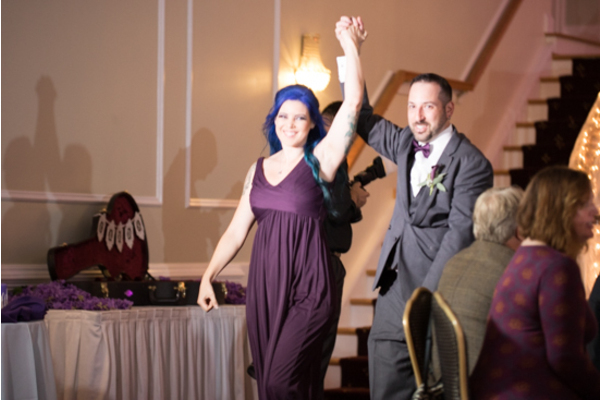 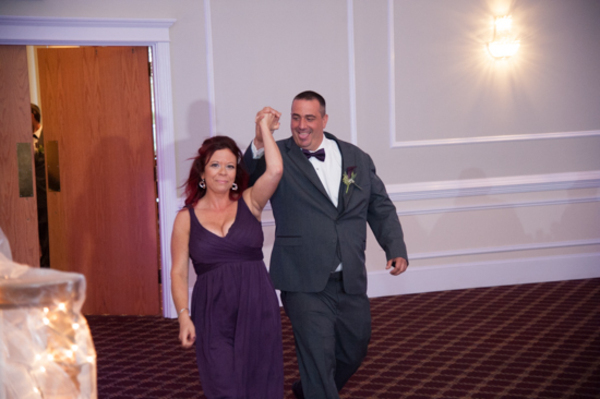 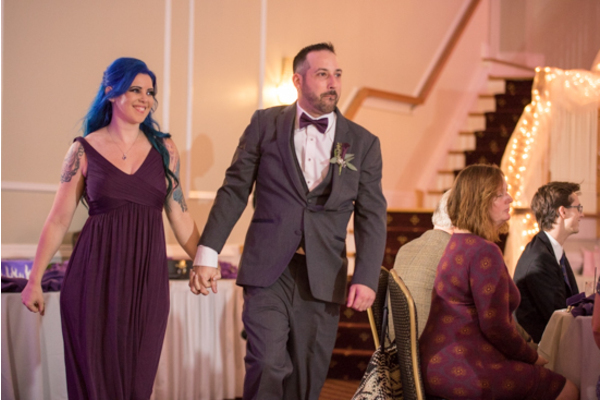 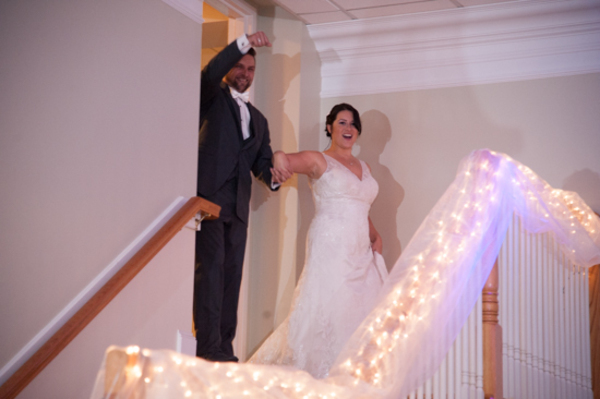 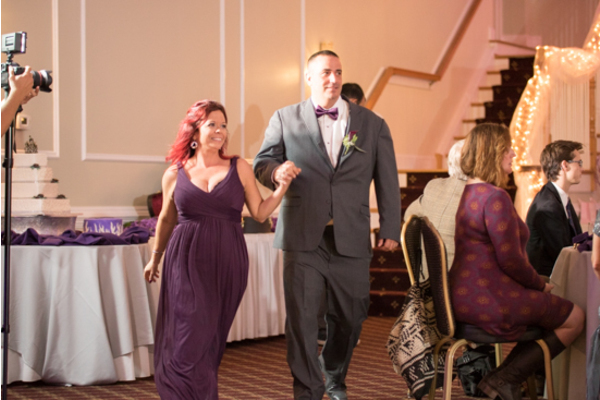 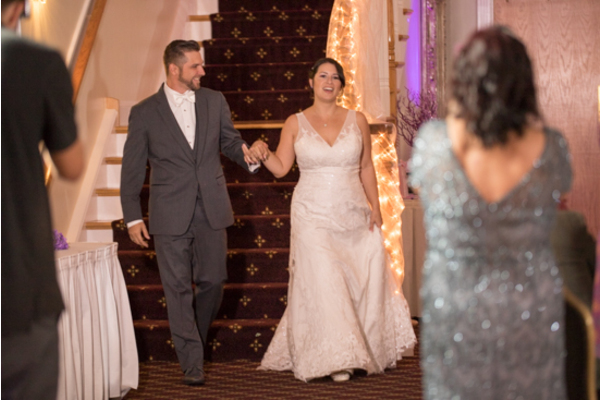 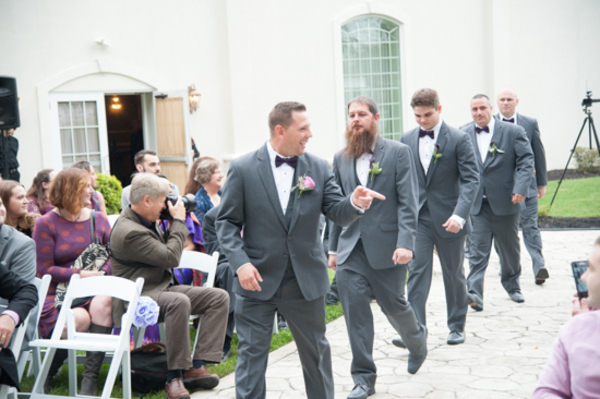 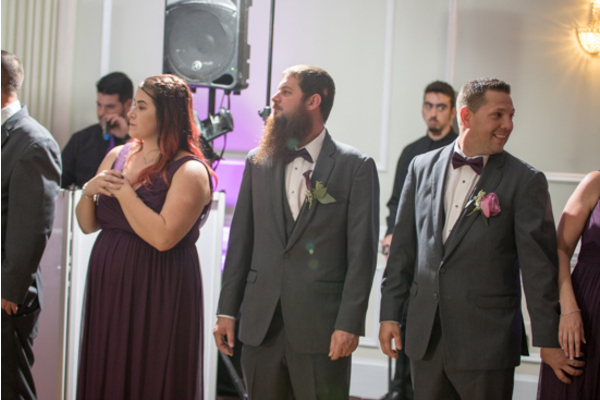 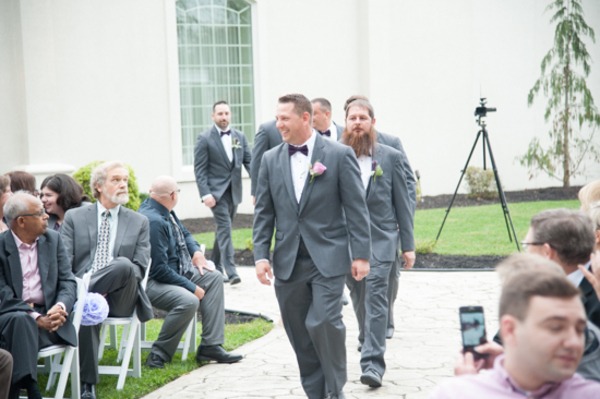 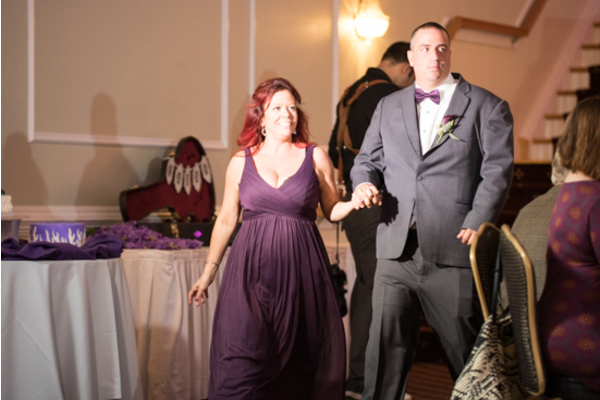 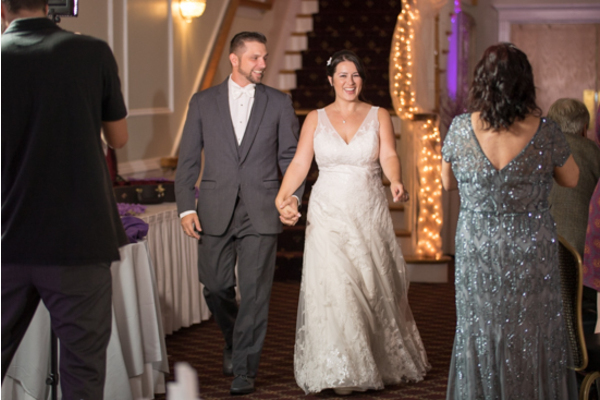 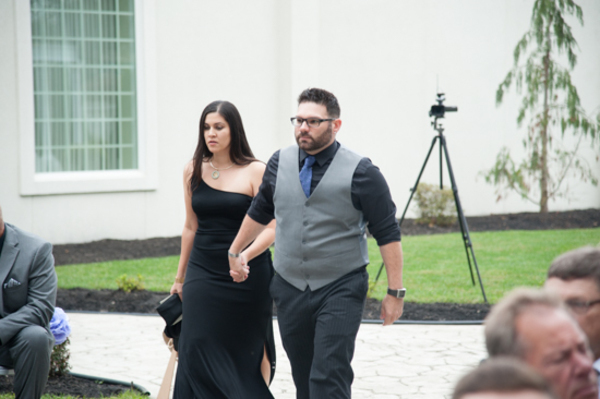 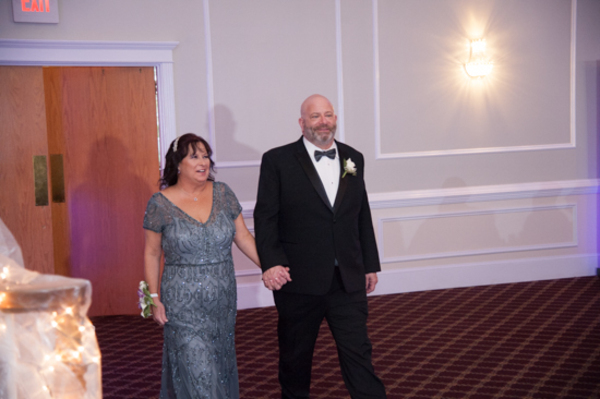 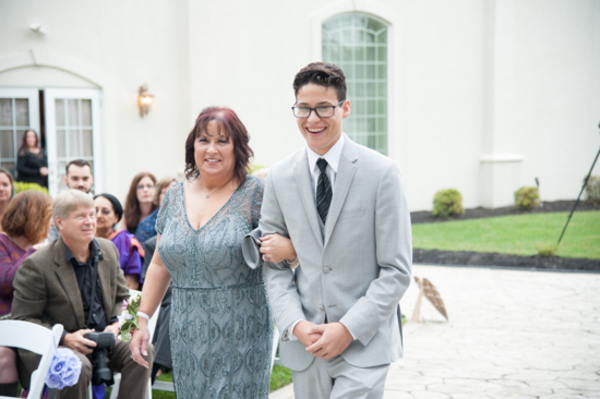 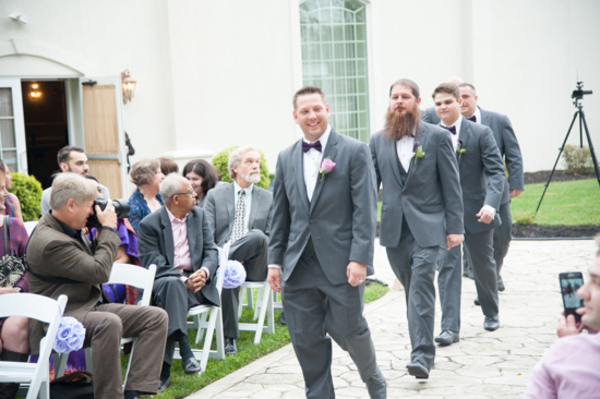 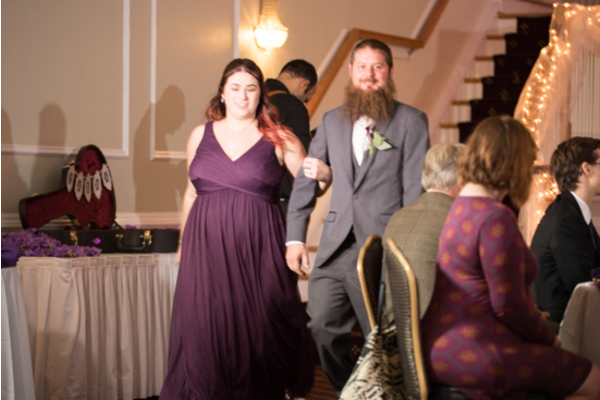 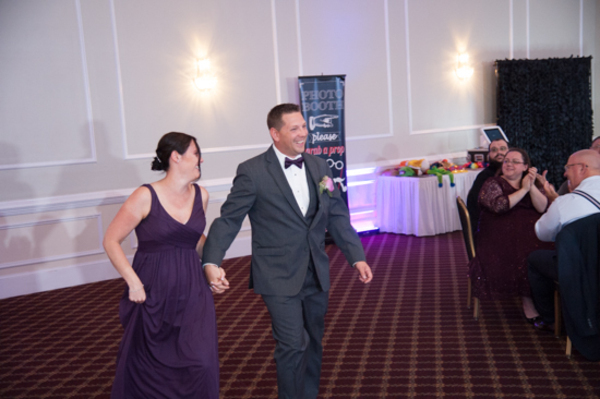 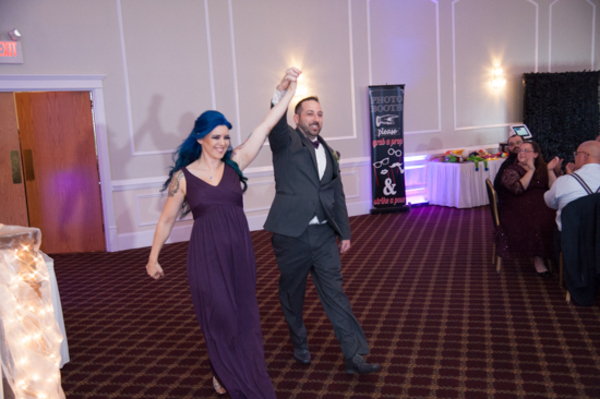 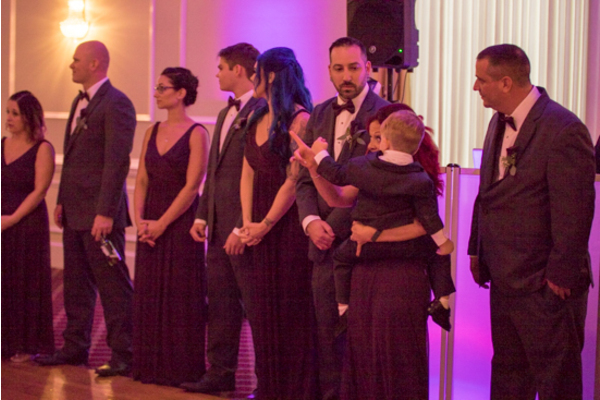 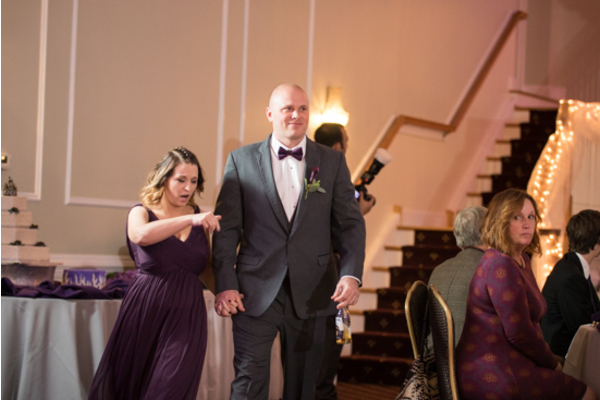 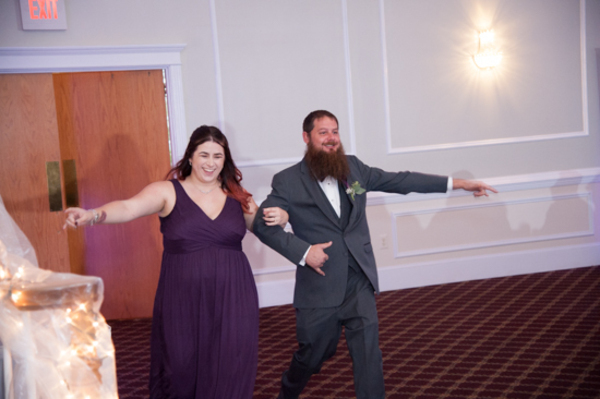 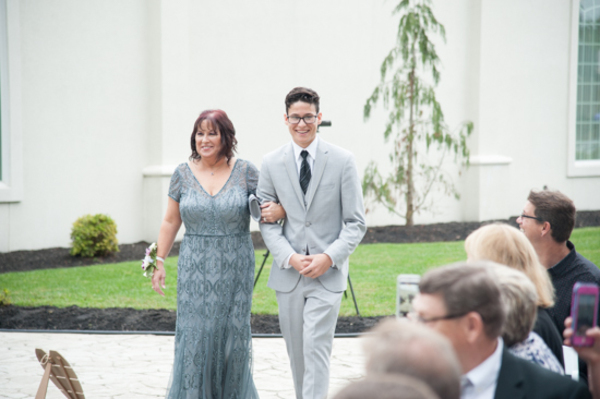 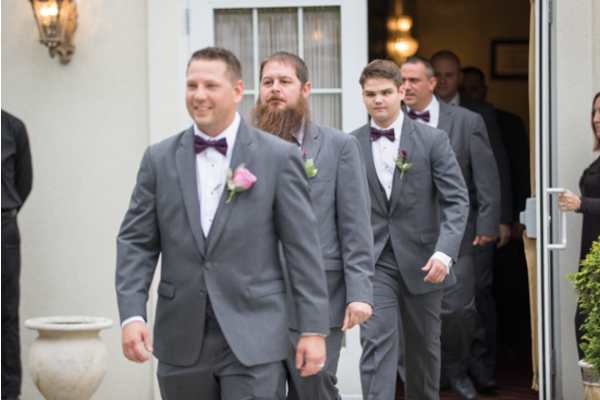 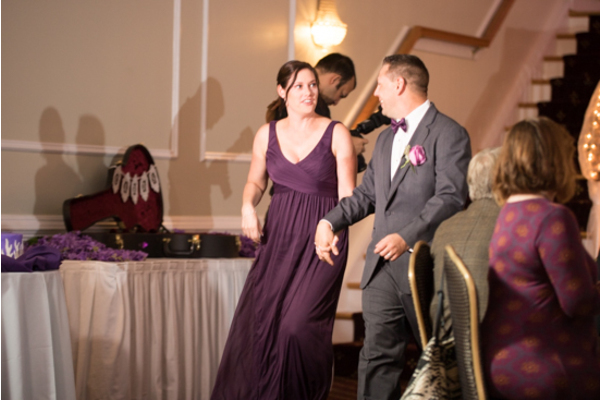 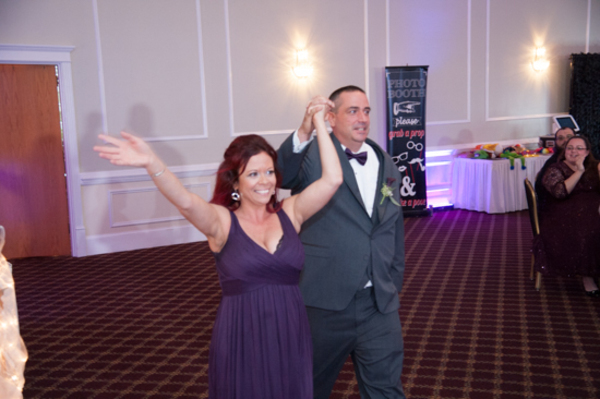 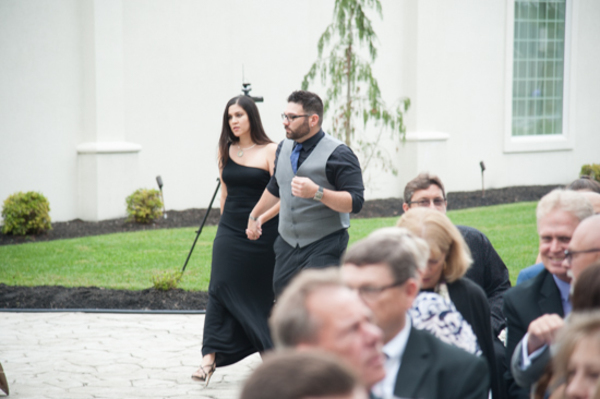 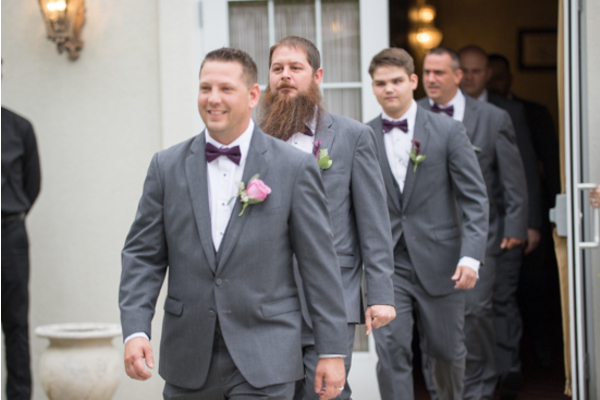 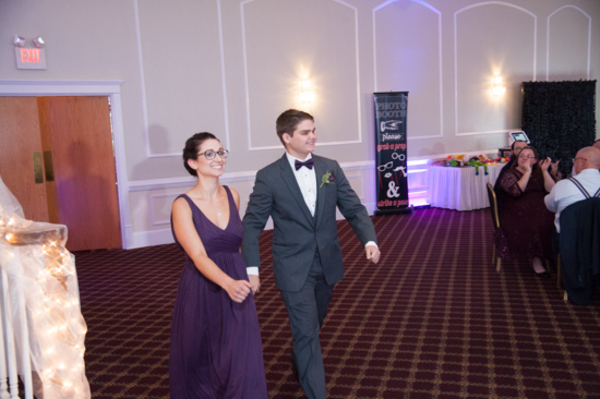 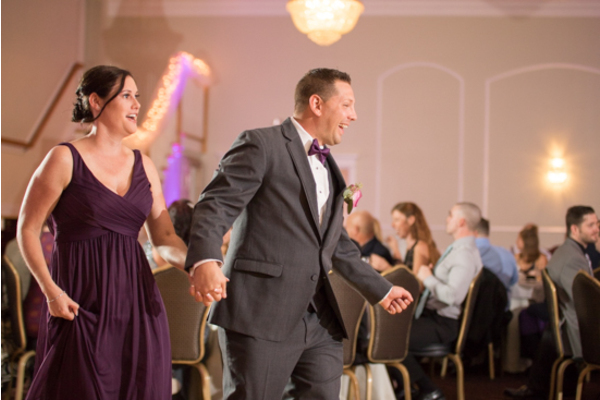 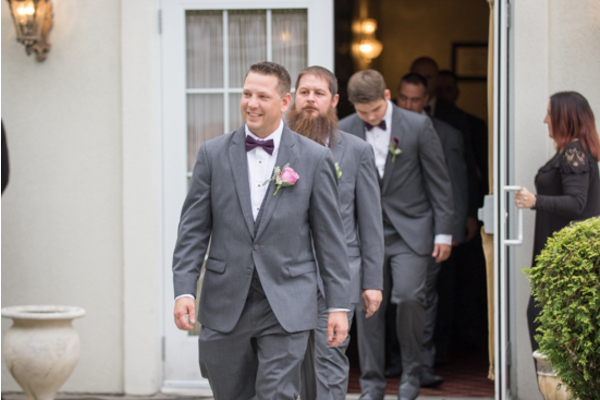 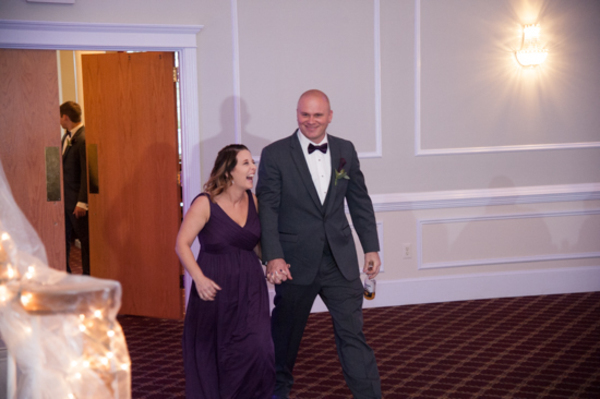 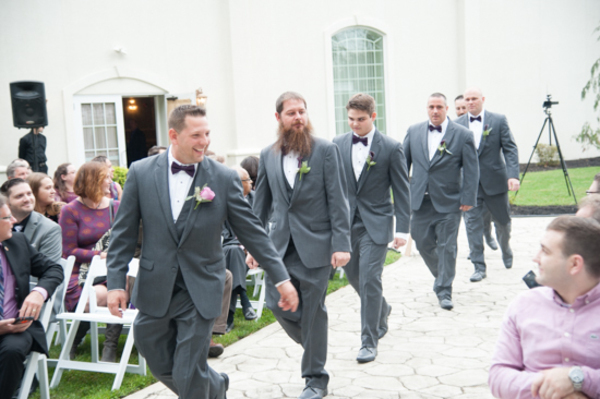 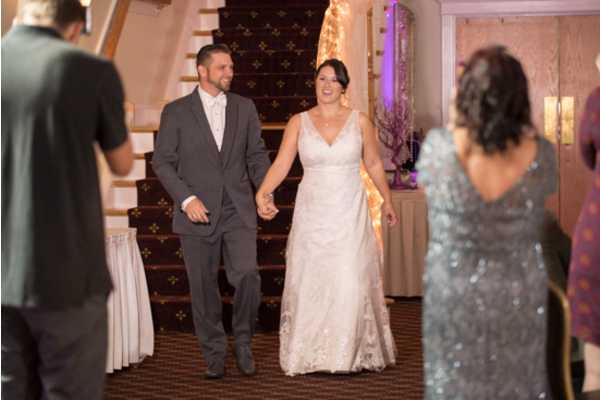 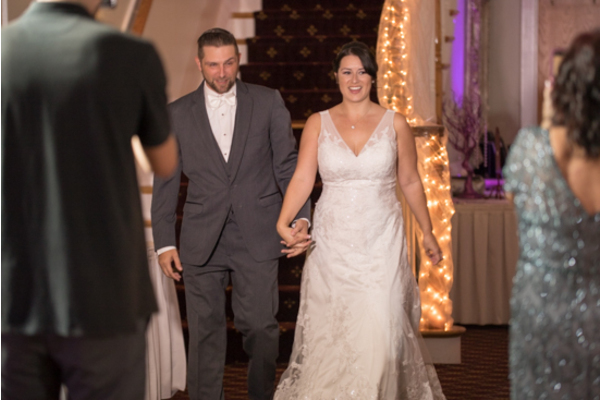 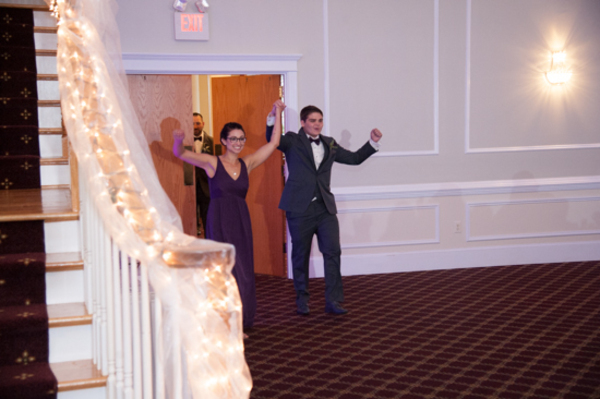 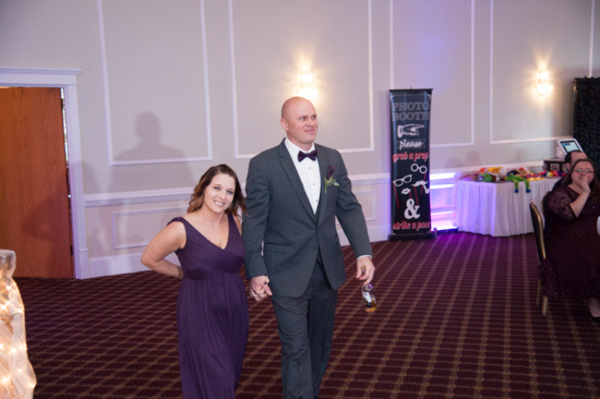 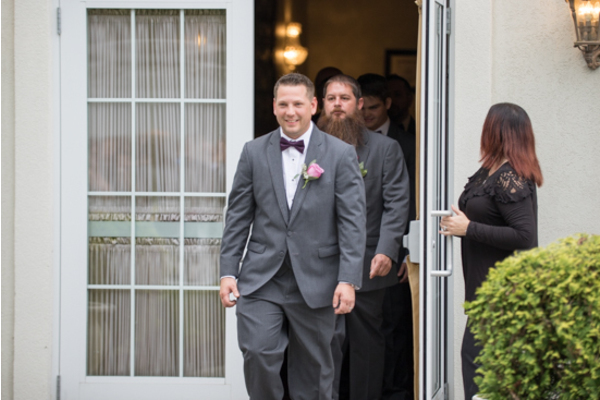 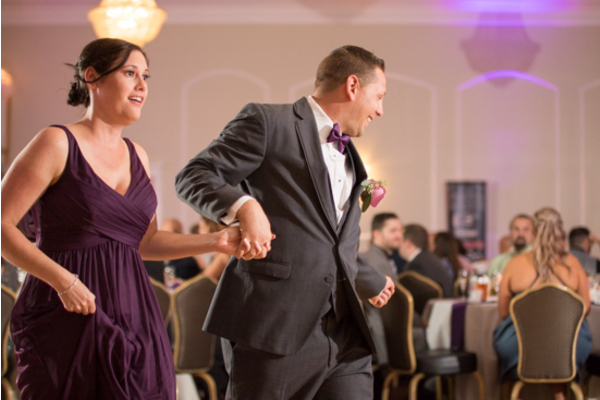 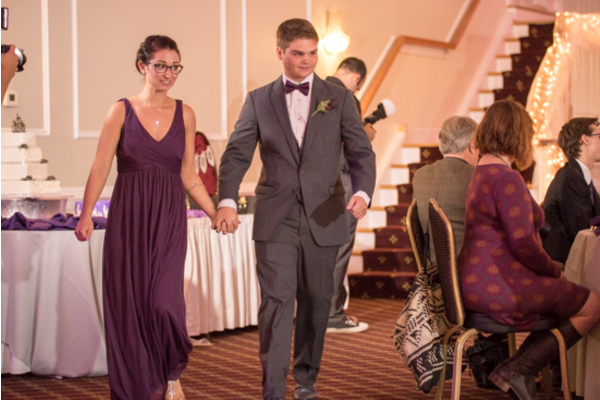 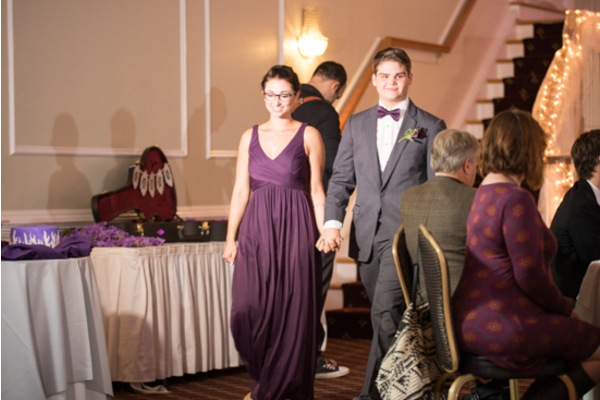 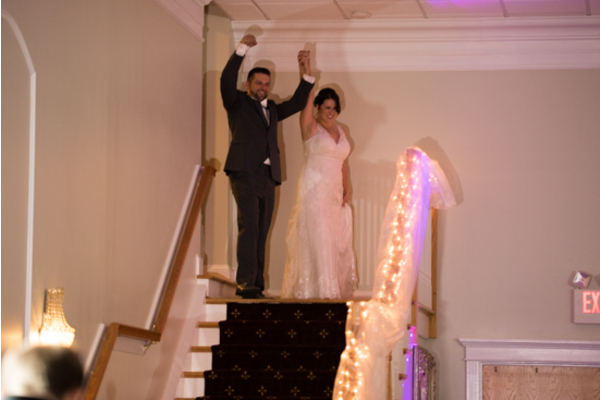 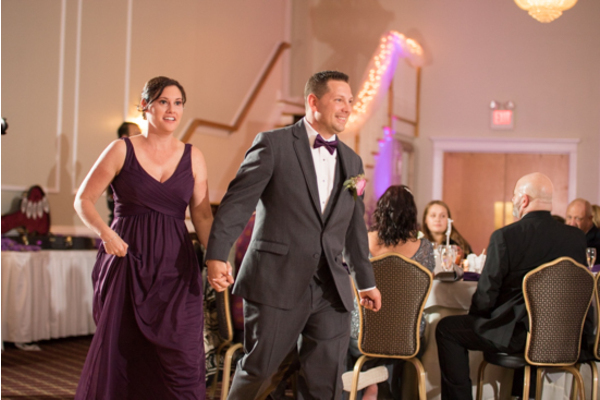 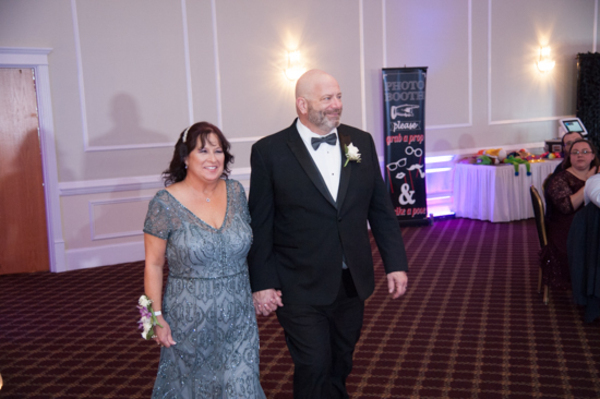 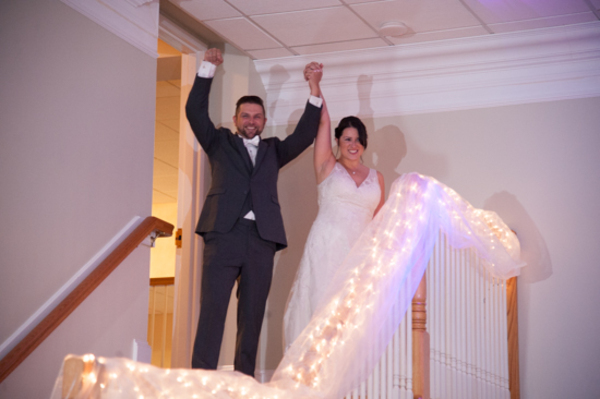 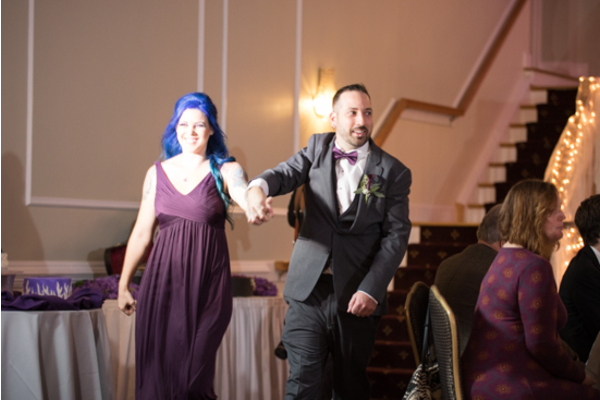 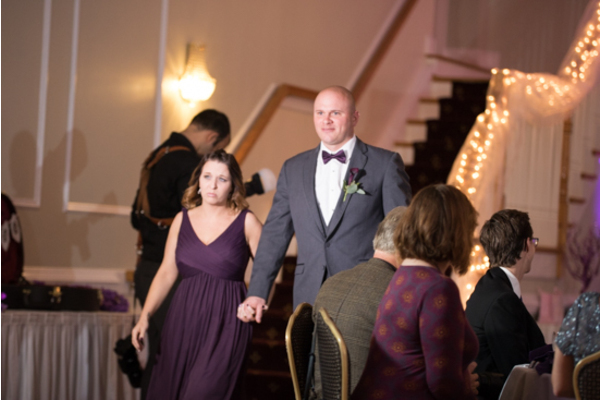 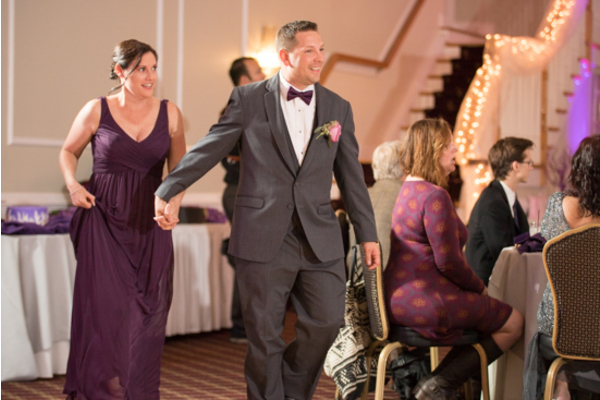 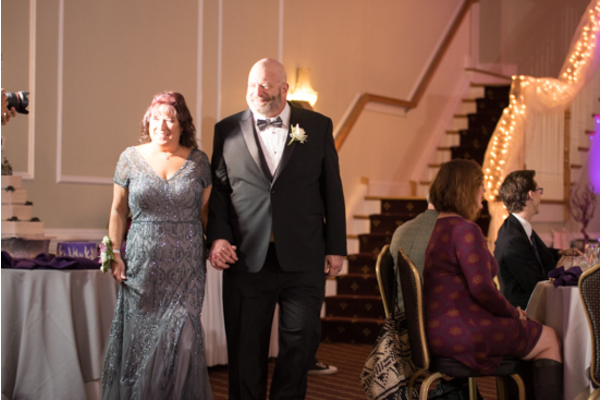 Megan and David made their entrance and set the tone for the fun energy and love that would fill the room all night. 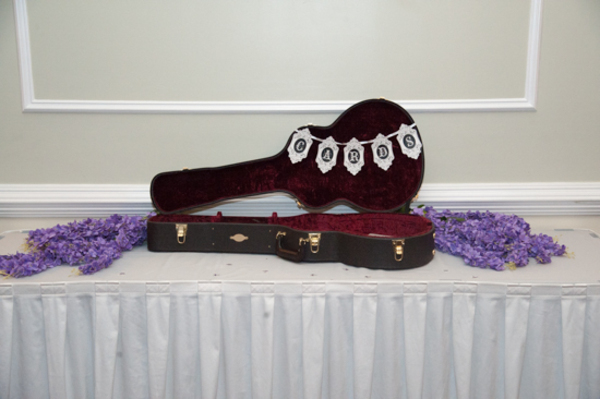 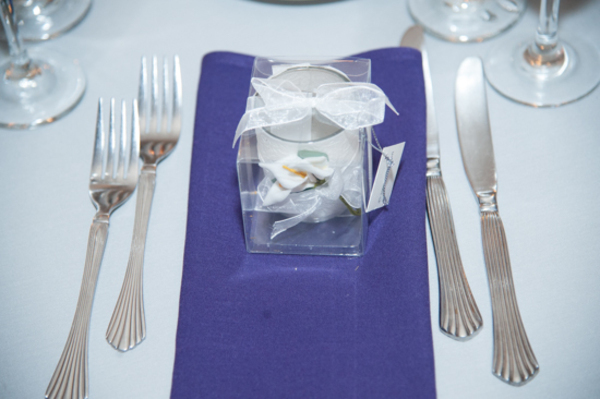 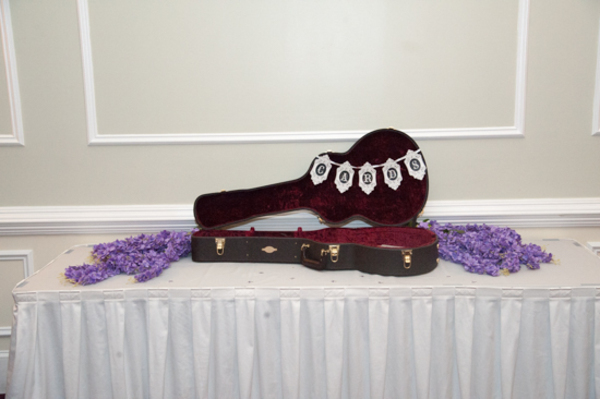 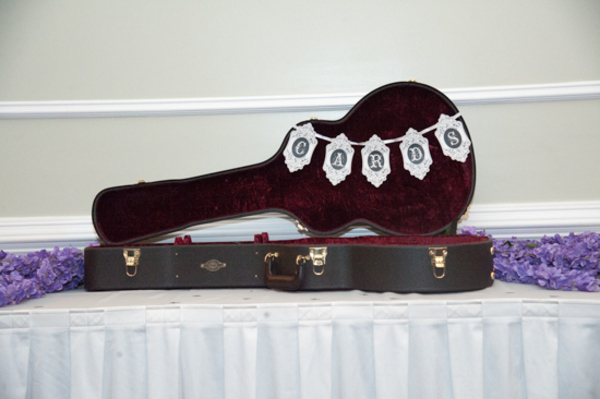 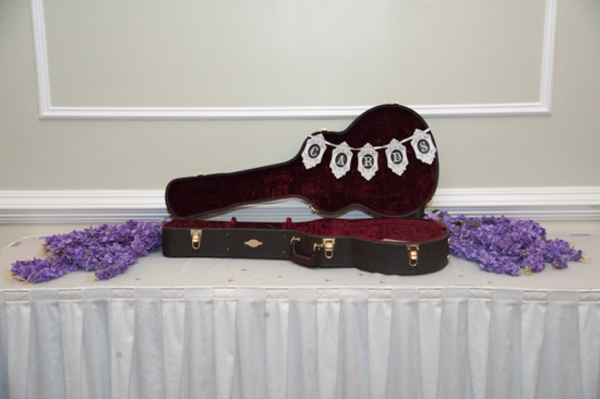 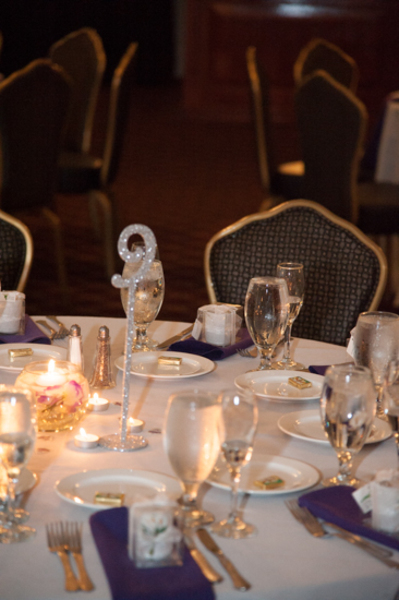 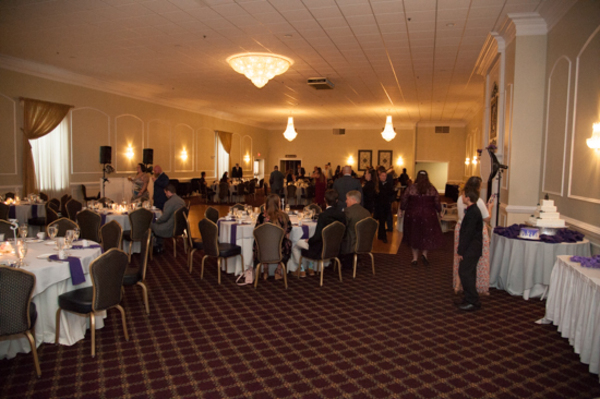 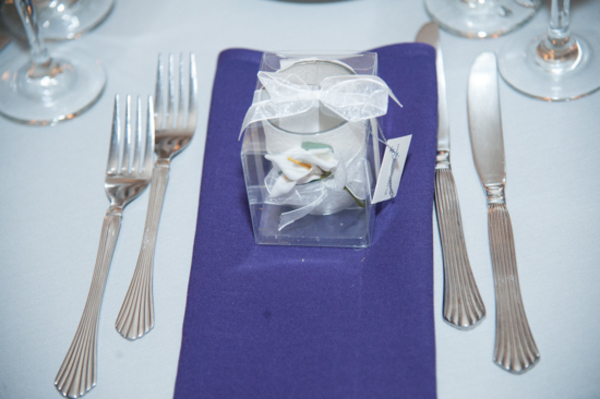 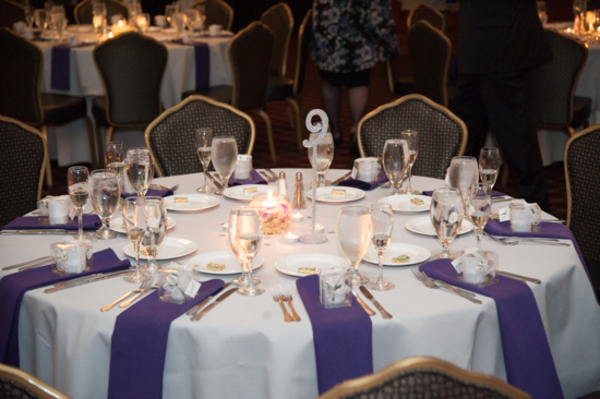 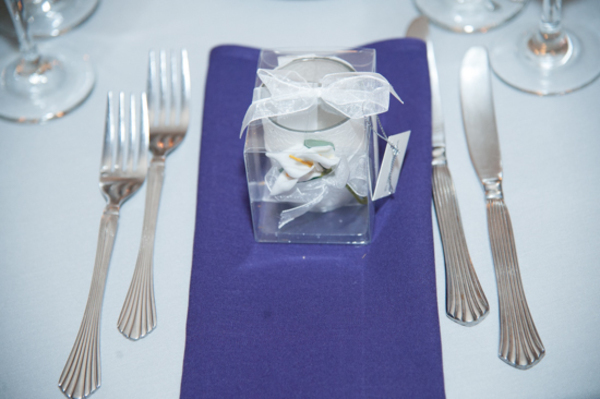 The ballroom was also decorated beautifully with vibrant purple lighting and details. 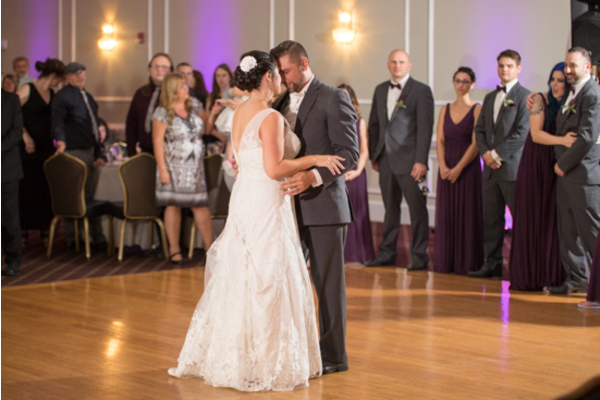 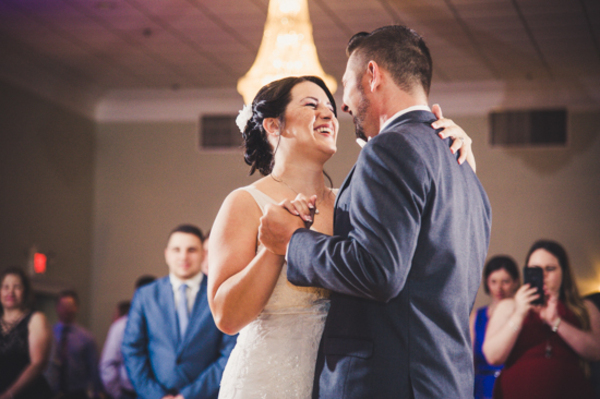 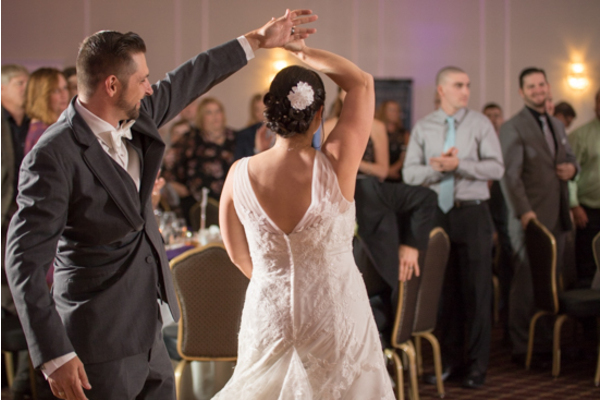 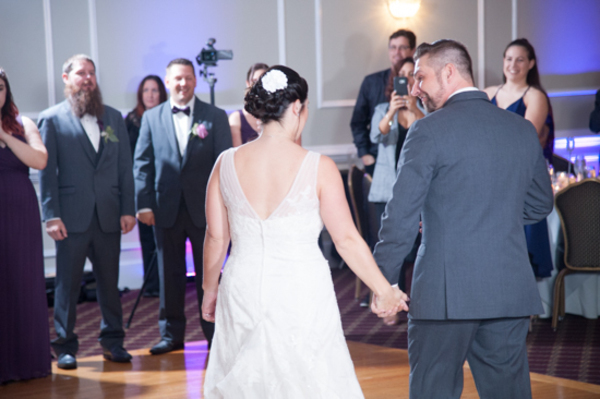 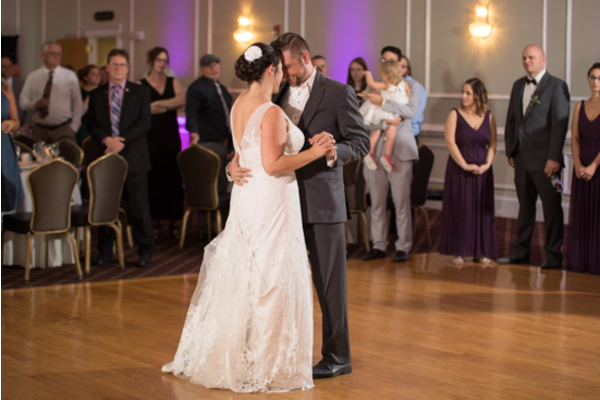 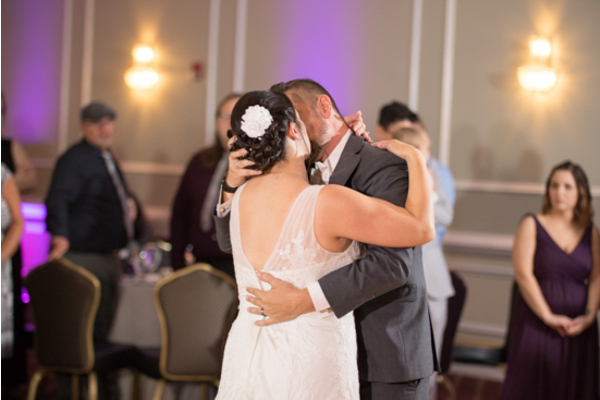 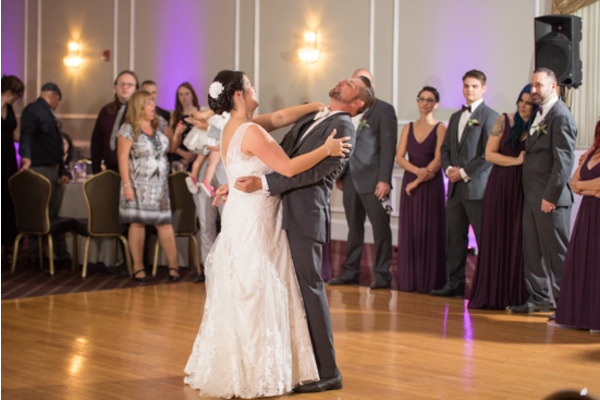 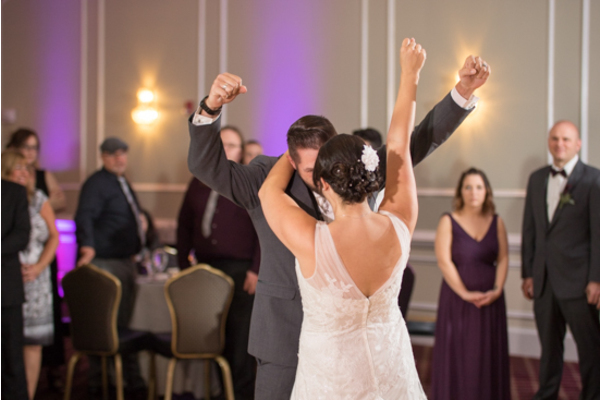 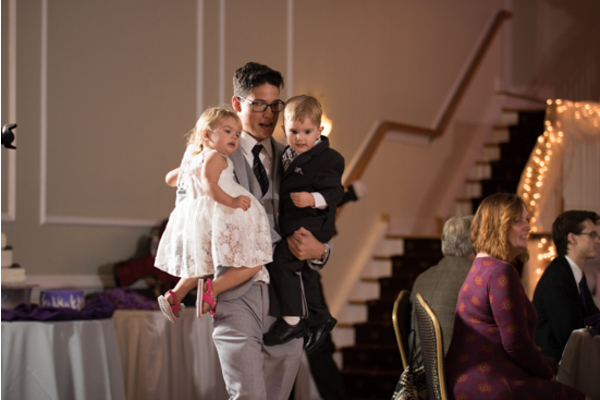 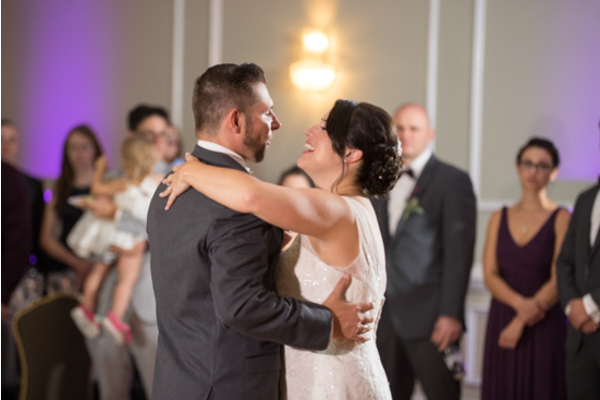 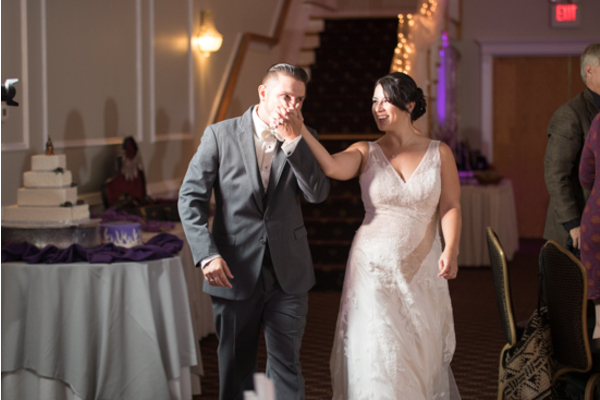 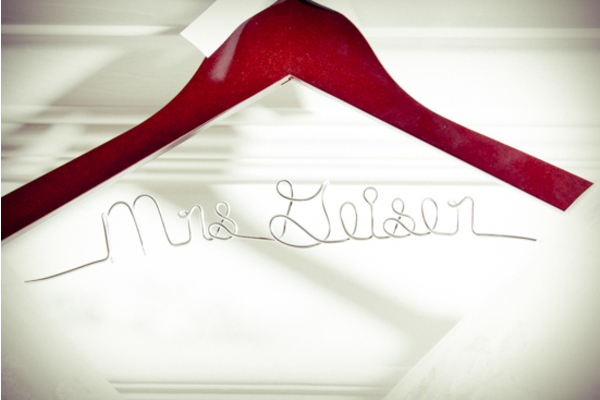 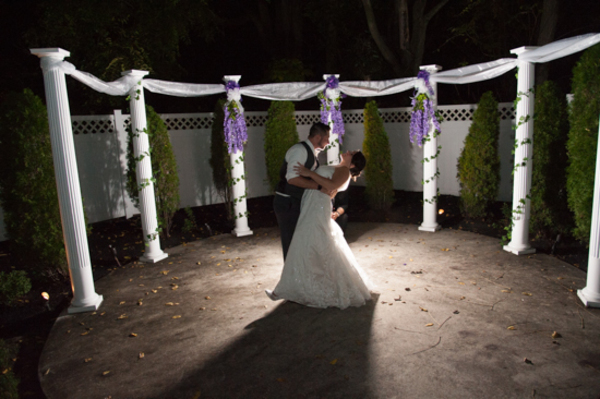 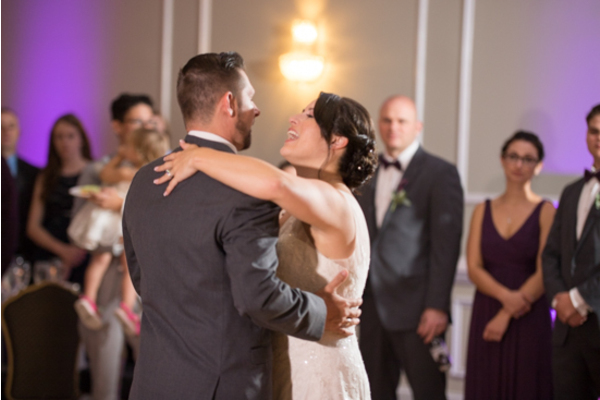 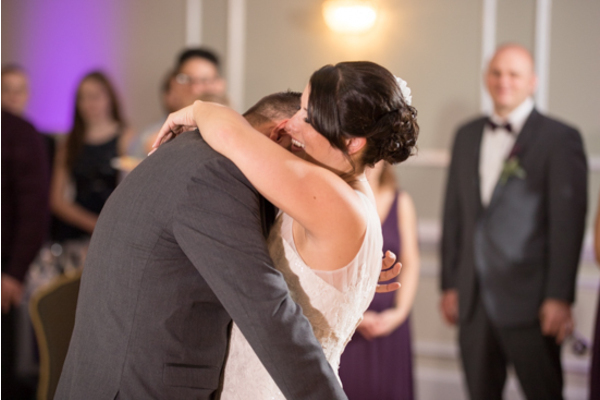 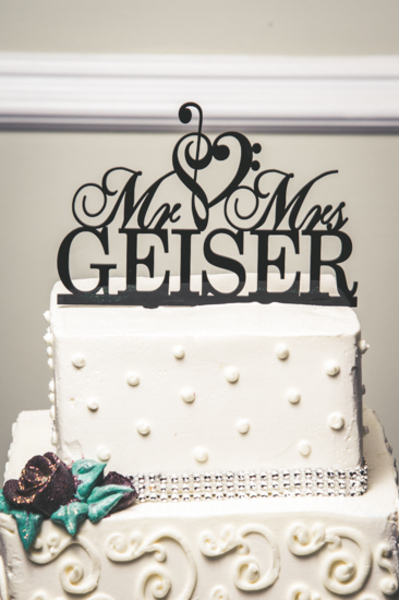 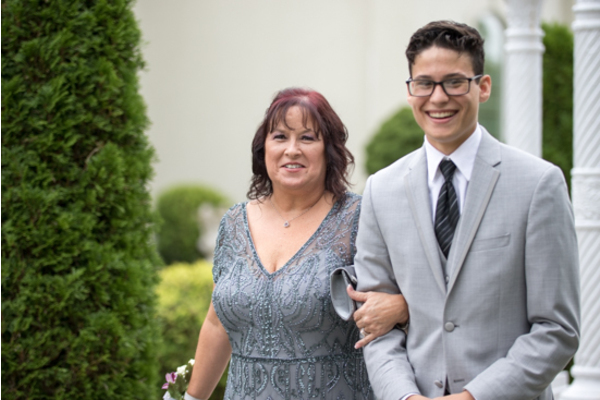 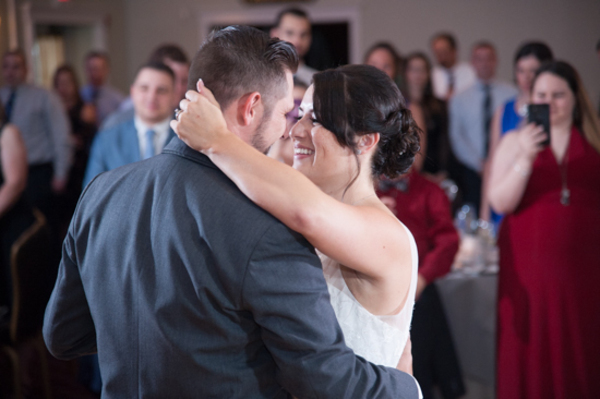 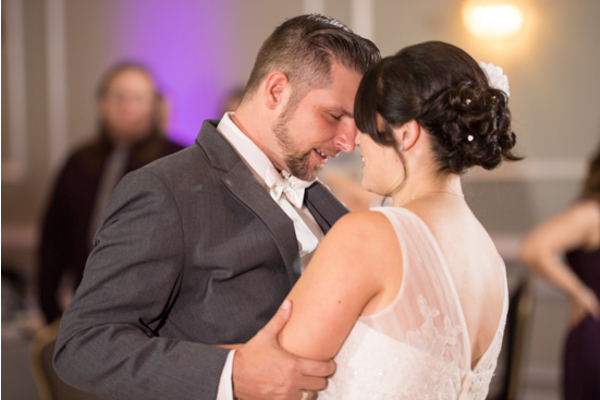 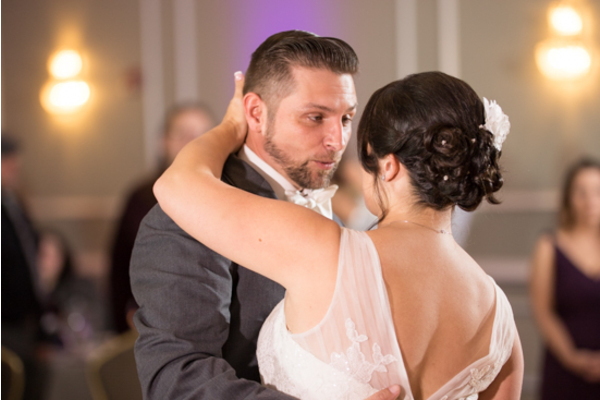 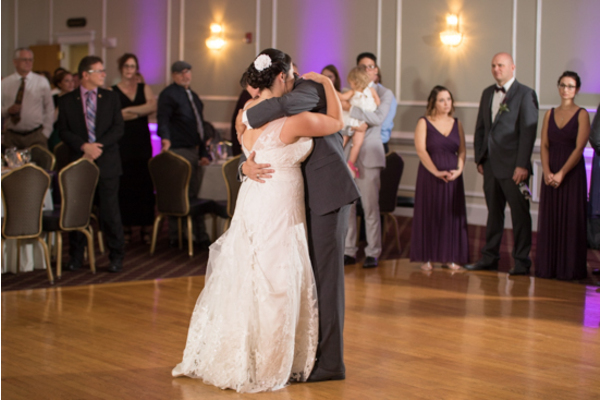 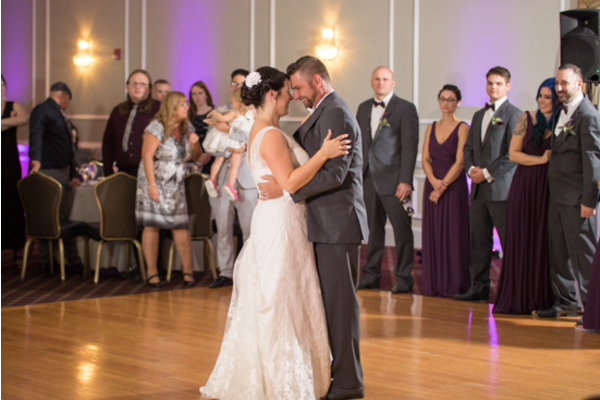 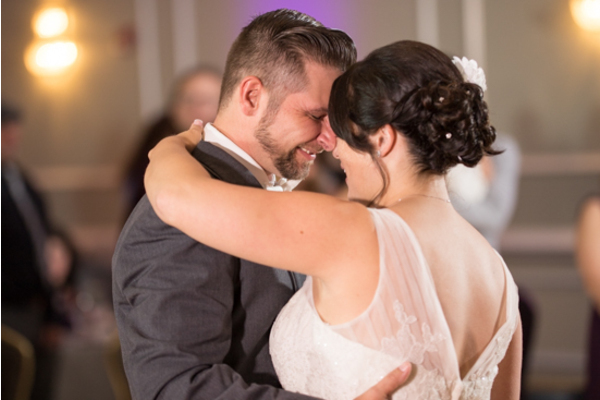 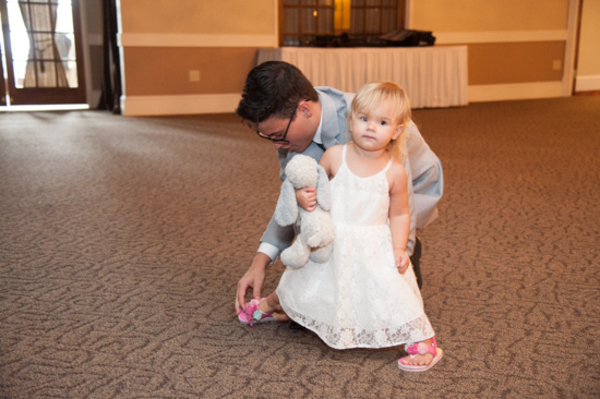 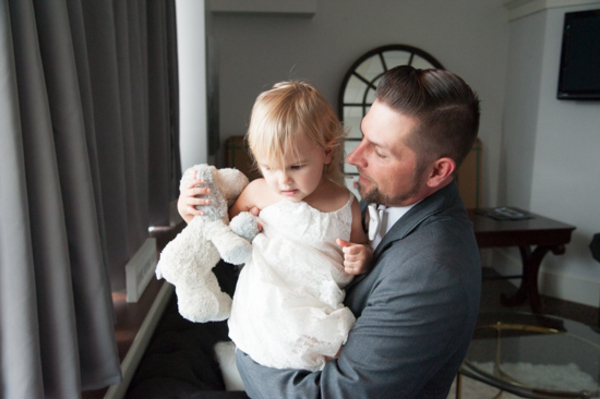 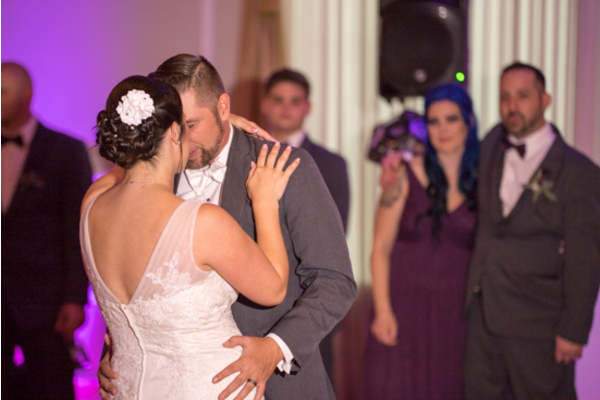 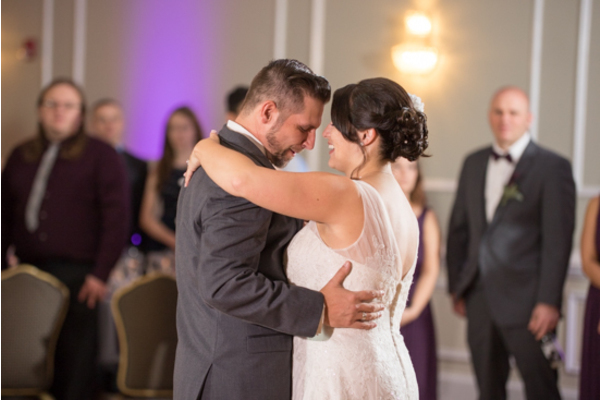 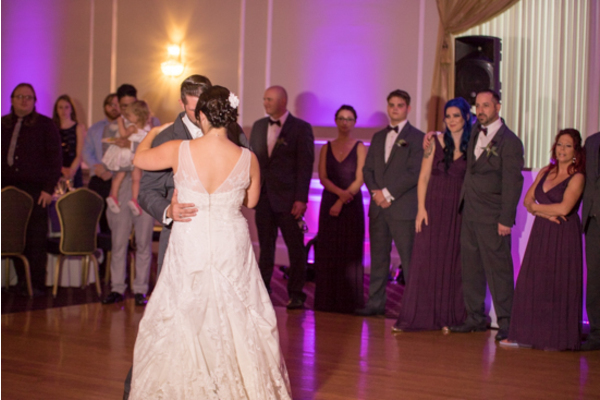 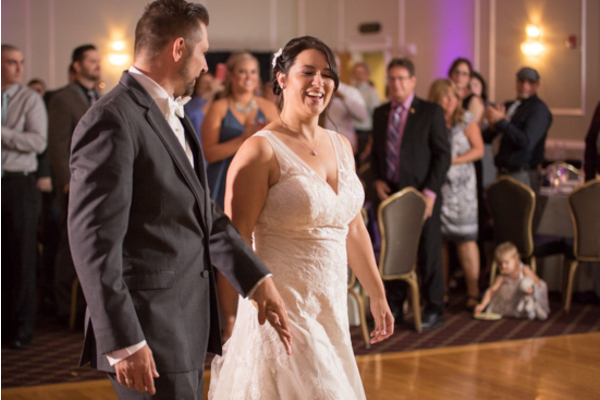 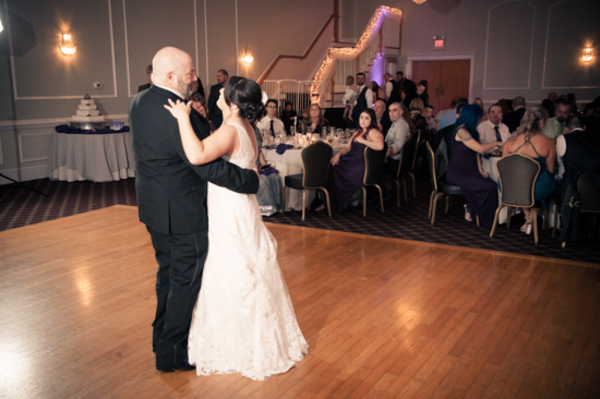 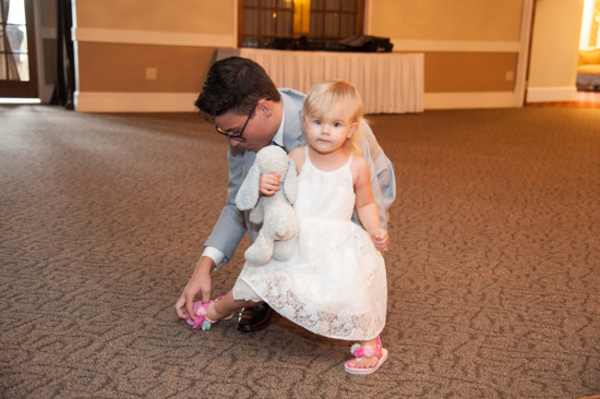 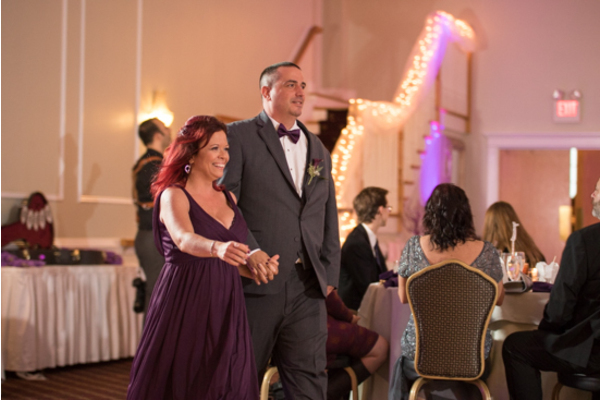 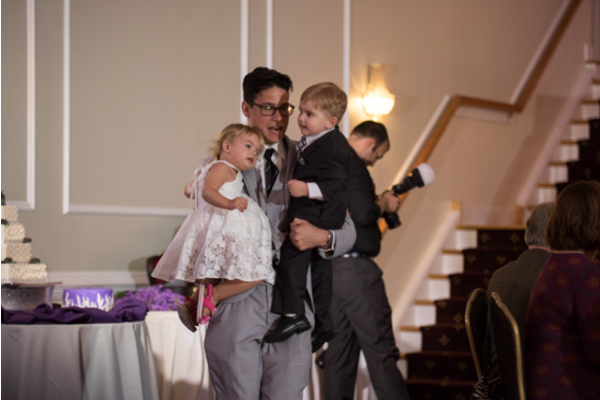 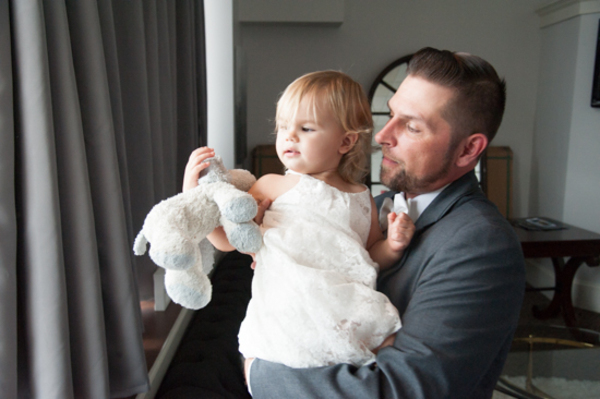 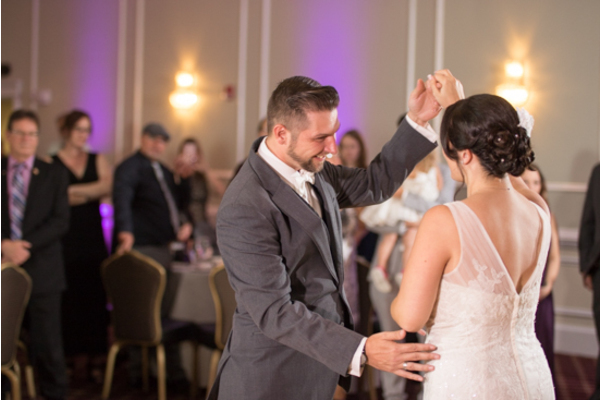 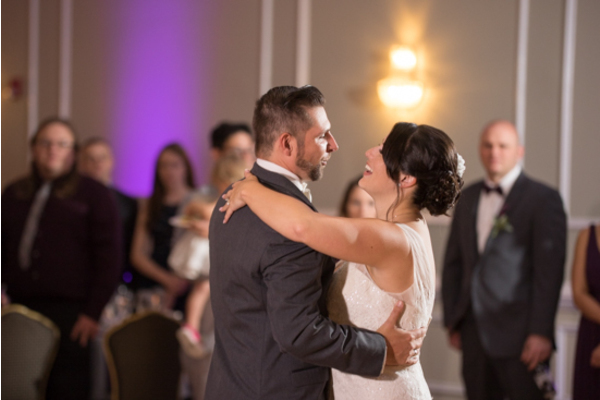 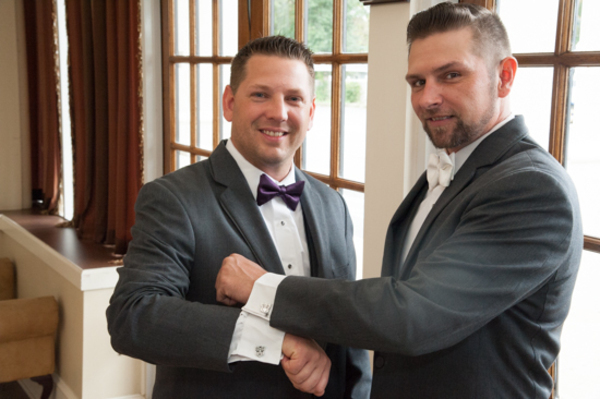 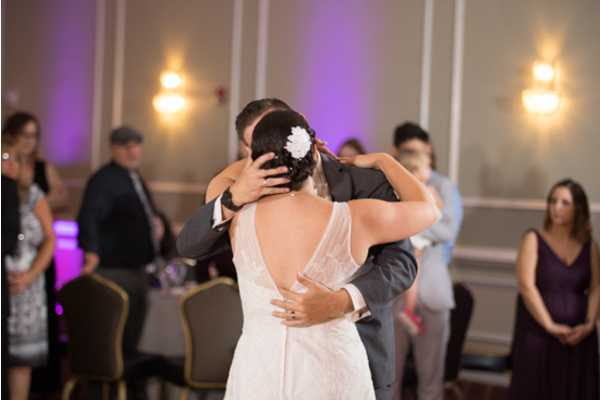 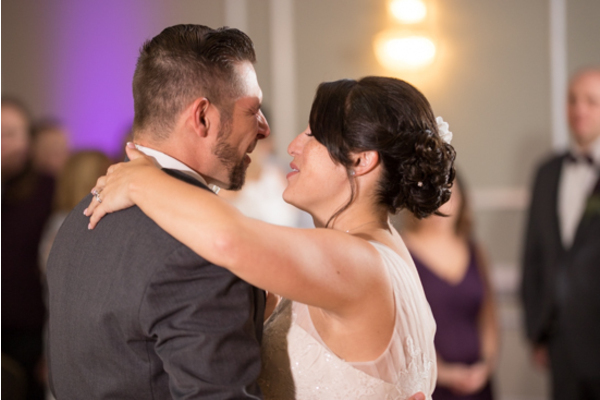 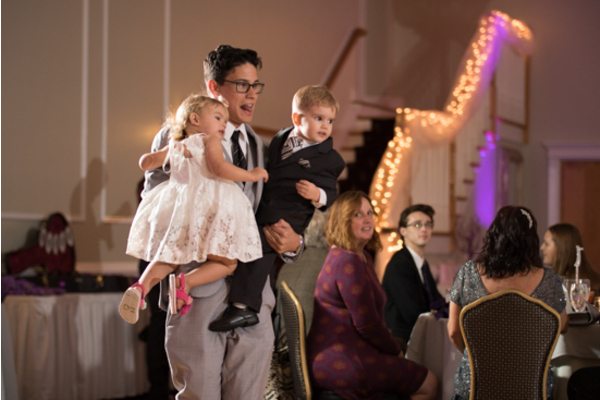 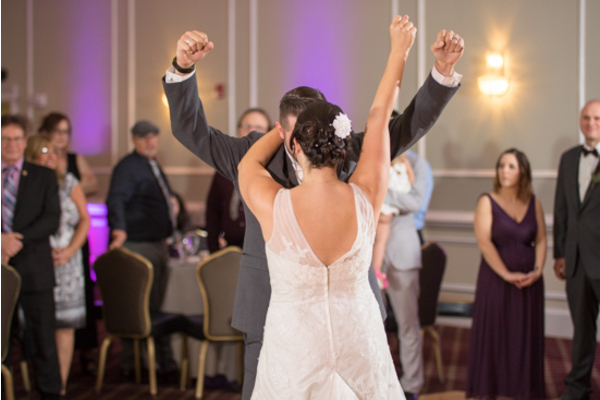 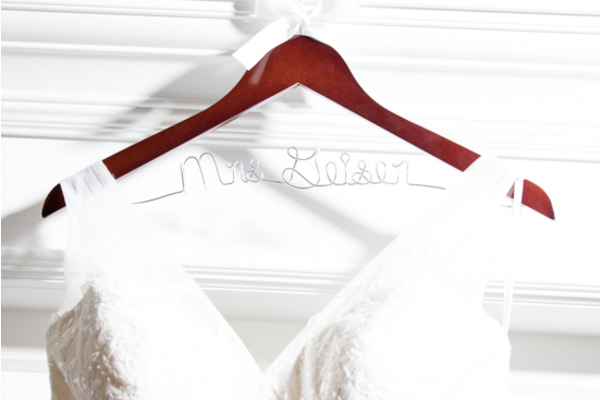 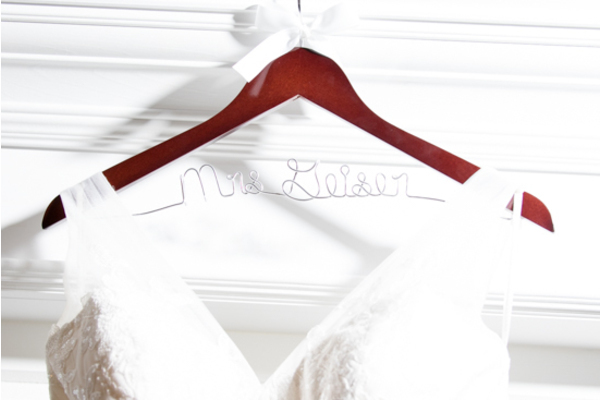 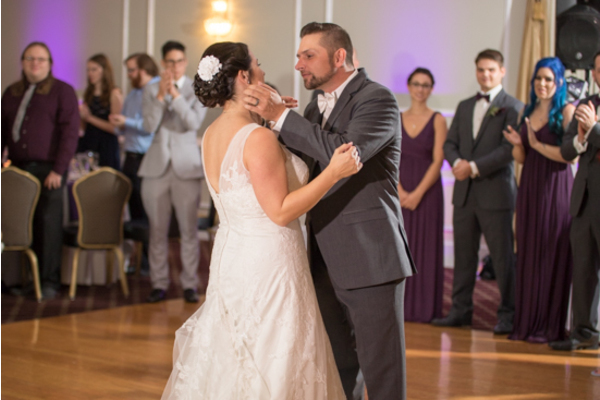 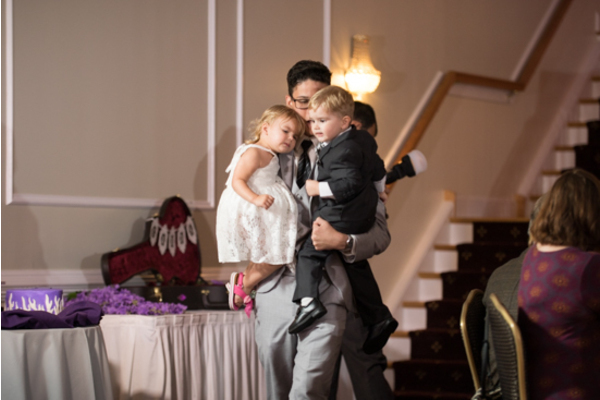 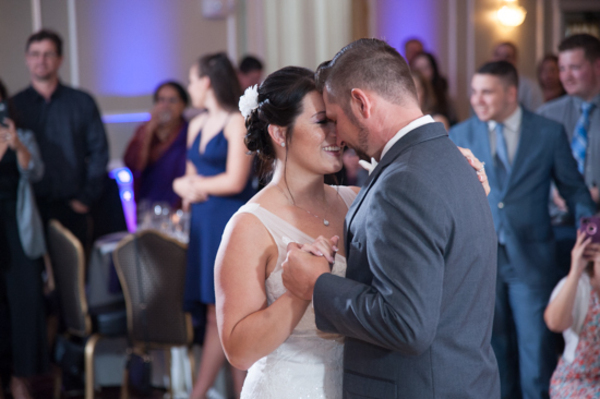 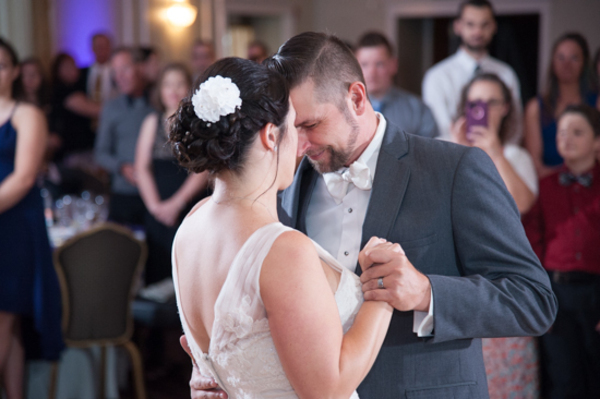 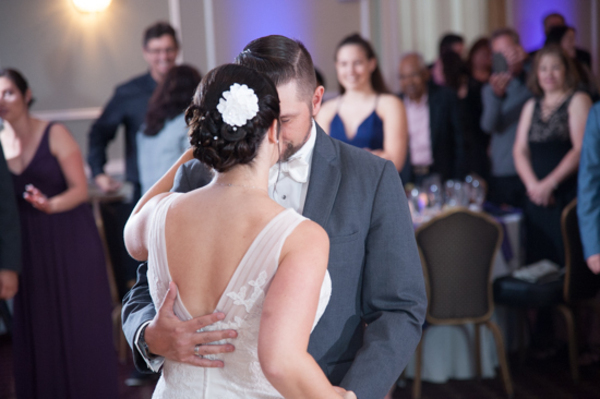 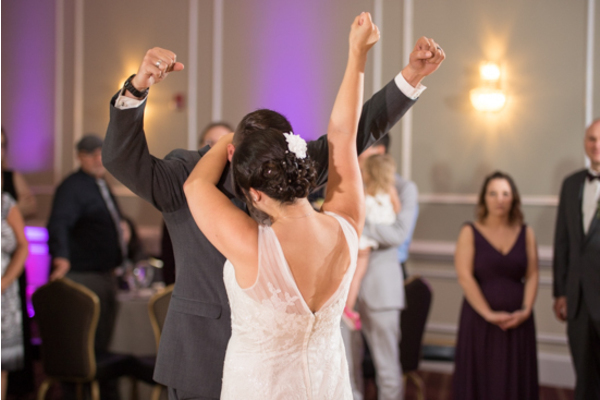 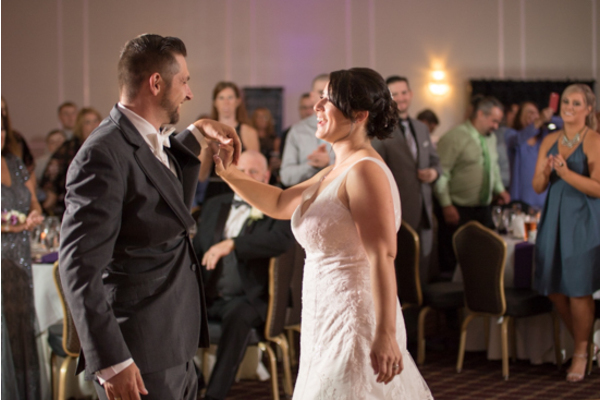 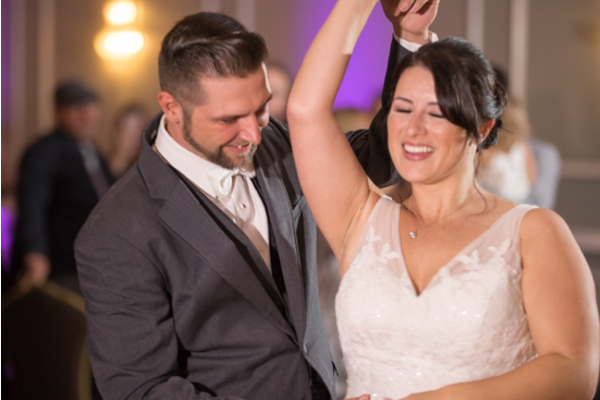 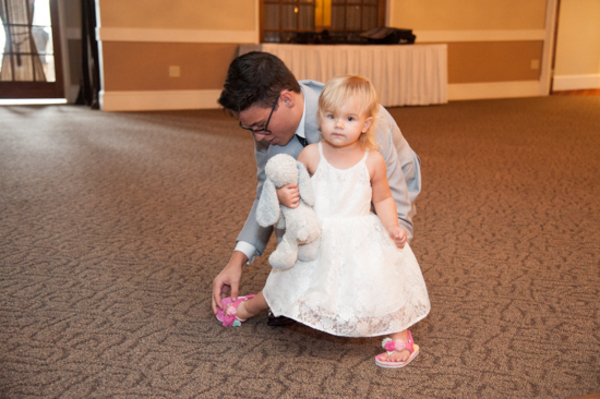 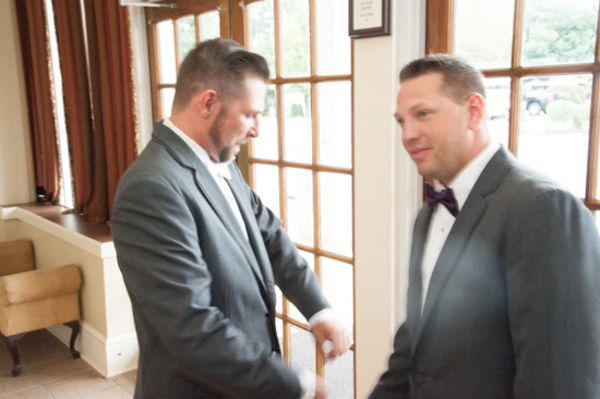 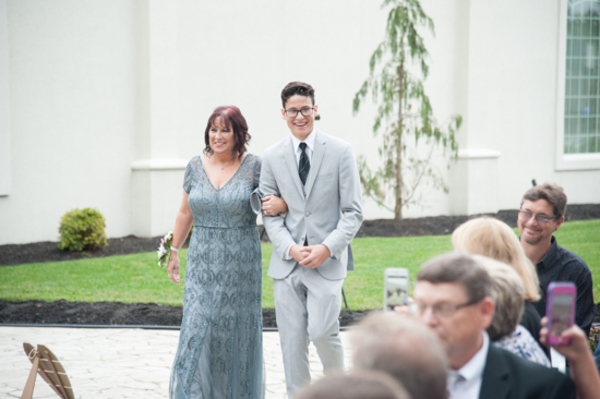 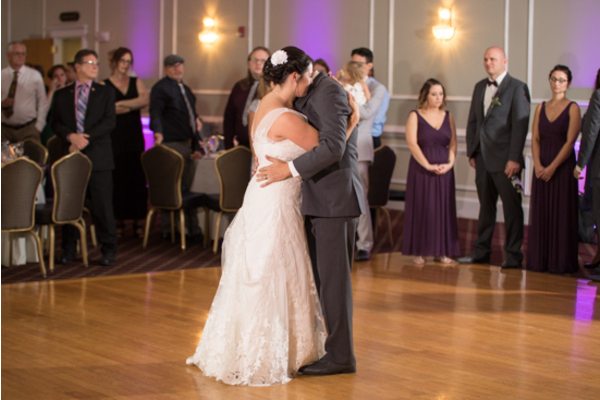 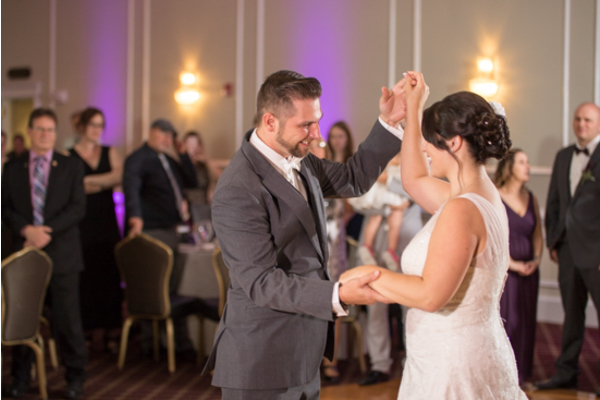 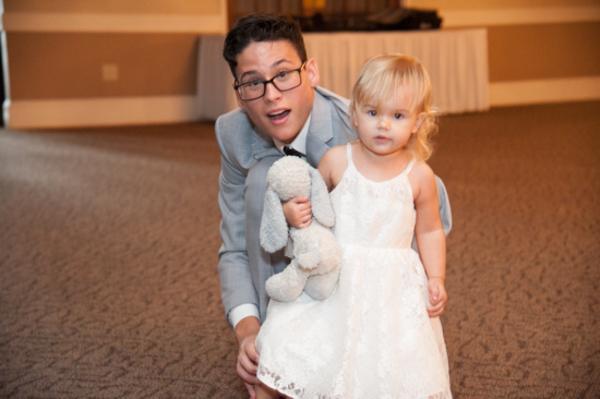 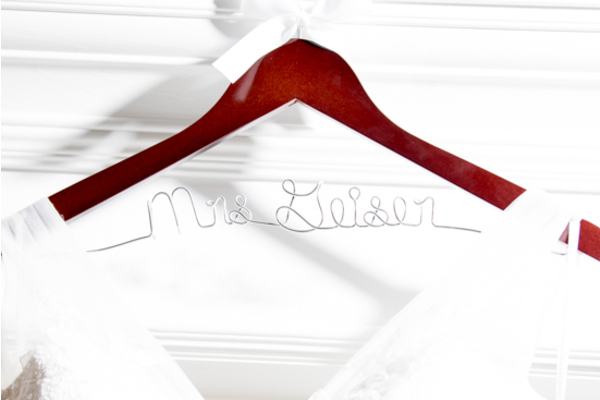 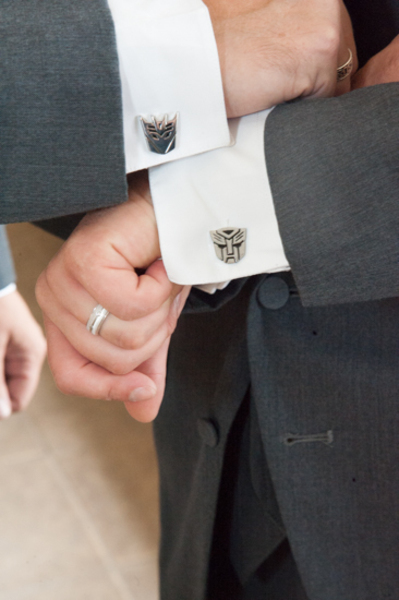 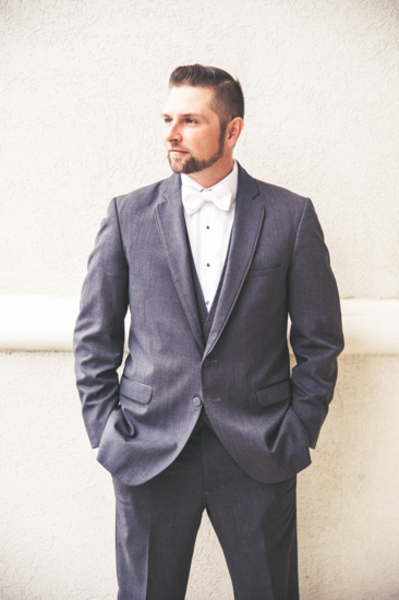 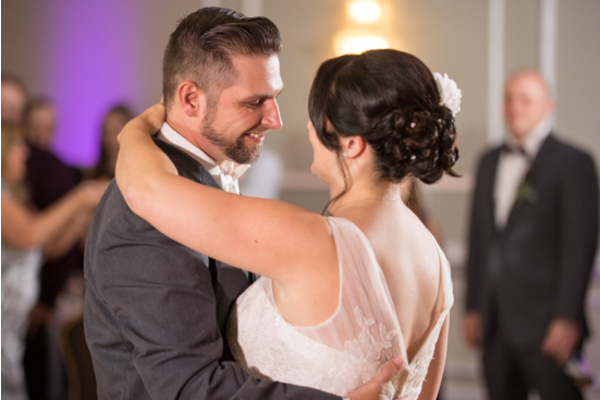 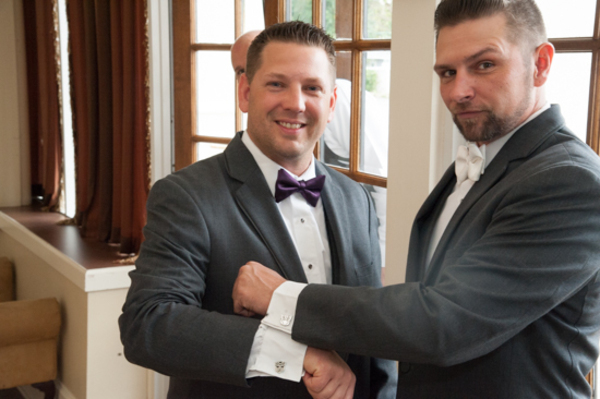 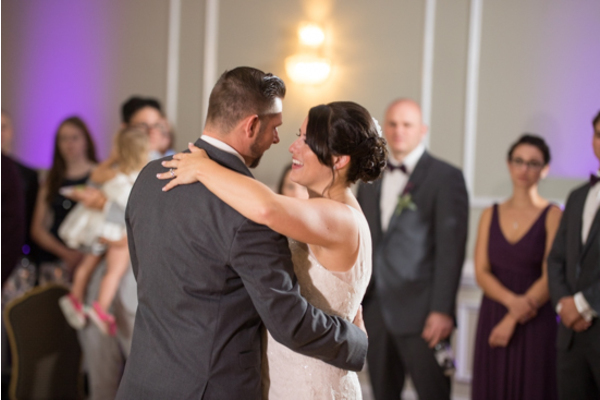 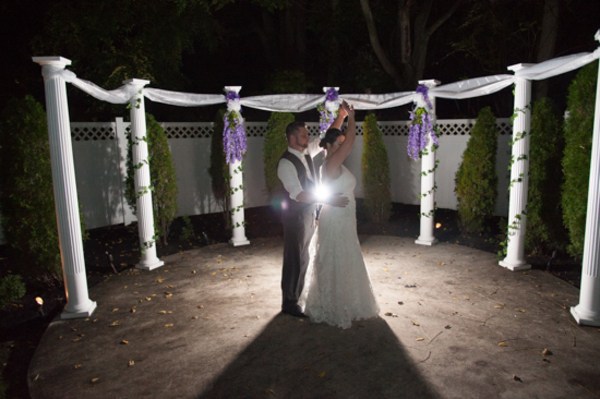 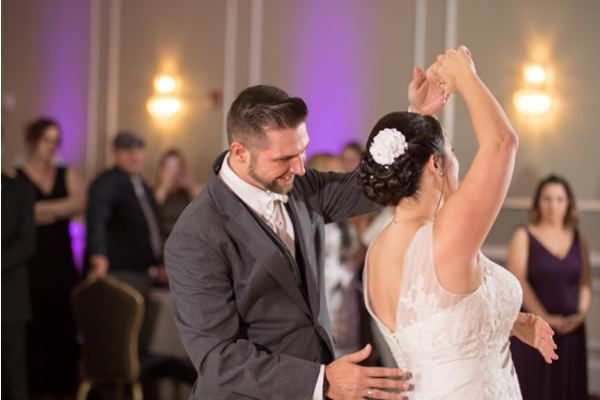 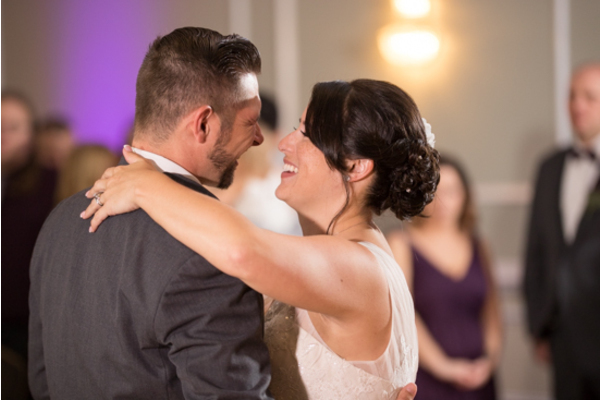 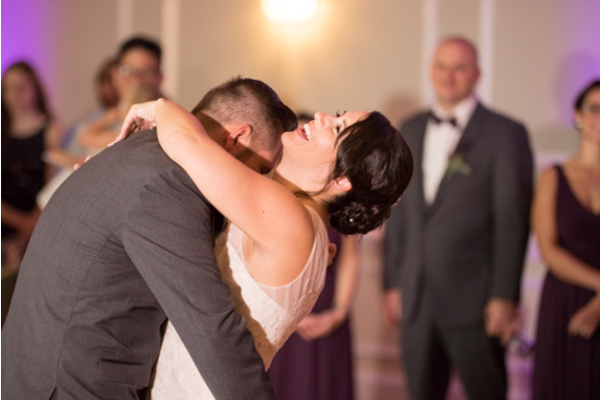 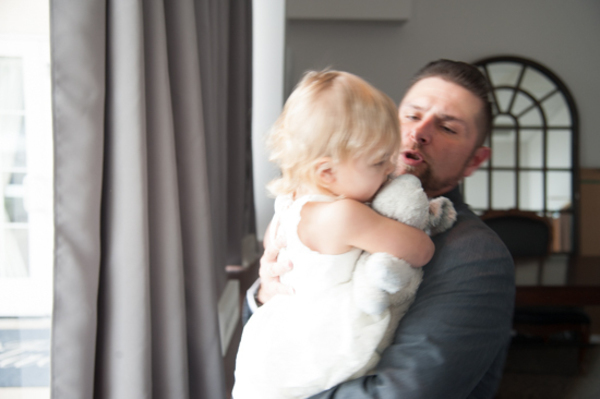 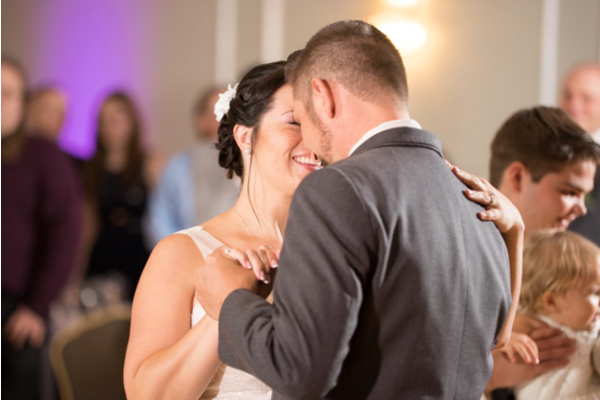 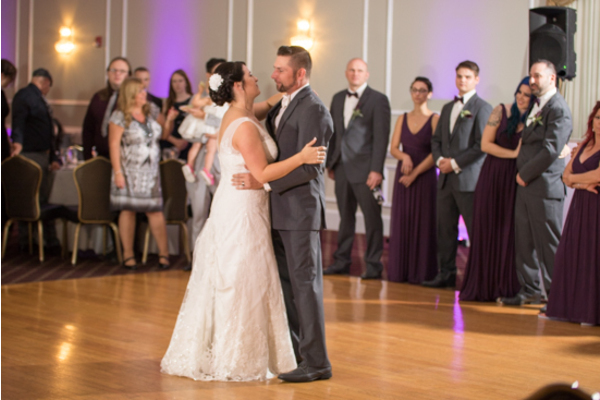 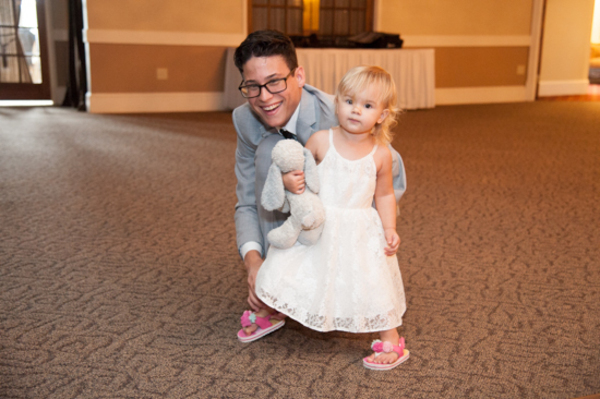 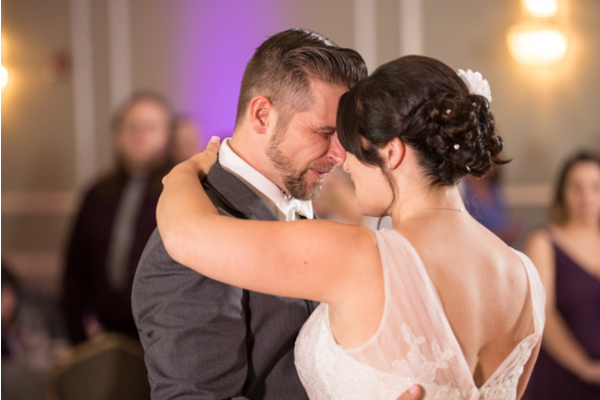 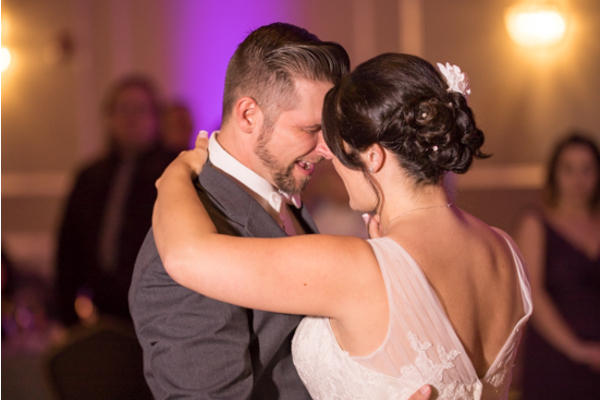 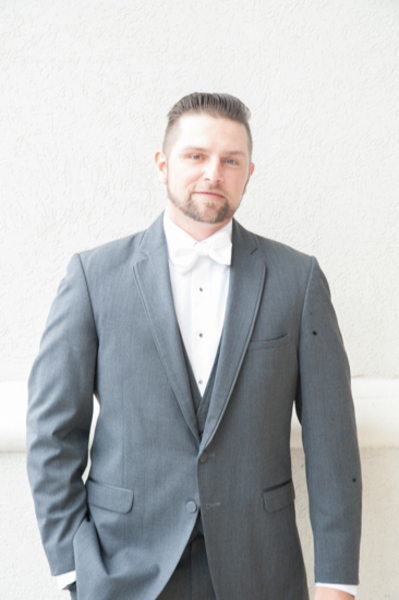 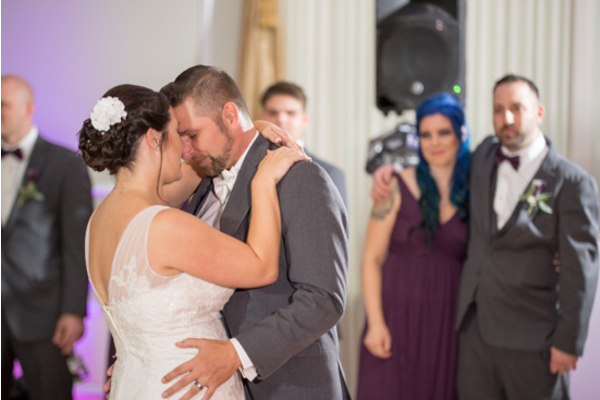 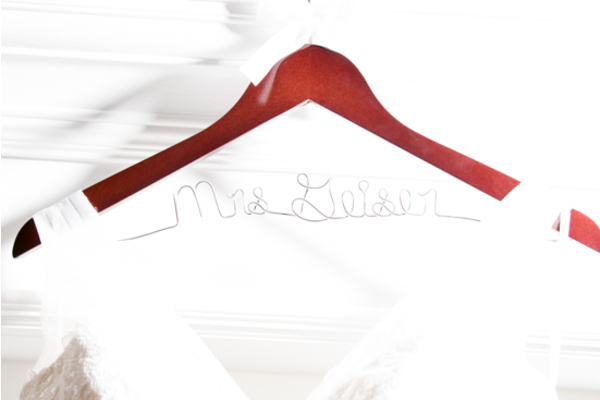 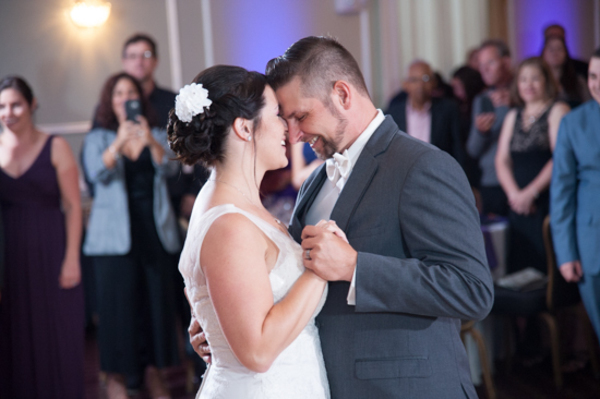 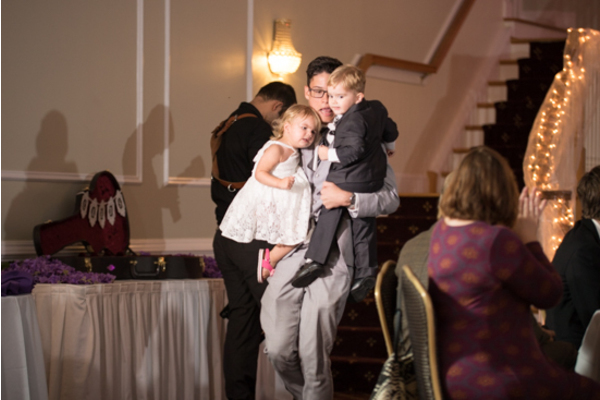 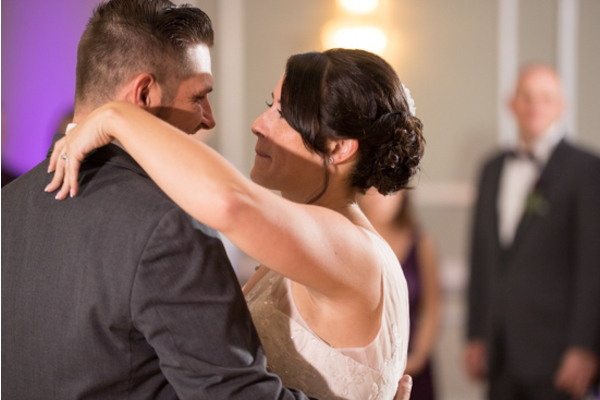 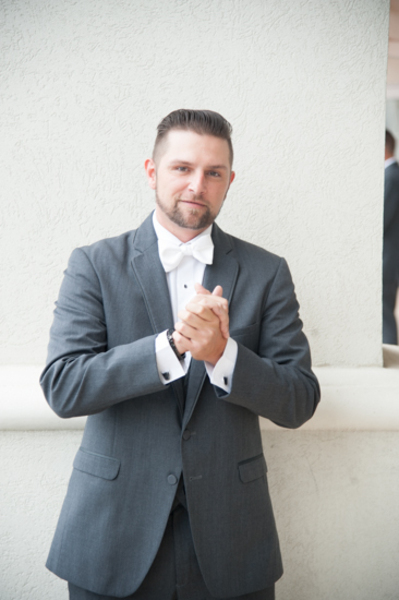 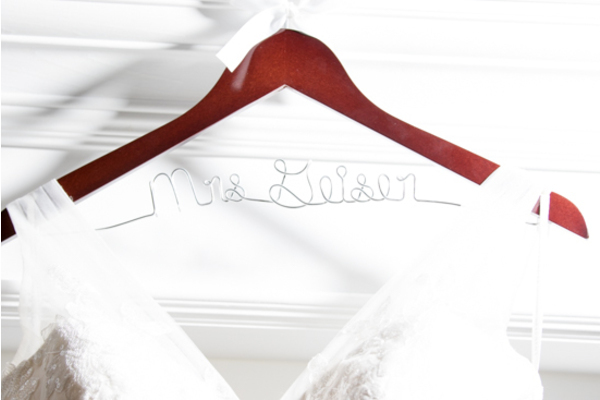 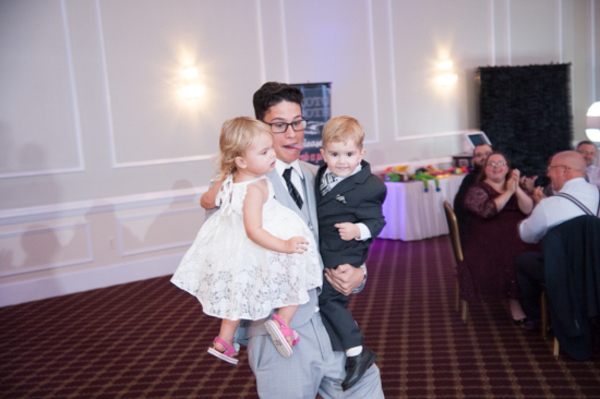 All in all, our NJ Wedding DJ made this night even more special by playing the best party jams to slow dance classics! 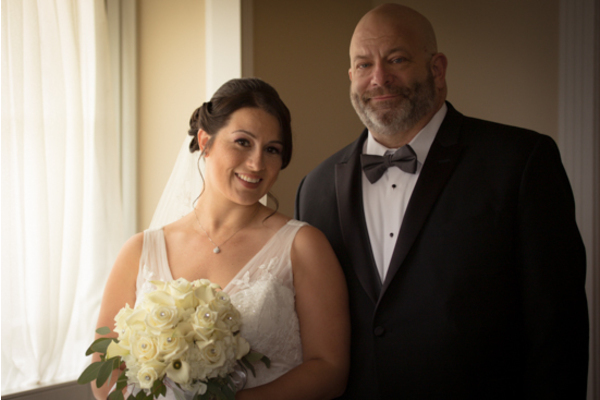 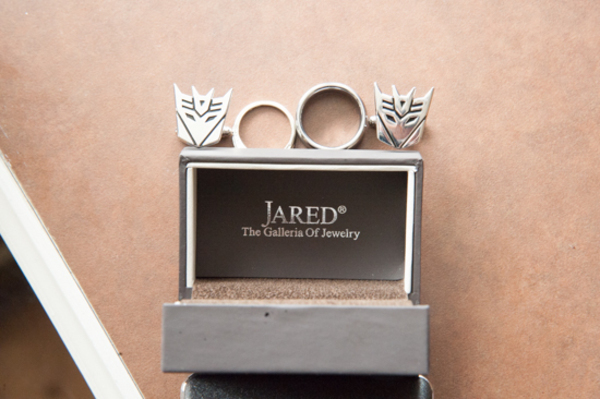 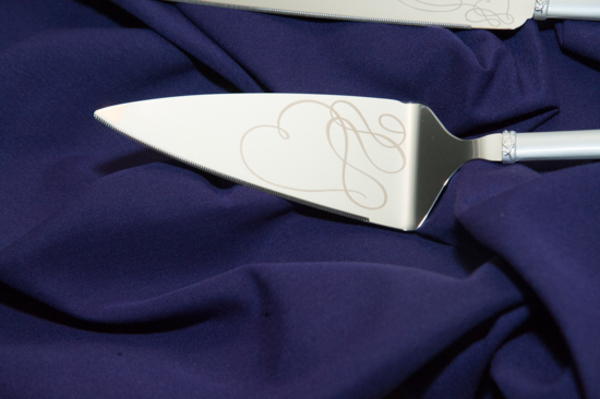 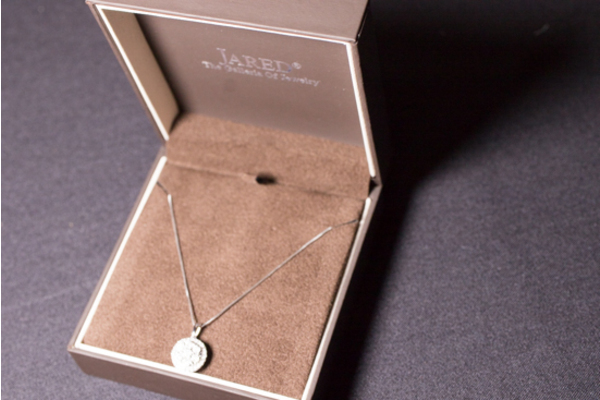 Congratulations, again, to Megan and David. 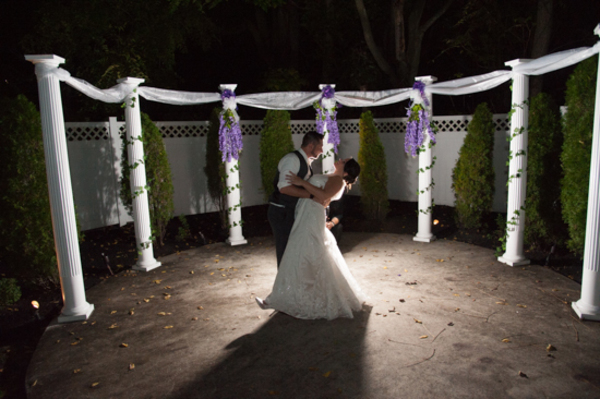 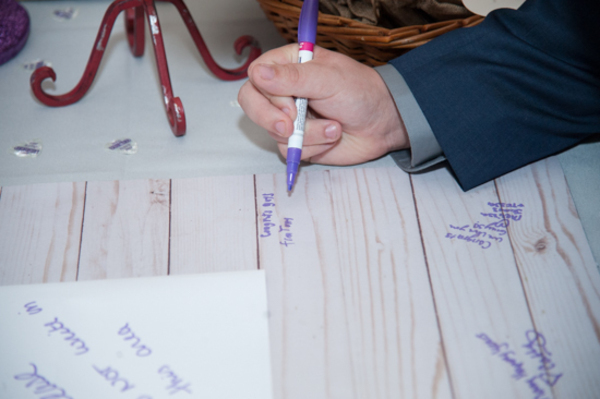 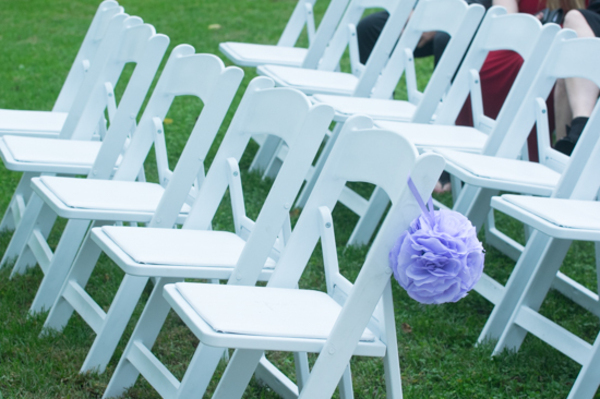 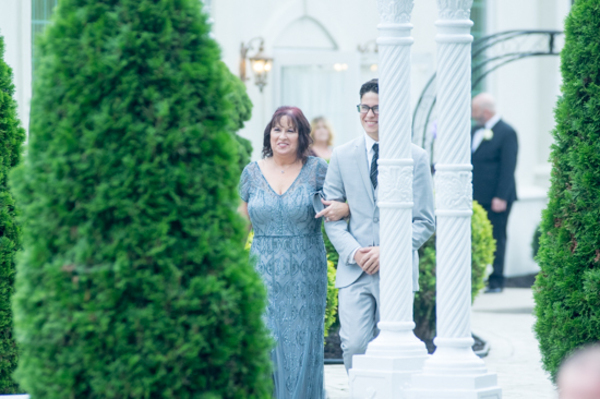 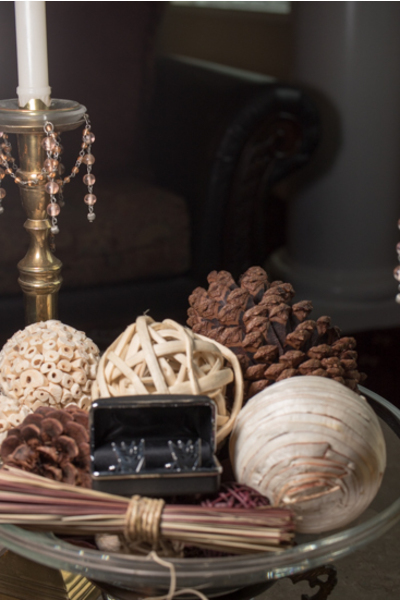 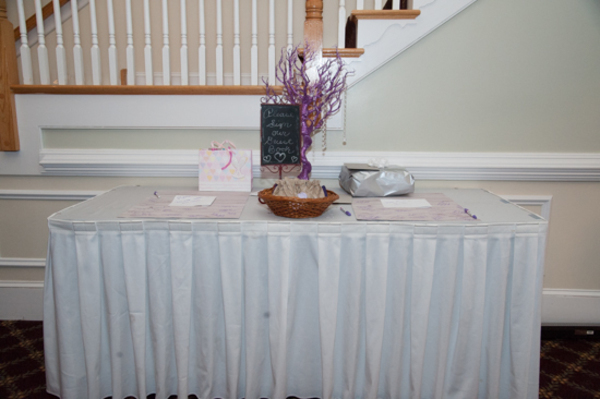 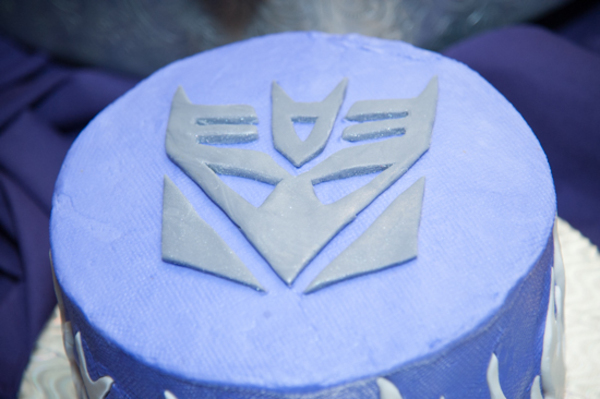 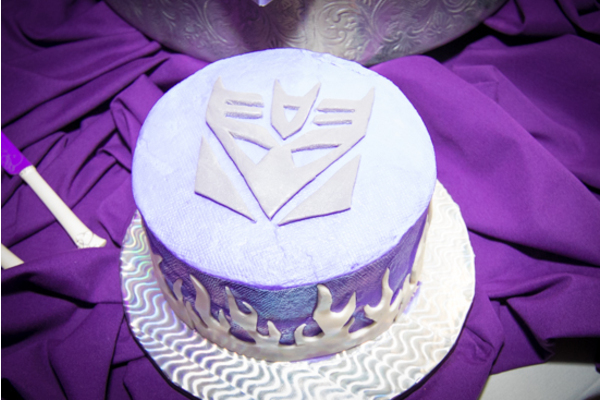 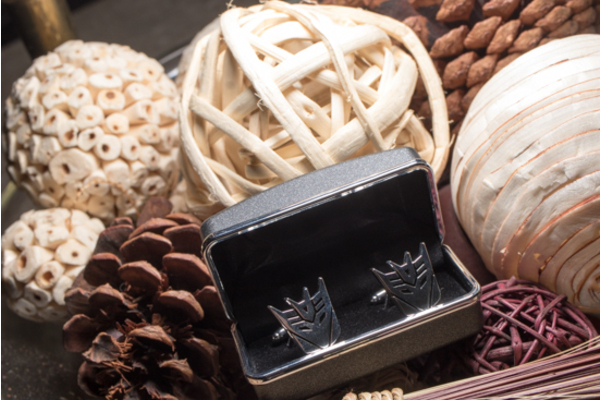 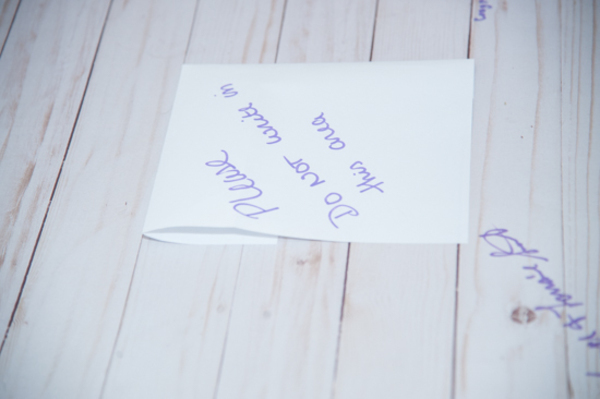 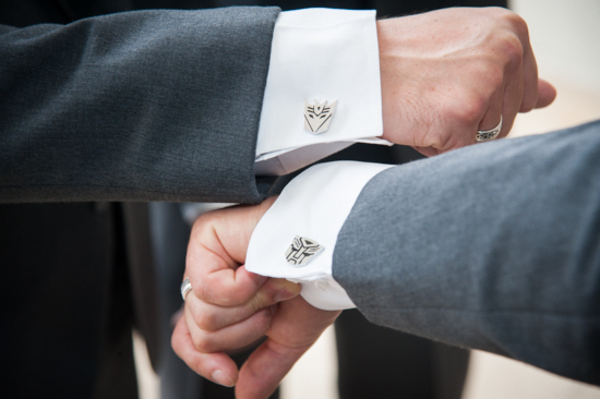 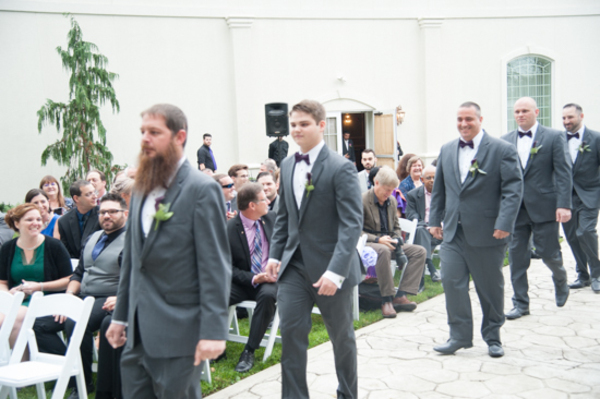 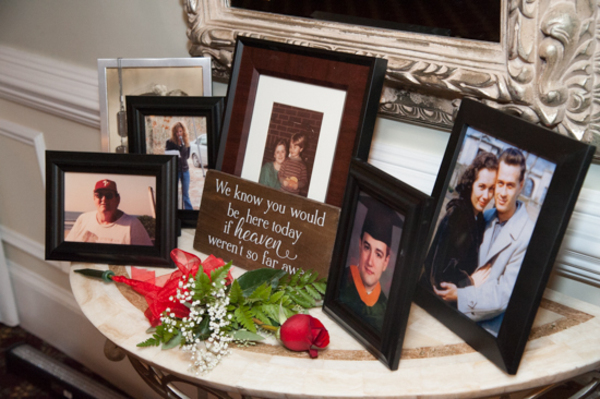 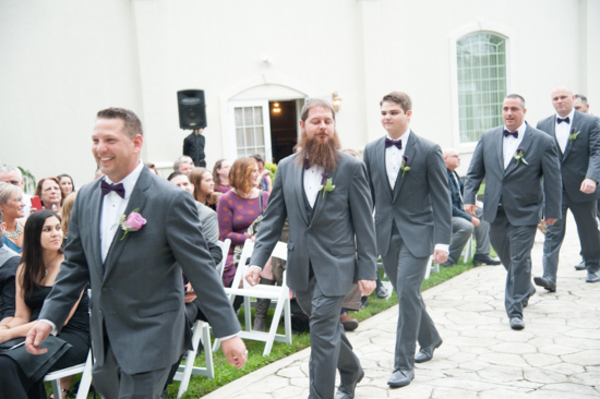 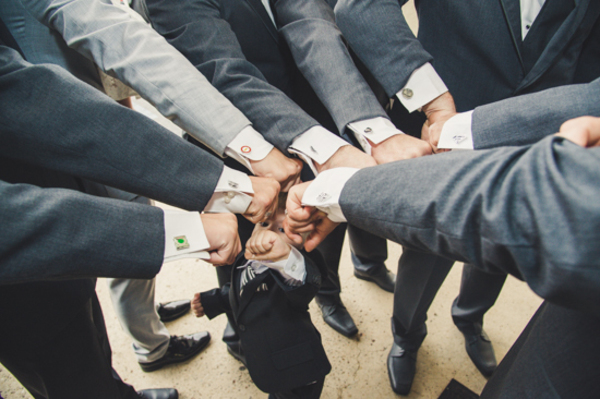 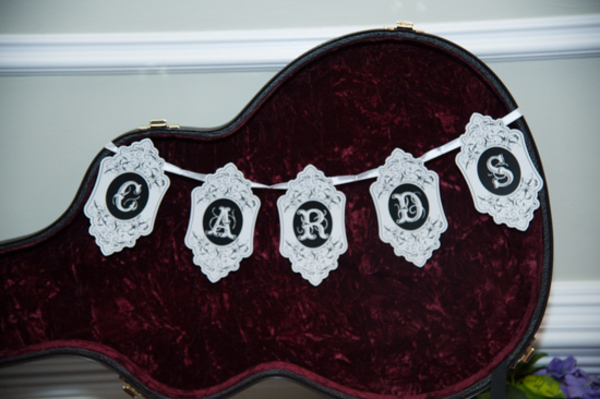 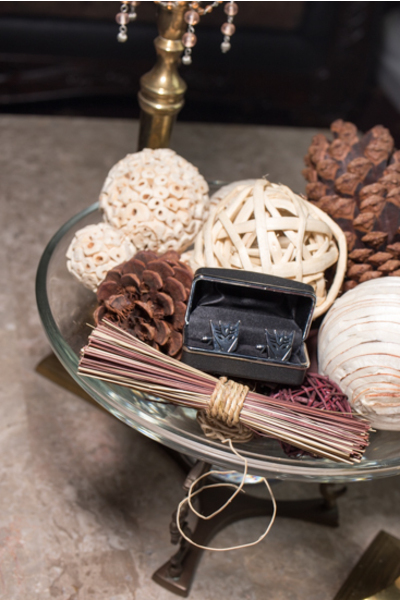 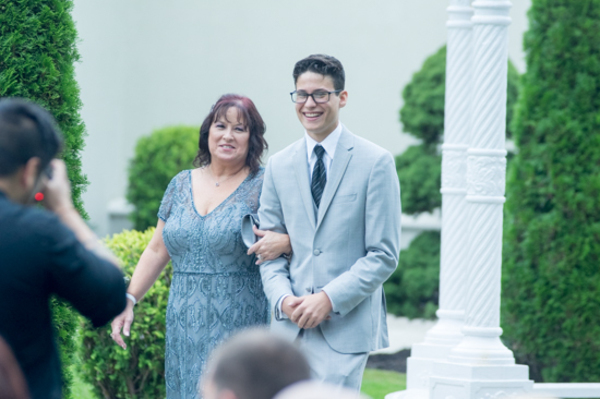 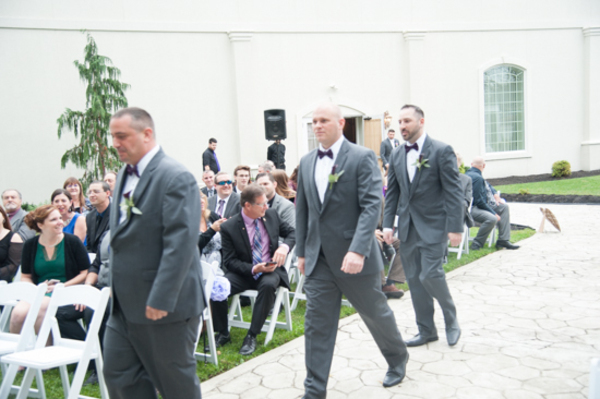 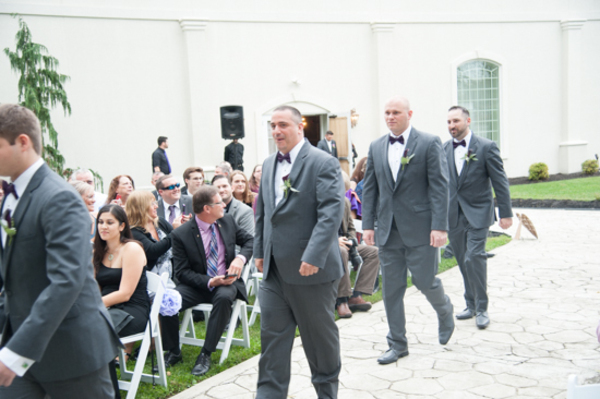 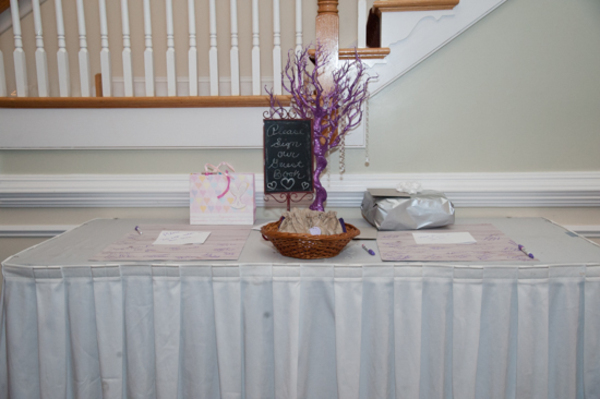 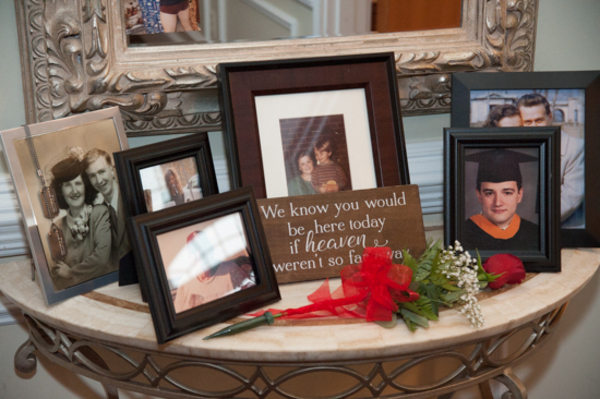 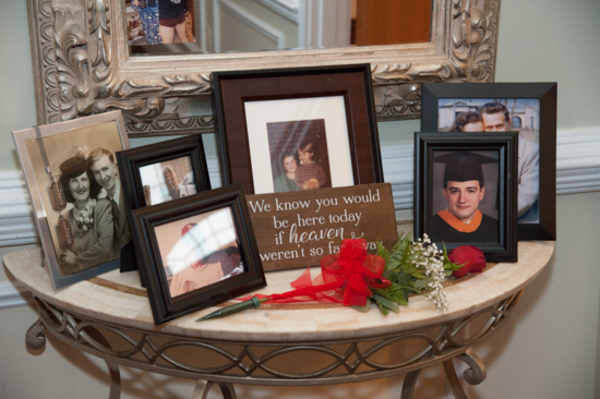 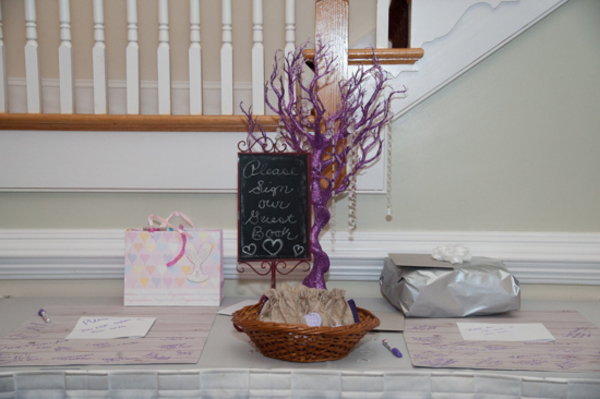 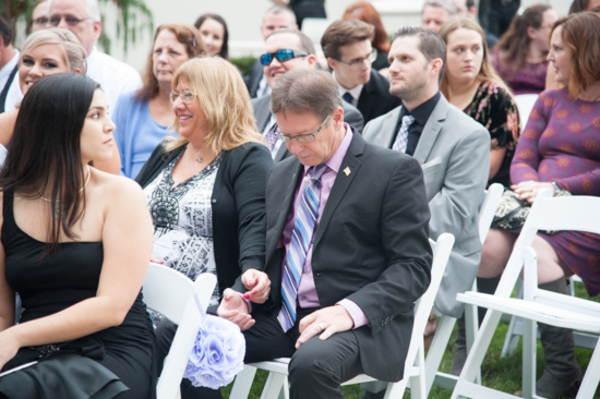 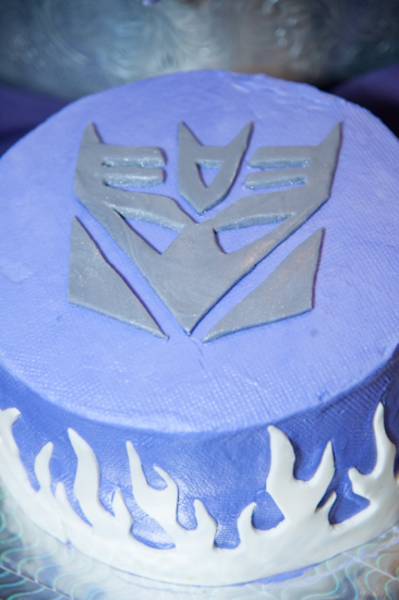 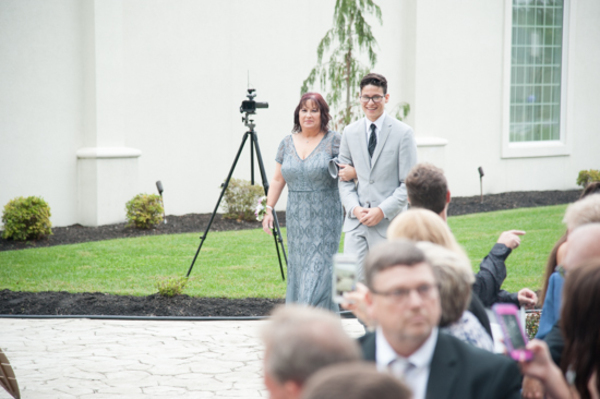 We absolutely loved celebrating at the Palace at Blackwood with you and your guests!